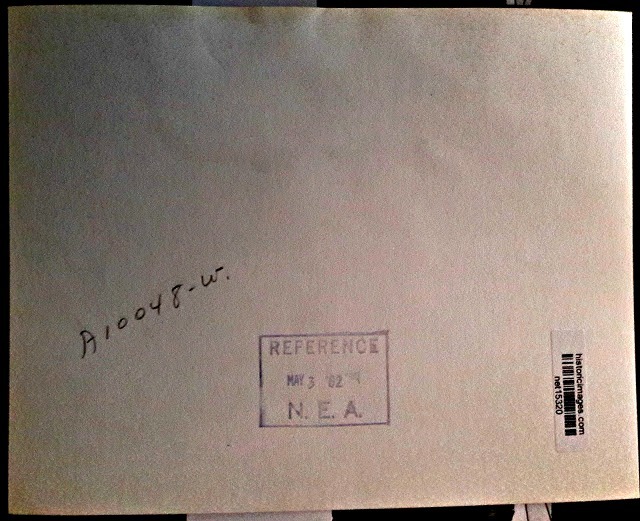 ends its accounting in the year 2013. 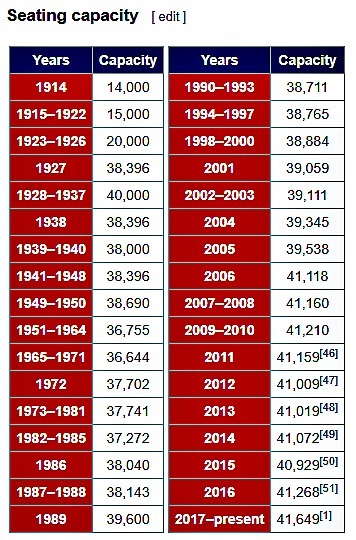 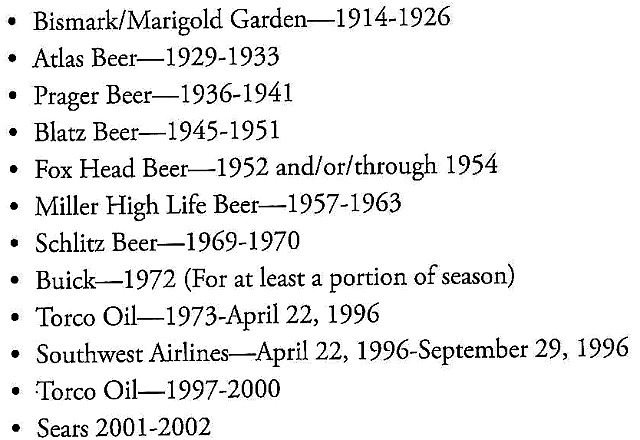 I will only post selective years that I regard as notable. 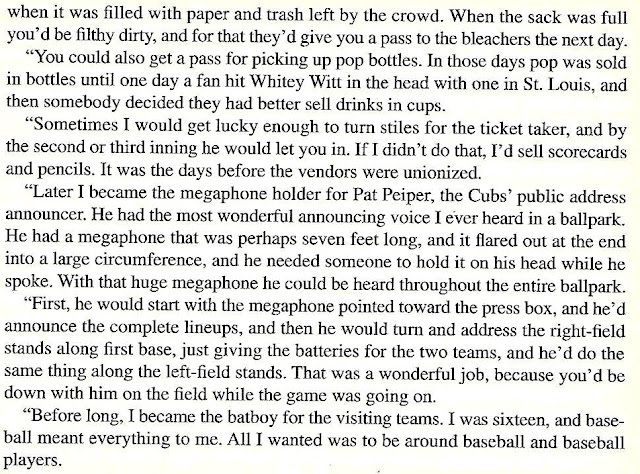 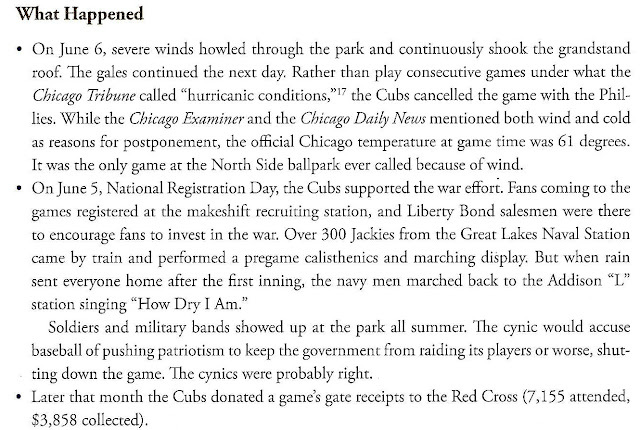 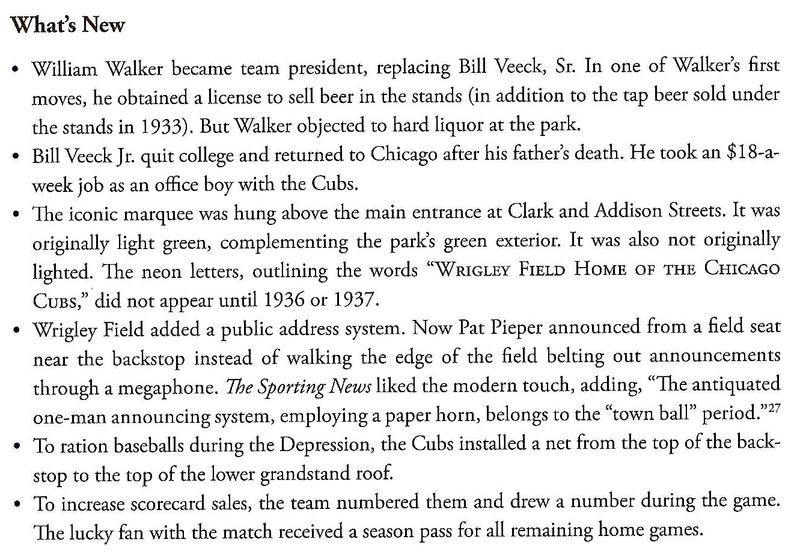 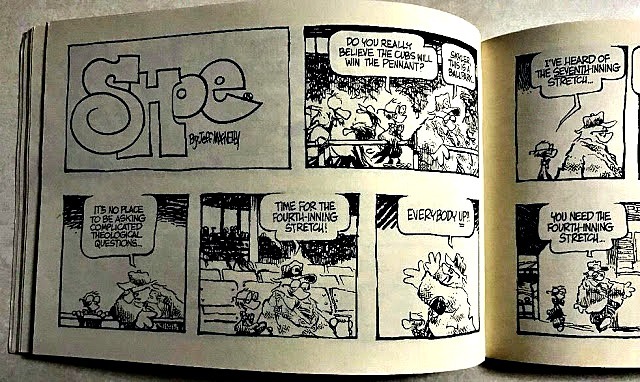 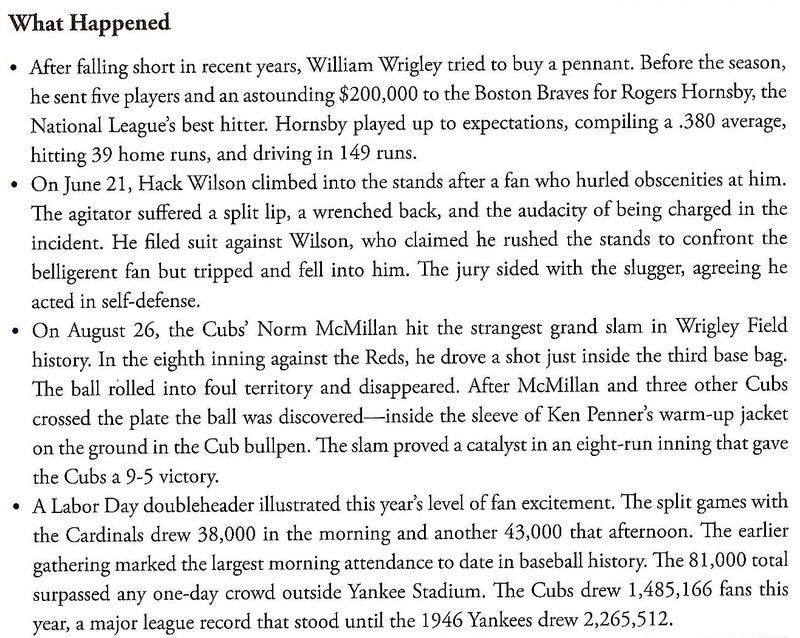 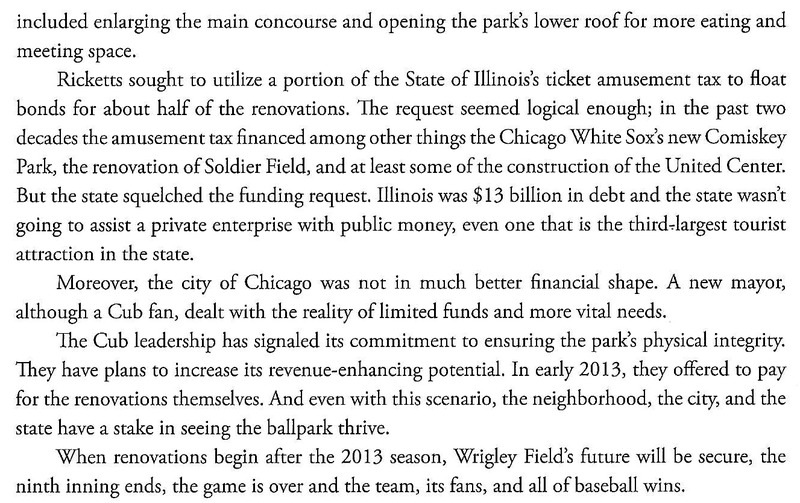 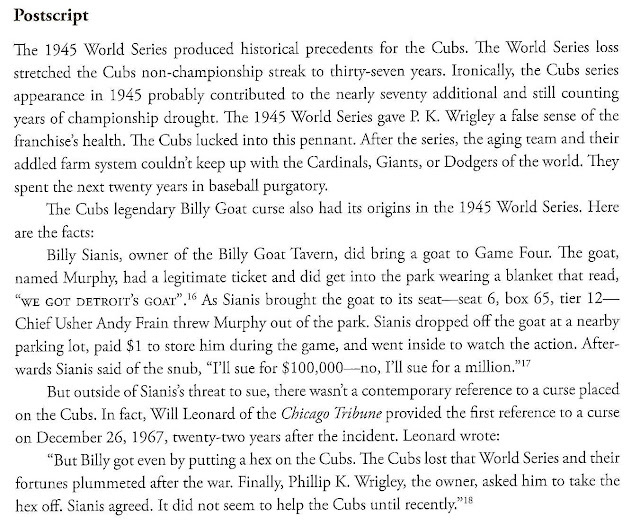 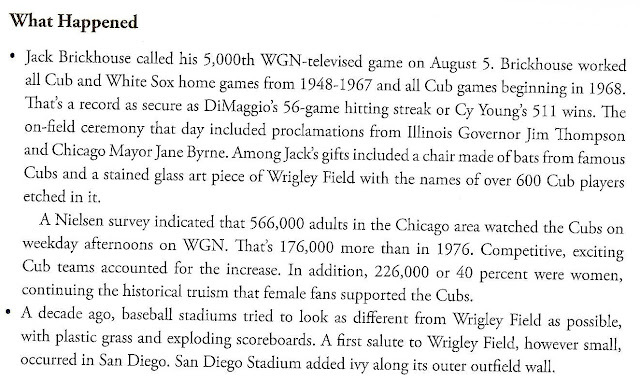 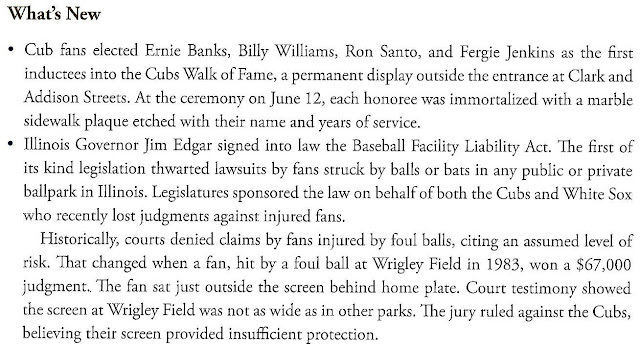 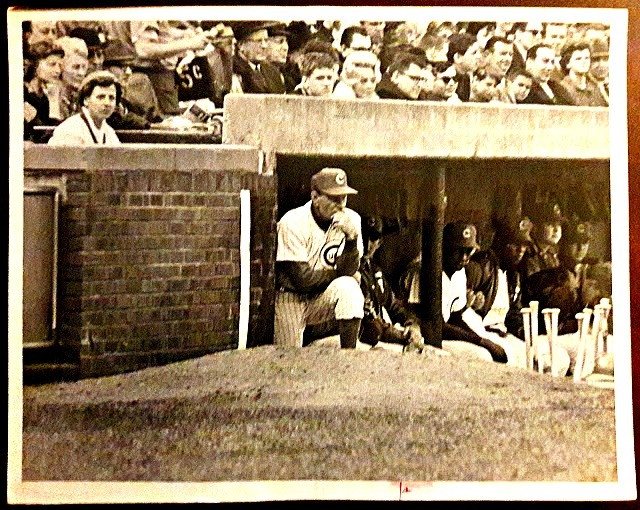 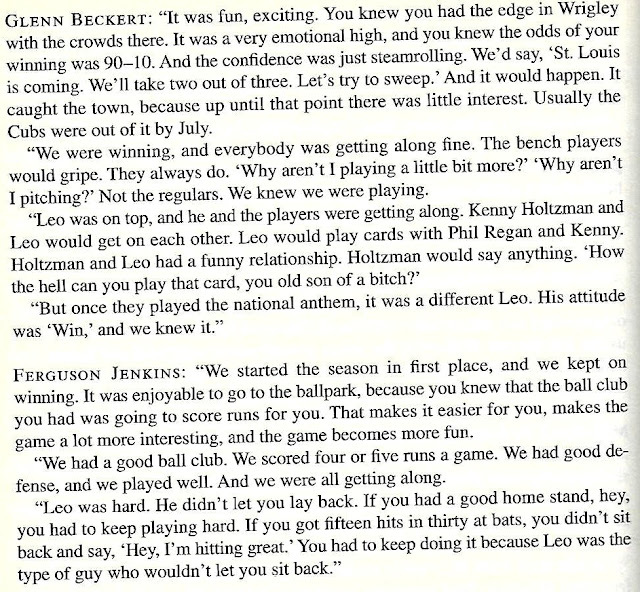 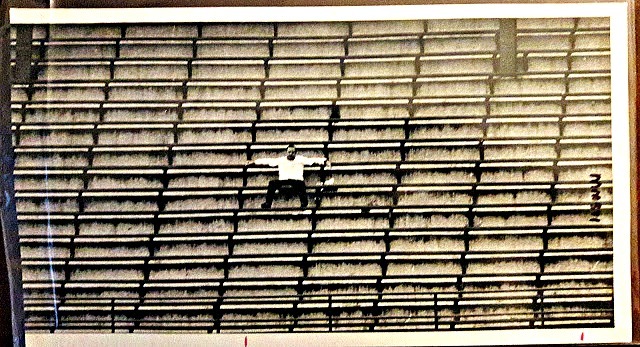 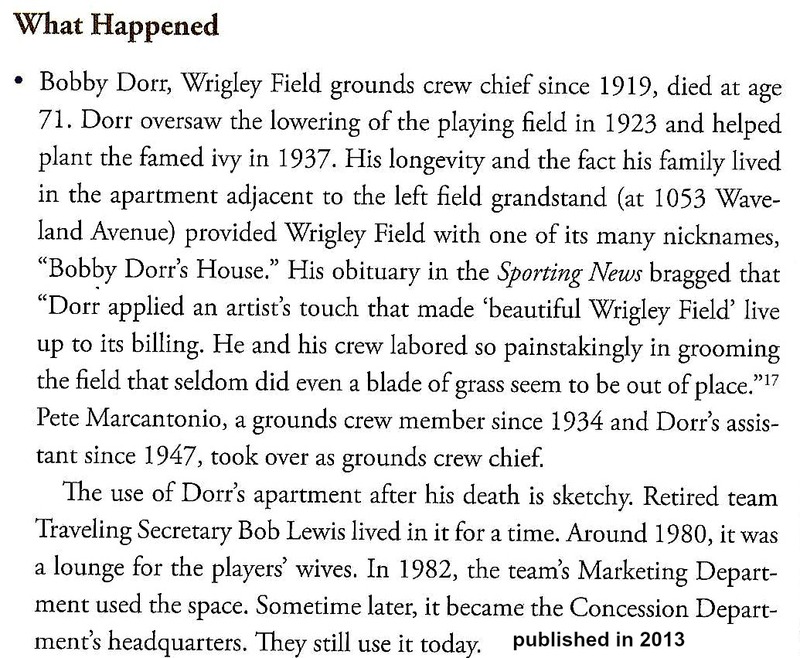 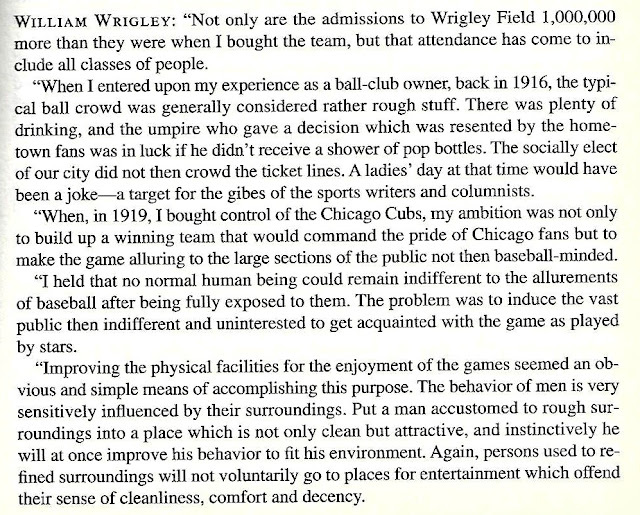 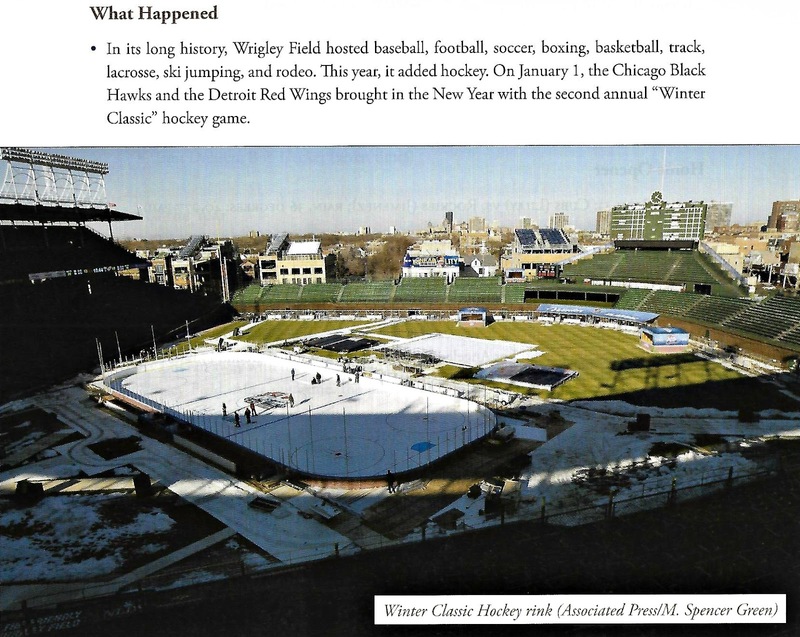 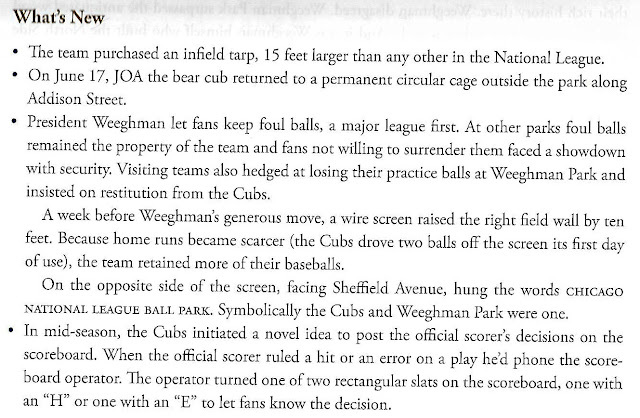 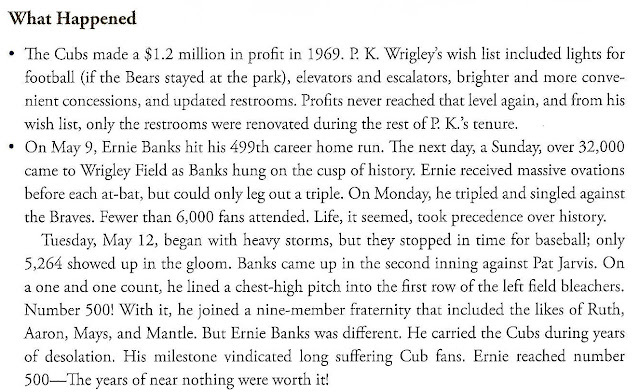 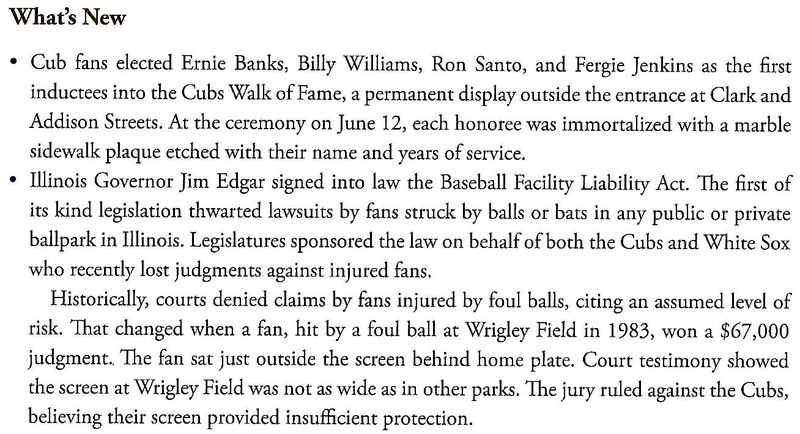 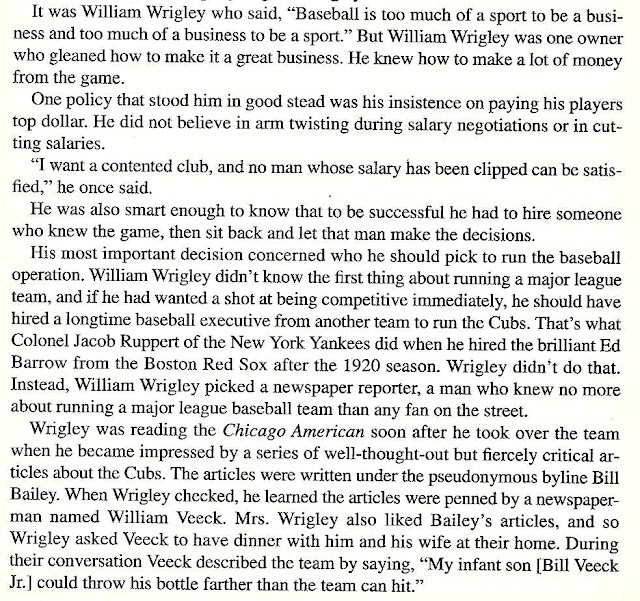 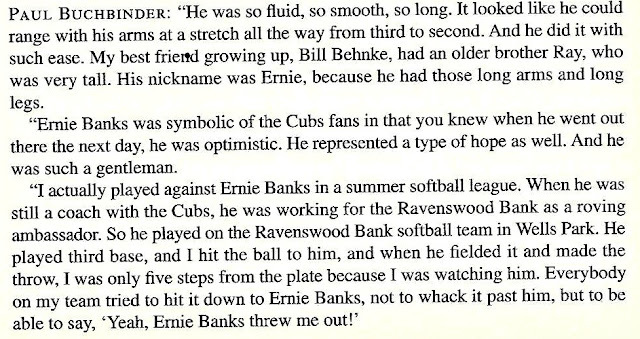 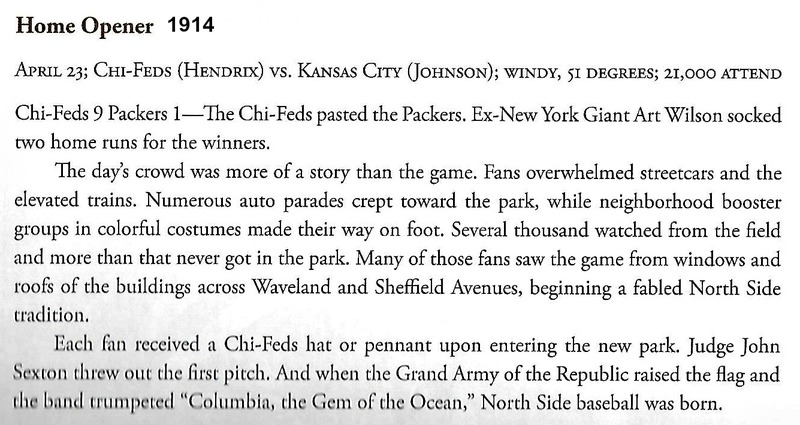 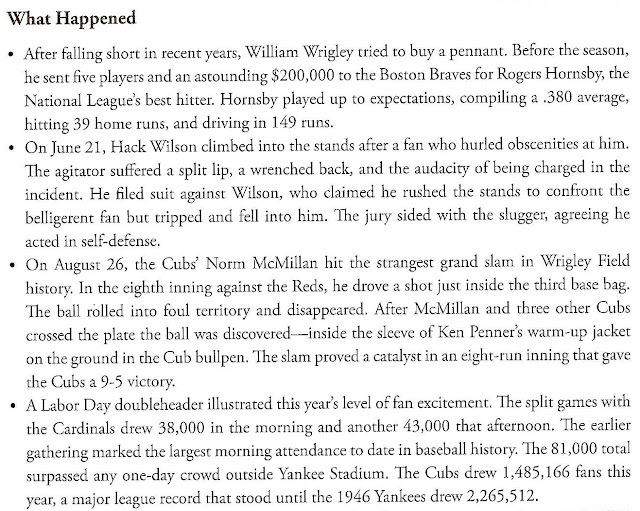 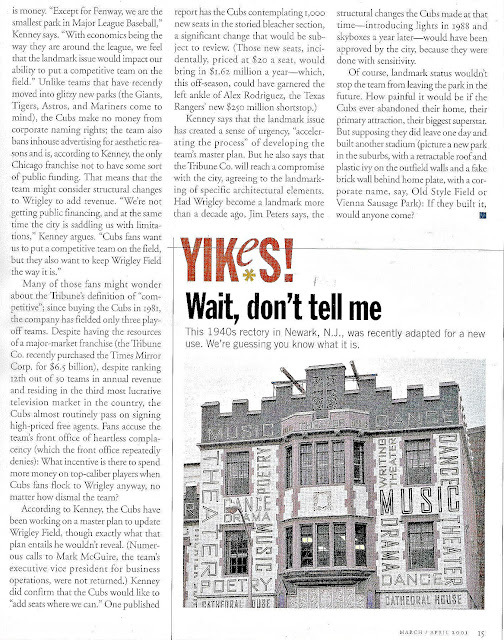 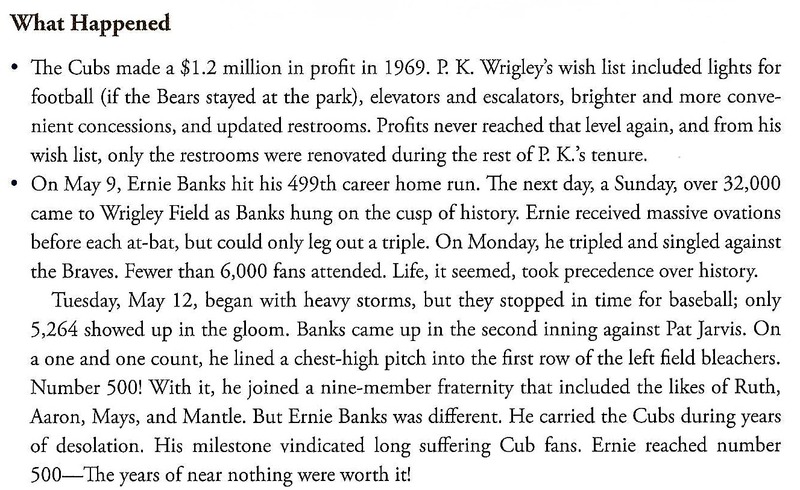 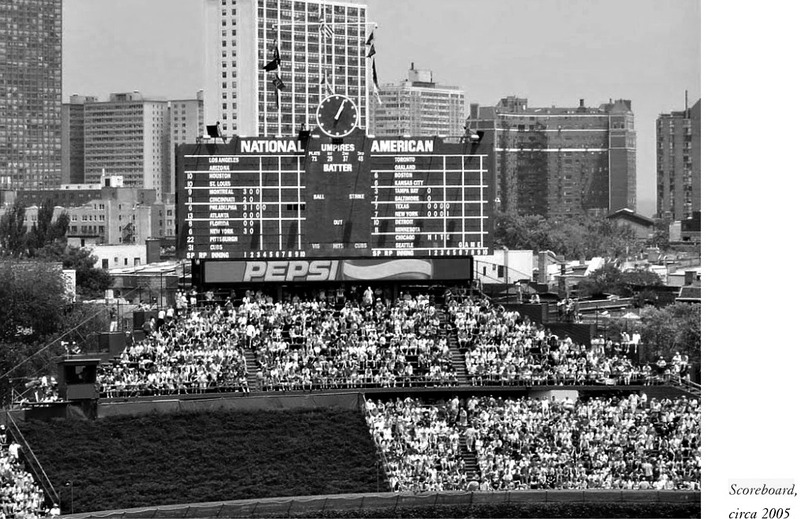 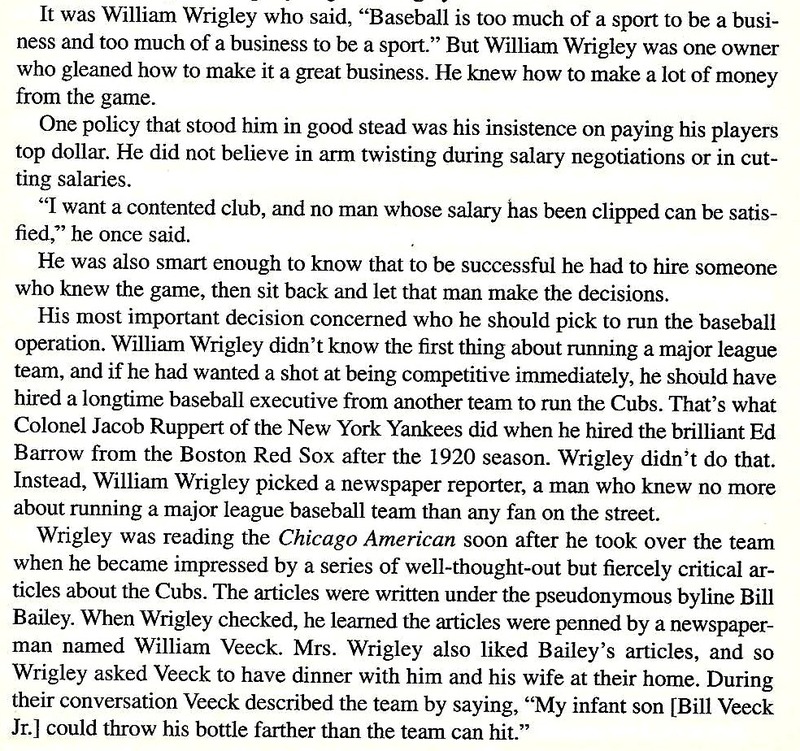 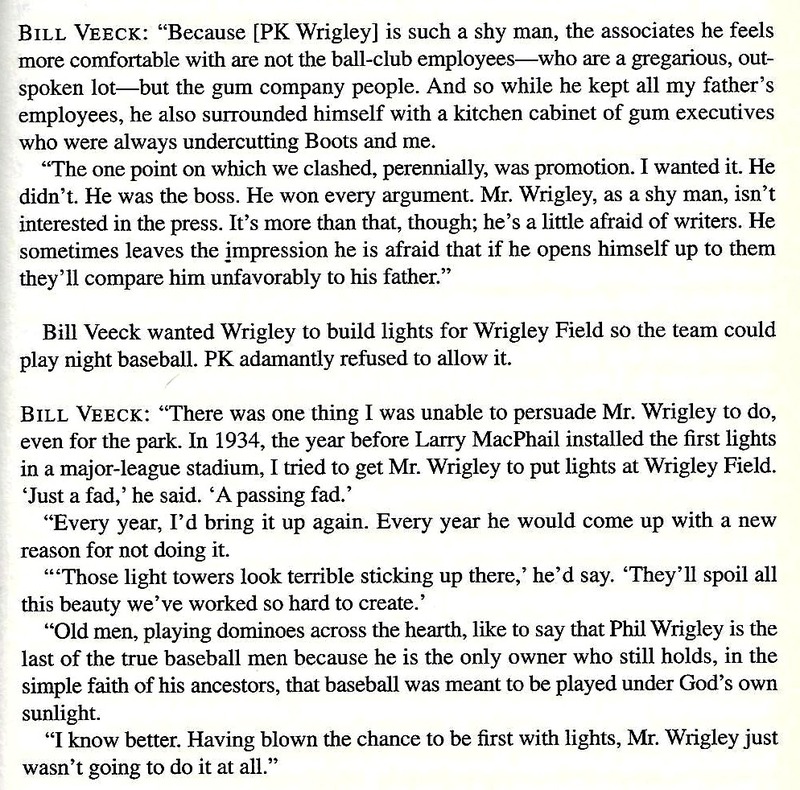 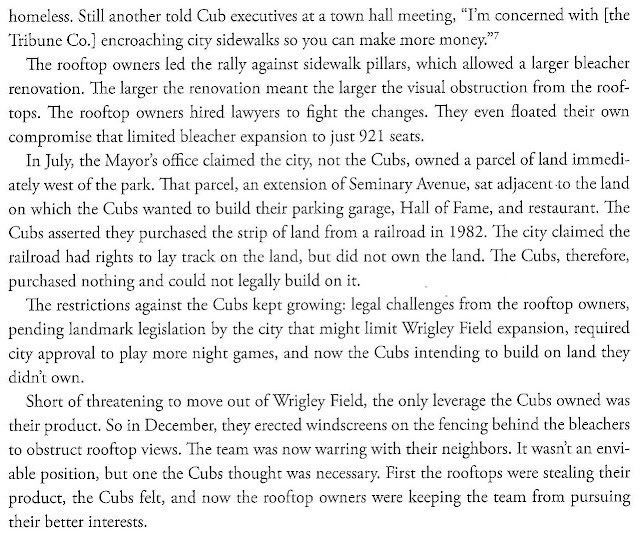 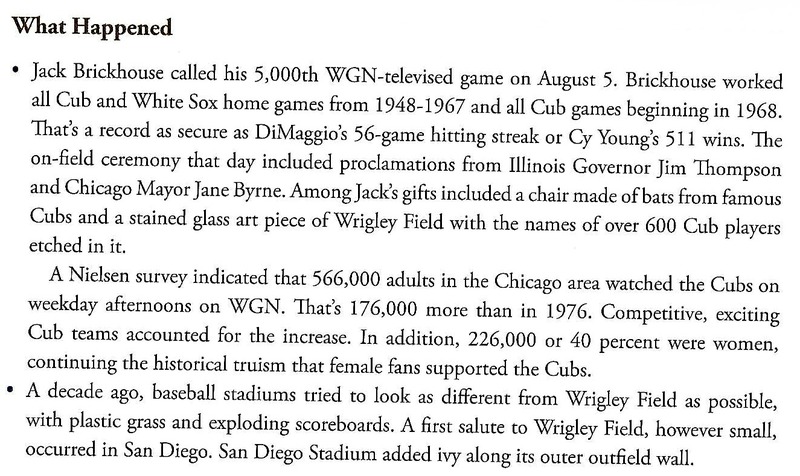 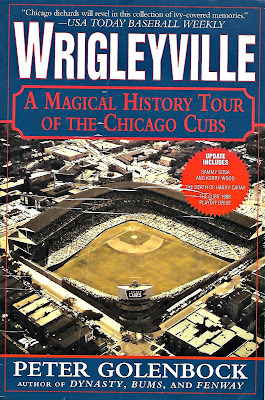 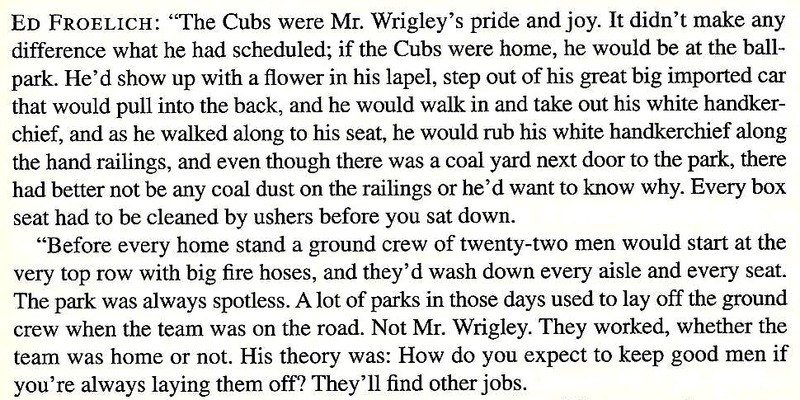 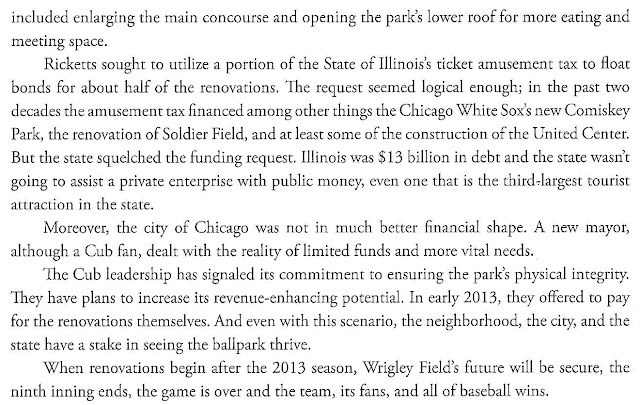 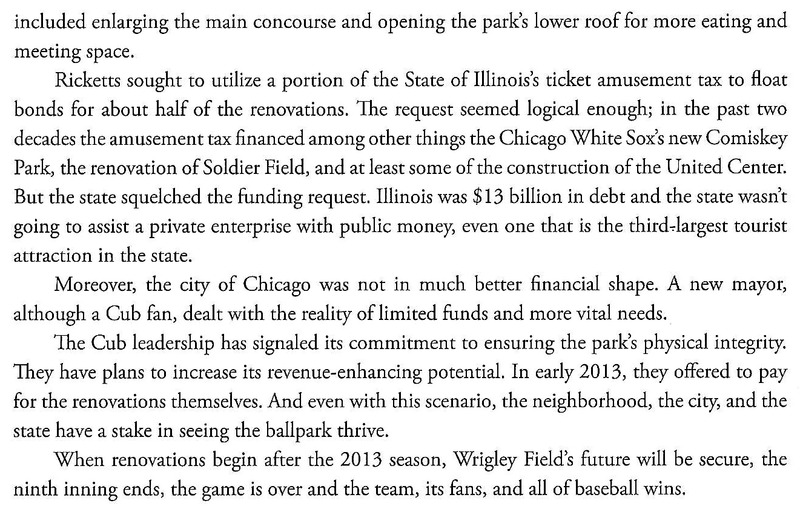 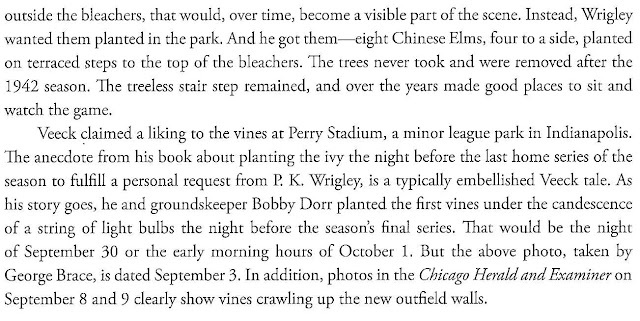 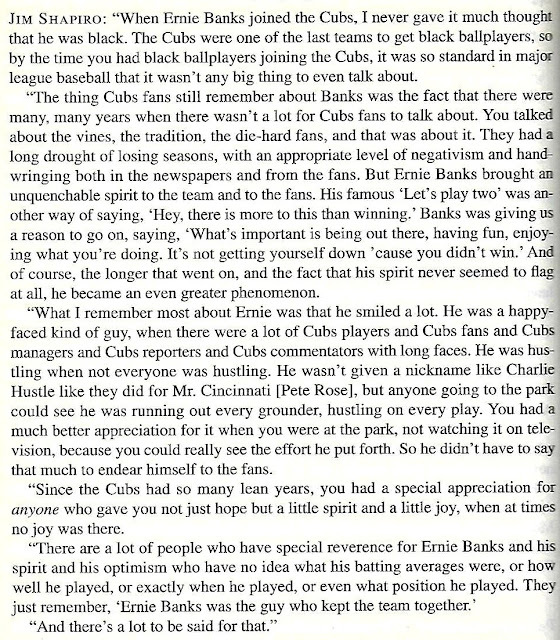 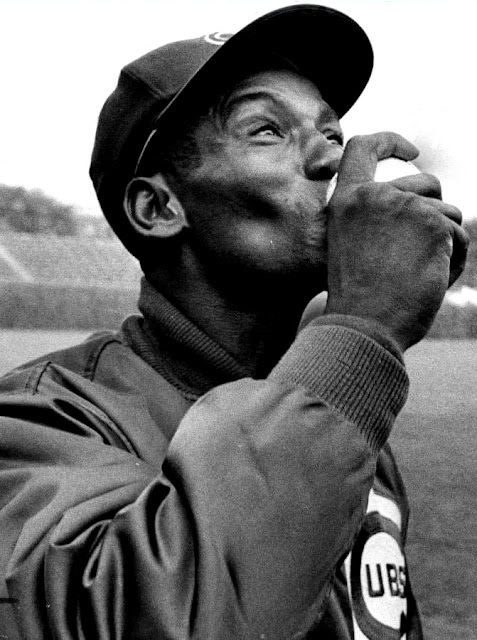 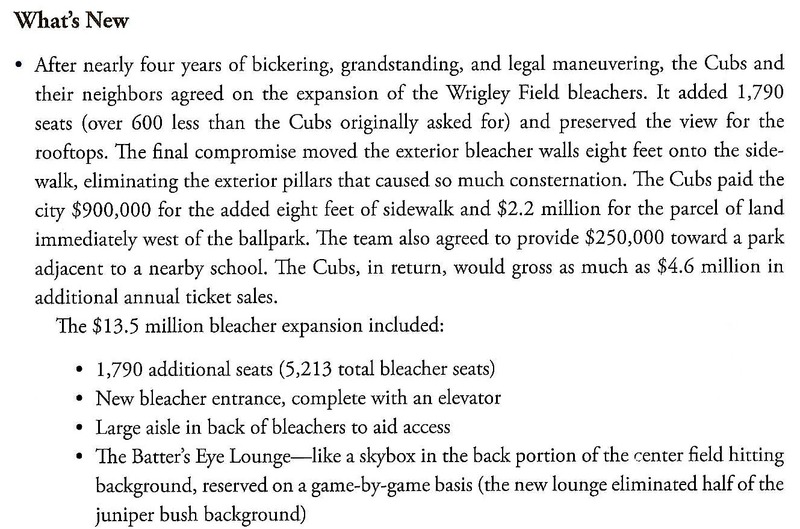 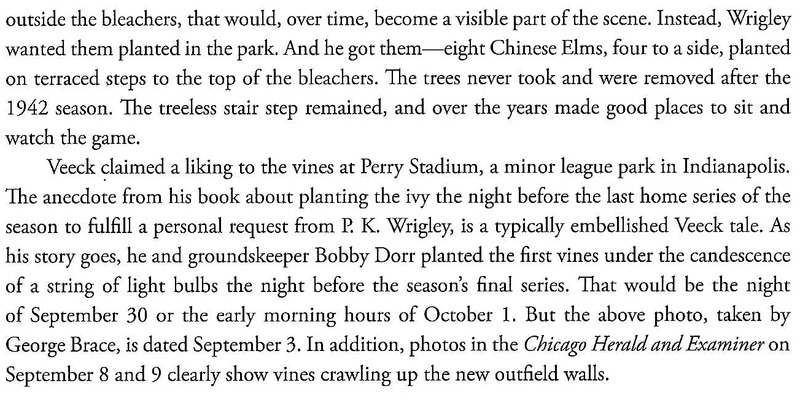 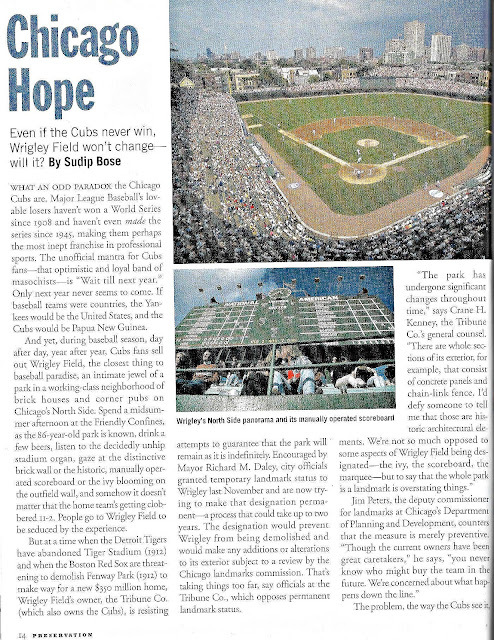 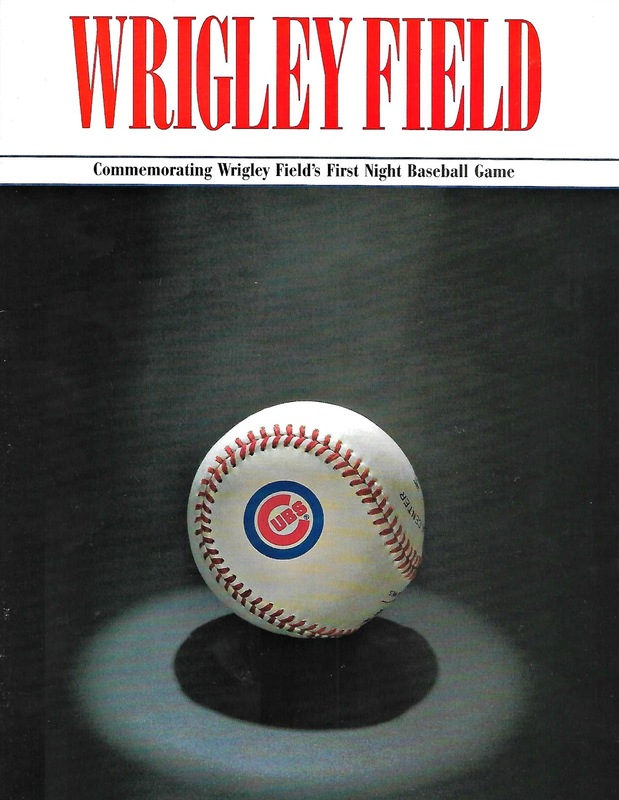 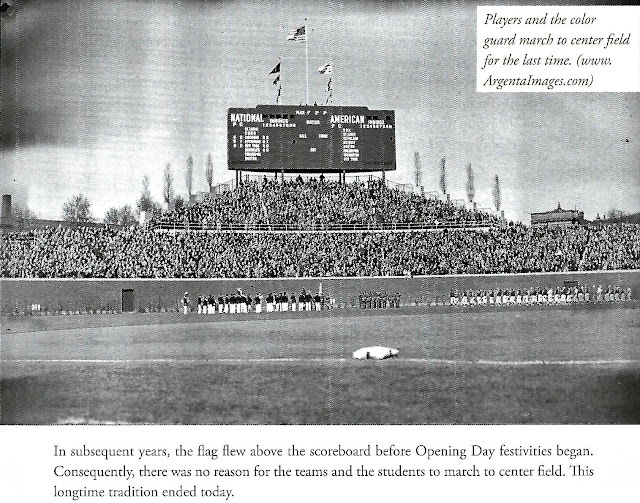 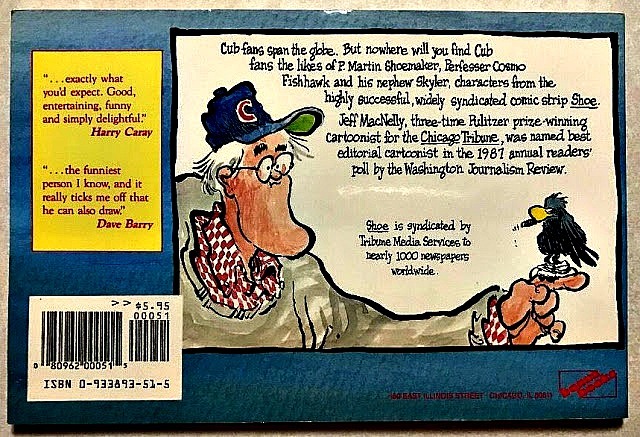 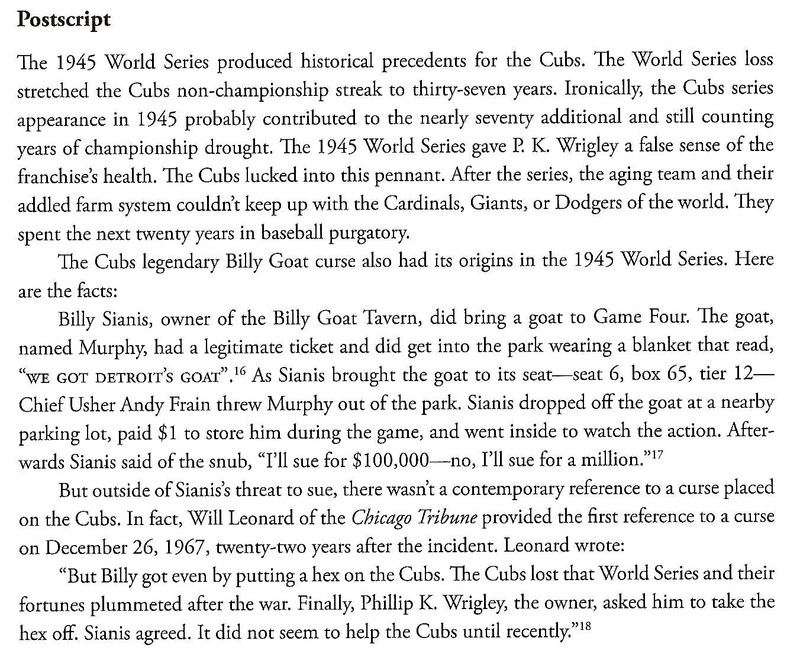 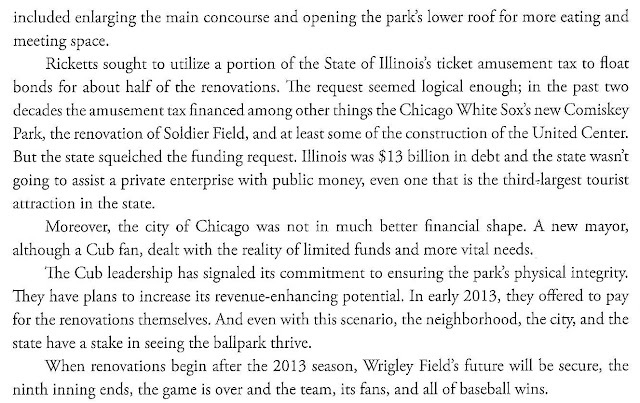 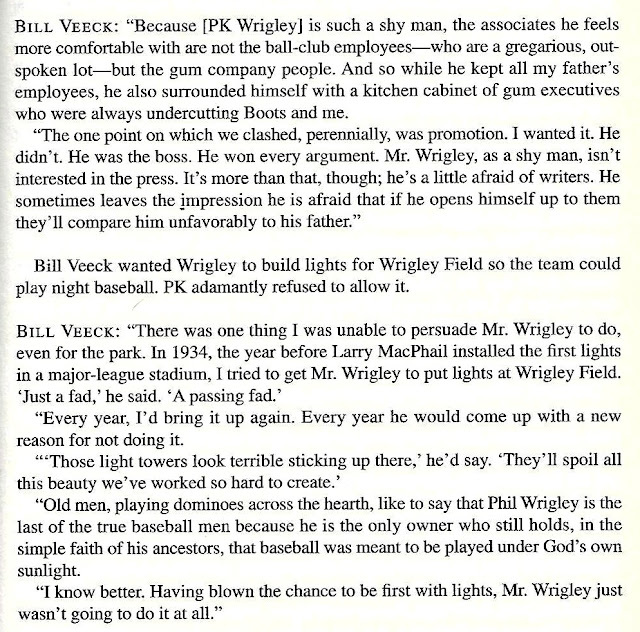 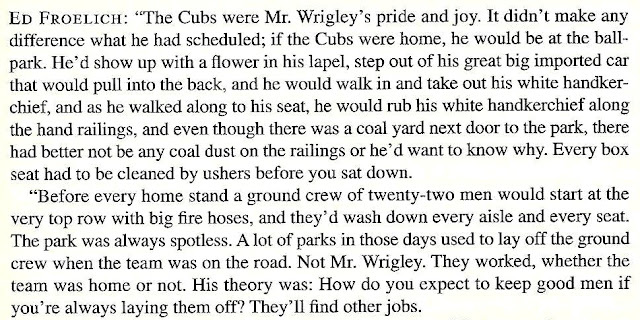 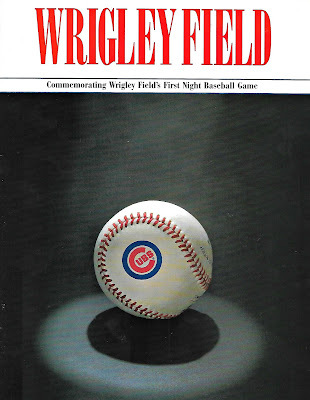 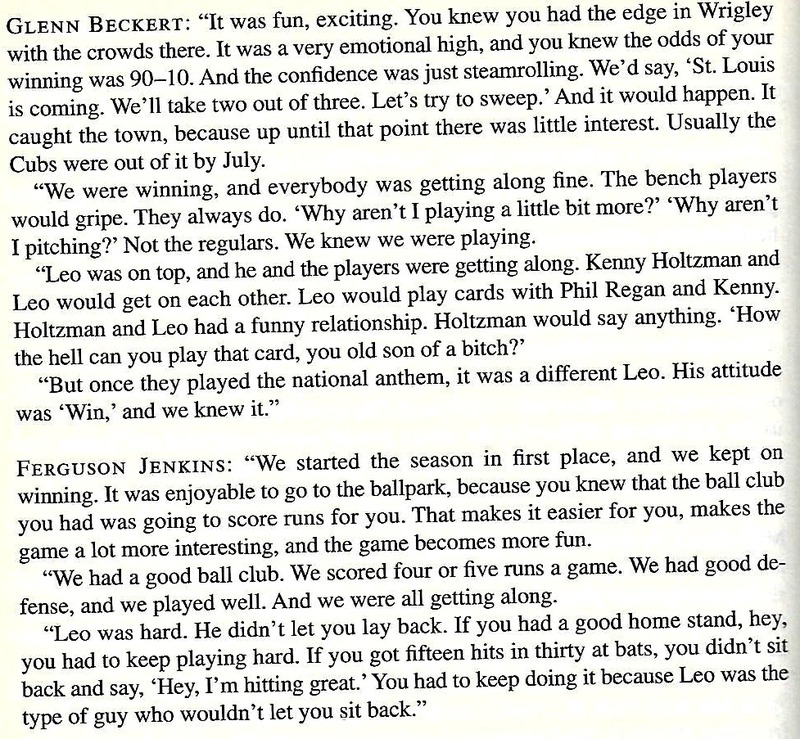 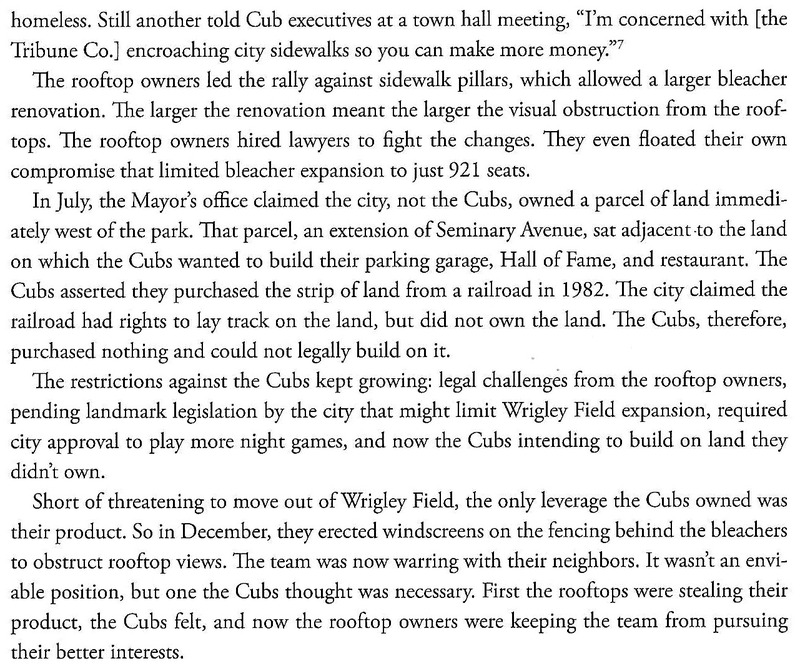 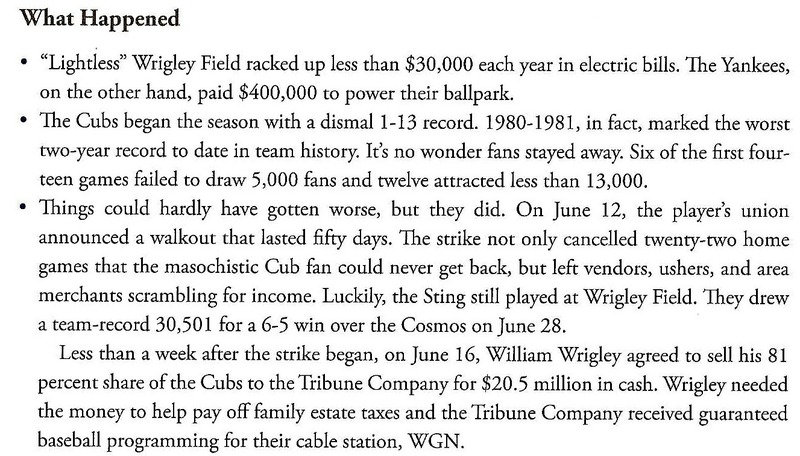 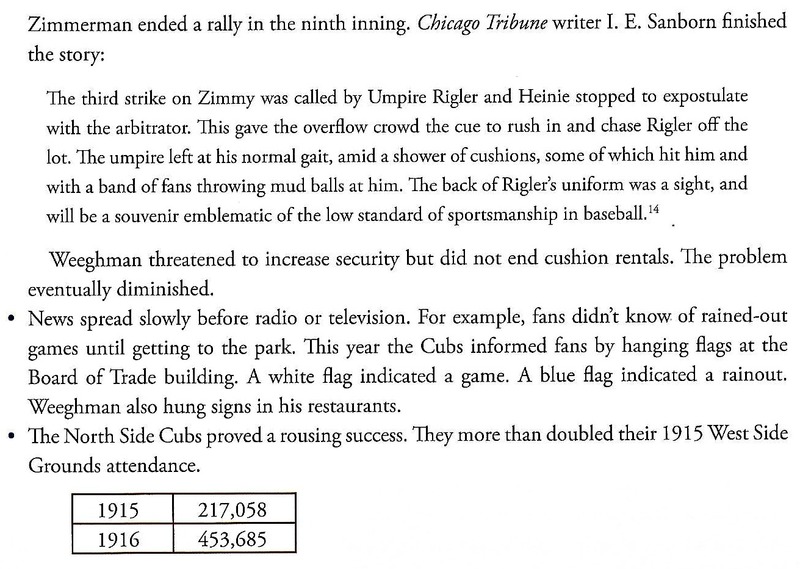 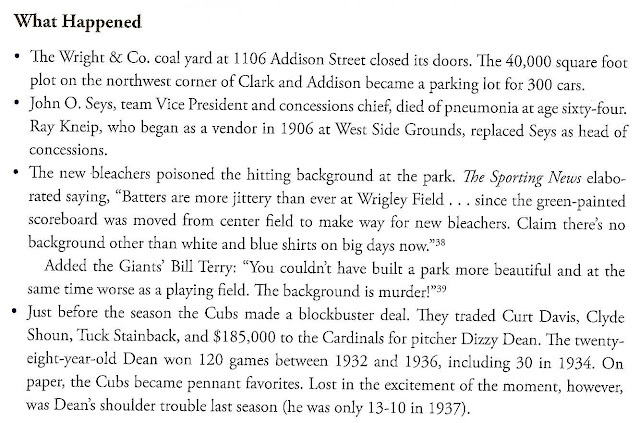 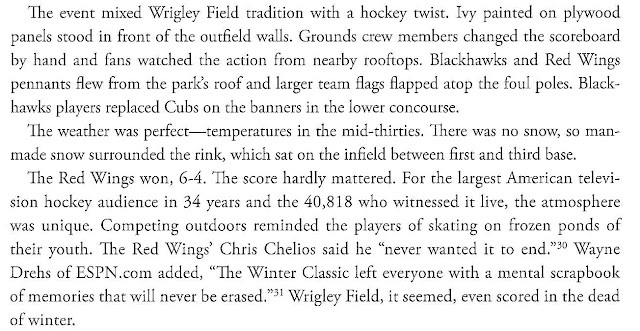 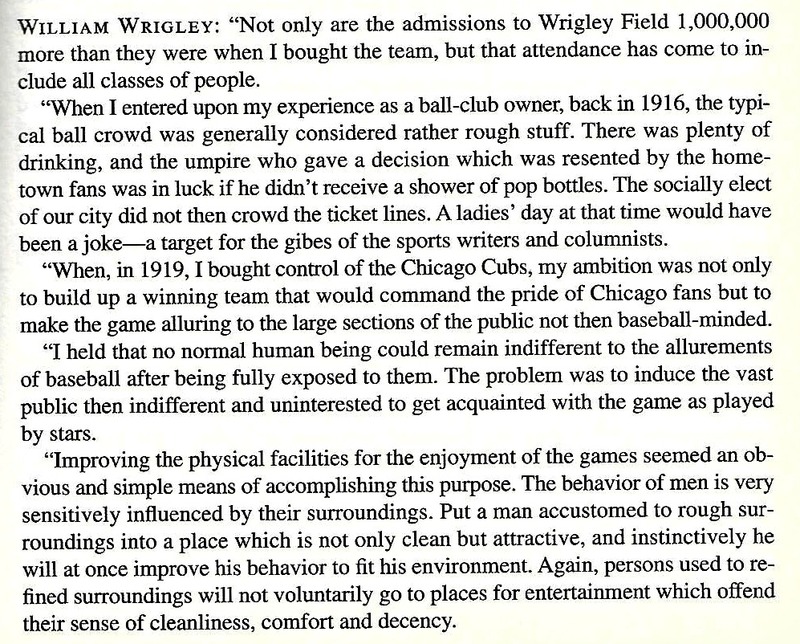 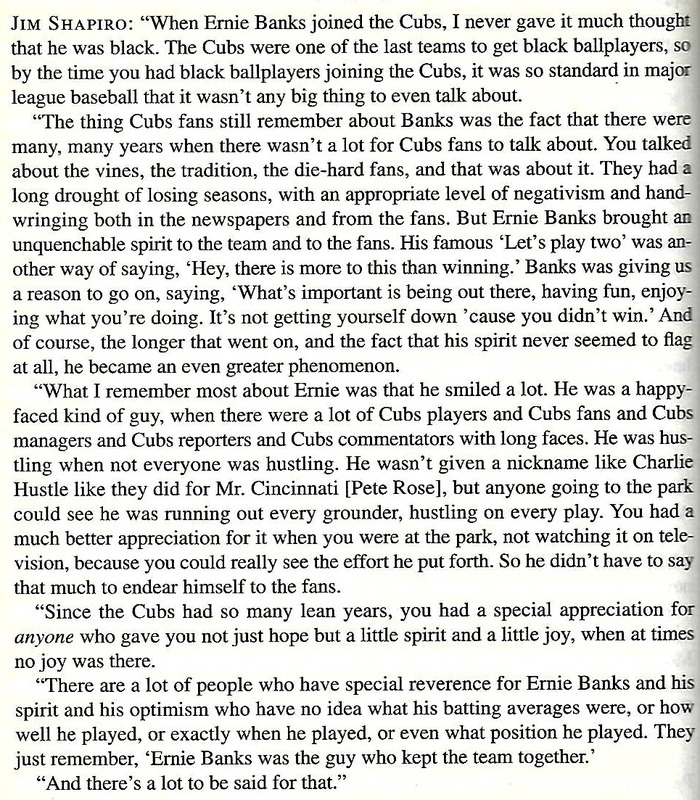 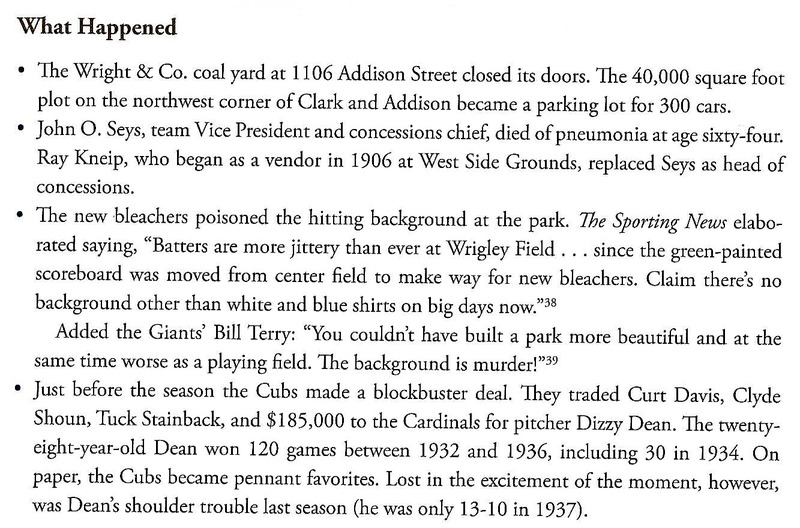 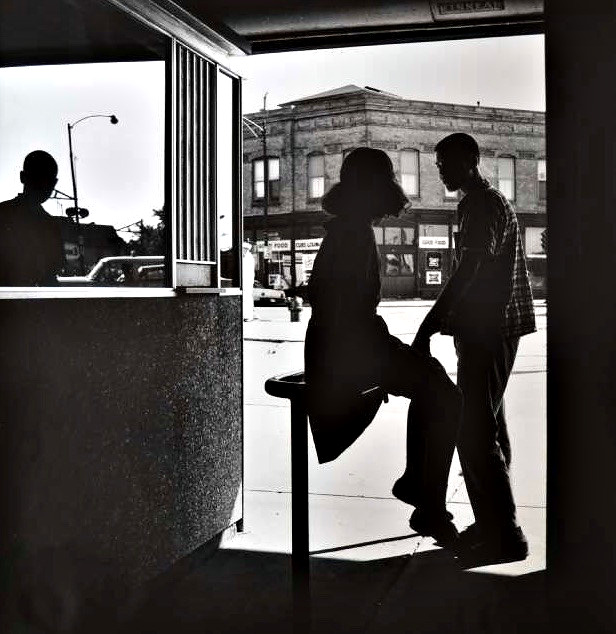 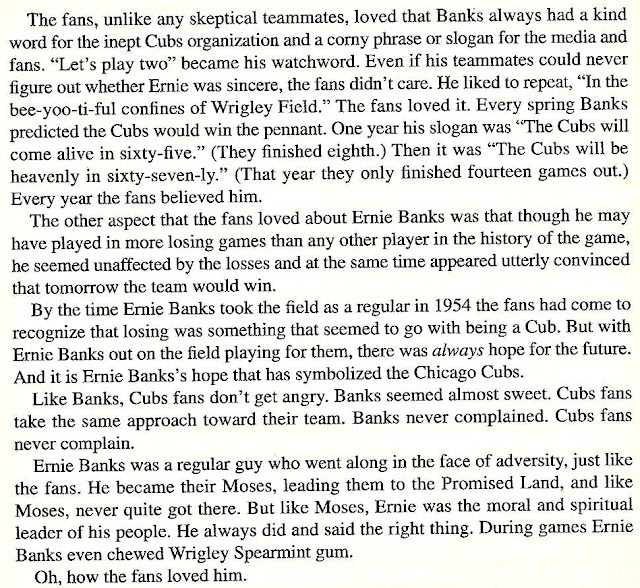 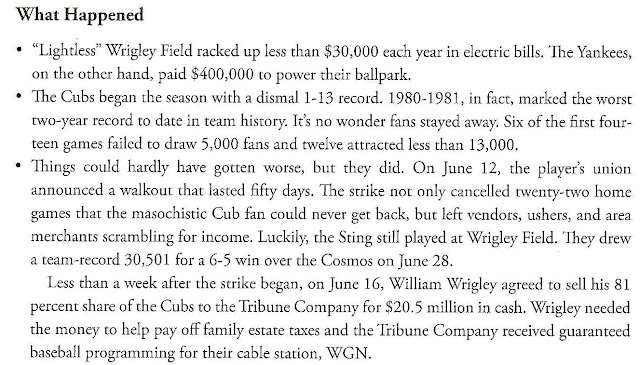 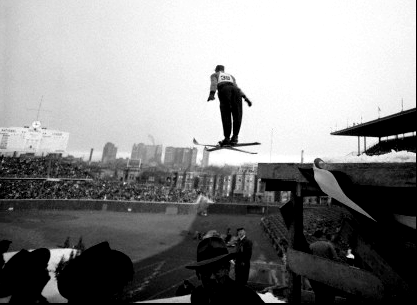 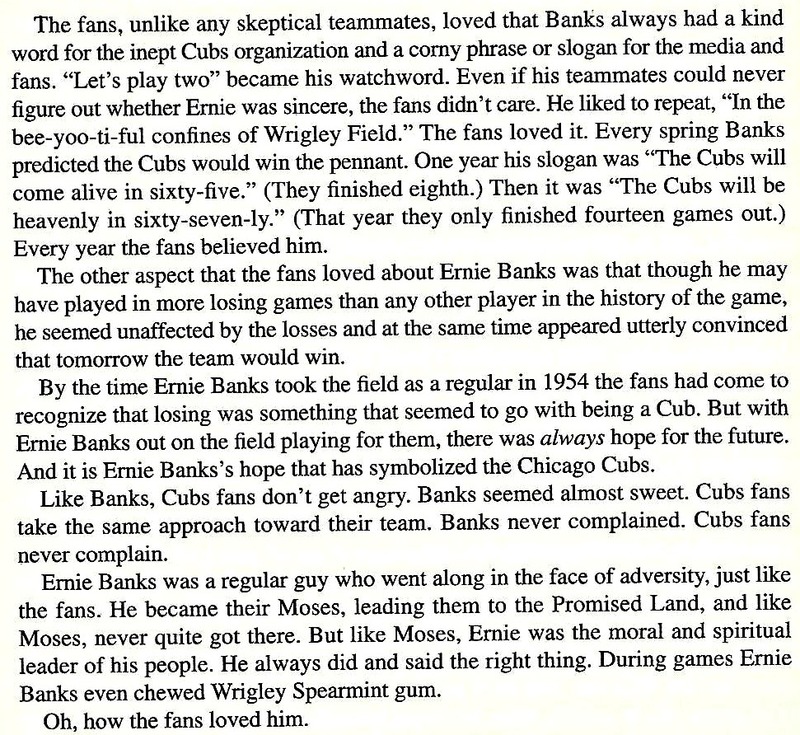 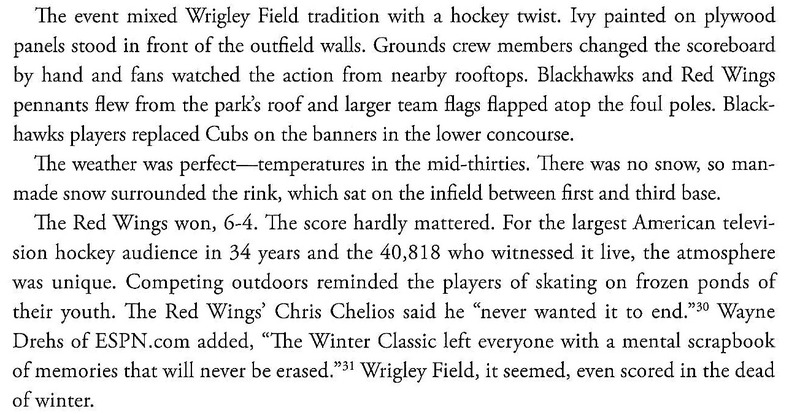 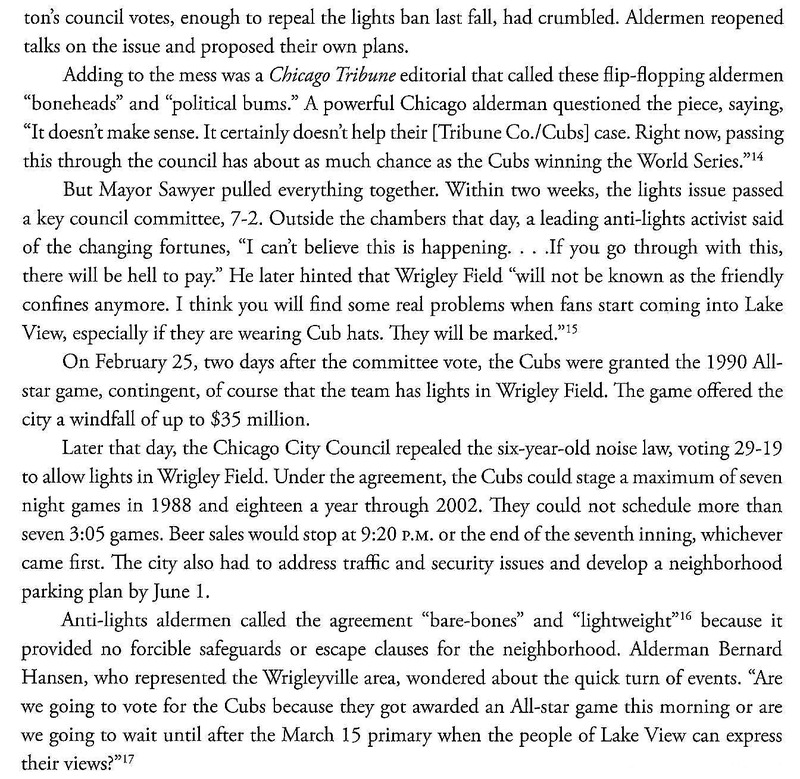 Also, I will copy pages from a book called 'Wrigleyville' by Peter Golenbock. 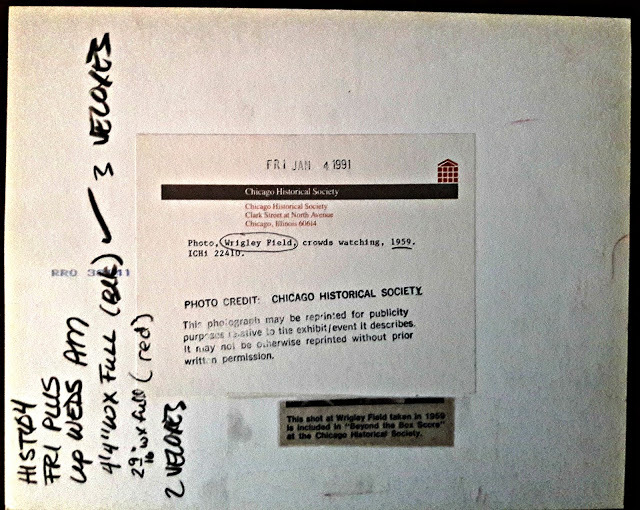 Both books are part of my personal collection - great resources to have. 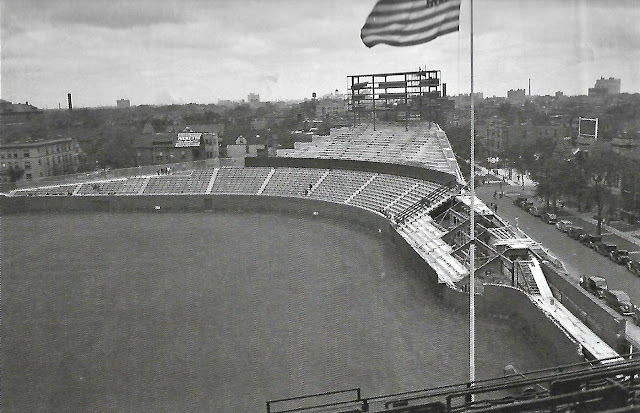 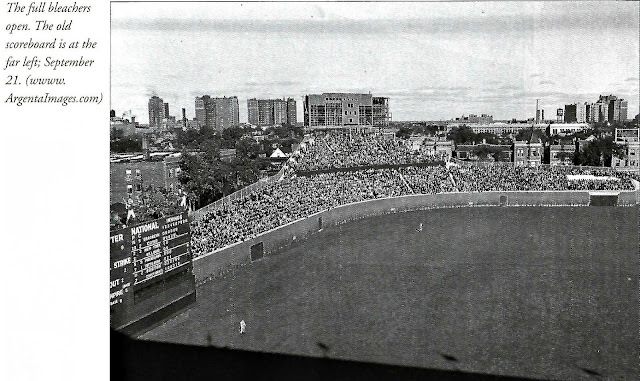 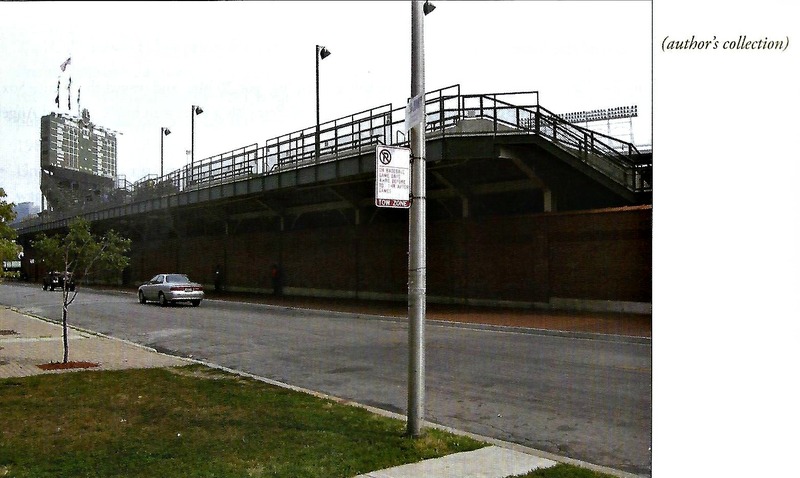 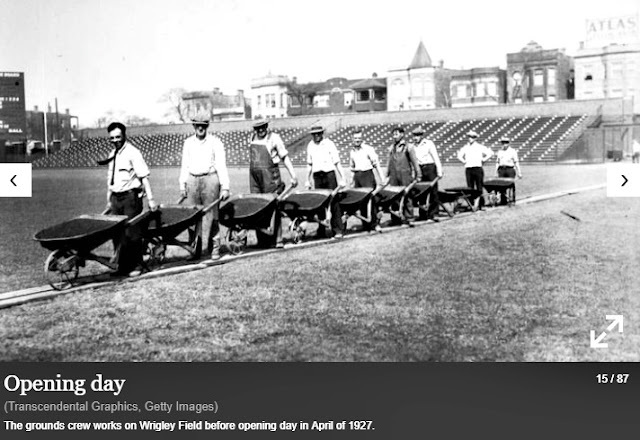 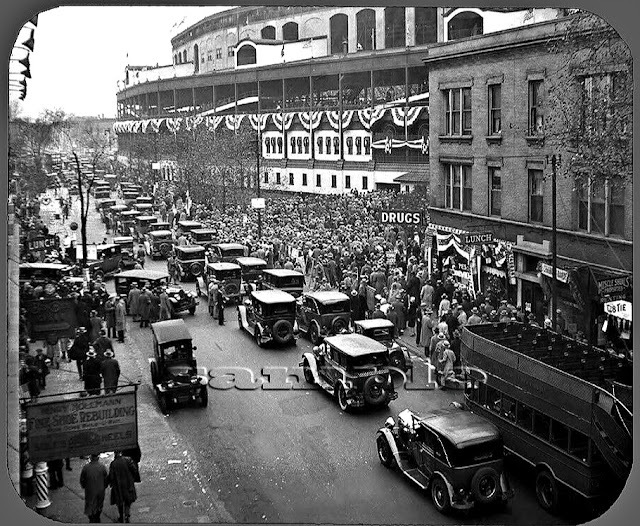 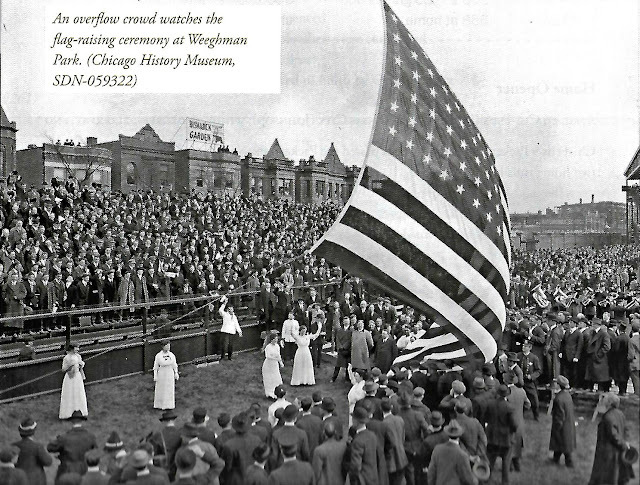 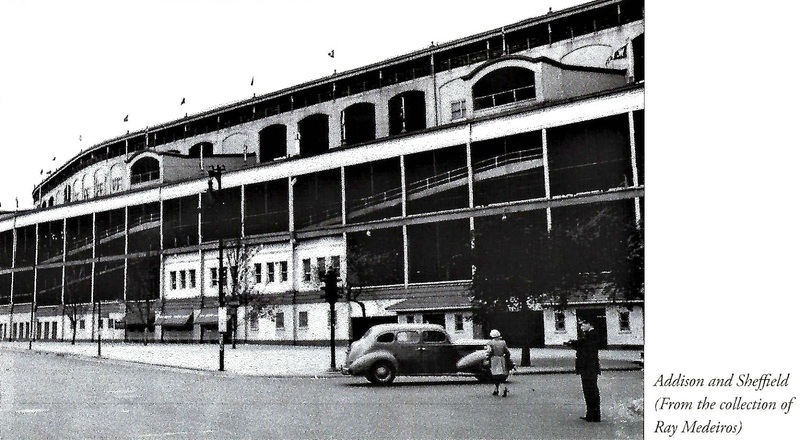 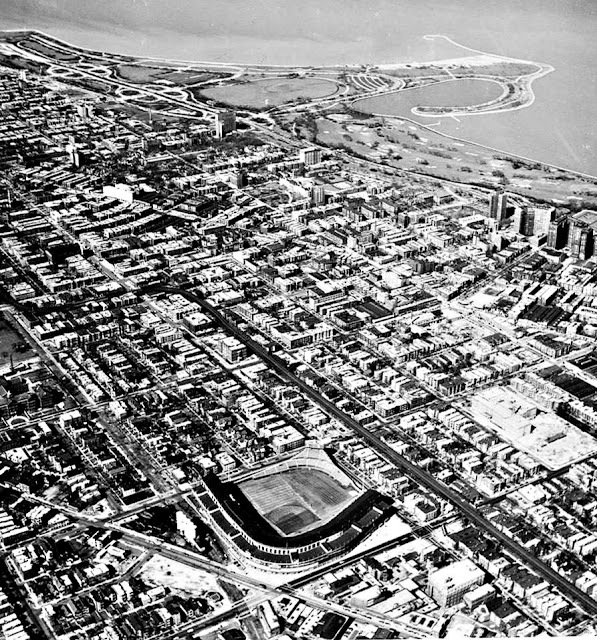 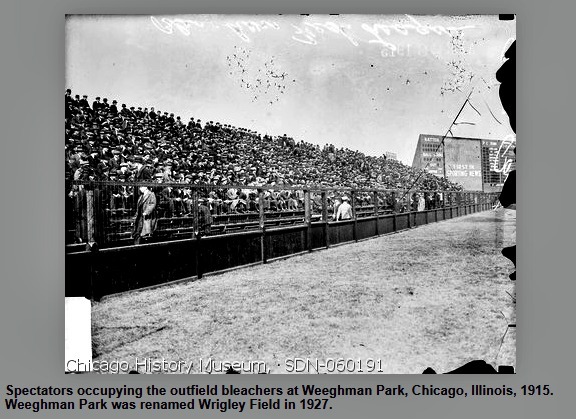 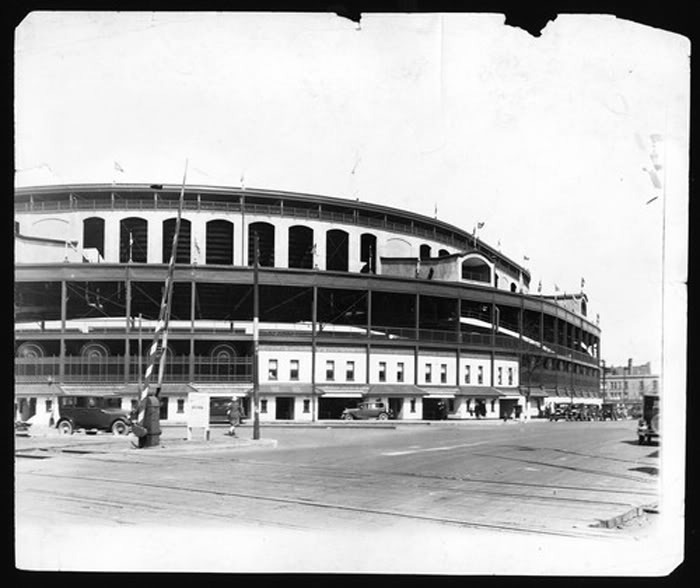 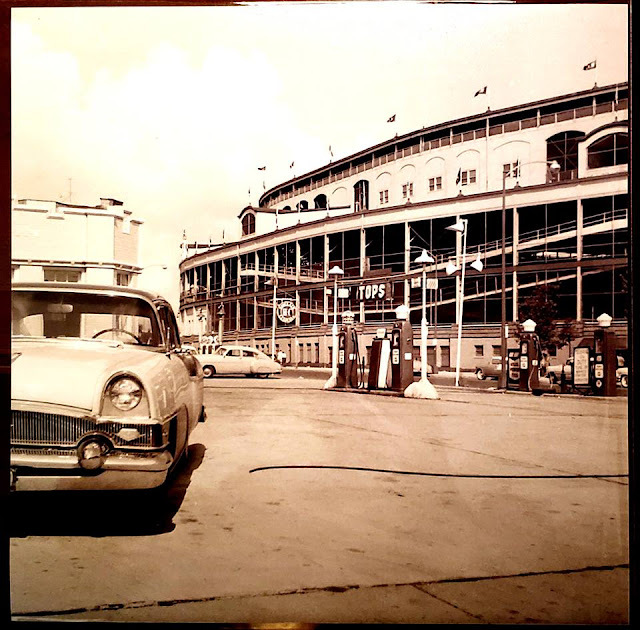 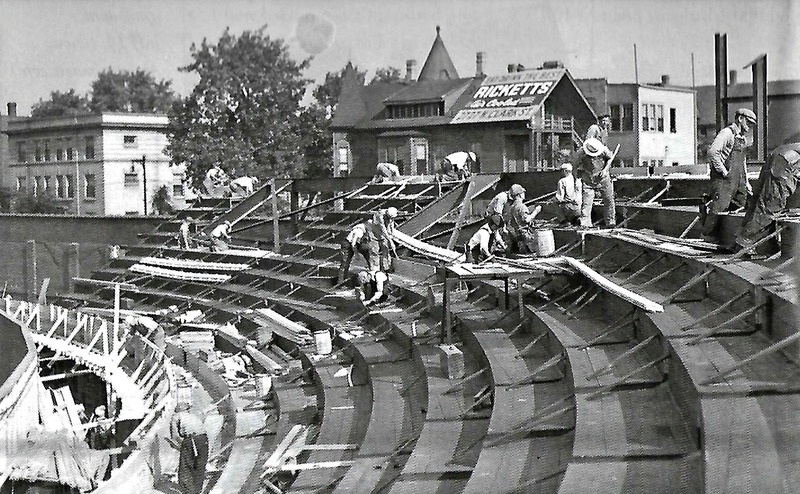 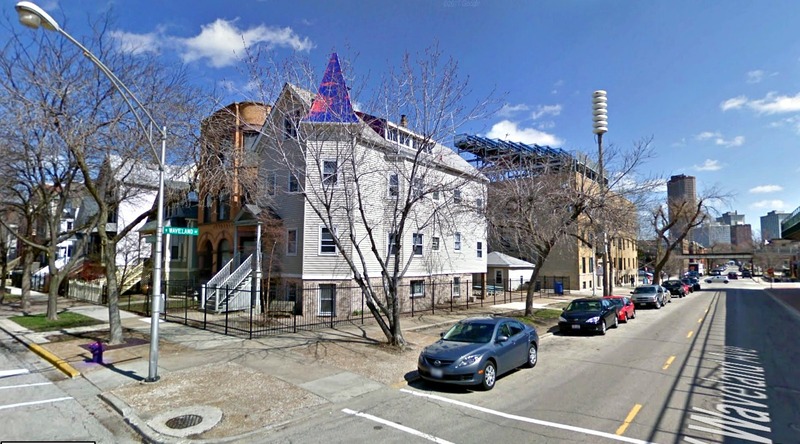 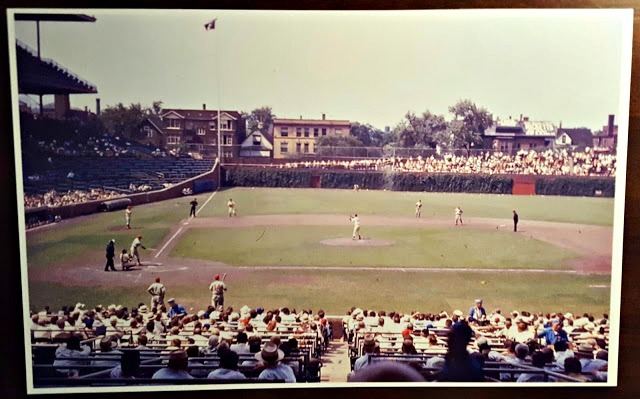 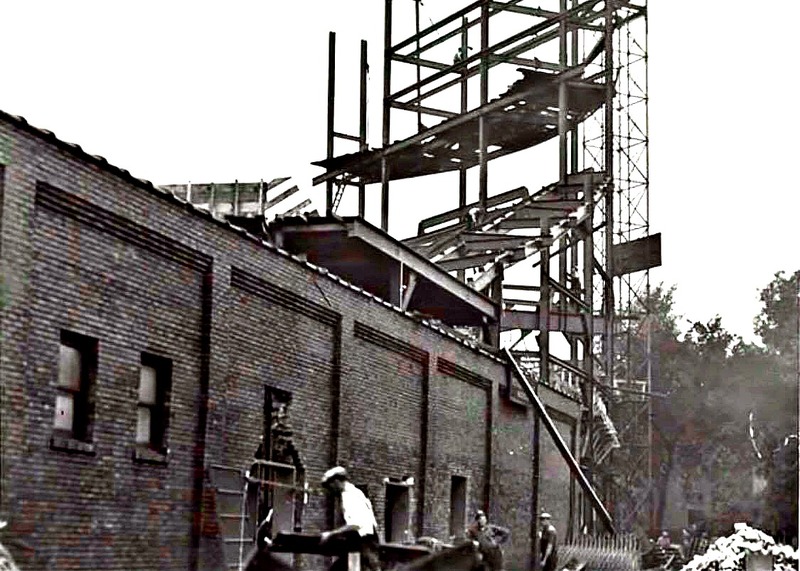 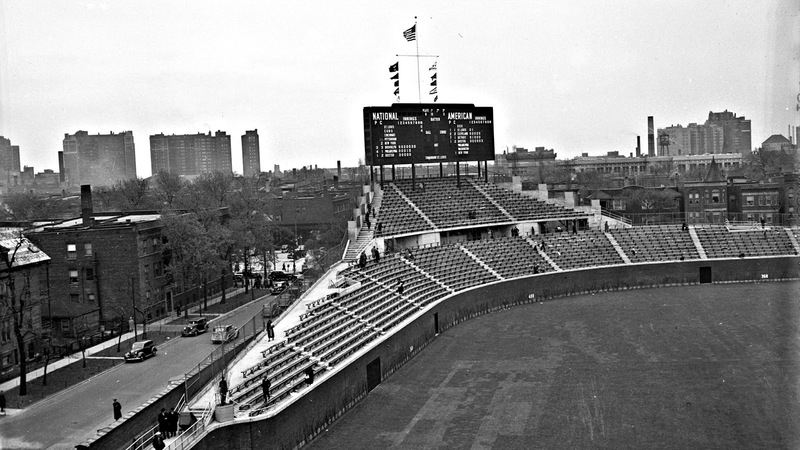 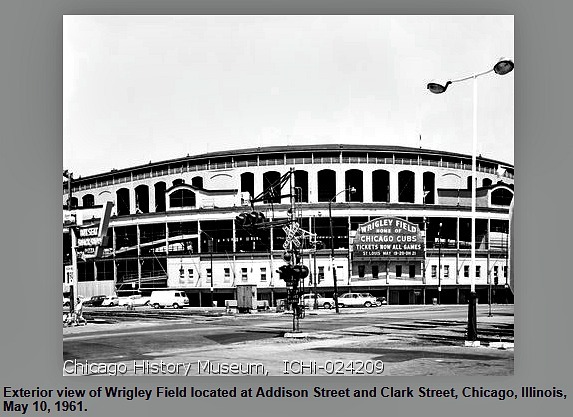 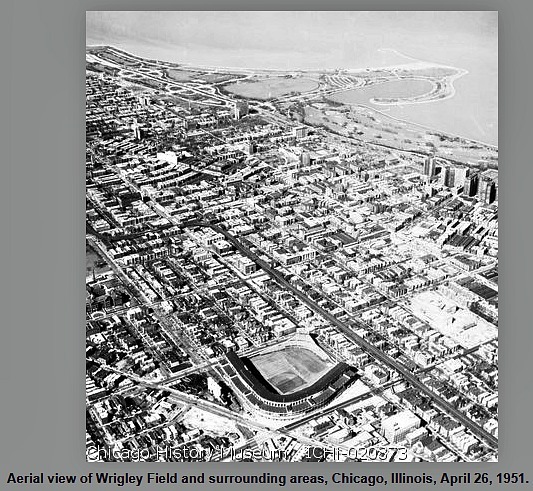 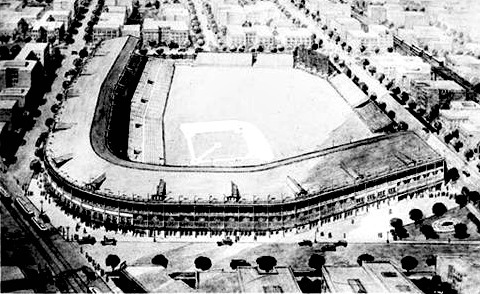 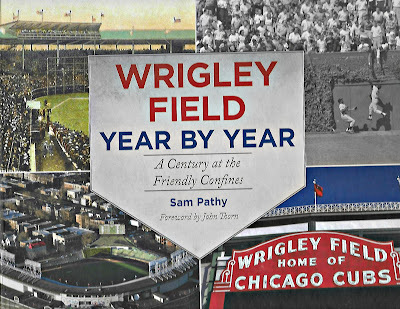 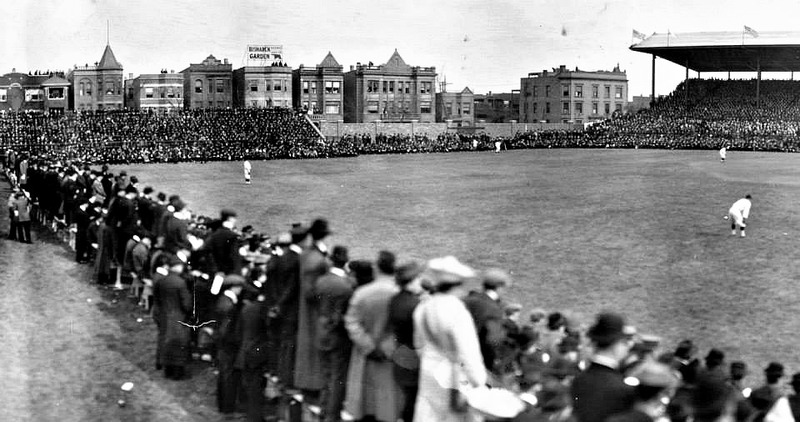 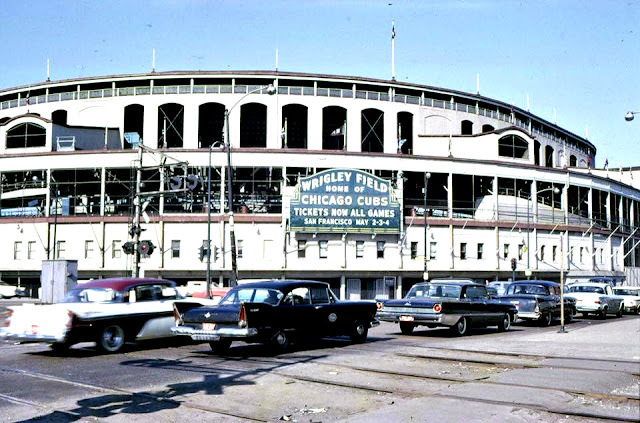 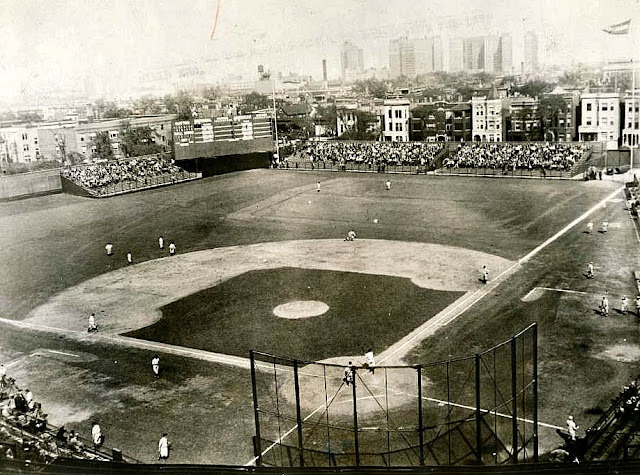 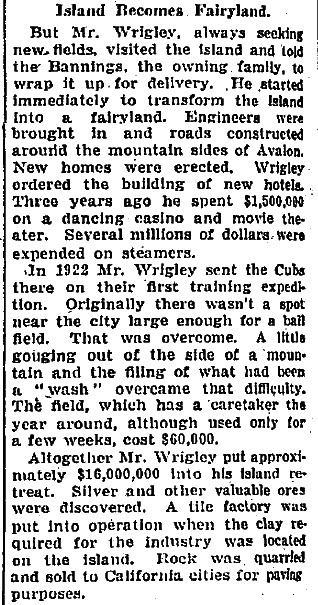 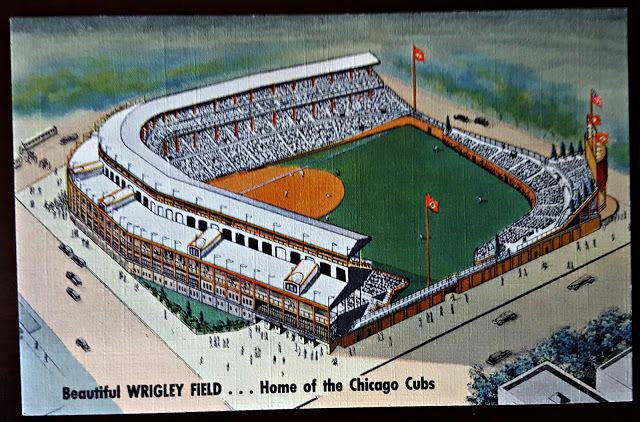 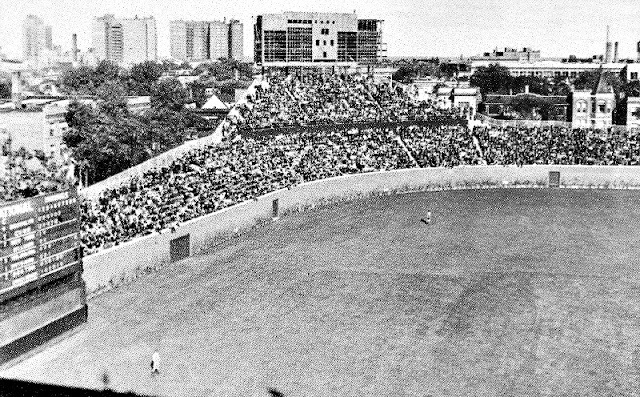 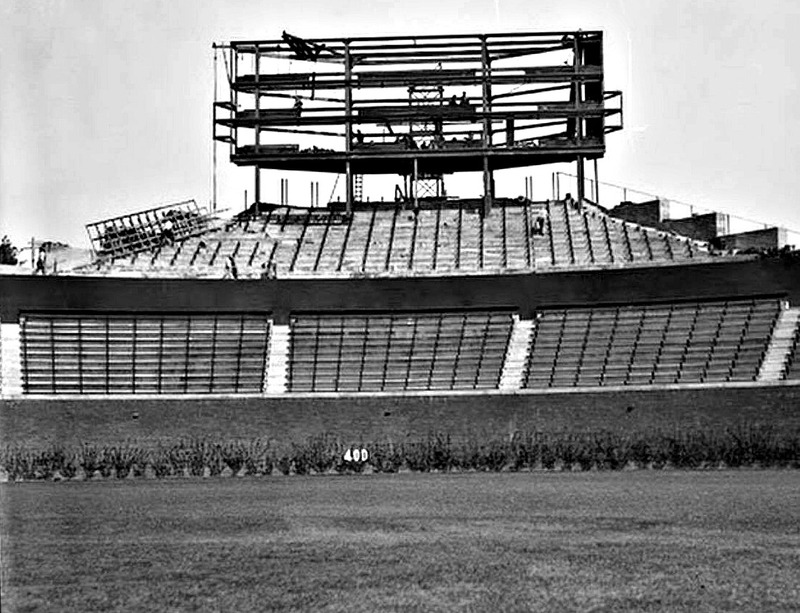 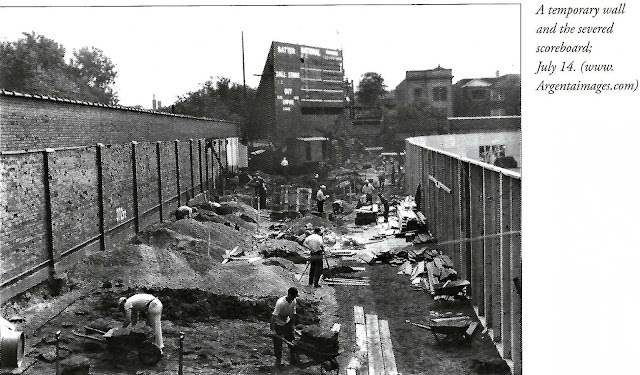 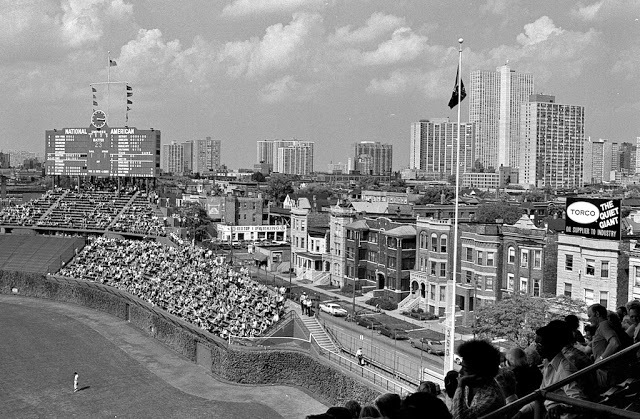 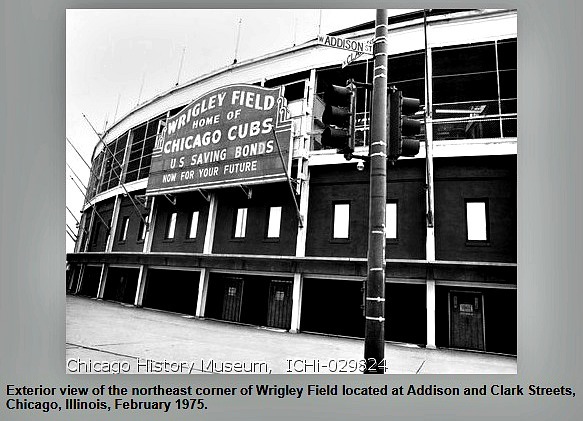 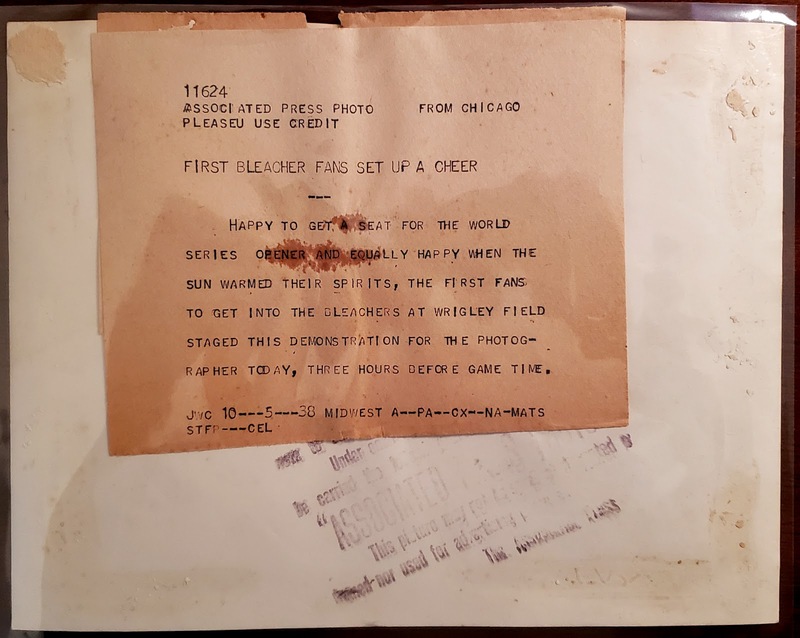 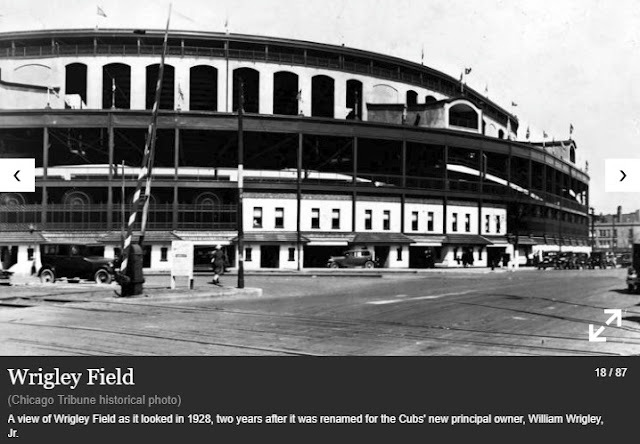 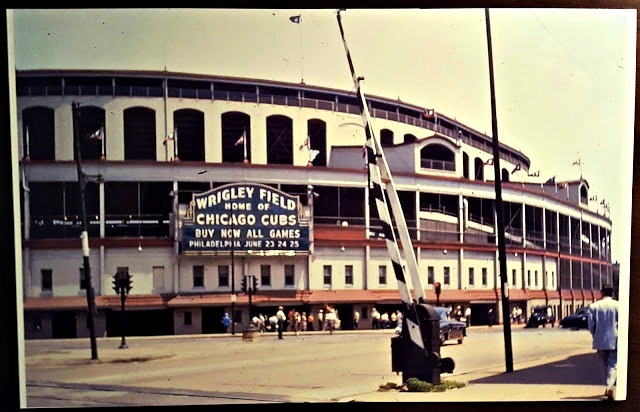 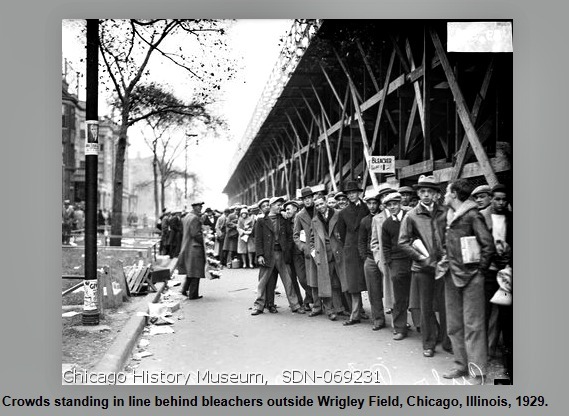 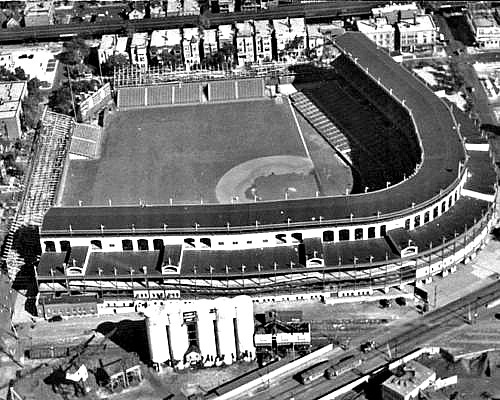 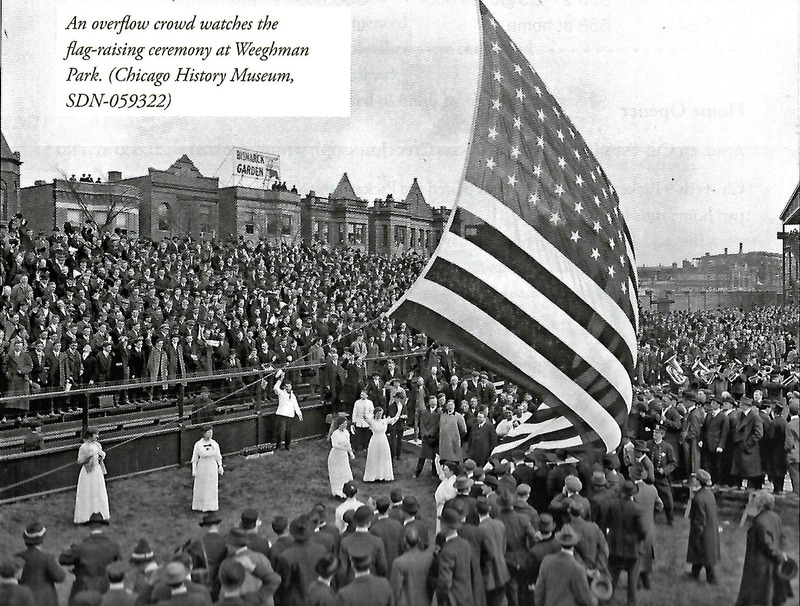 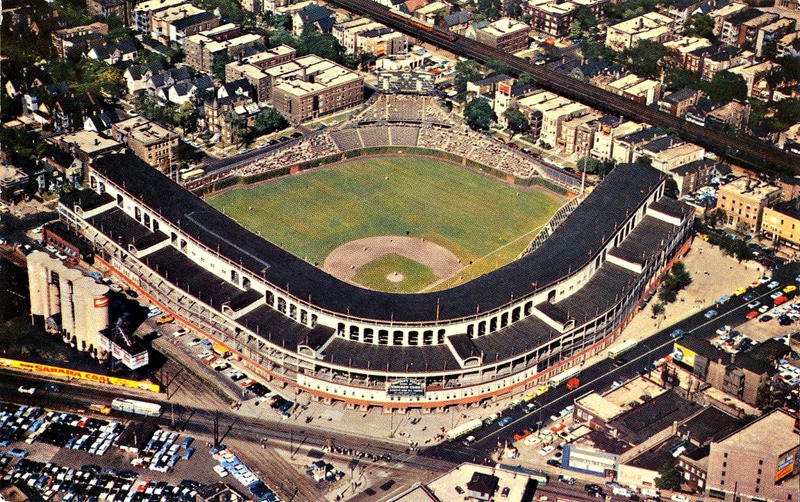 This post begins with the construction of Weegham Park to be later called Wrigley Field - one of the oldest existing ballparks in the country. 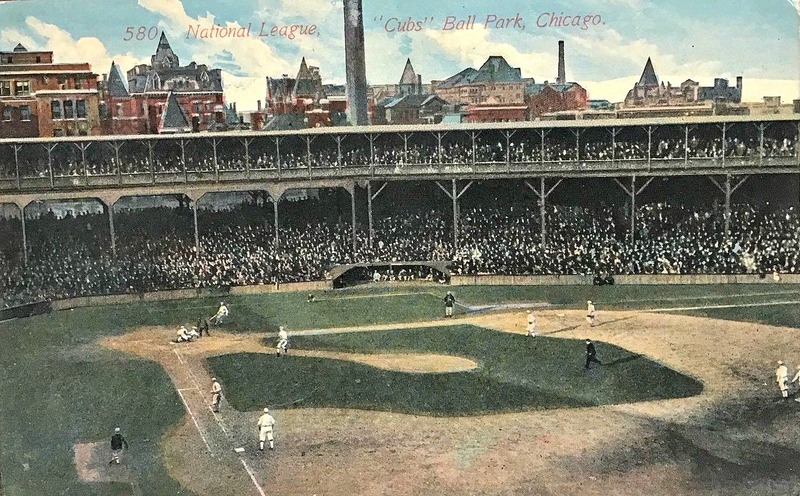 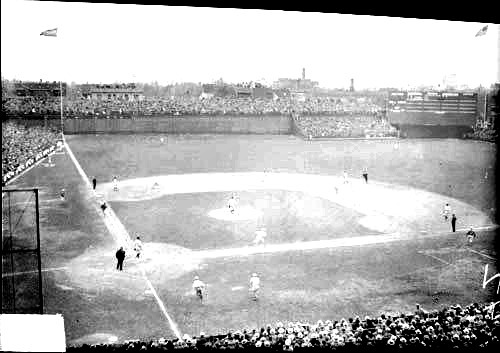 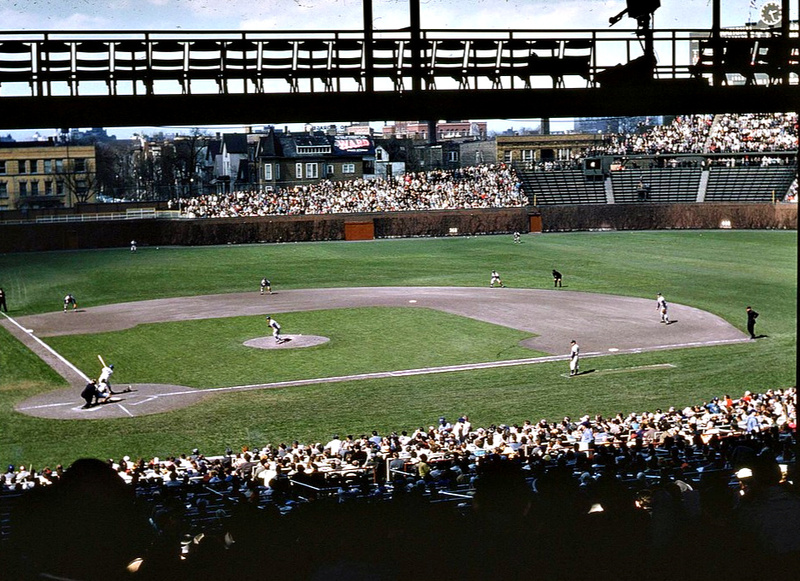 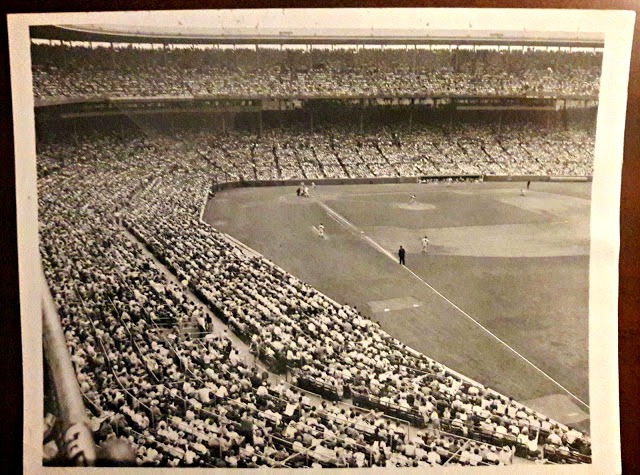 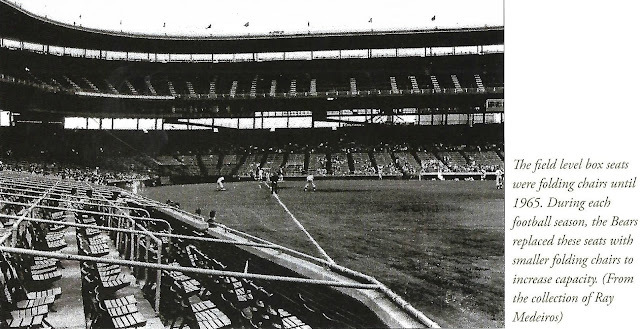 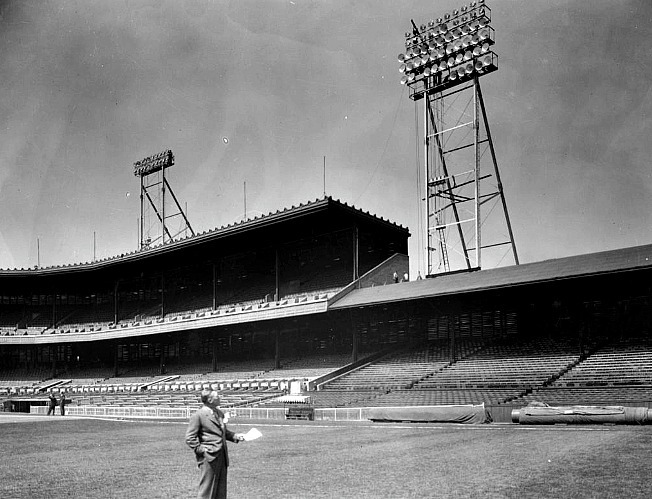 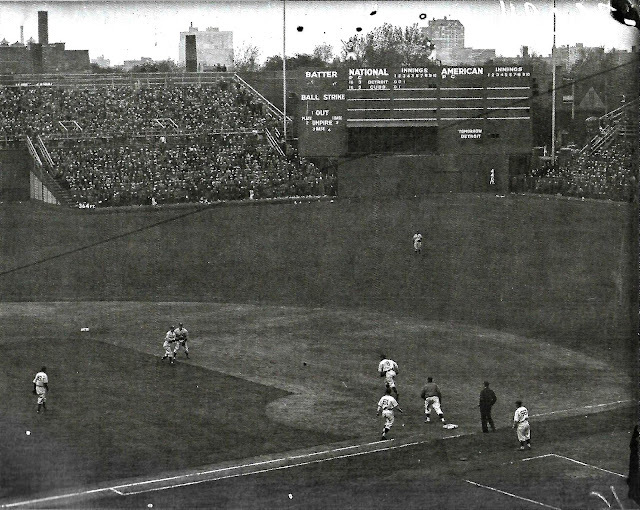 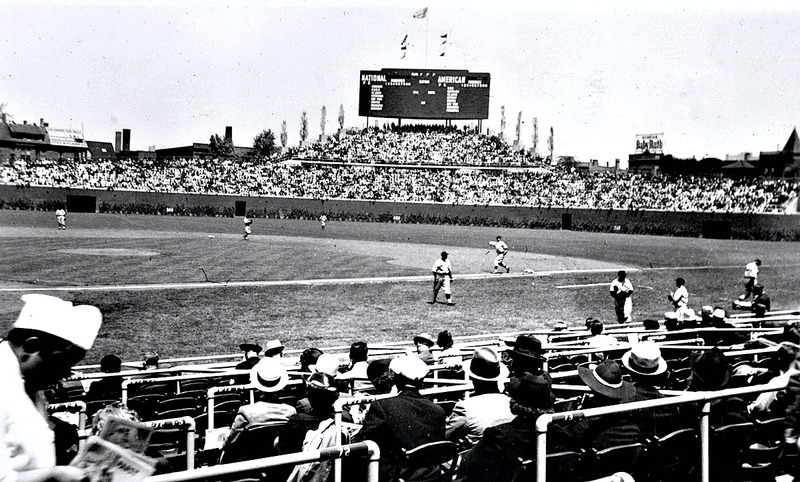 For a short period of time this baseball field was referred to as Cub's Park. 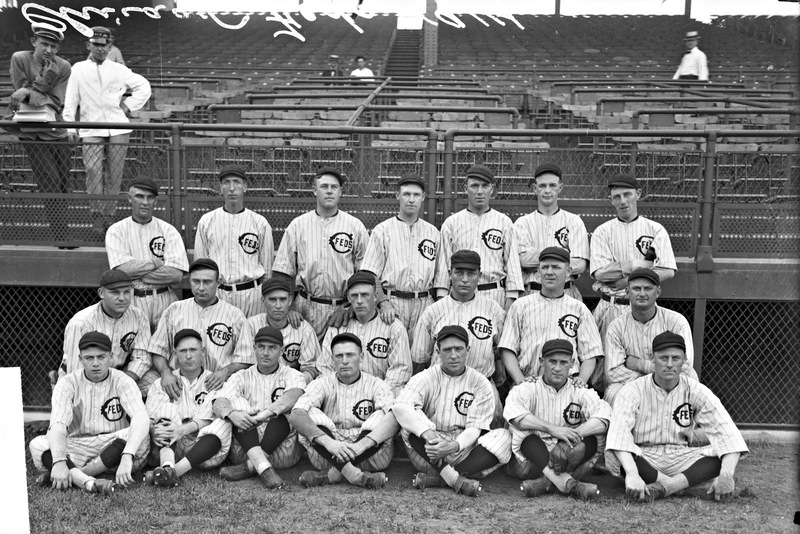 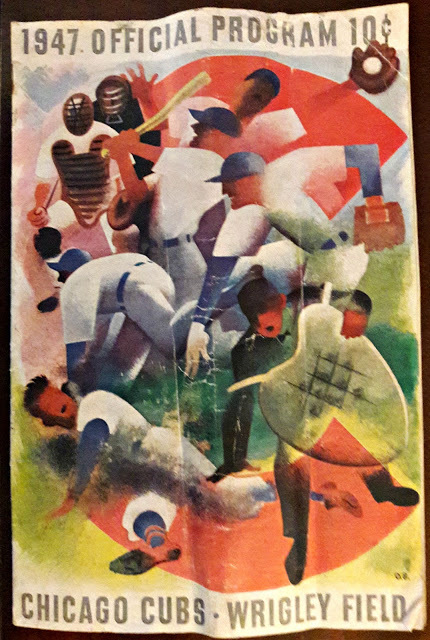 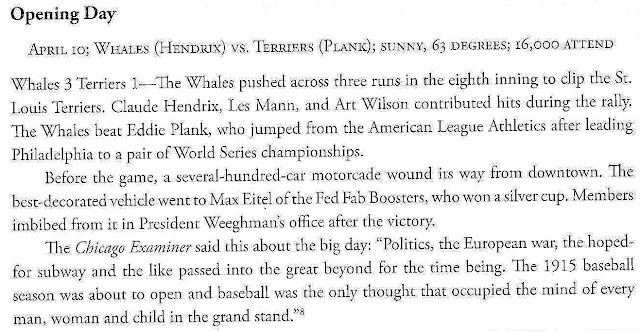 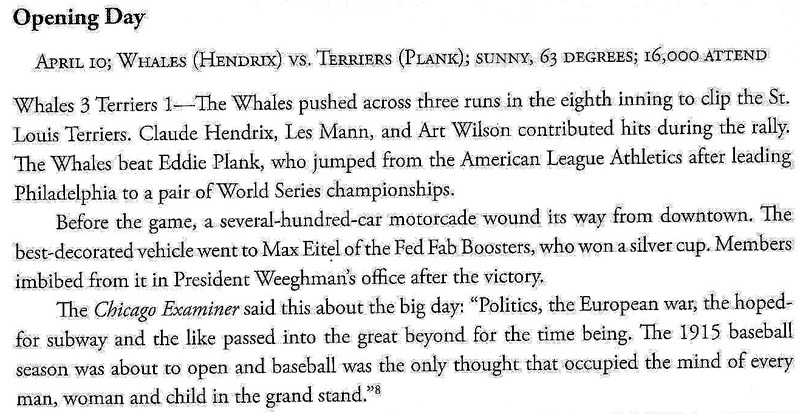 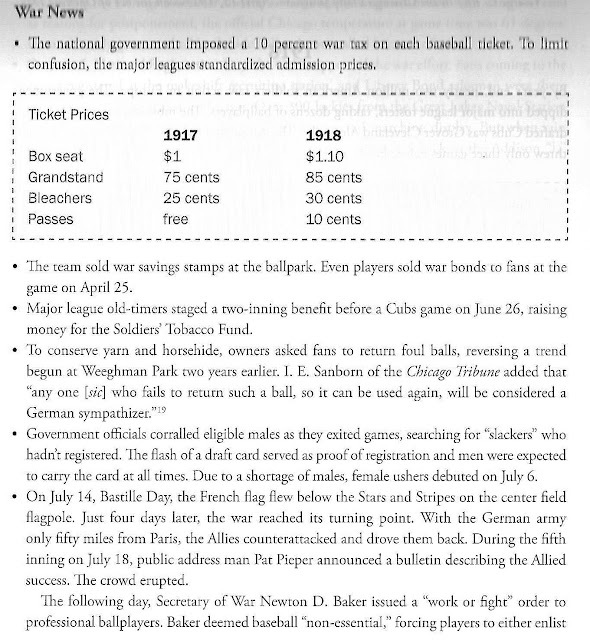 The baseball team in 1914 was called the Chicago Fed's (also called the Whales) named after the establishment of a new league called the Federal League. 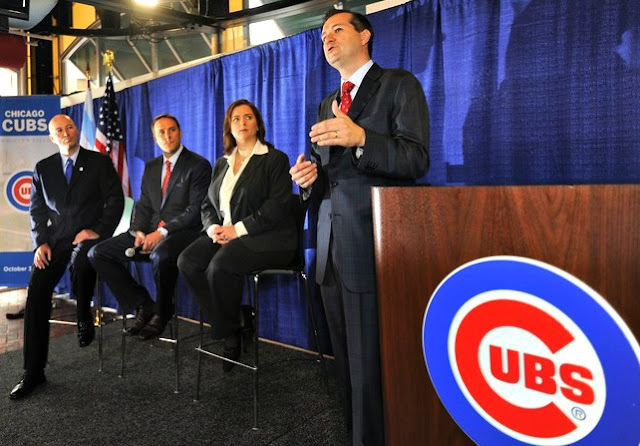 This baseball league would only last two seasons for it lack the funds to continue. 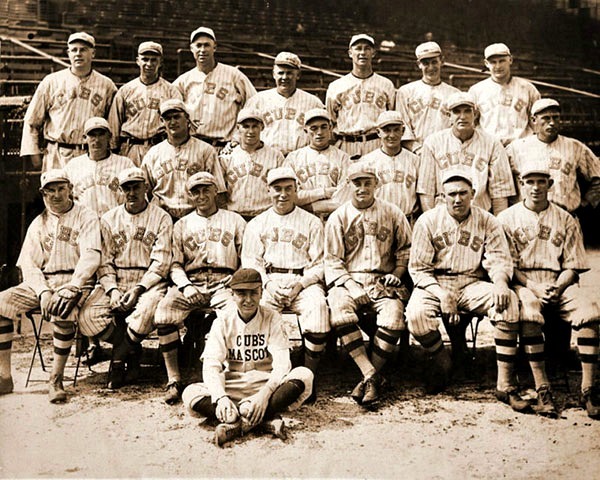 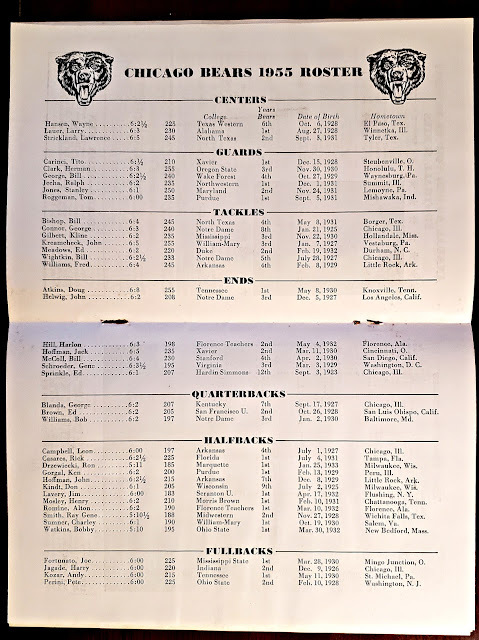 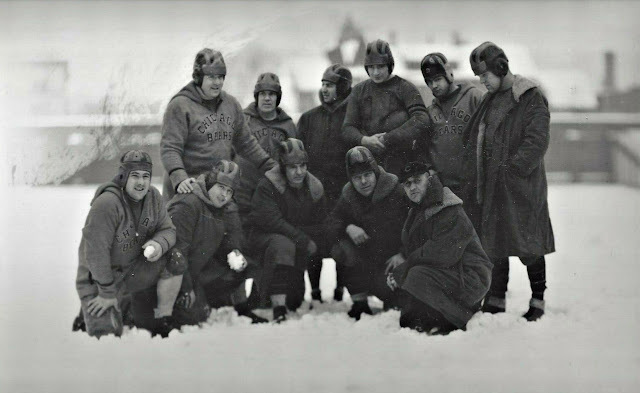 During this time period teams would come and go and so would the name and controlling ownership of the baseball park and baseball team. 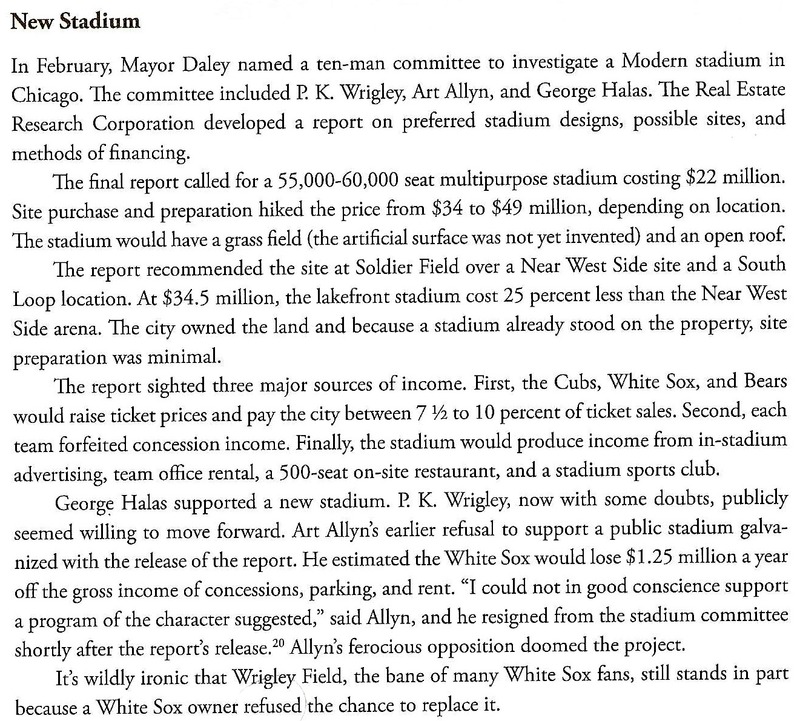 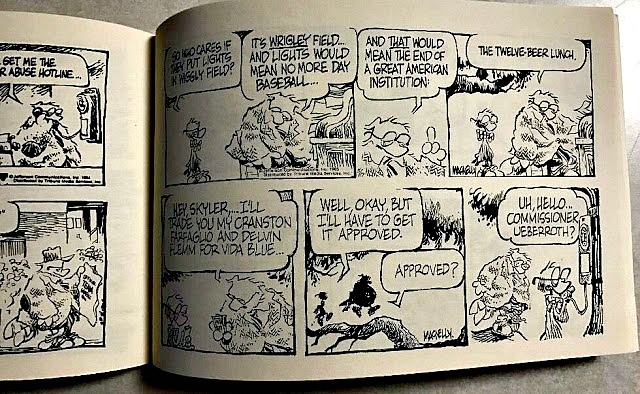 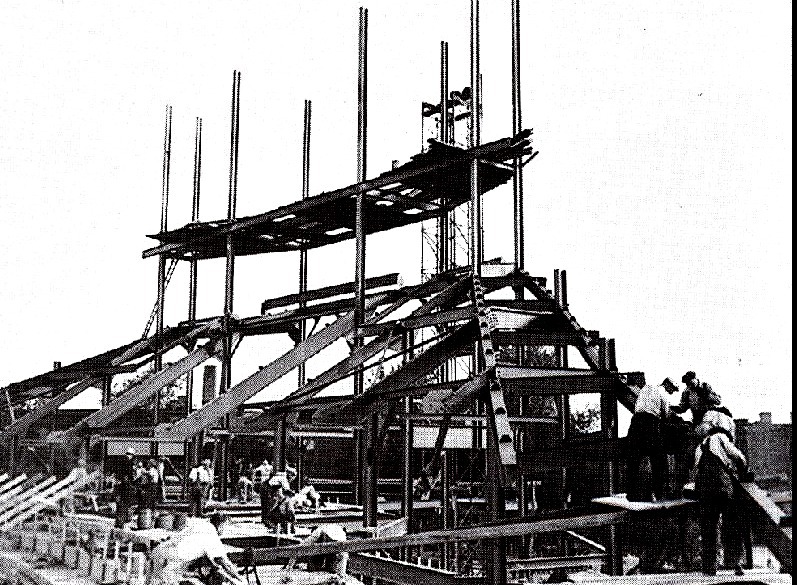 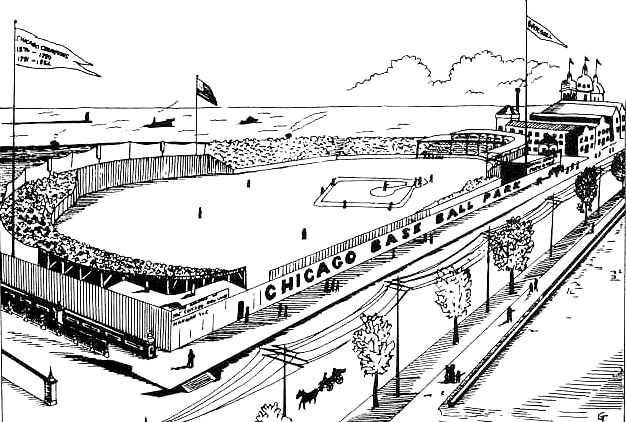 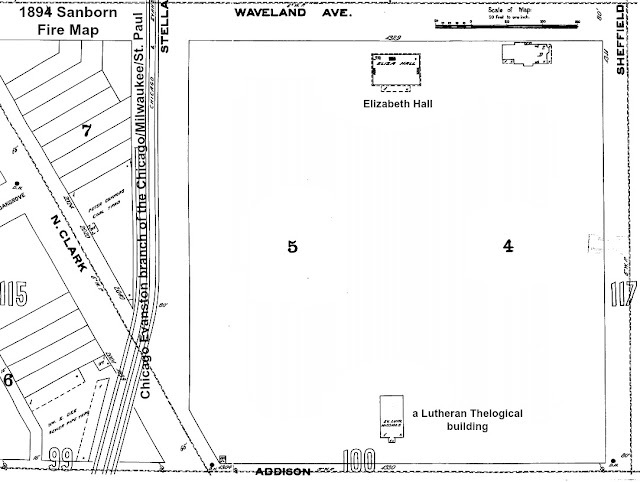 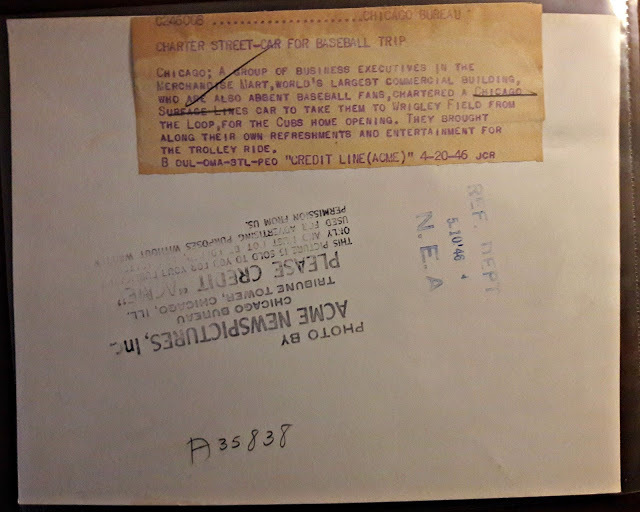 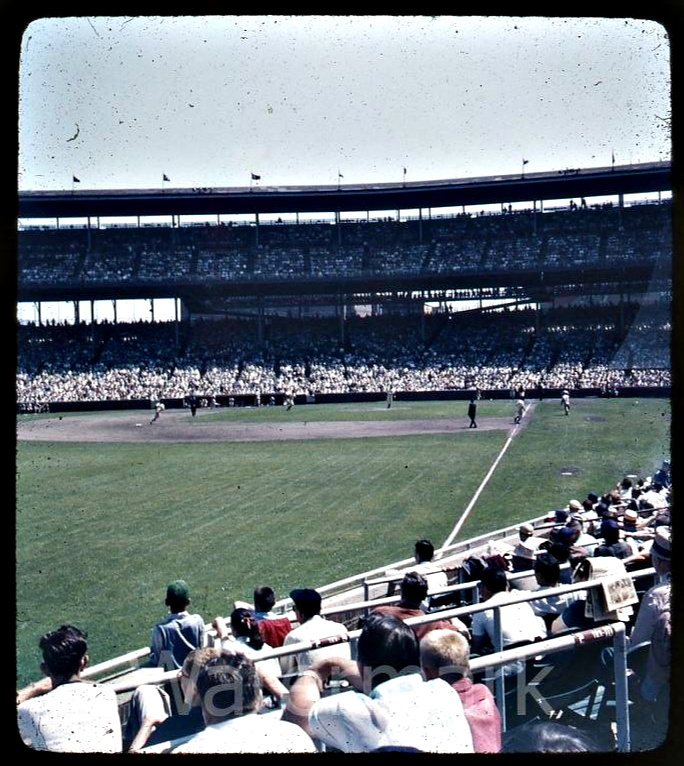 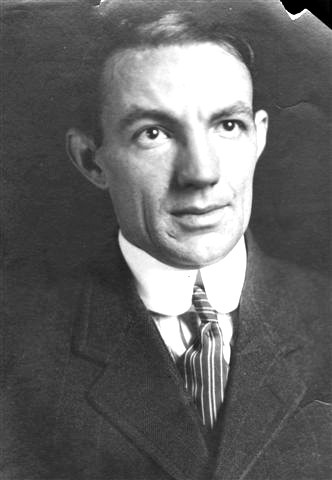 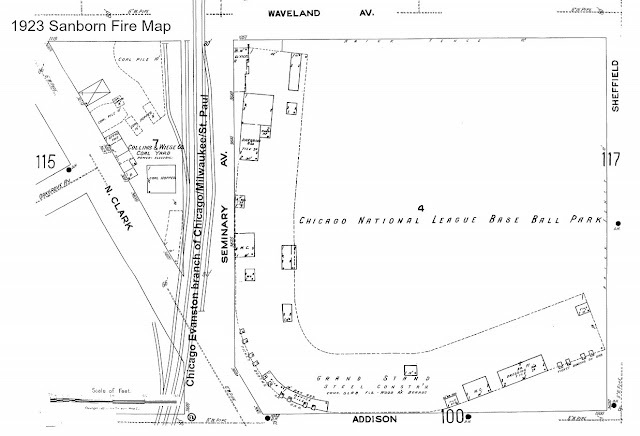 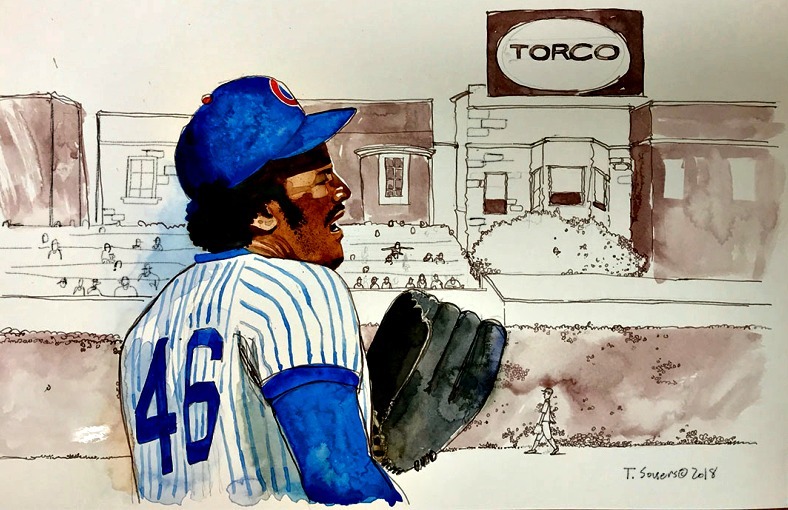 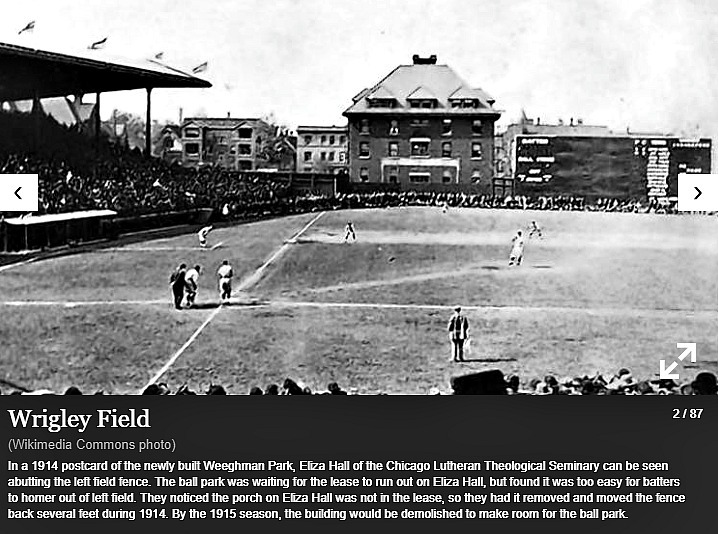 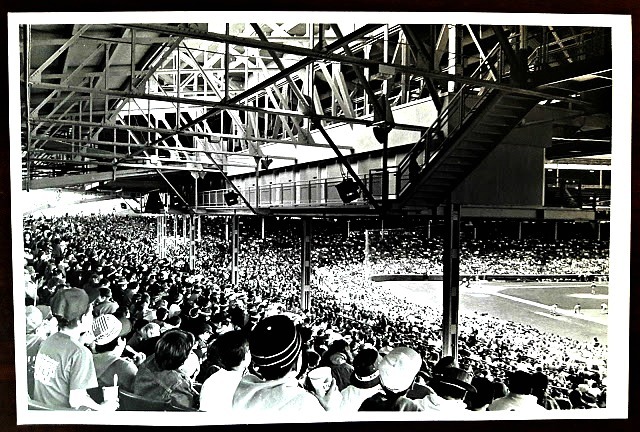 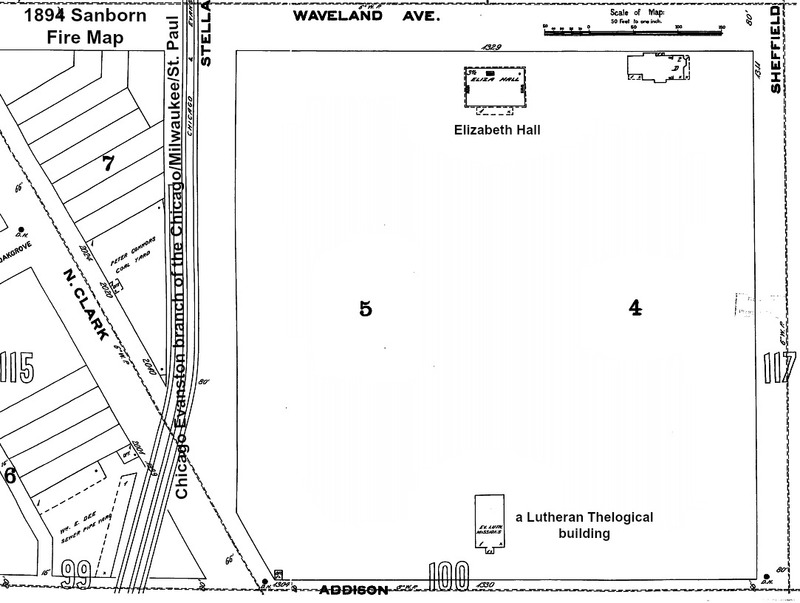 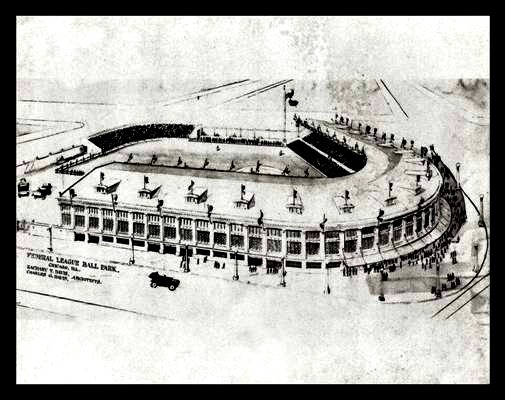 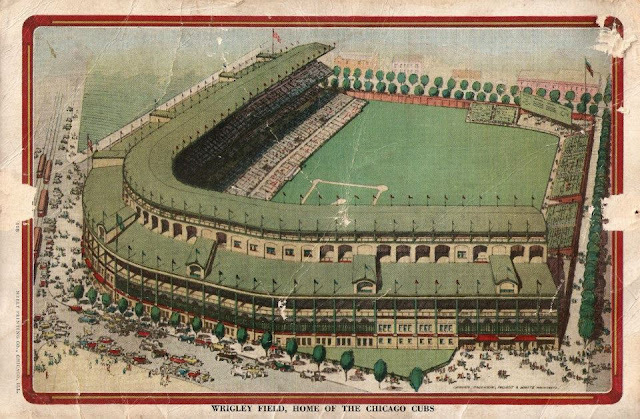 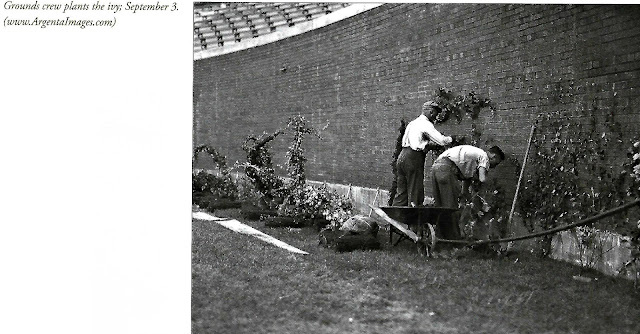 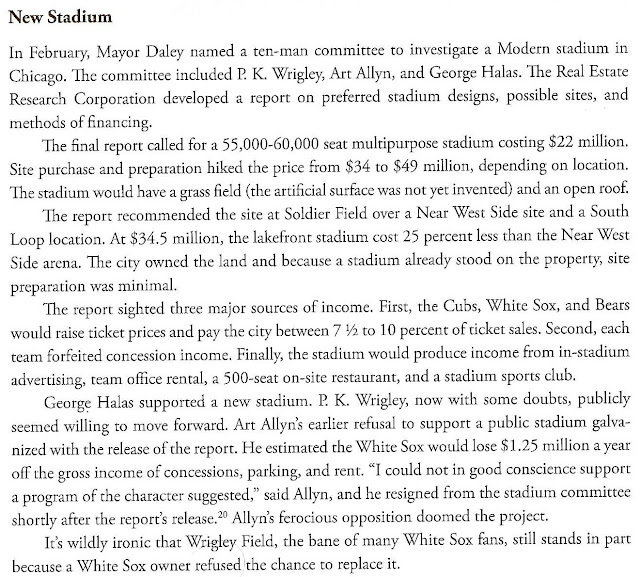 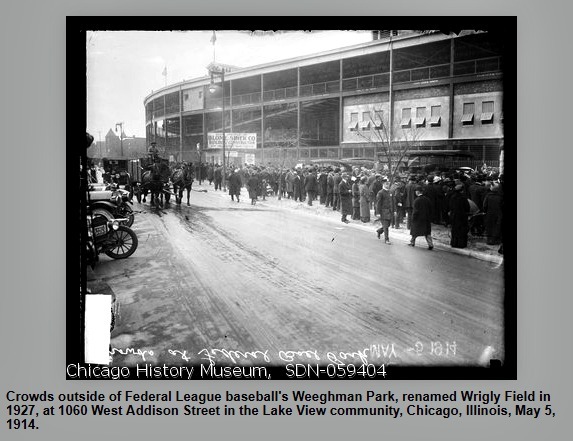 The architect of Weeghman Park was the same person who designed Comiskey Park - a graduate of the Art Institute of Chicago, Zachary Taylor Davis. 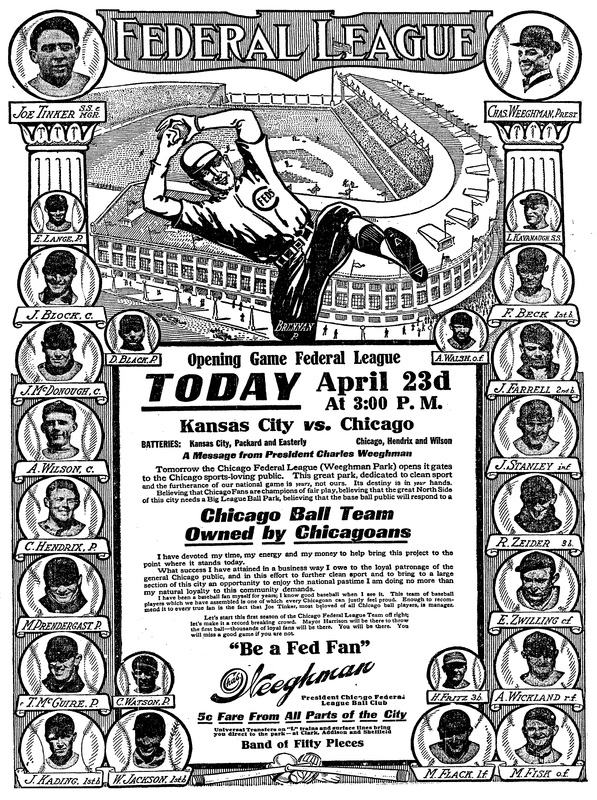 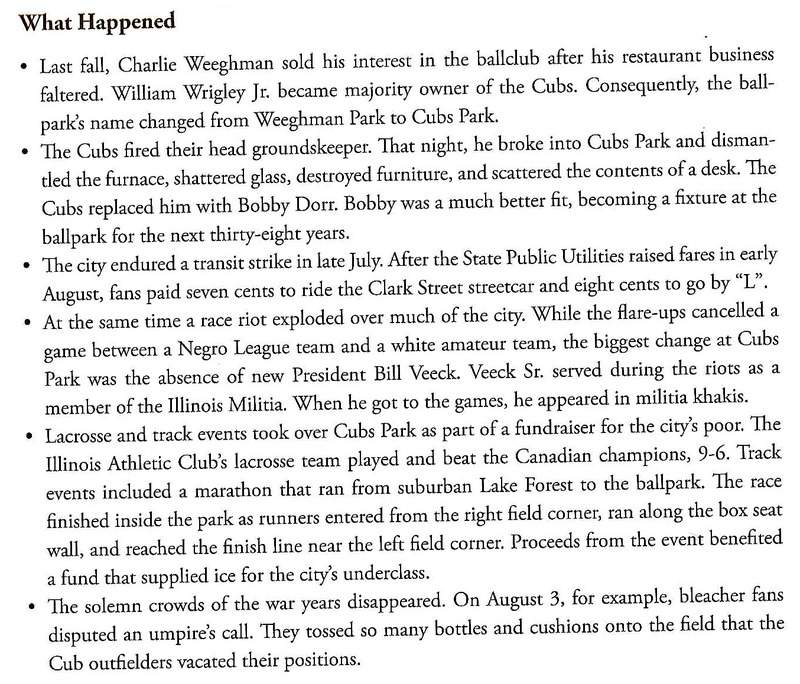 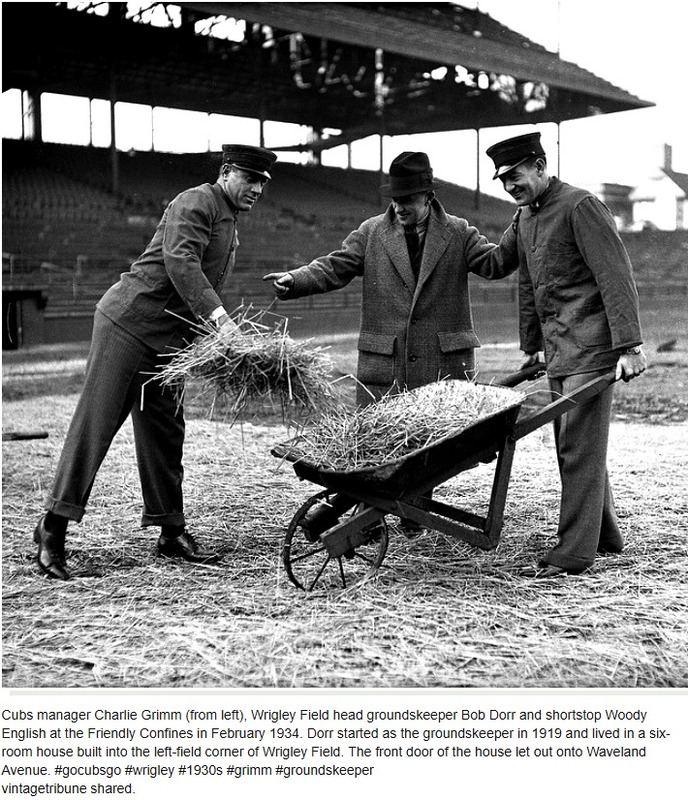 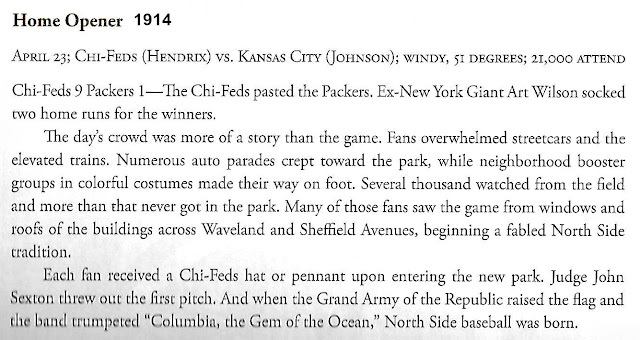 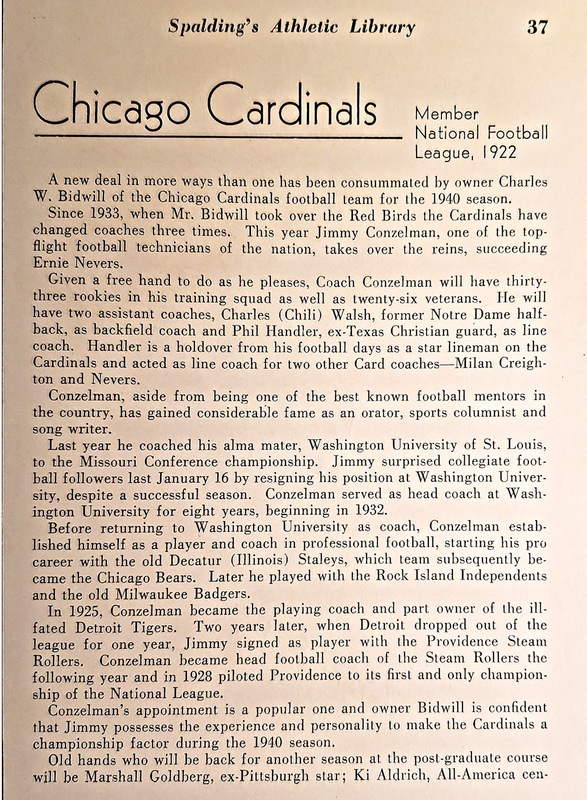 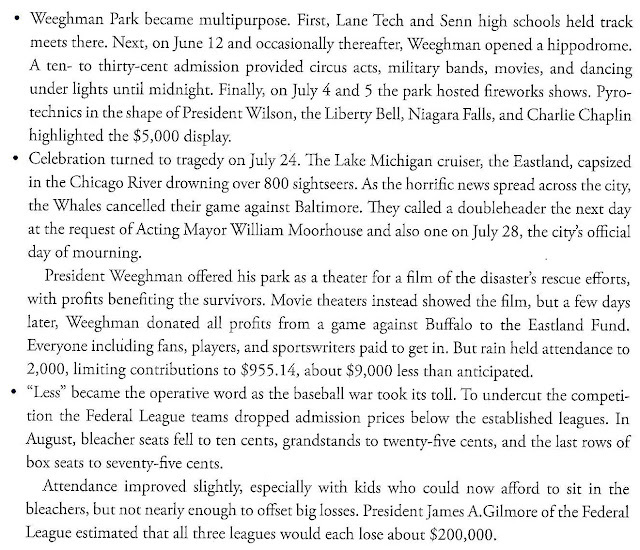 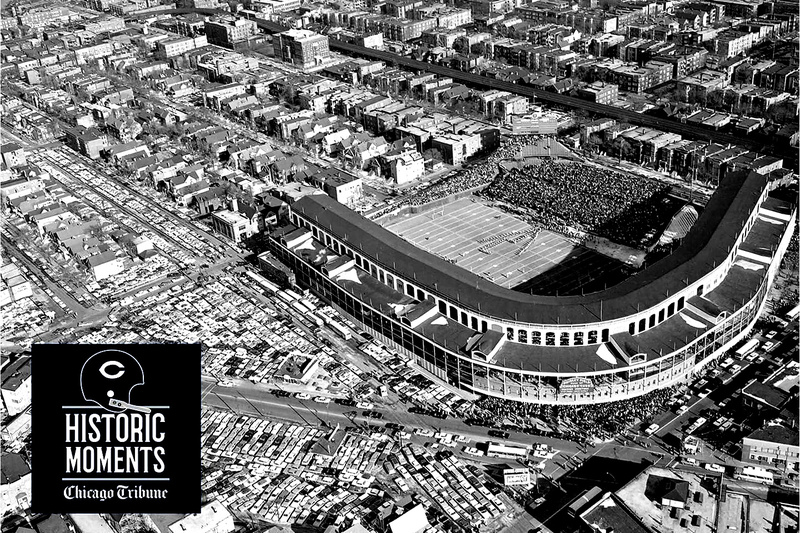 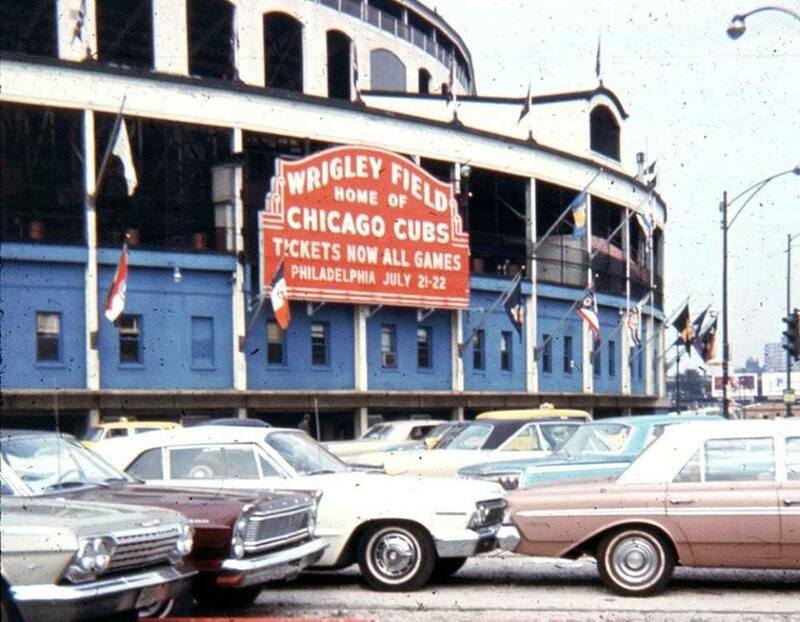 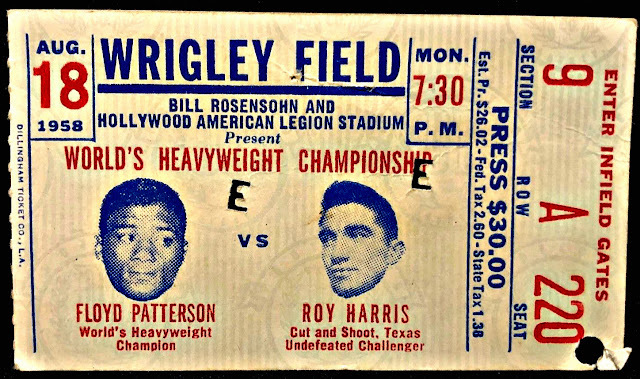 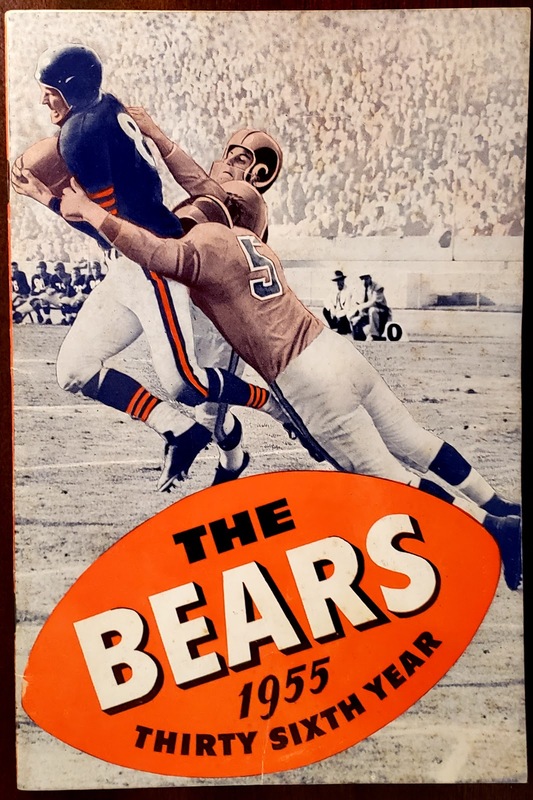 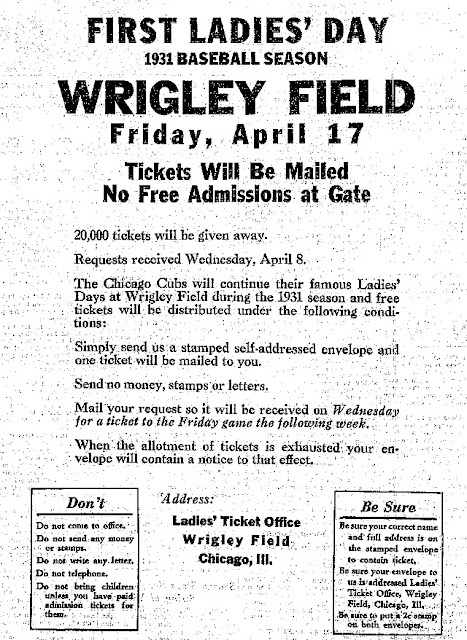 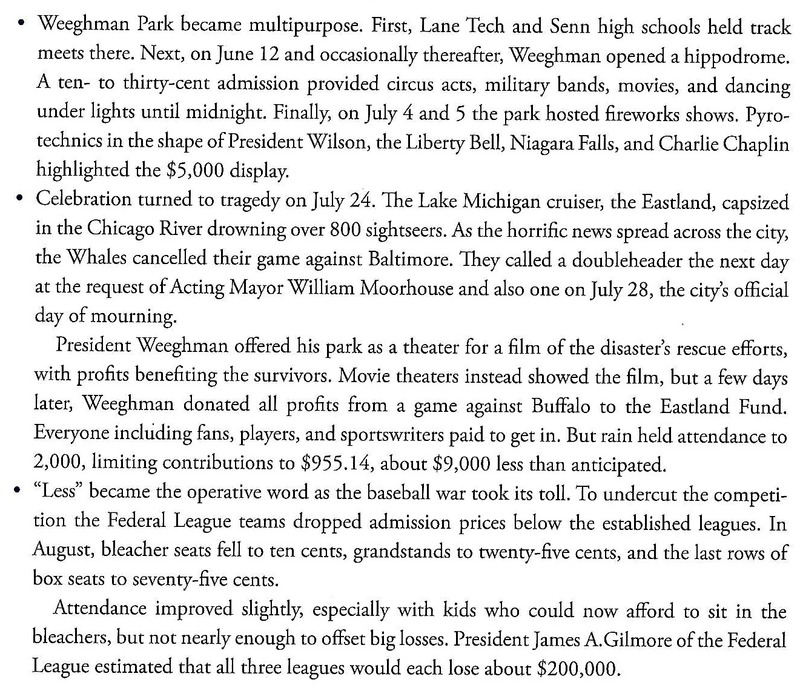 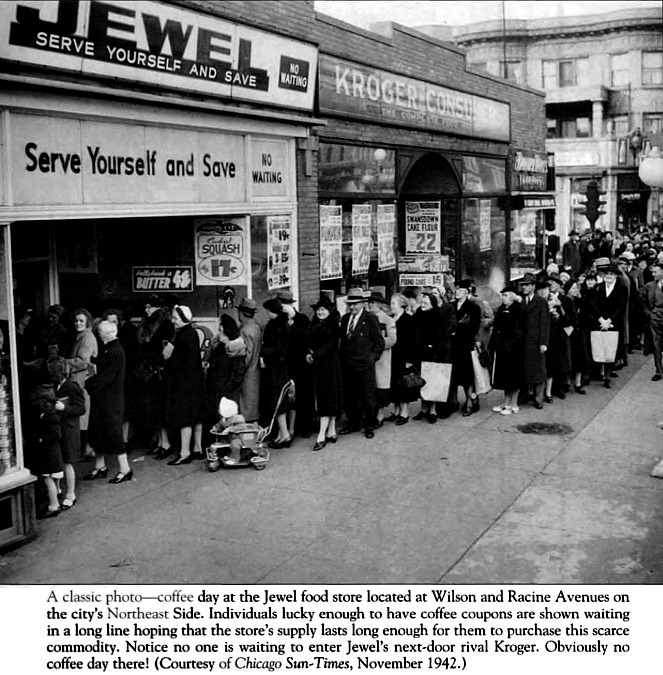 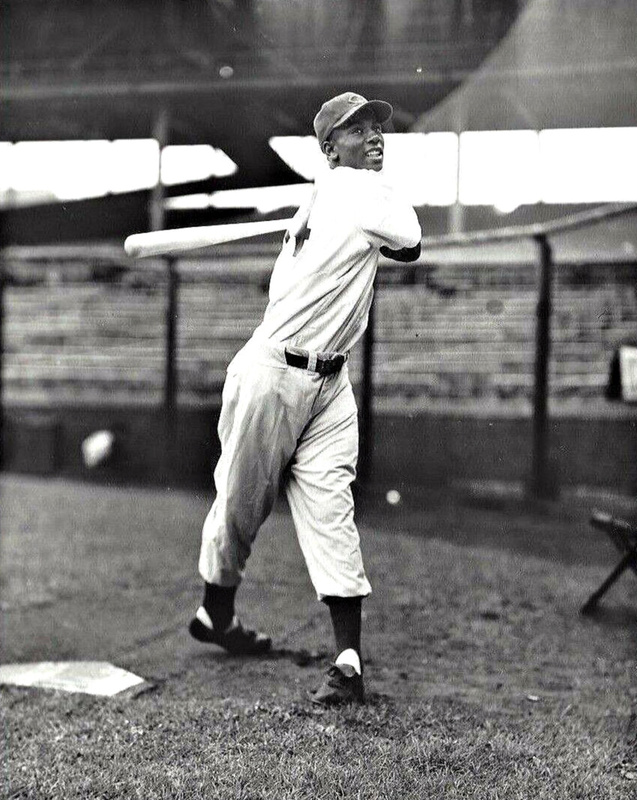 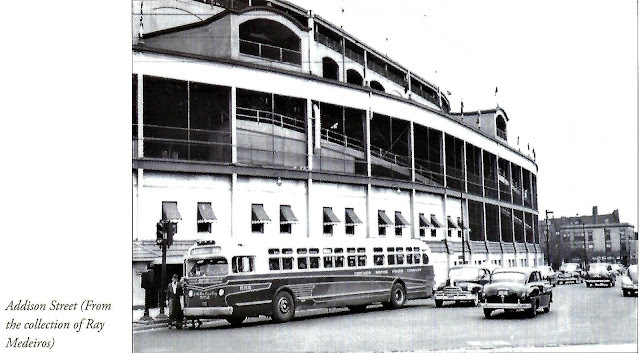 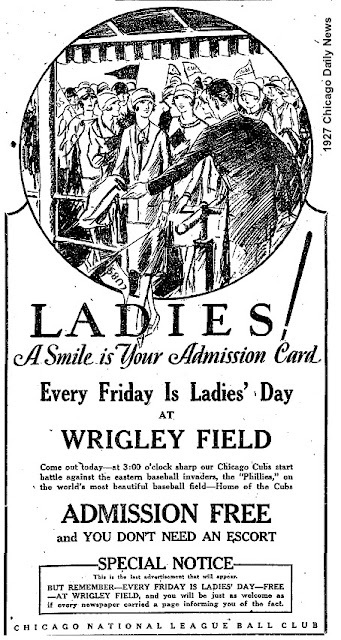 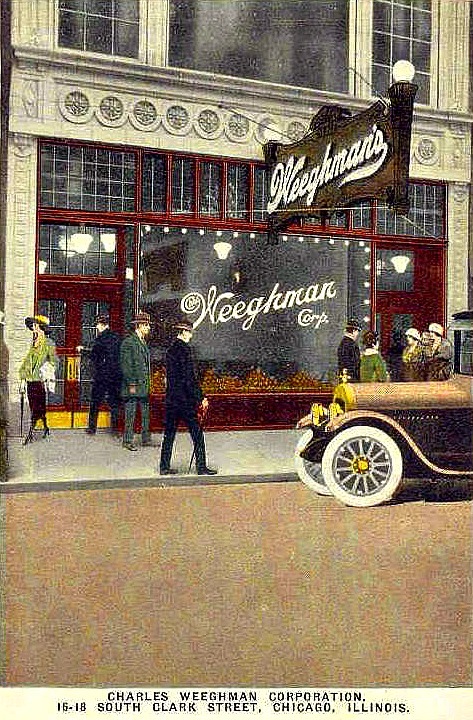 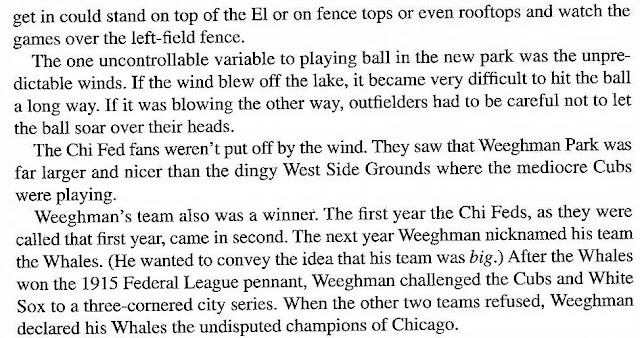 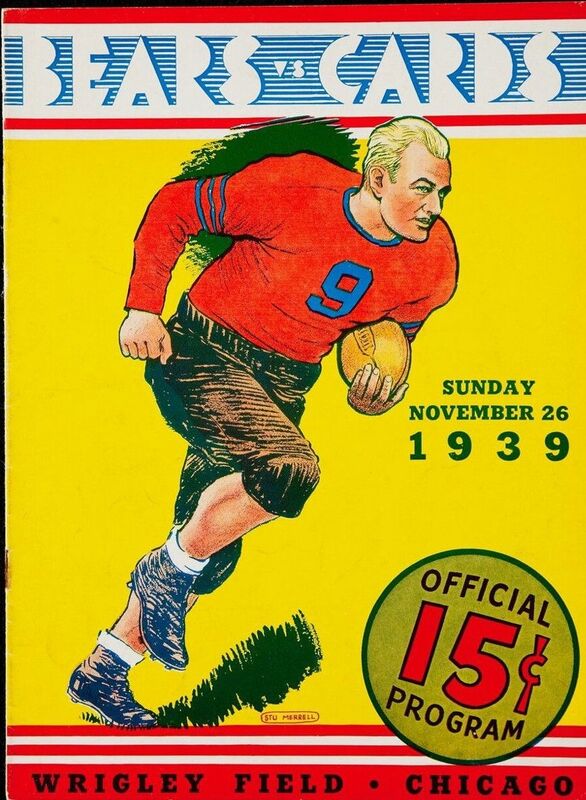 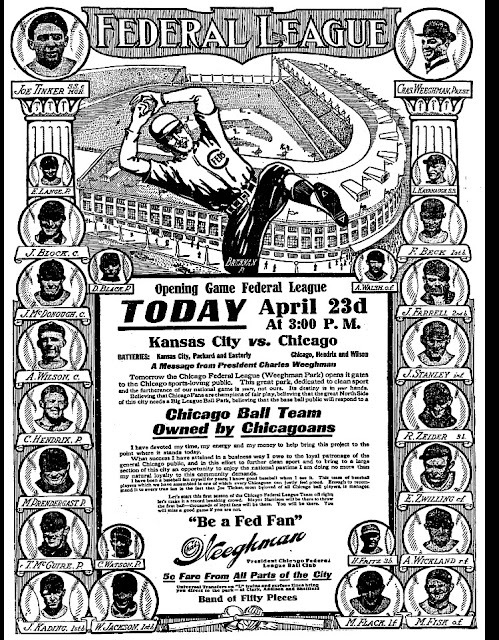 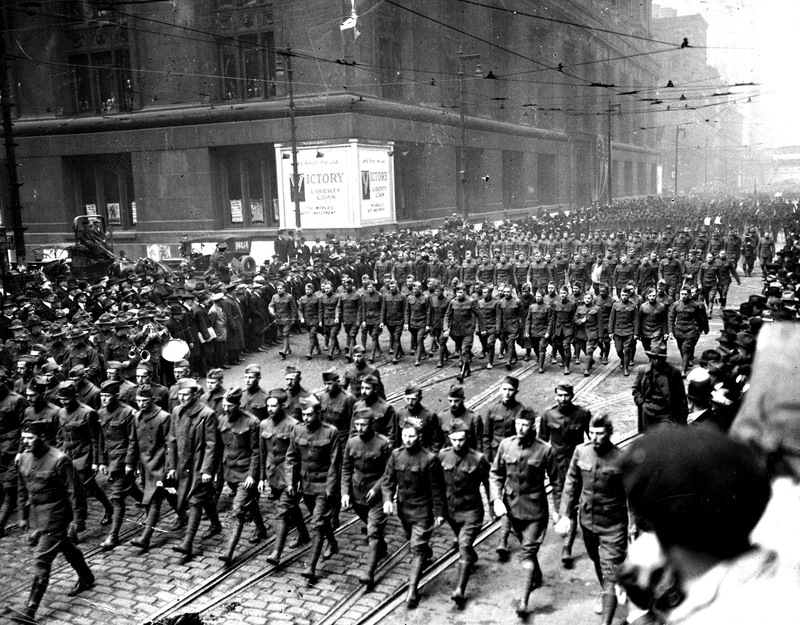 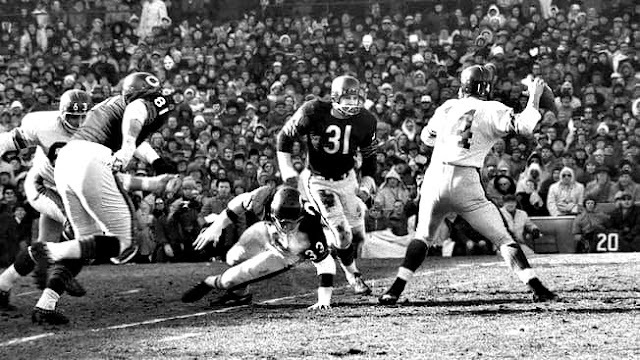 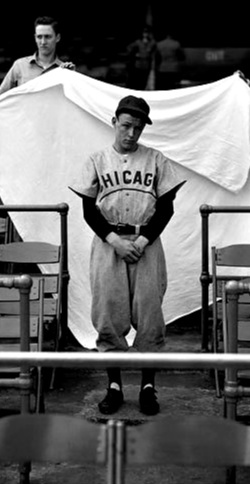 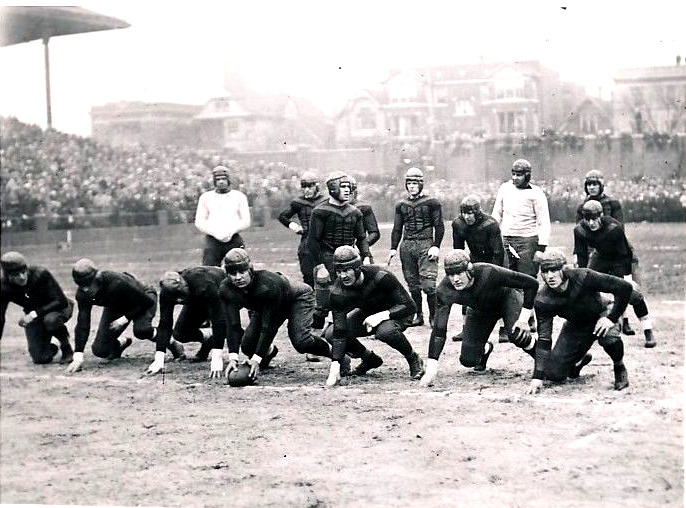 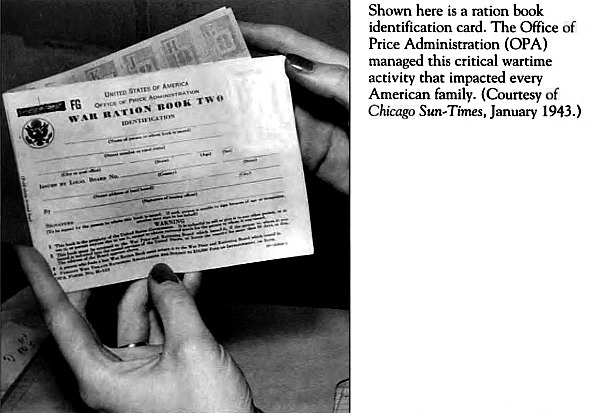 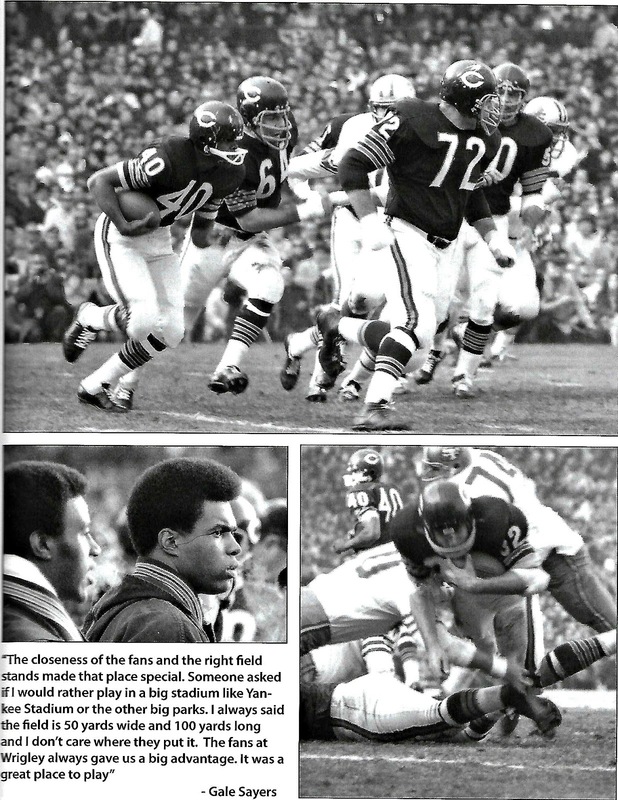 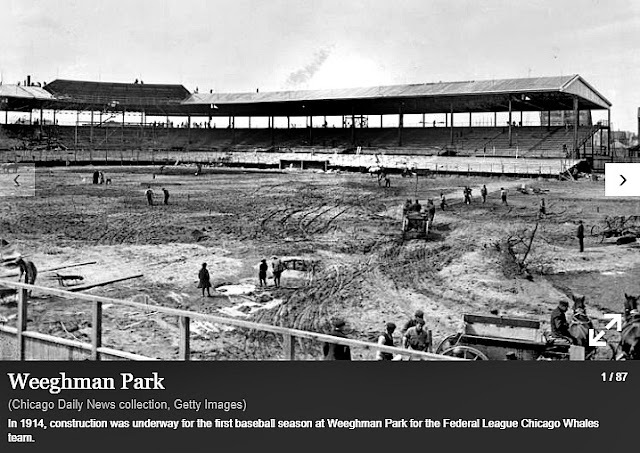 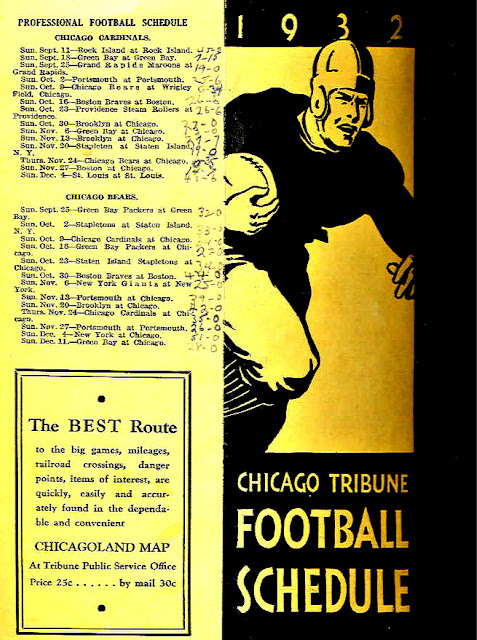 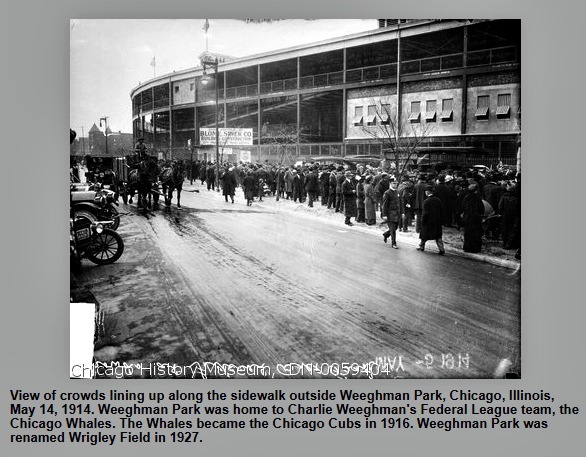 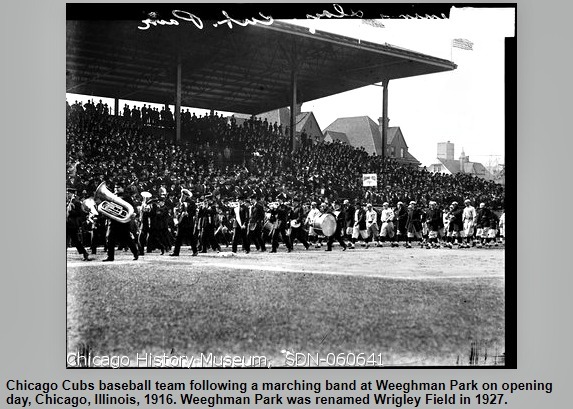 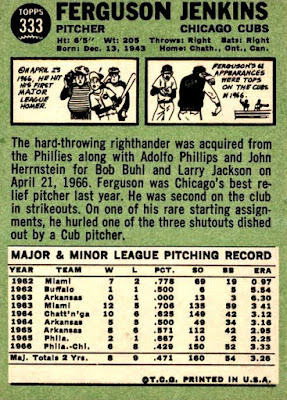 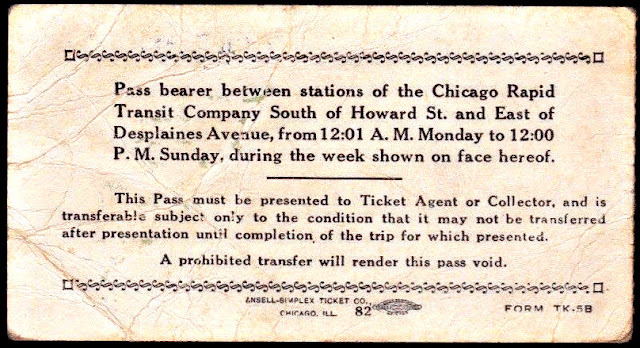 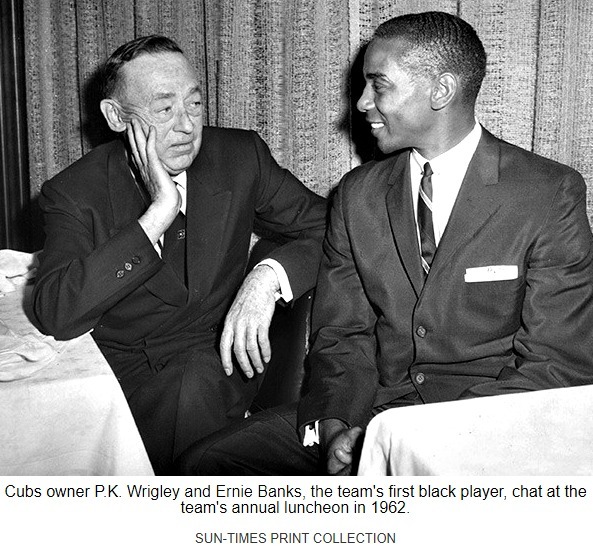 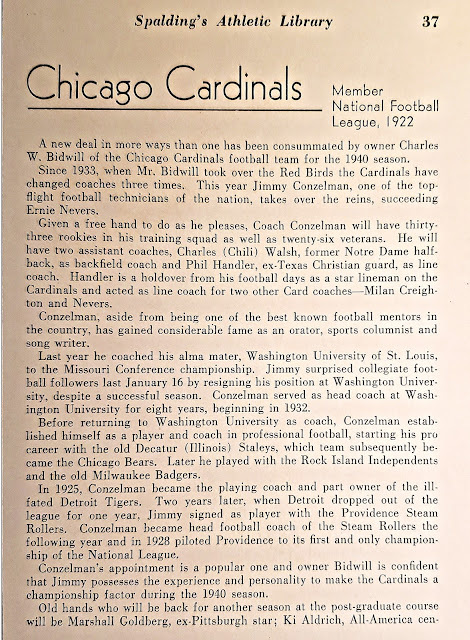 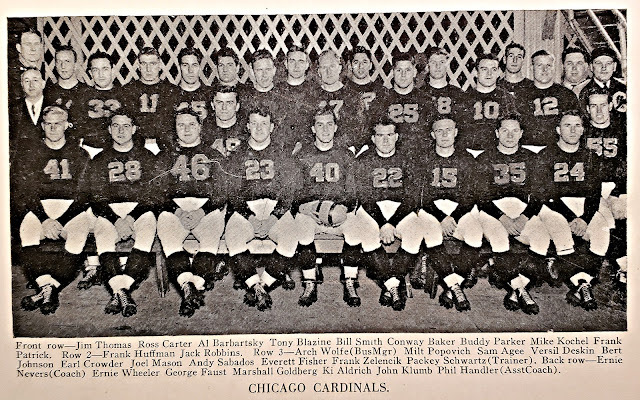 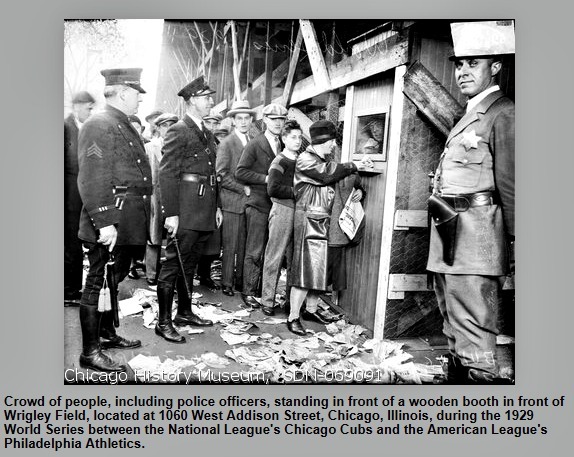 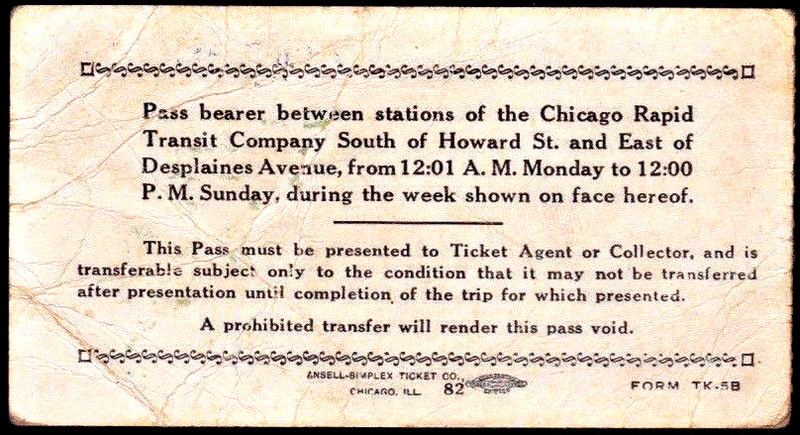 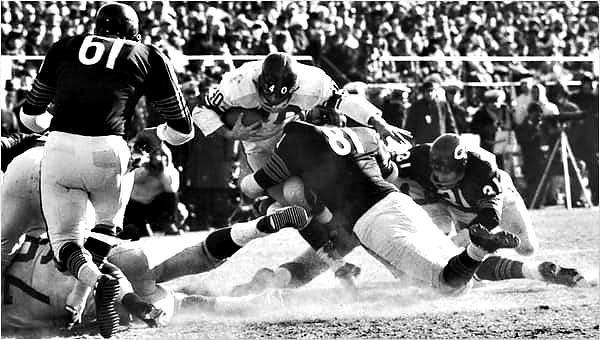 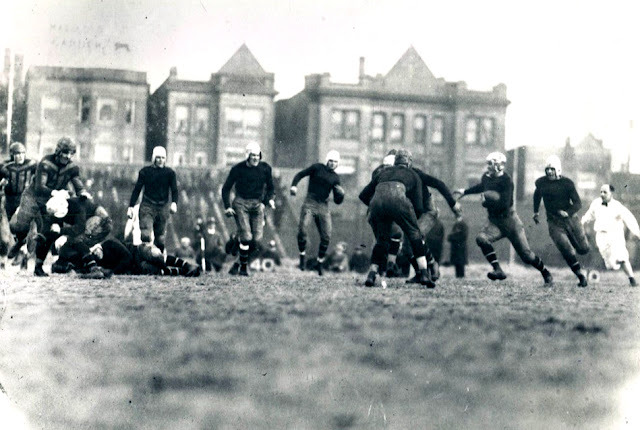 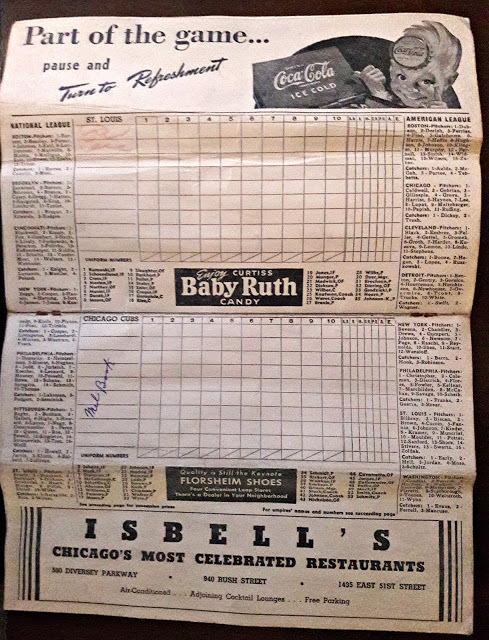 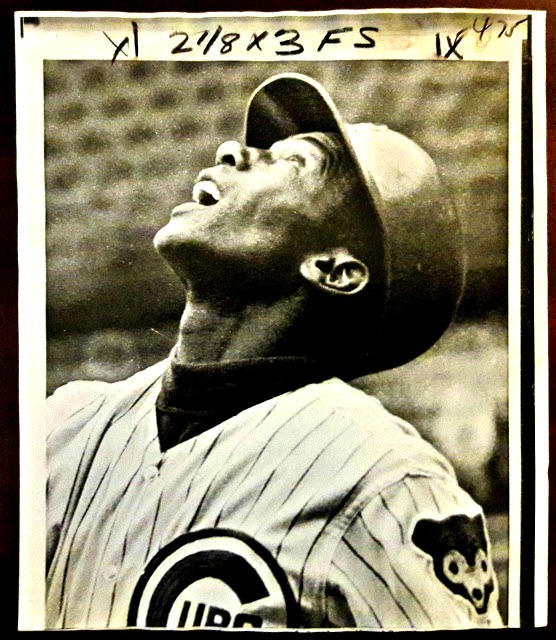 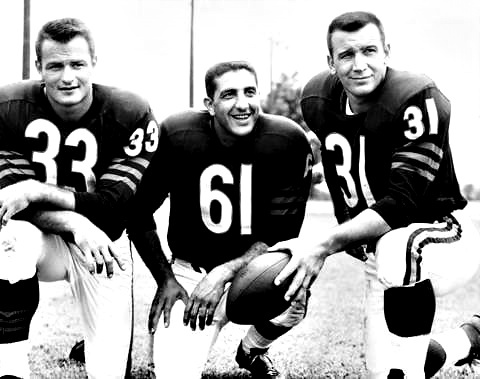 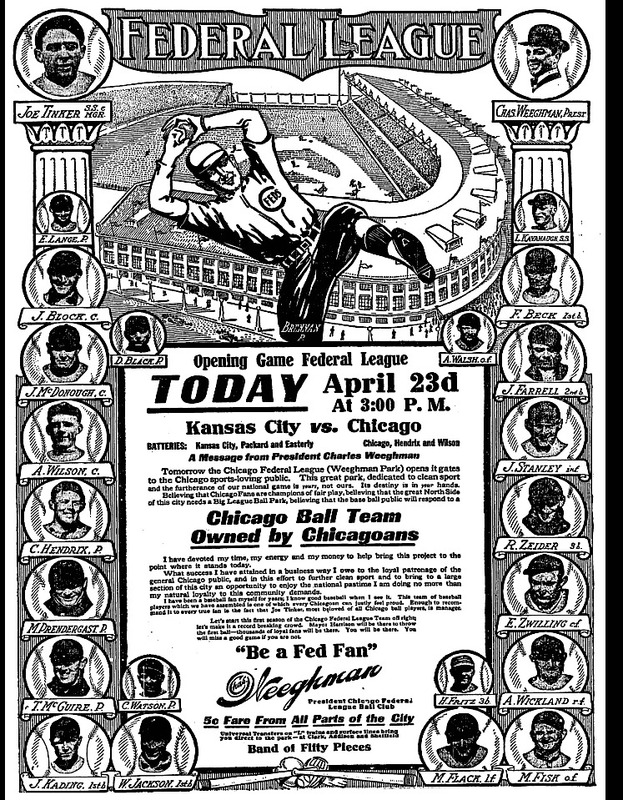 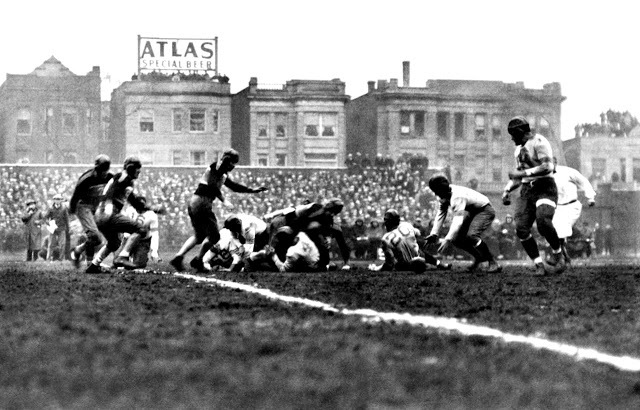 The owner of the Chicago Federals and the baseball park was a restaurant chain owner named Charles Weeghman. 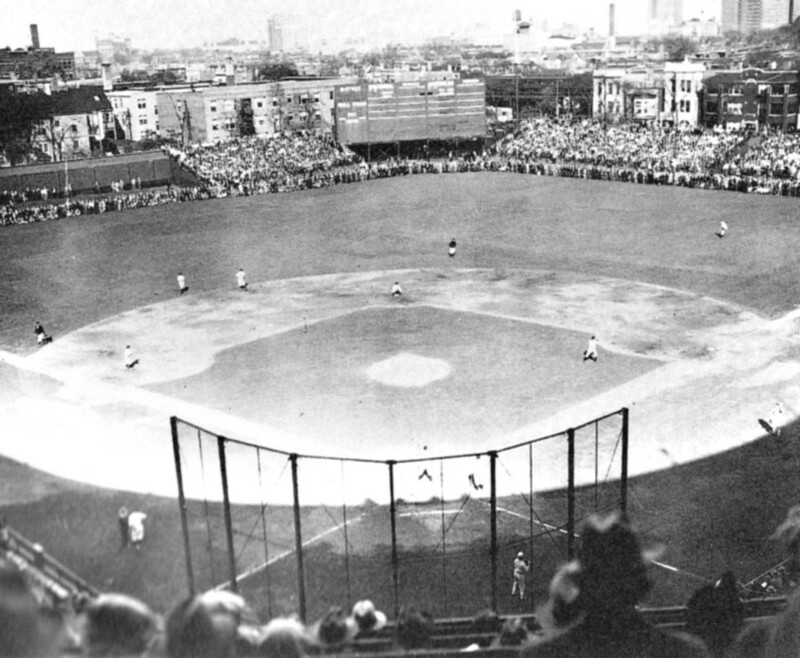 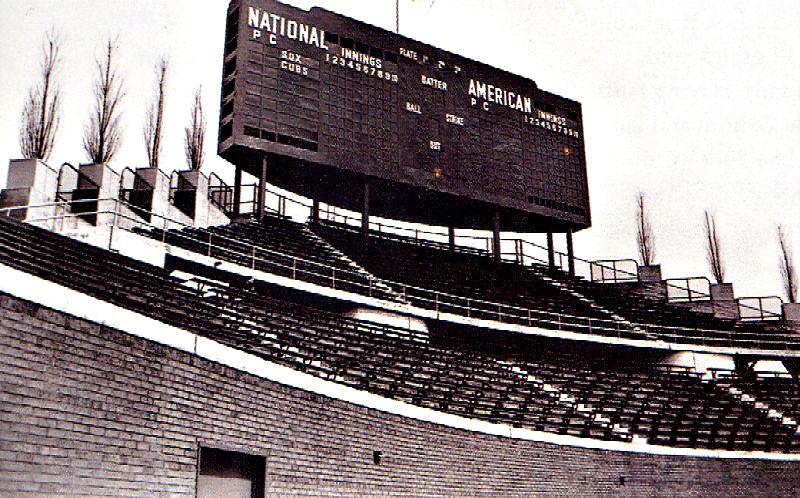 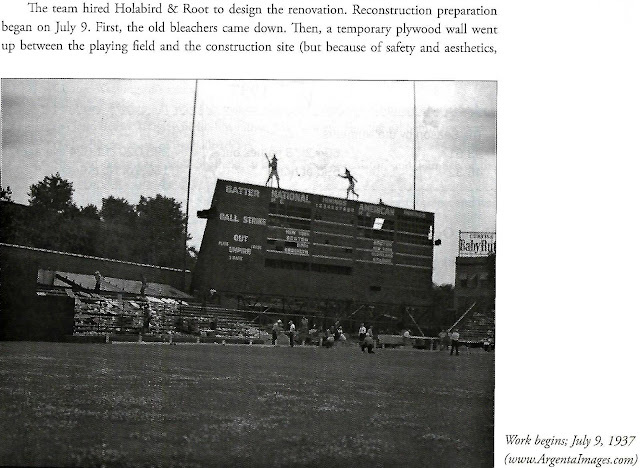 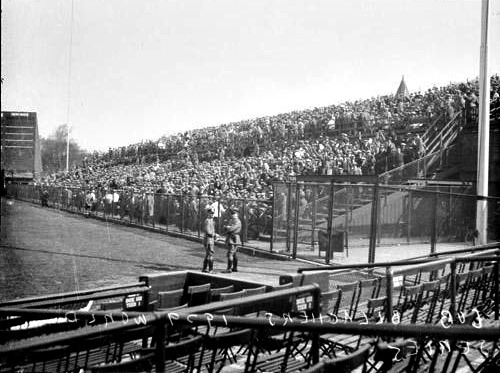 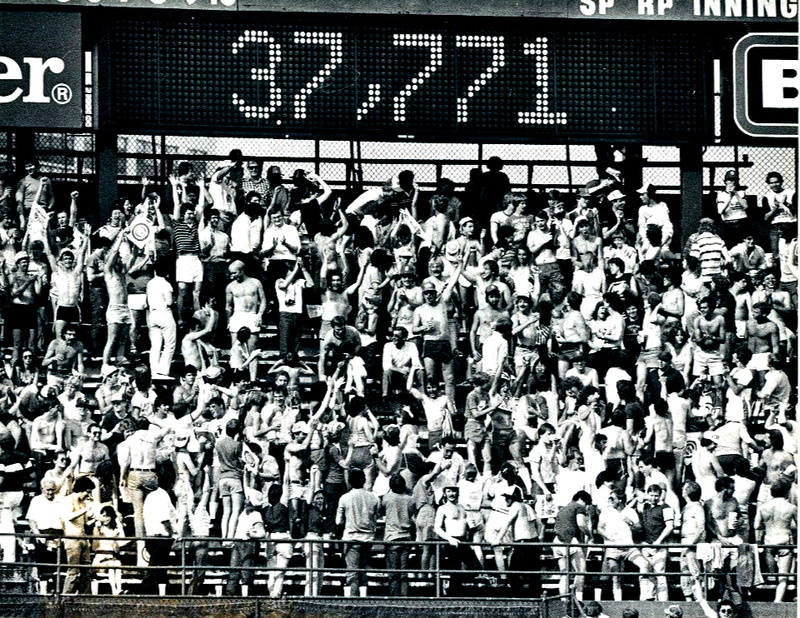 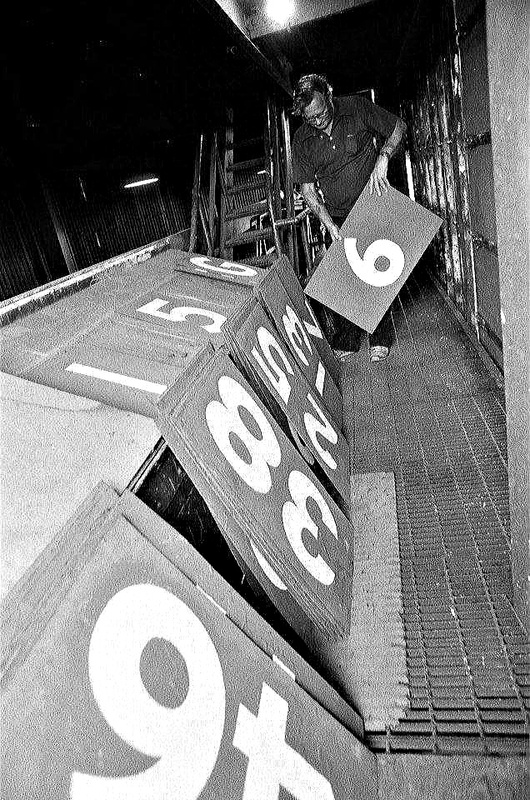 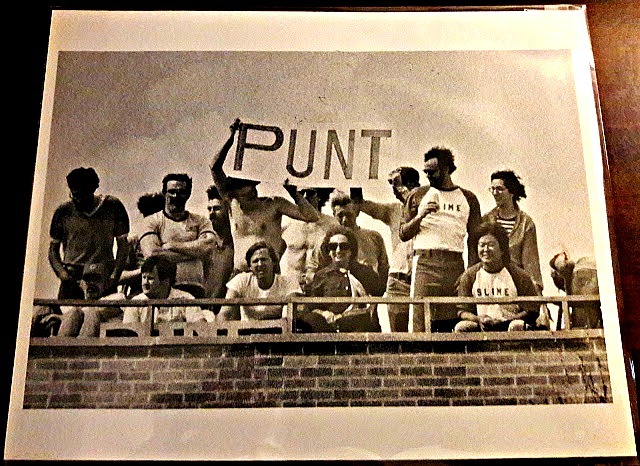 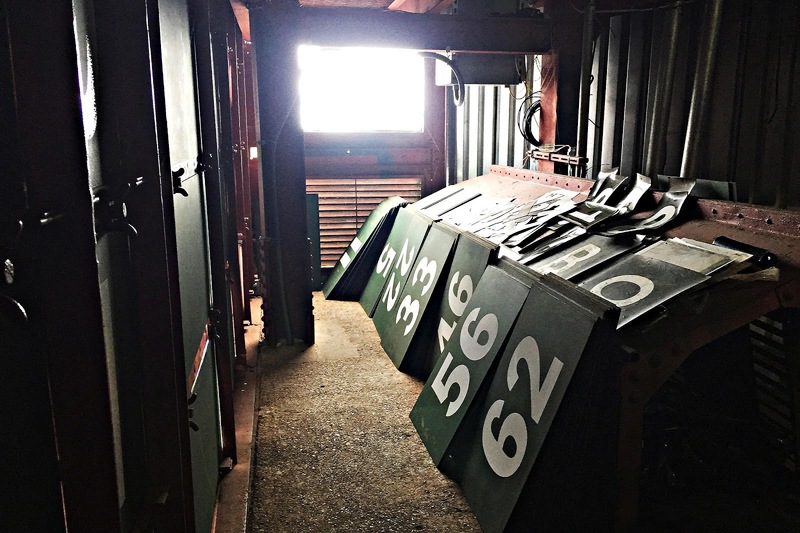 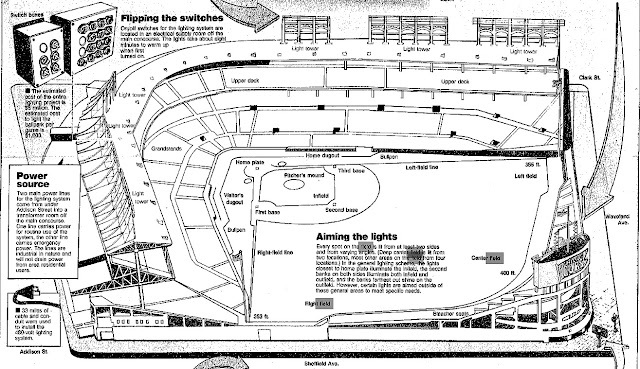 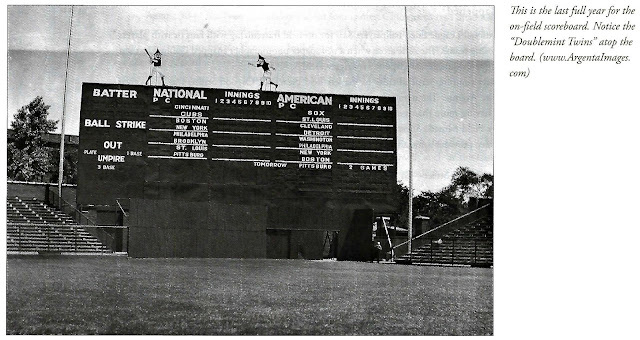 The initial plan was to make the baseball field stands of wood. 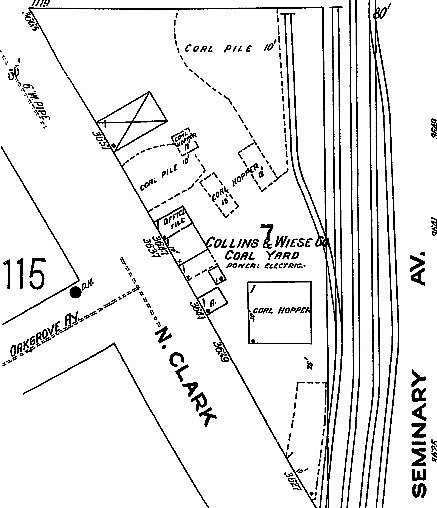 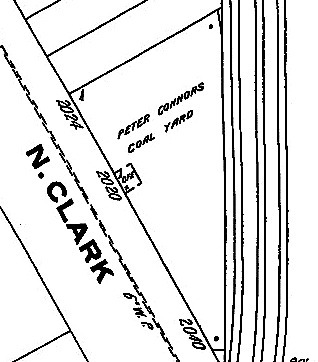 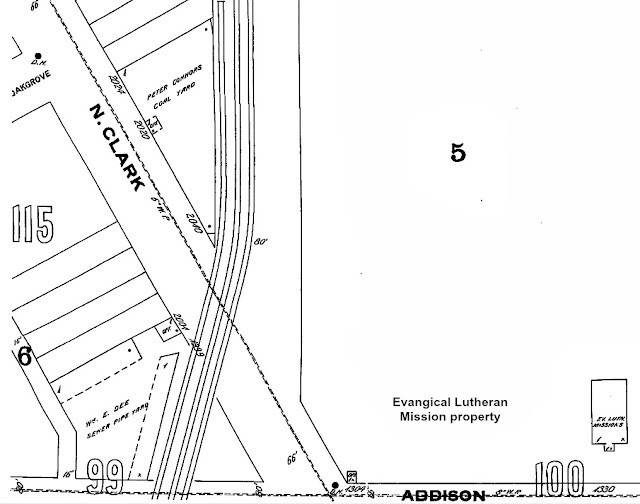 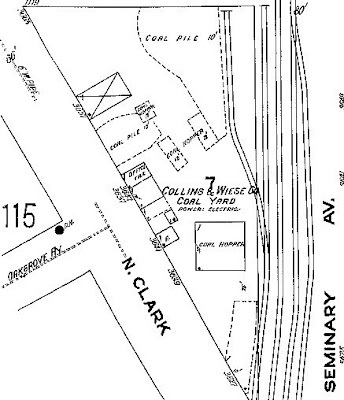 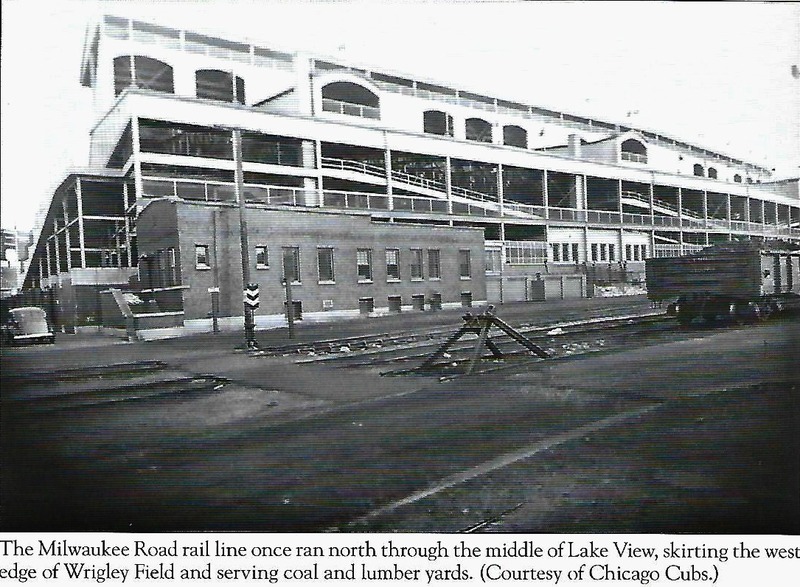 This may have worked in the olden days of the City/Township of Lake View but after the annexation of 1889, hence the Great Chicago Fire of 1871 wood as a building material for construction was out and brick & steel were in. 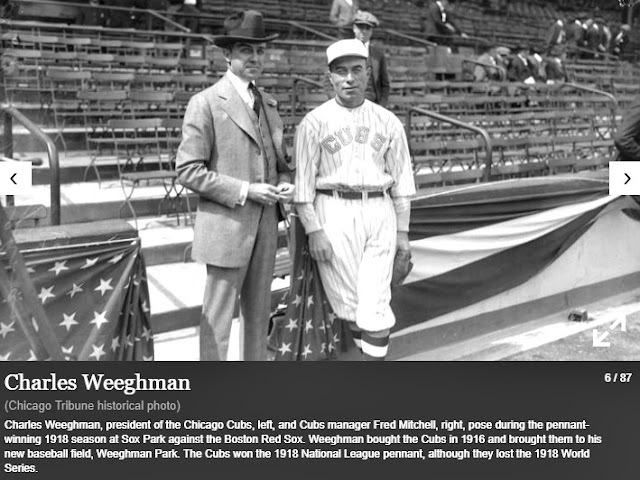 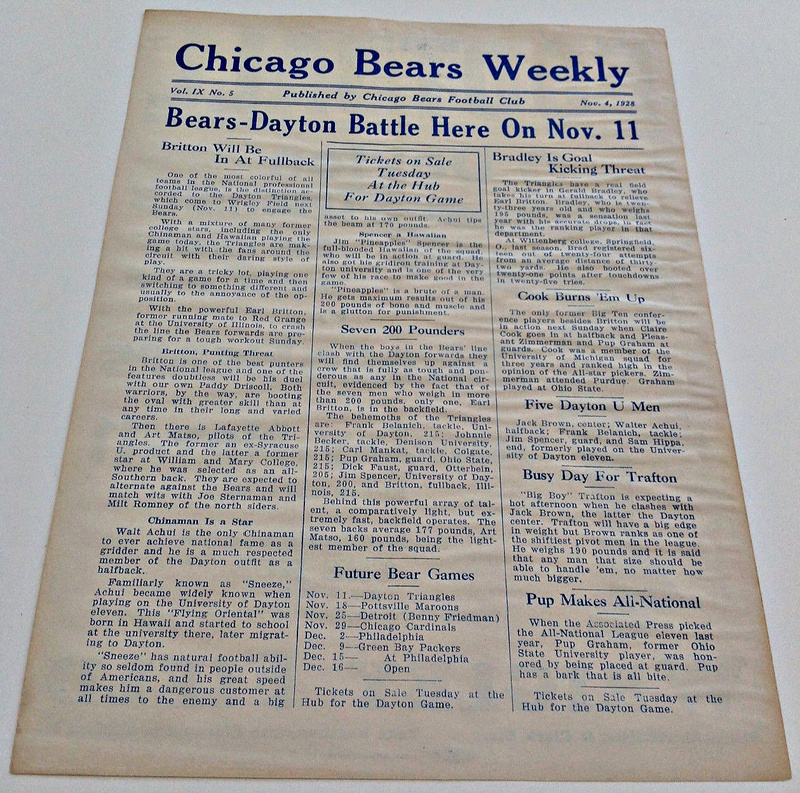 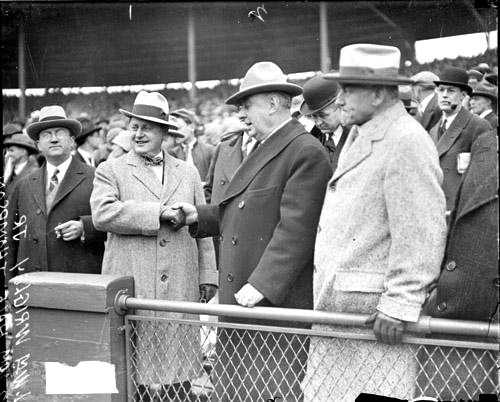 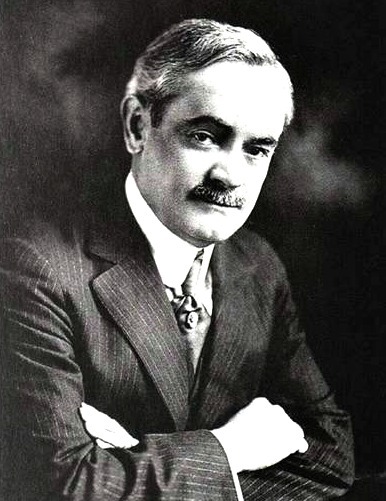 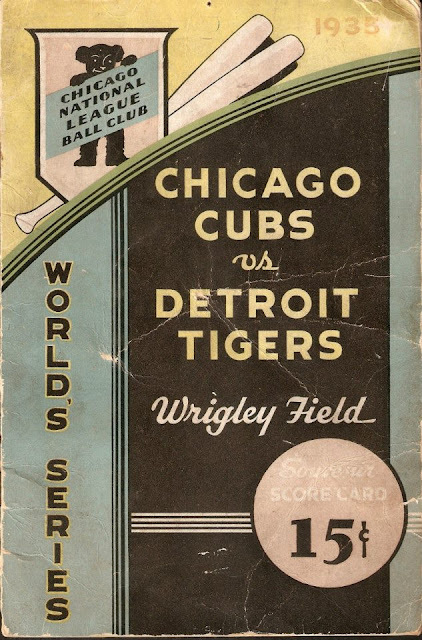 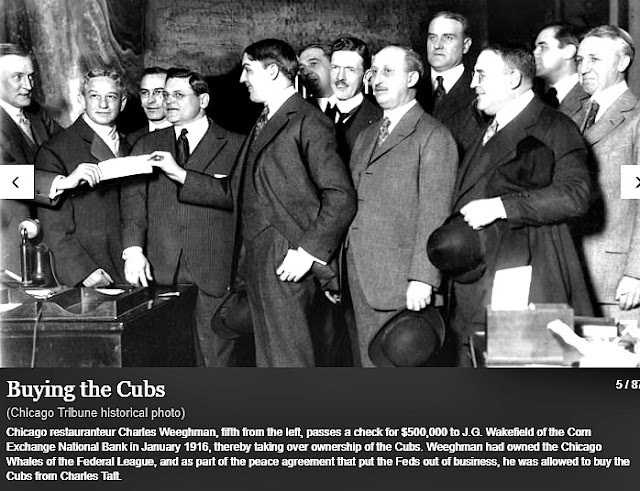 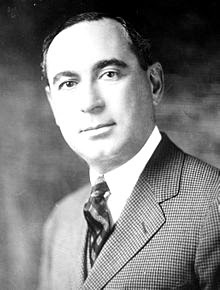 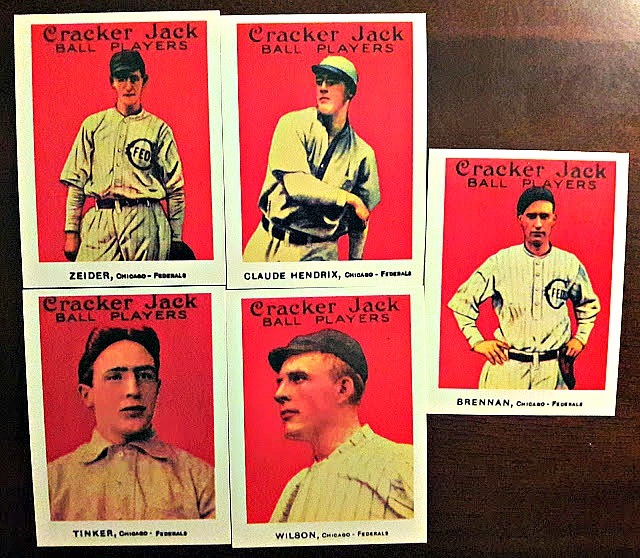 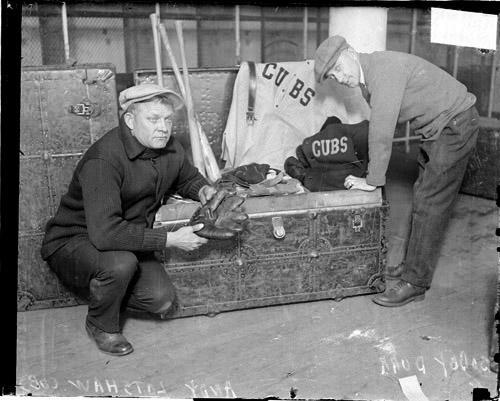 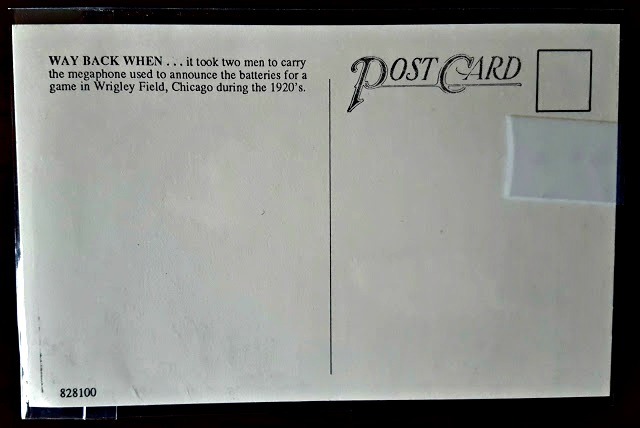 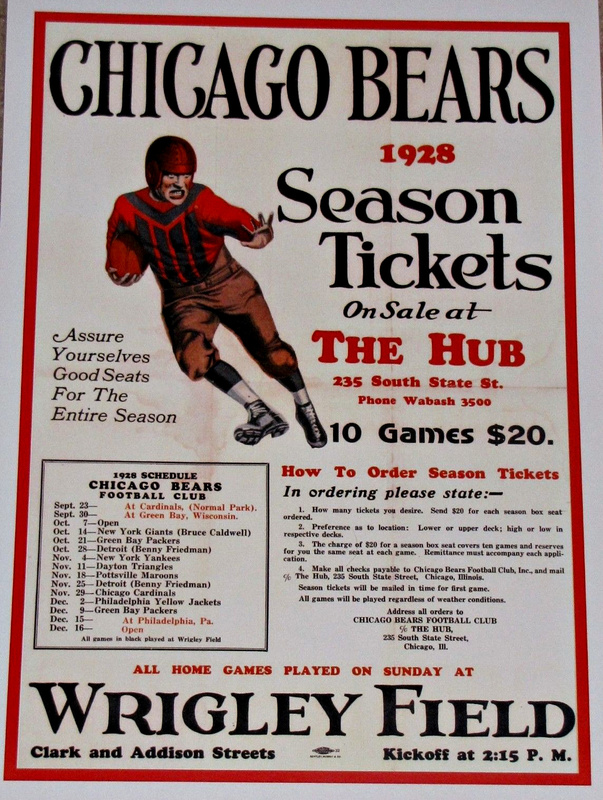 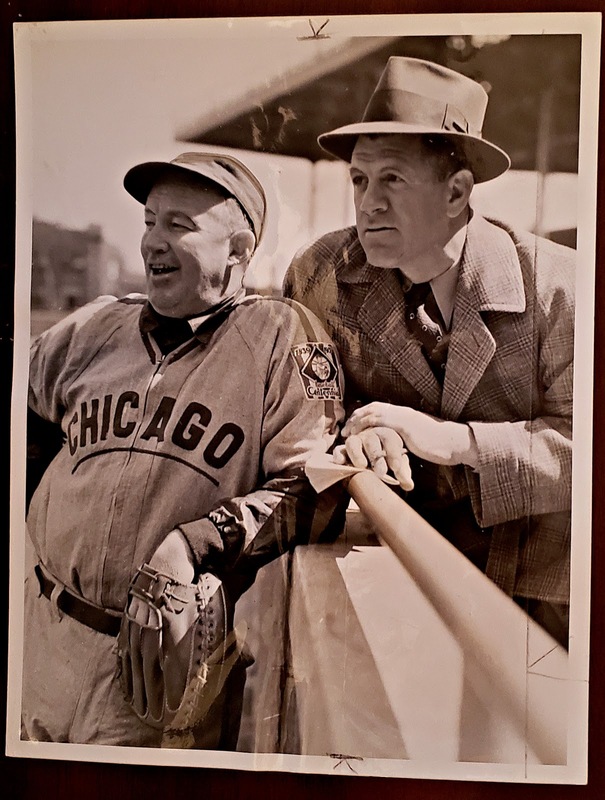 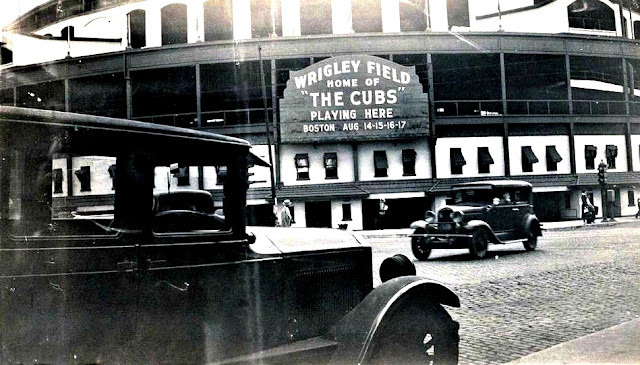 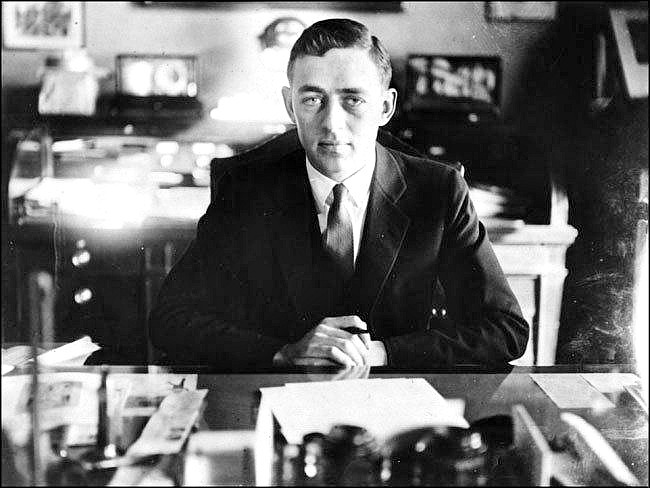 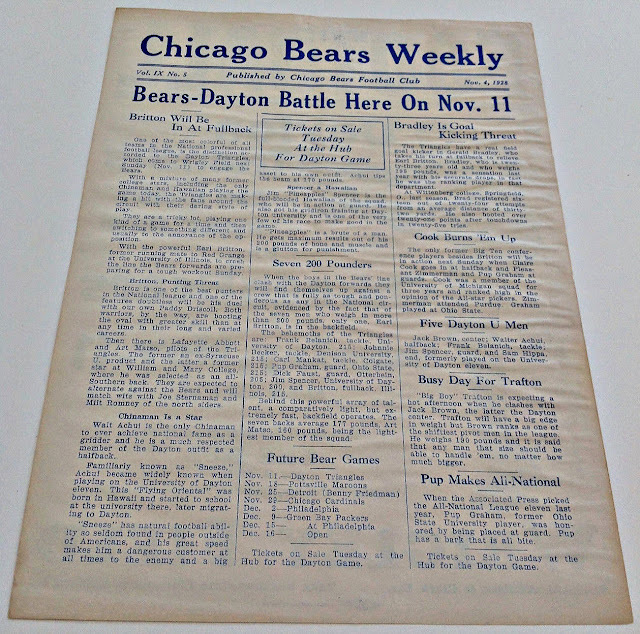 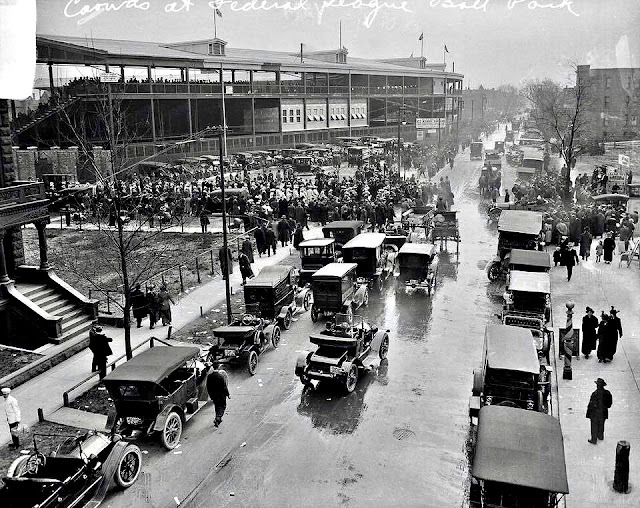 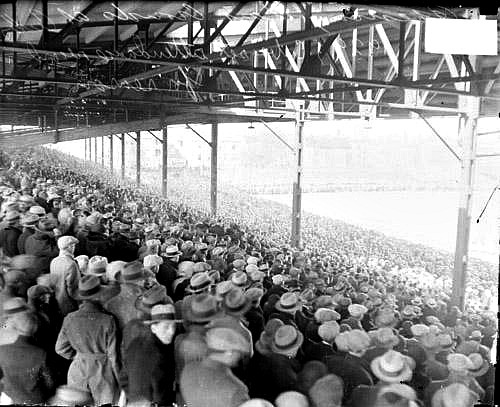 Good fortunes would soon lead to the poor economic times of the recession of 1918 which weakened the fortune of Charles Weegham and his financial hold on both ownership of the baseball park and the Chicago Cubs. 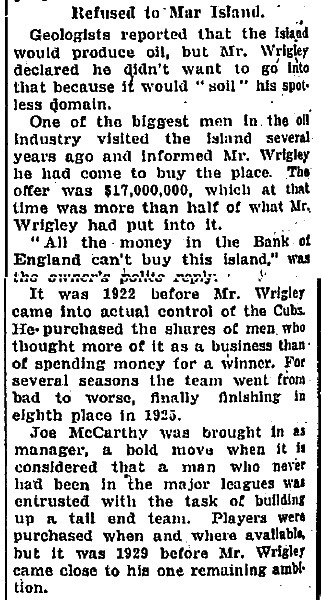 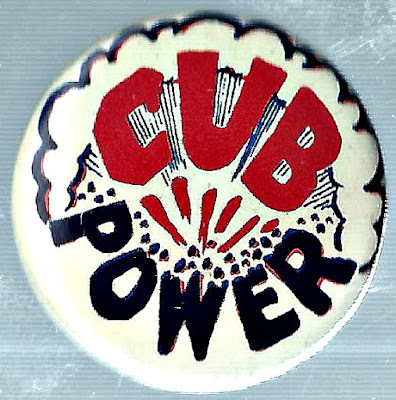 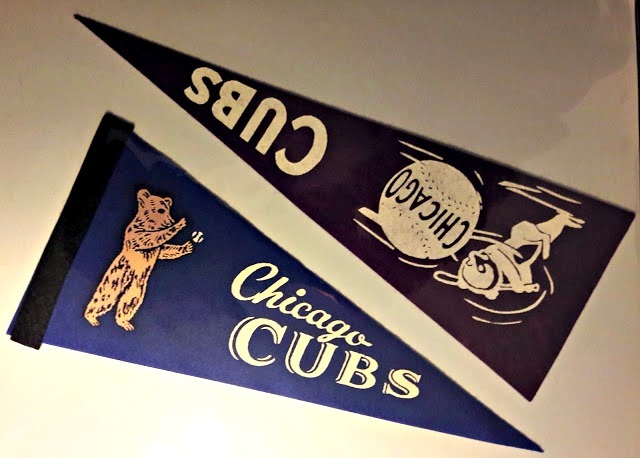 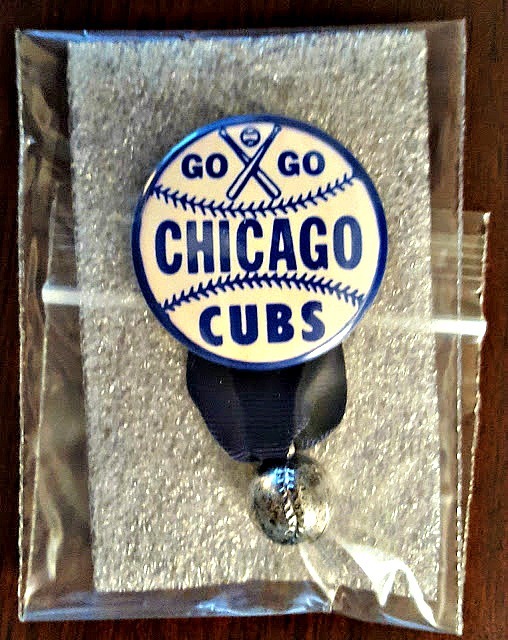 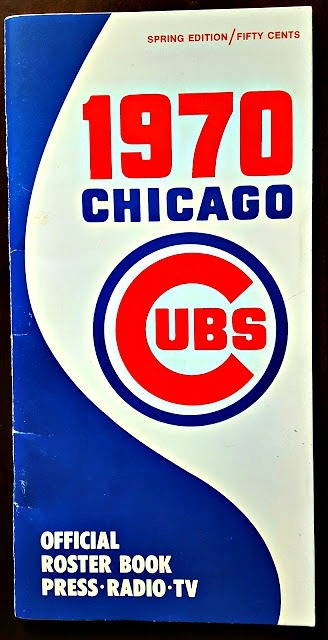 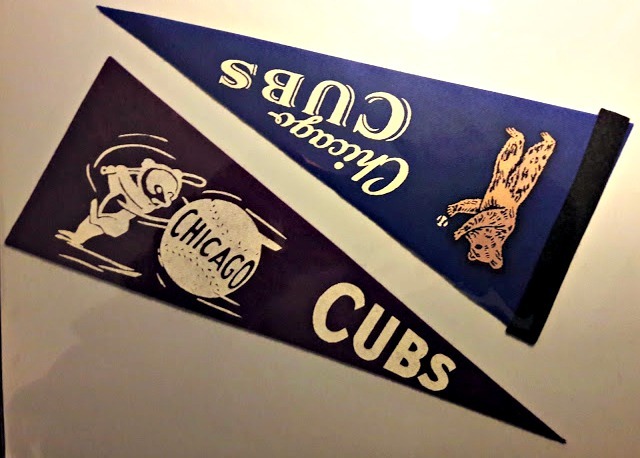 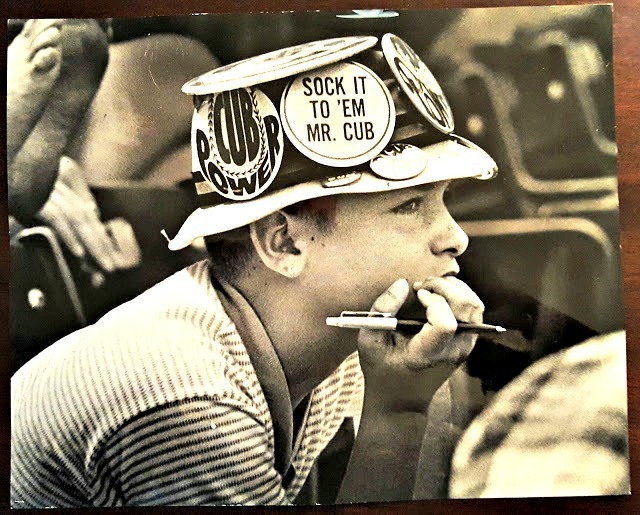 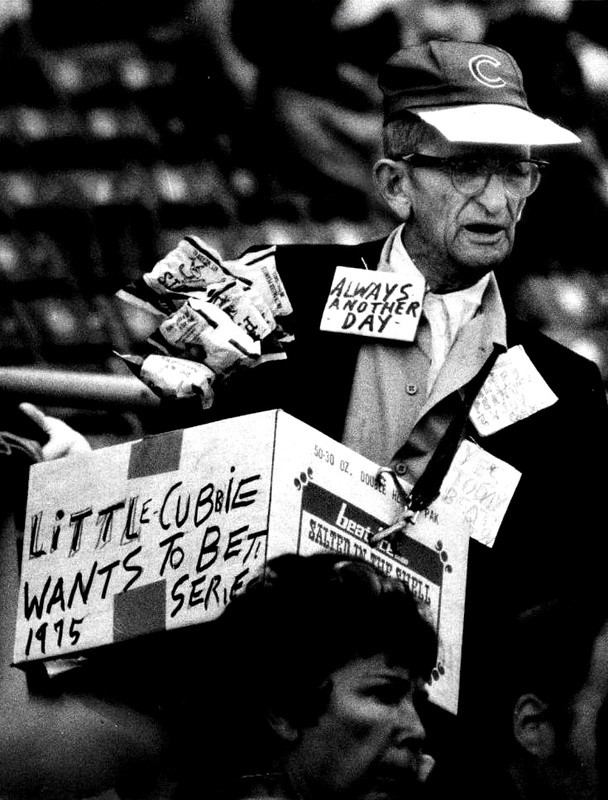 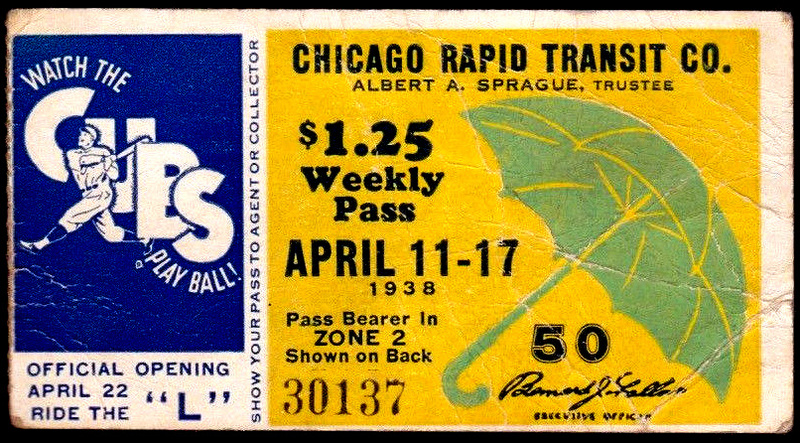 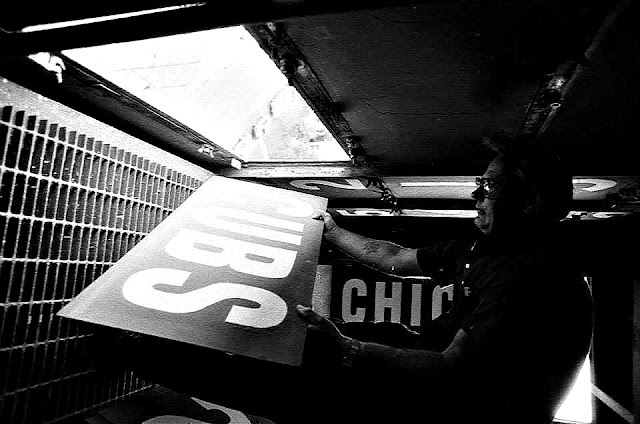 The previous owner of the Cubs was a penny-pincher named Charles Murphy who refused to follow the innovations the National League demanded from their teams and made lots of money from the popular Cubs. 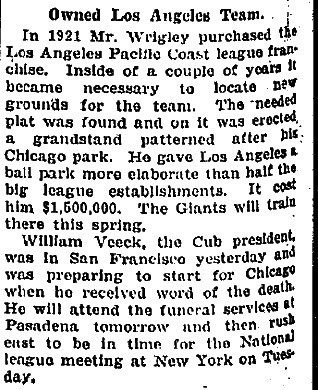 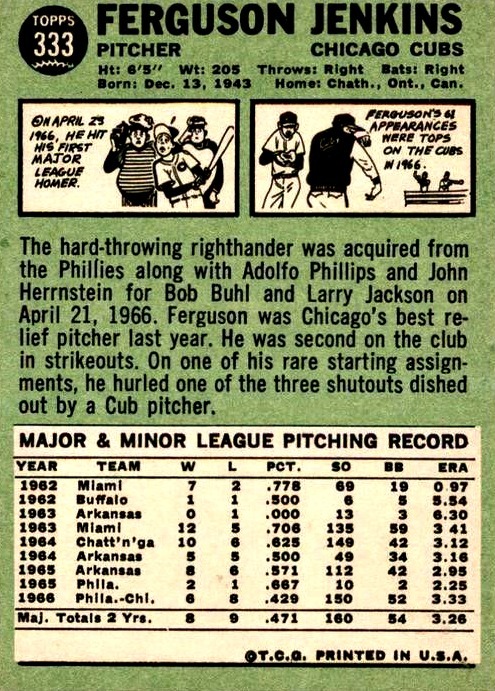 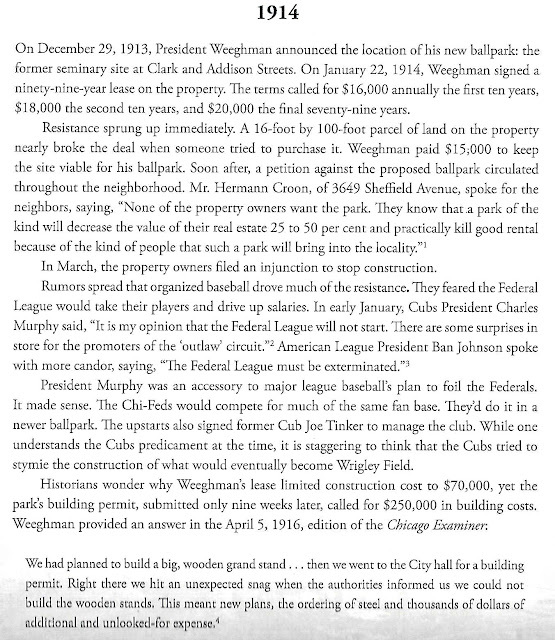 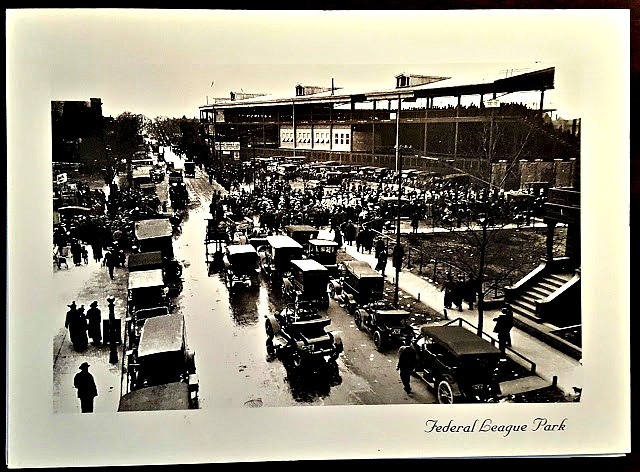 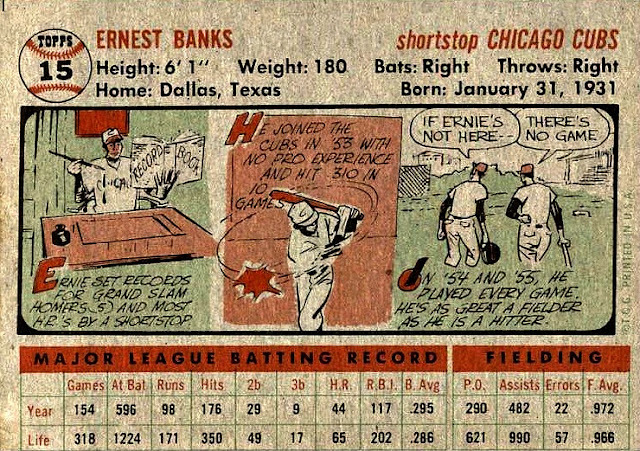 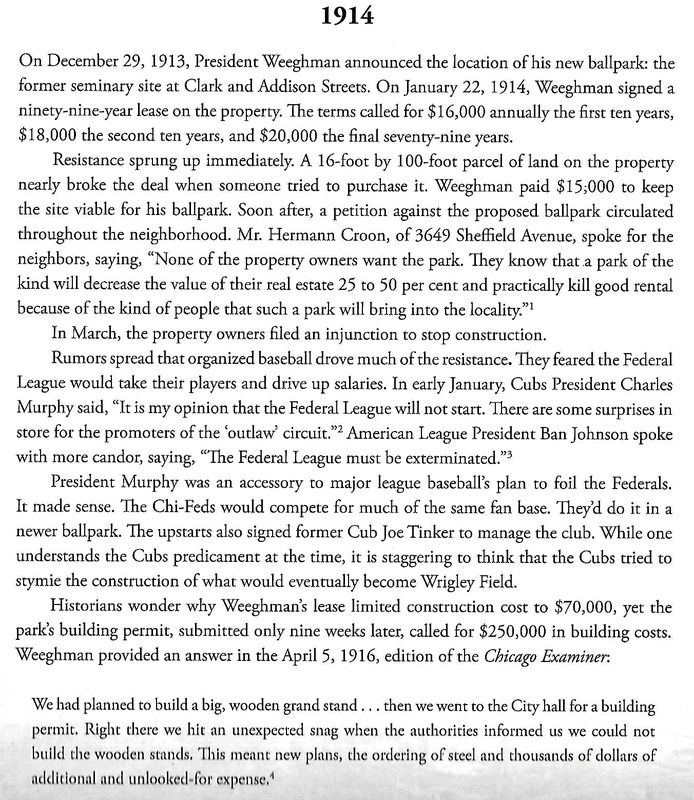 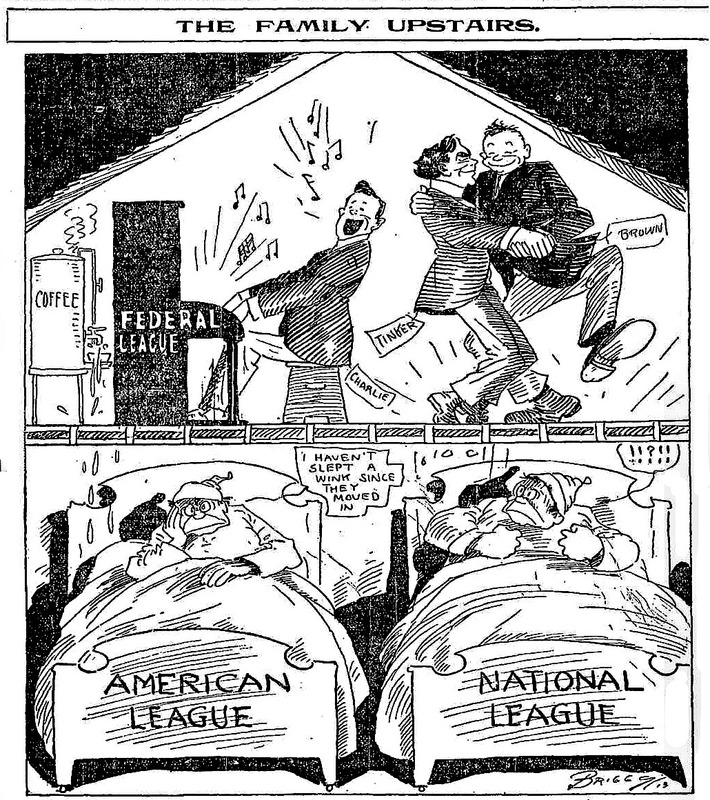 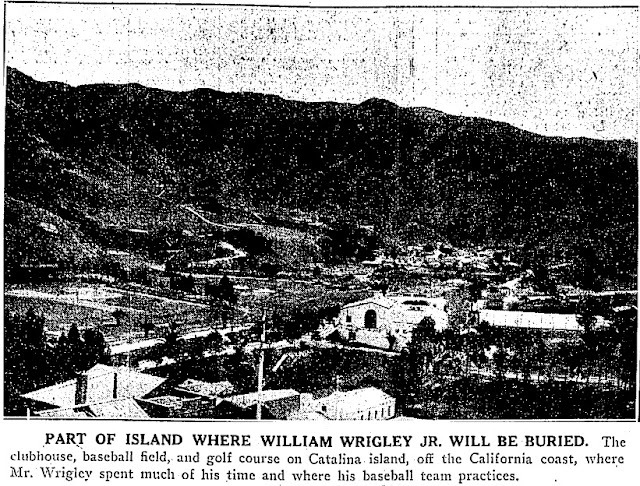 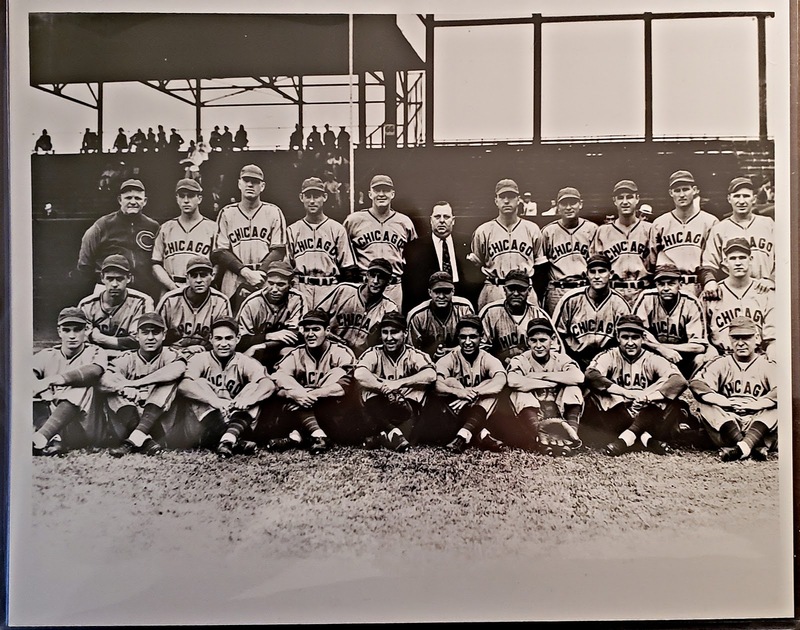 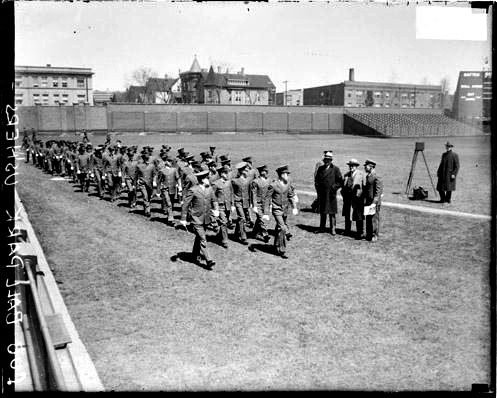 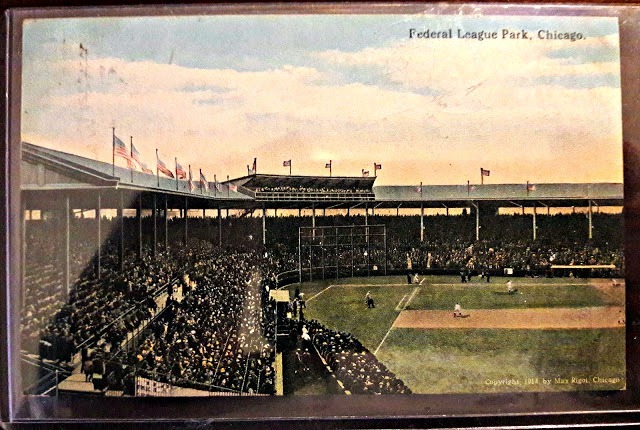 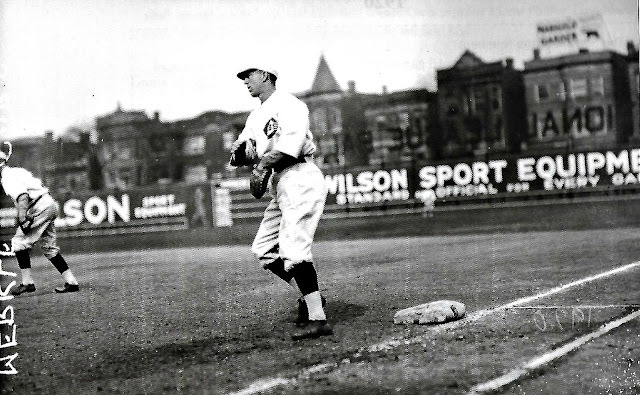 Slowly and surely some of the Cub players left the National League to Weegham's Federals, the Federal League and his brand new baseball park. 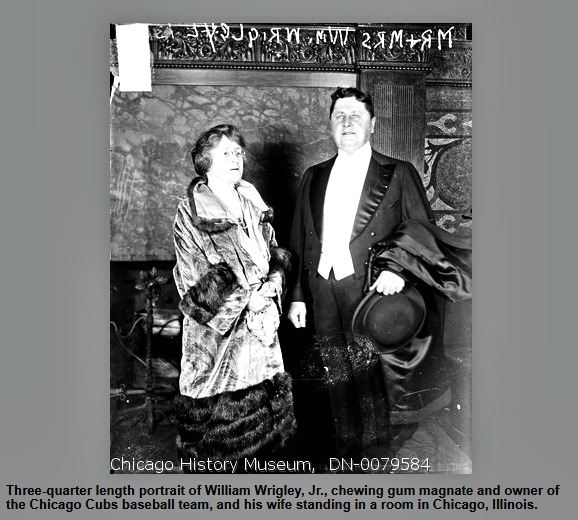 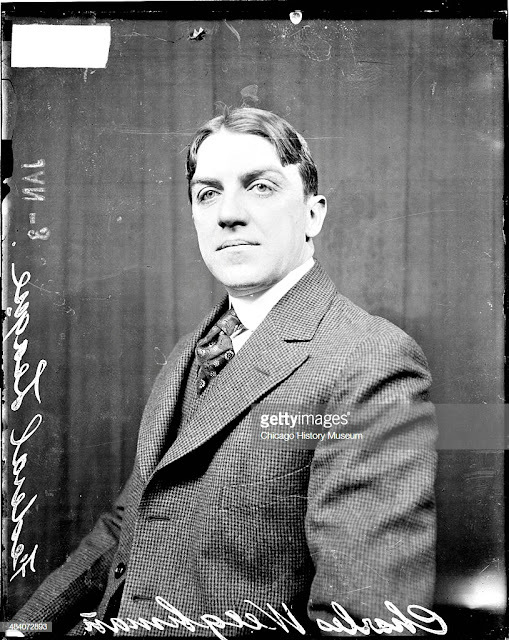 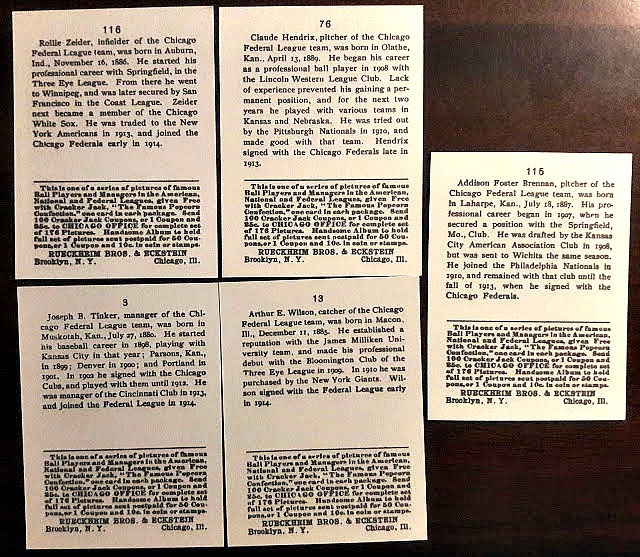 ‘One of the most controversial figures of the ‘Deadball Era’, Charles W. Murphy owned the Chicago Cubs from 1906 to 1913, the period during which they reached their greatest heights. 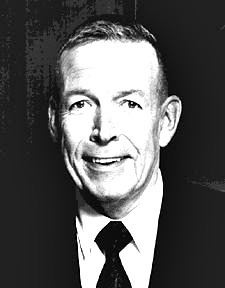 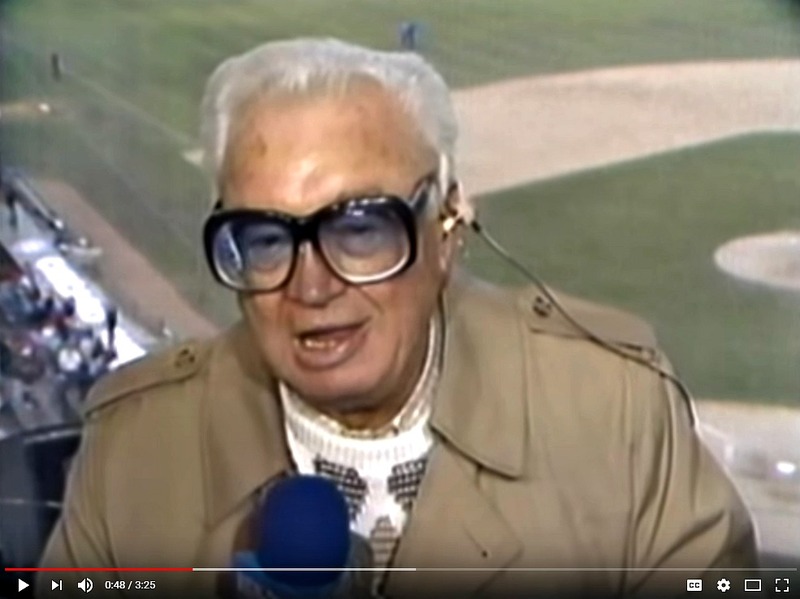 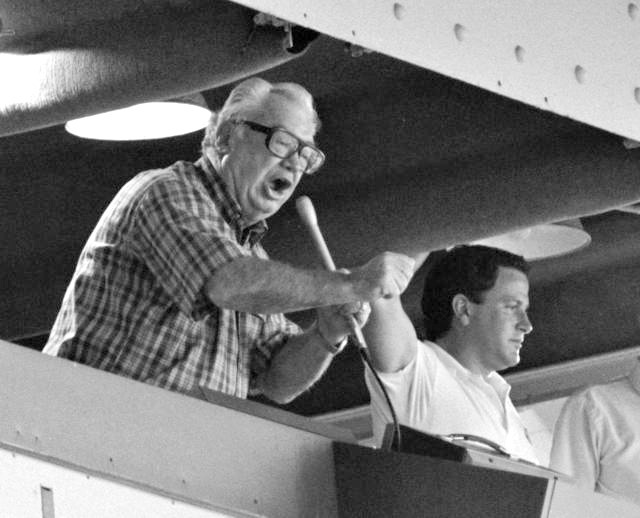 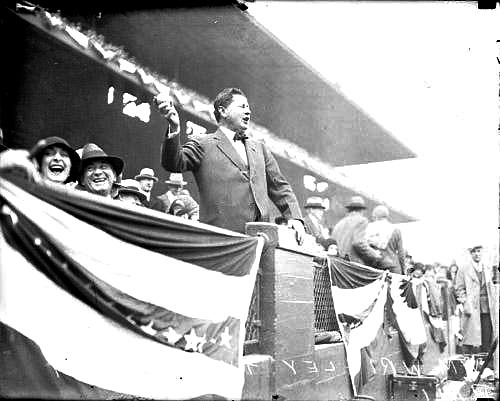 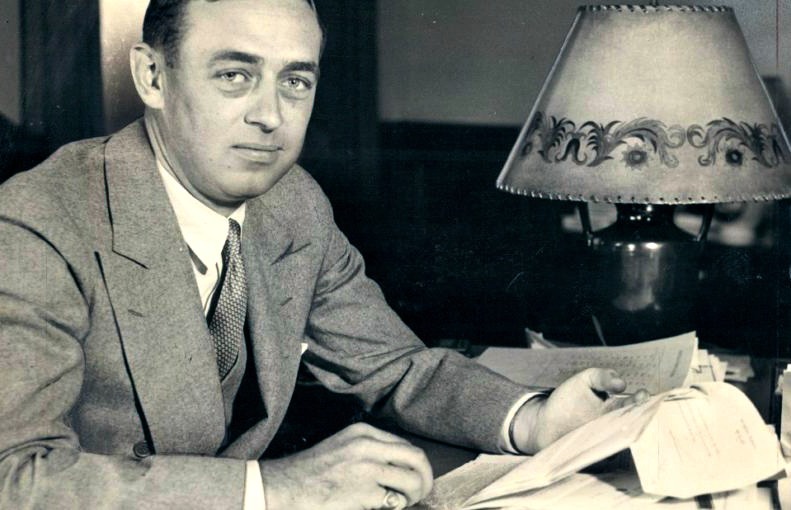 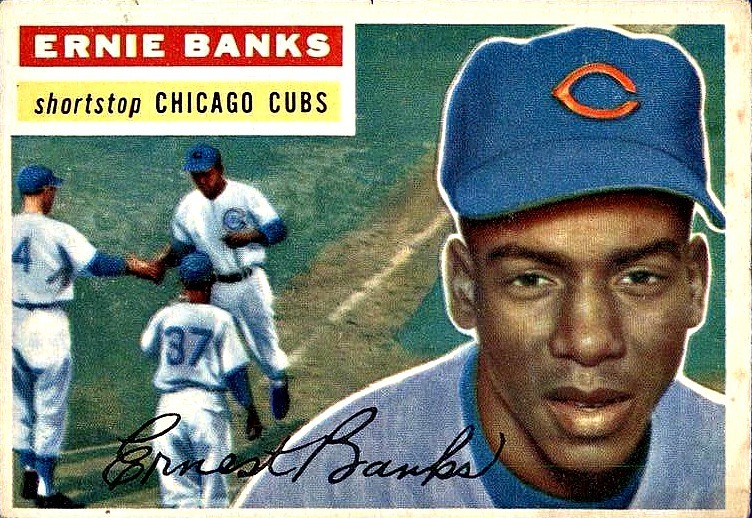 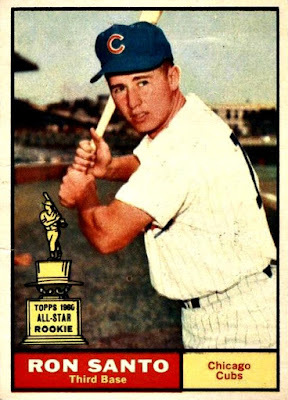 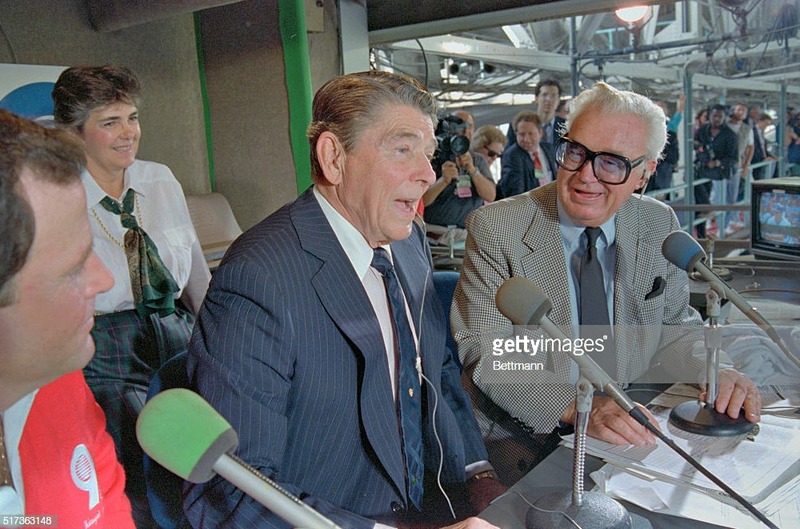 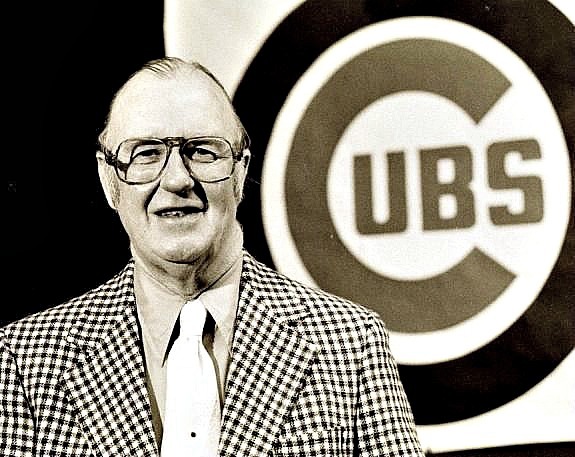 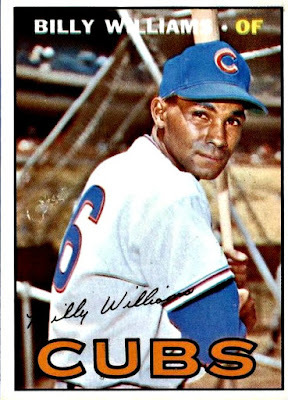 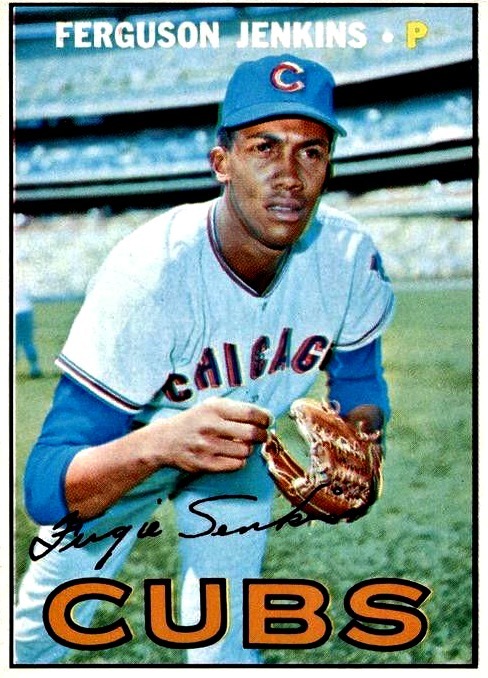 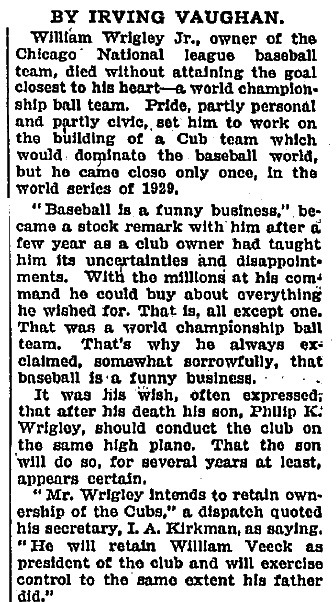 The Cubs won four National League pennants and two World's Championships under his ownership, making Chicago the center of the baseball universe. 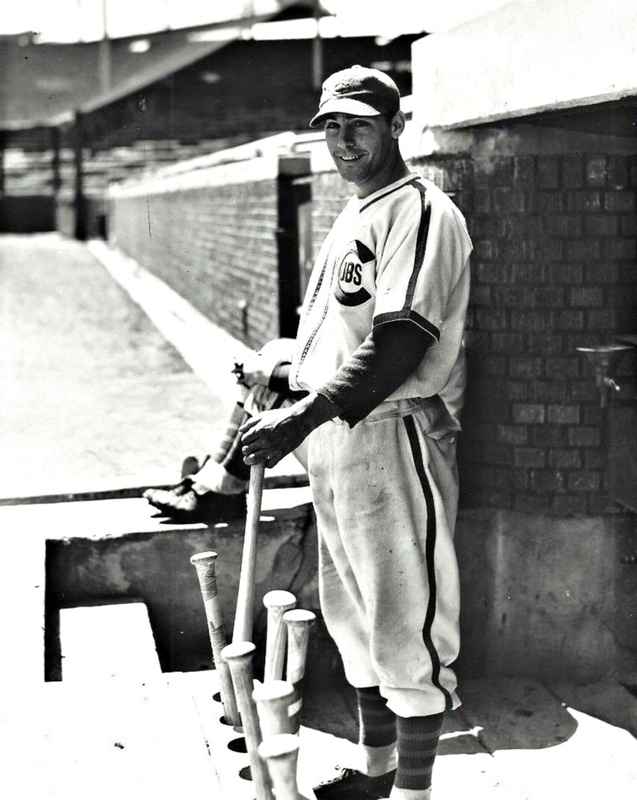 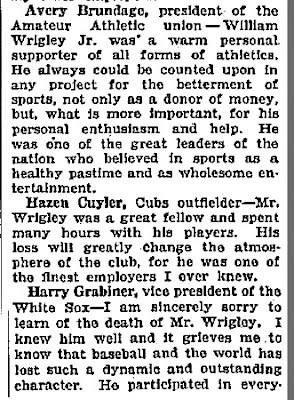 But instead of being revered by the fans, his players, and his fellow owners, the ambitious, energetic Murphy was generally despised’ according to Society of American Baseball Research. 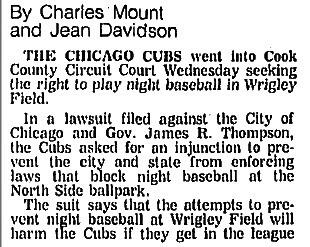 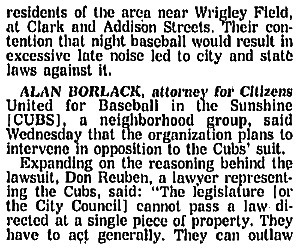 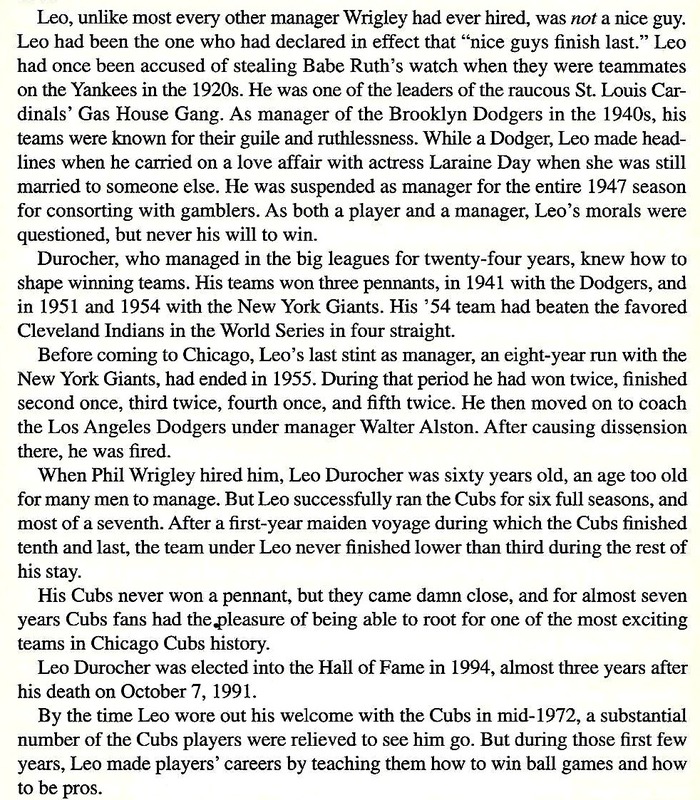 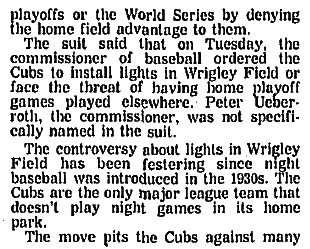 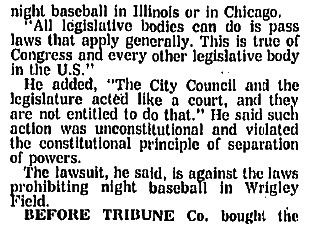 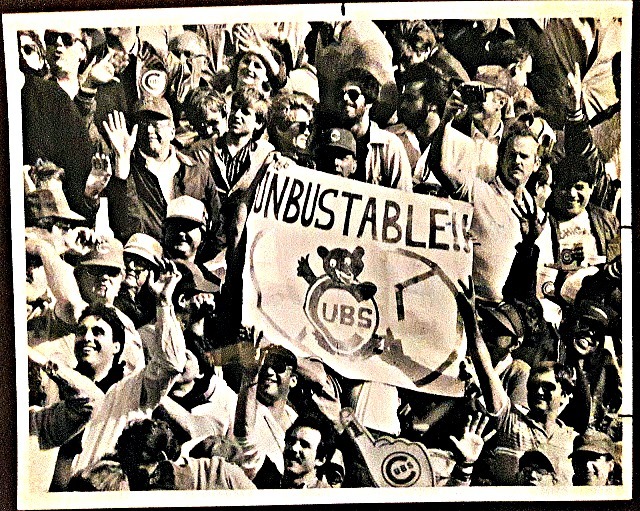 In an essence the Chicago Cubs suffered financial from both owners; one from personal greed and the other from poor economic circumstances. 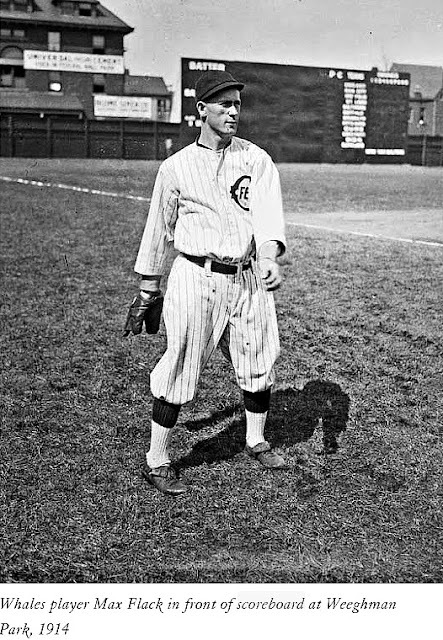 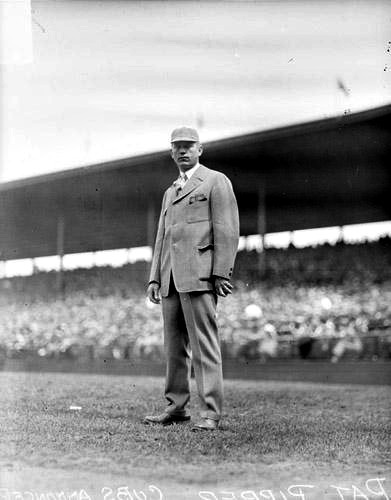 Charles Taft owned the Chicago Cubs after Murphy from 1914-1916. 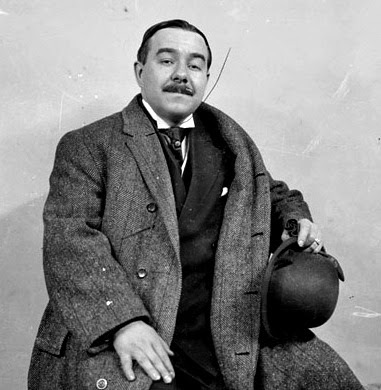 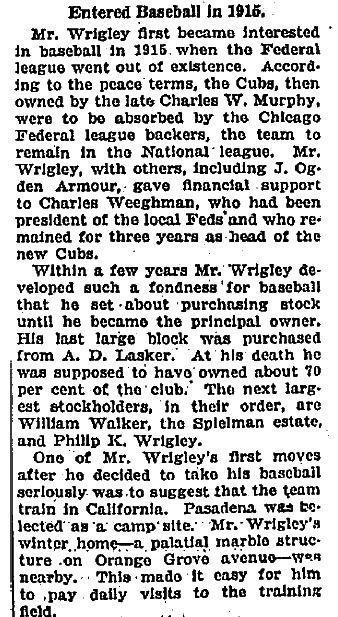 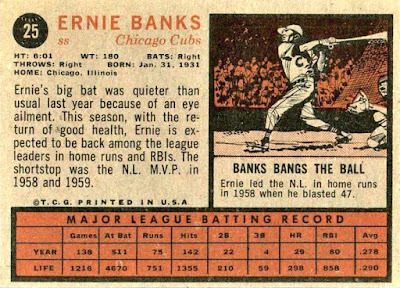 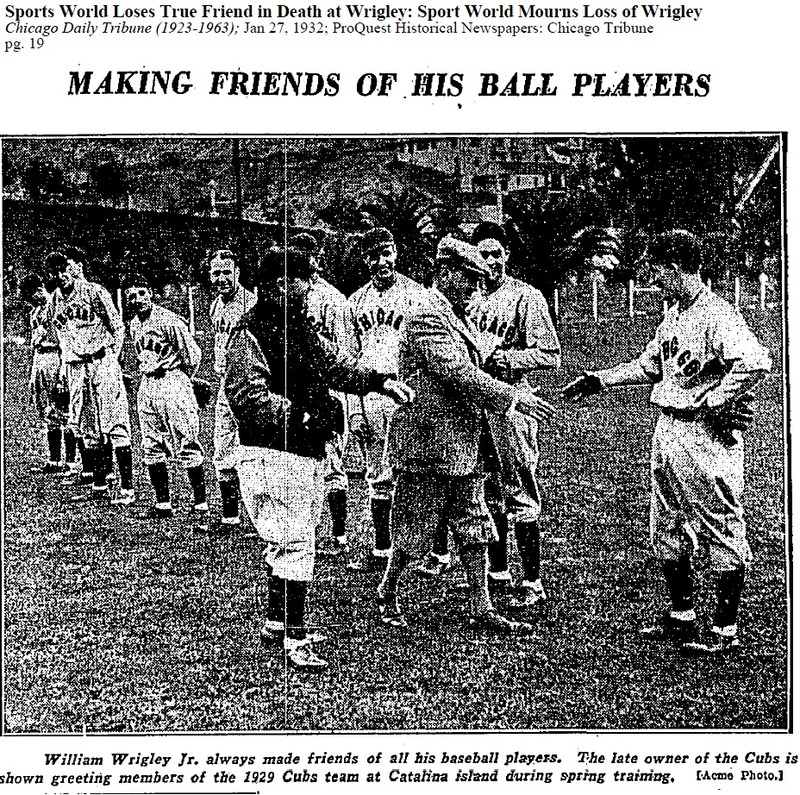 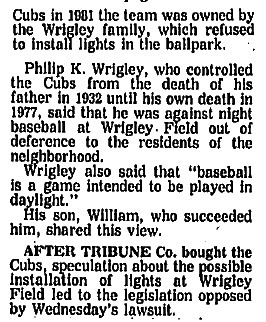 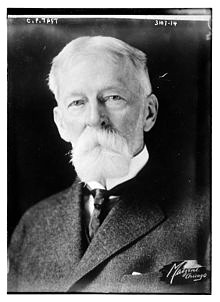 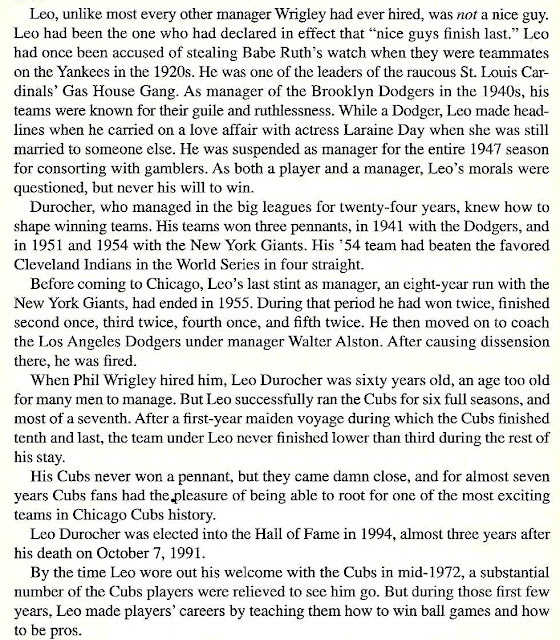 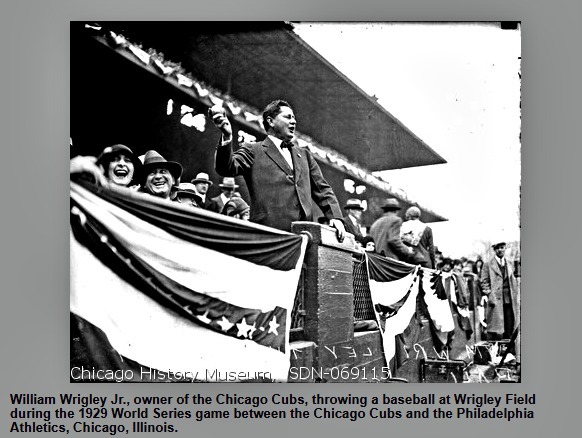 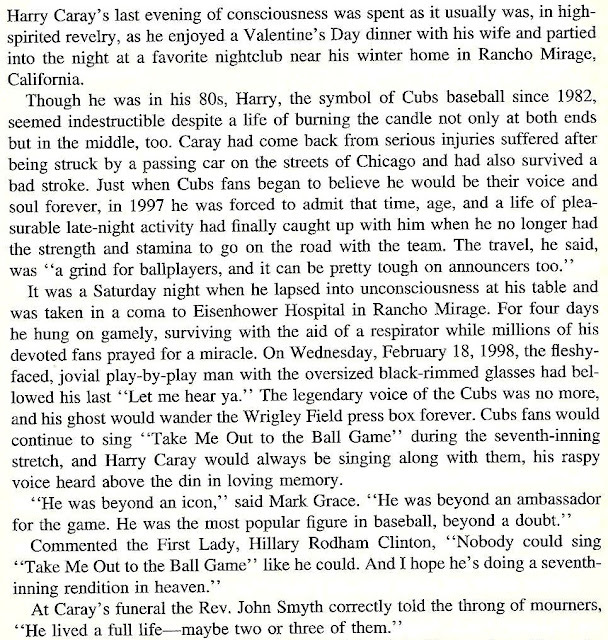 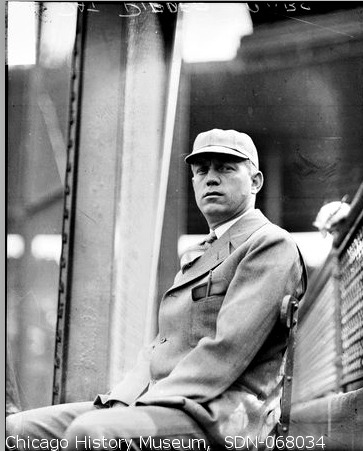 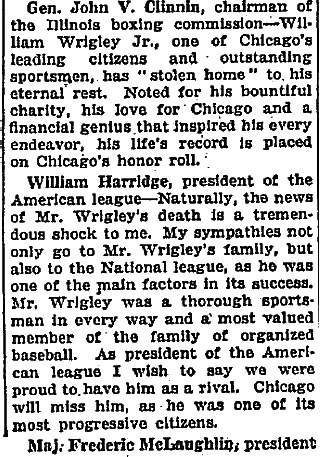 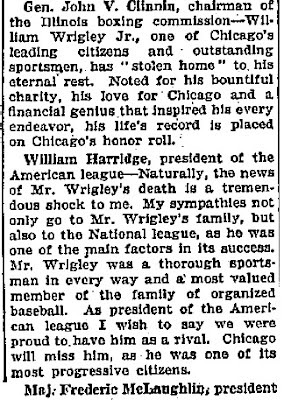 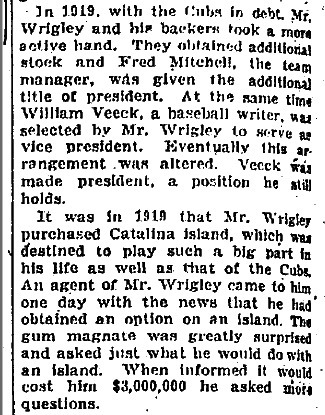 He sold the Cubs to Weegham in 1916. 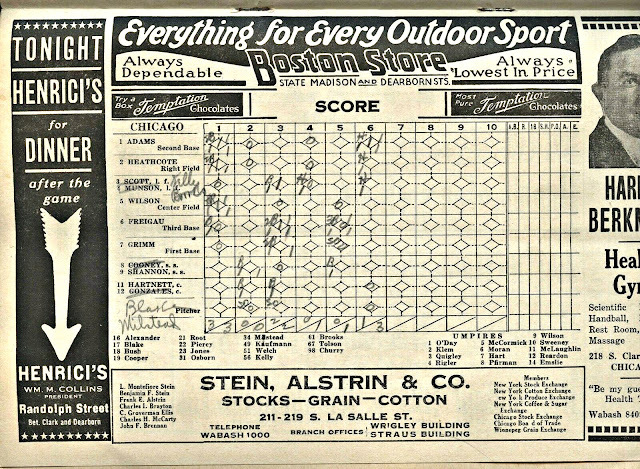 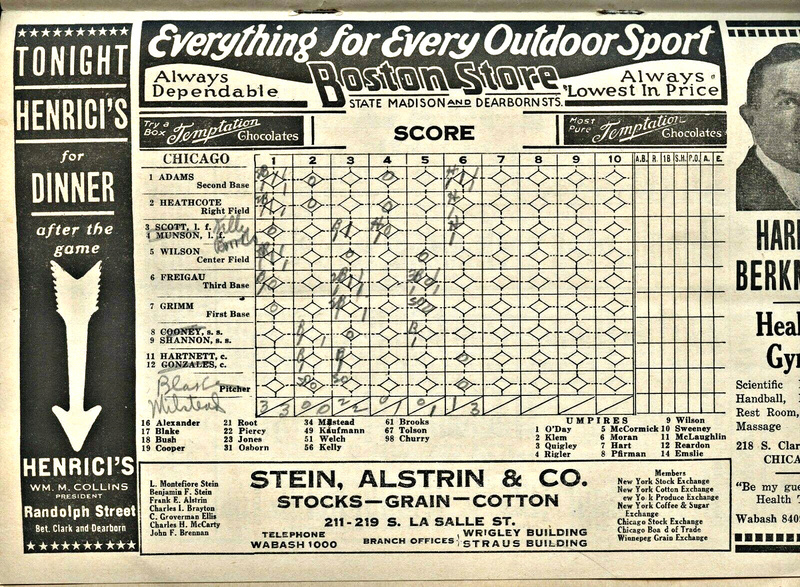 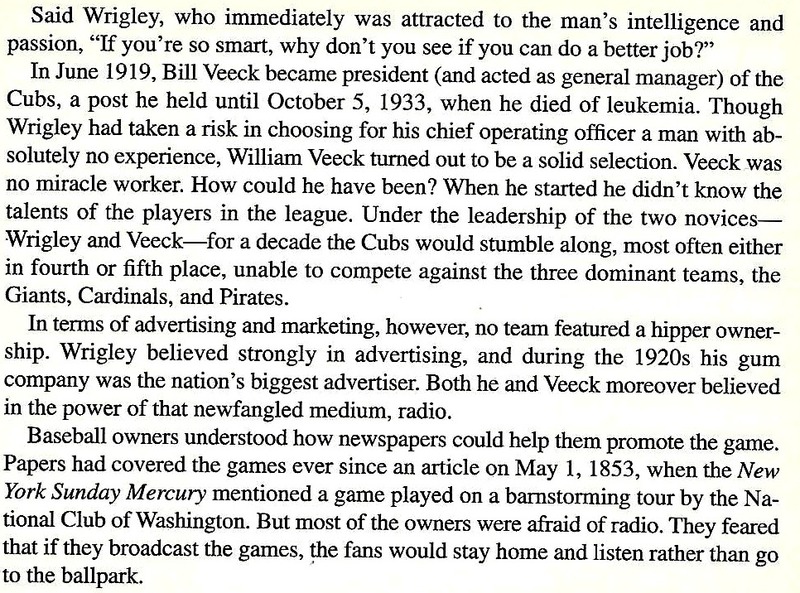 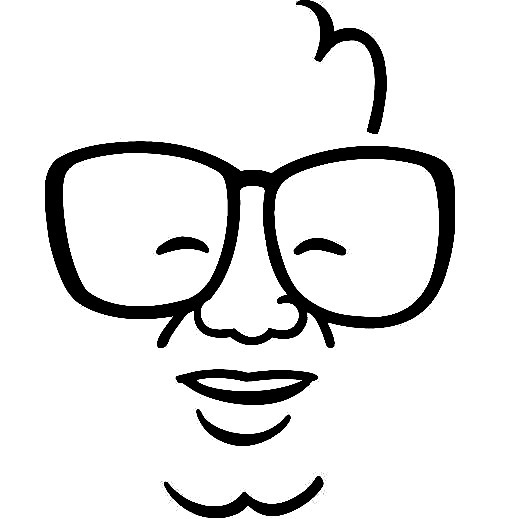 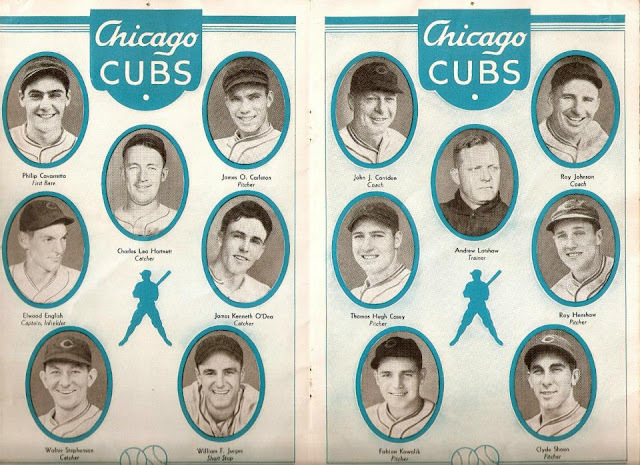 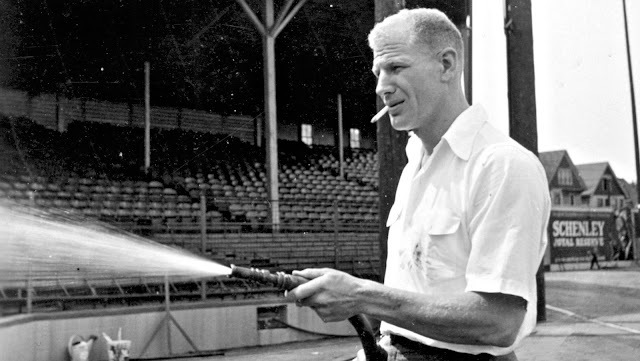 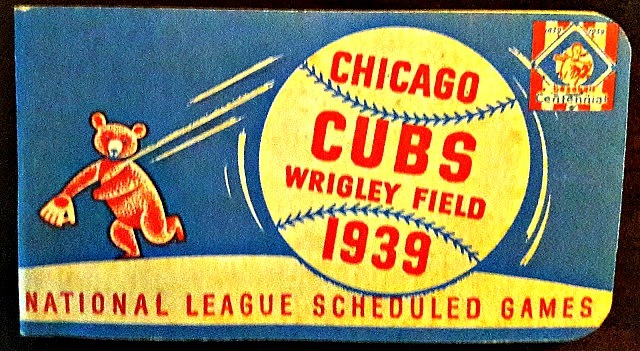 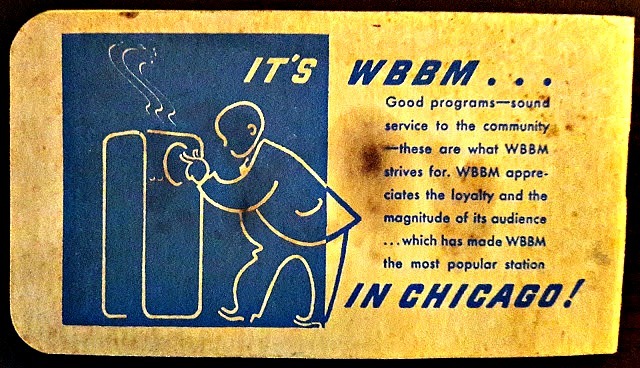 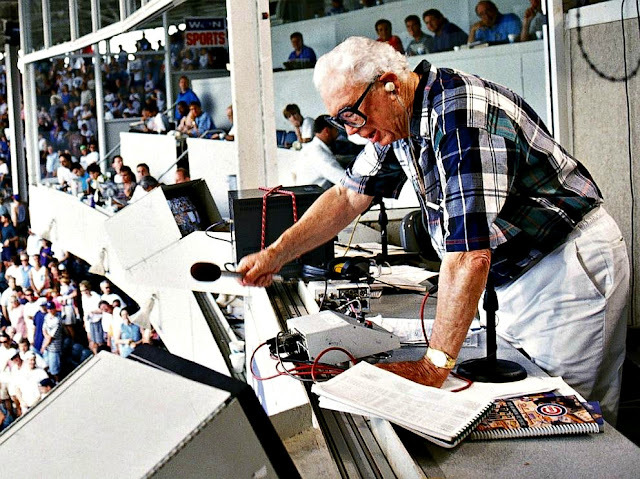 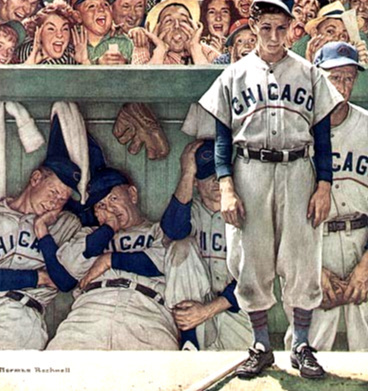 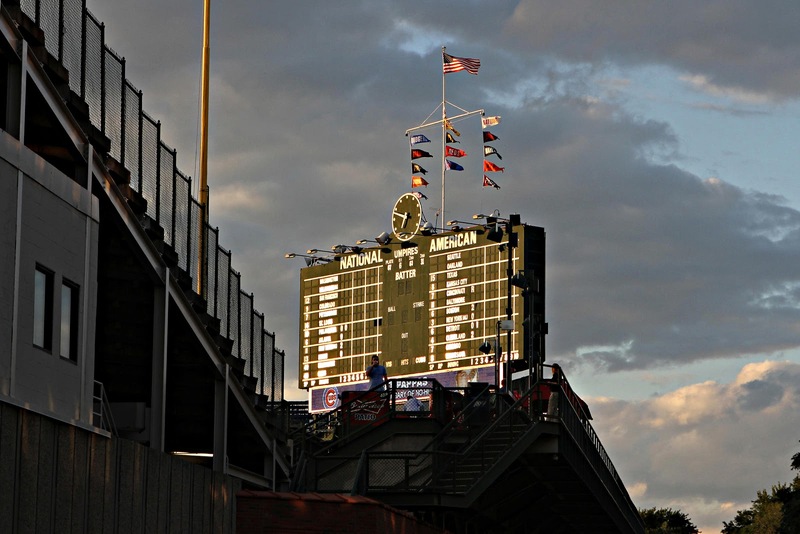 Albert Lasker was the advertising genius who was the backbone of the Cubs organization until he sold his 'controlling' company shares to Wrigley. 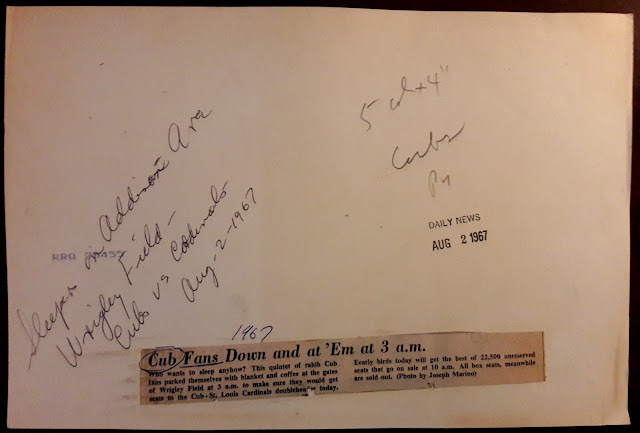 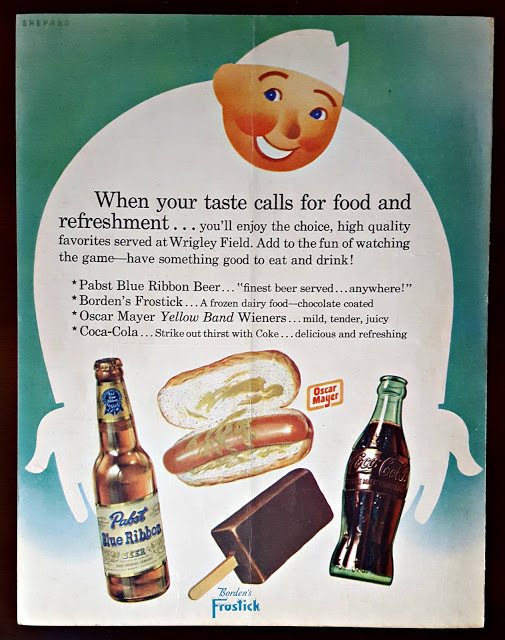 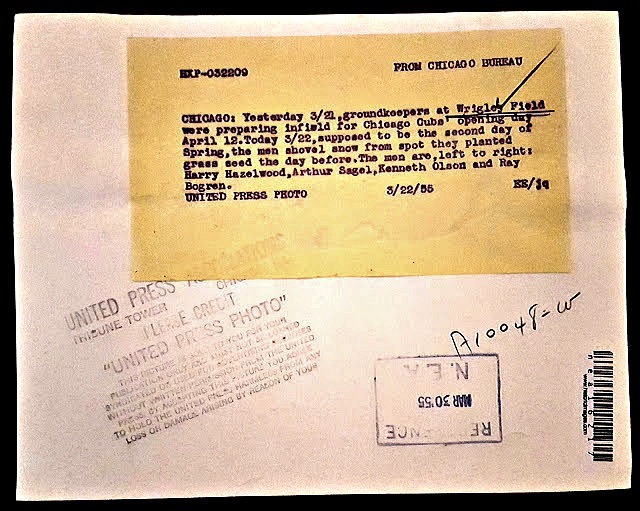 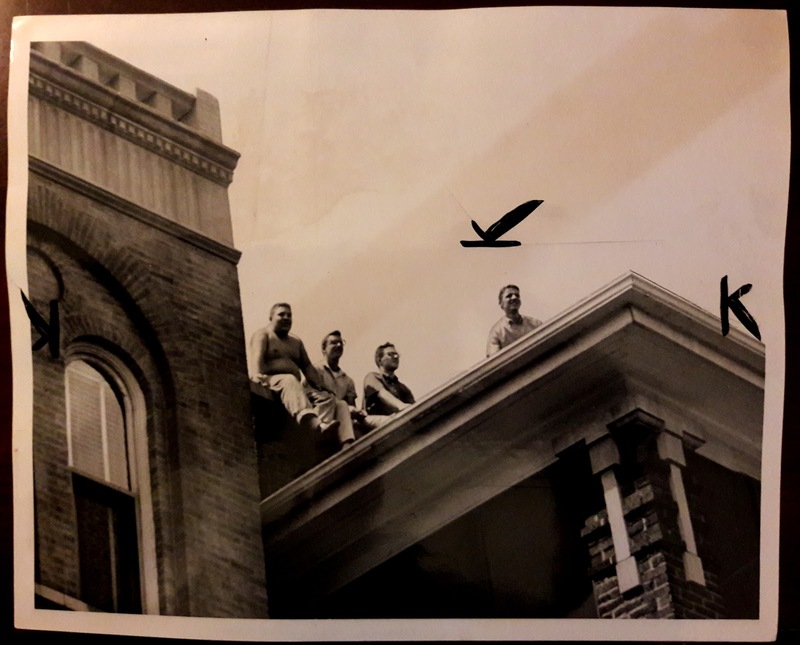 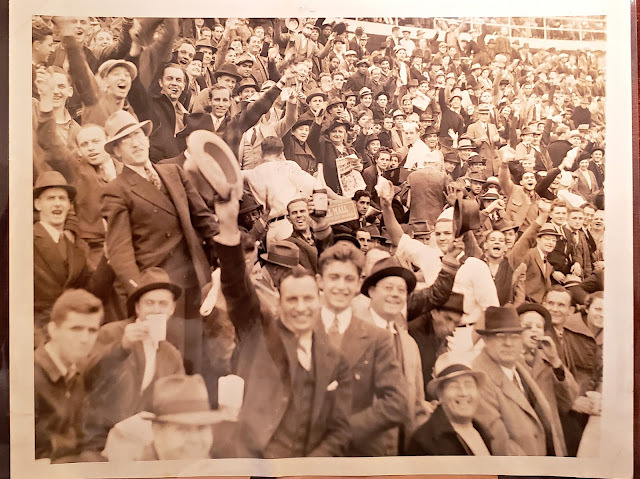 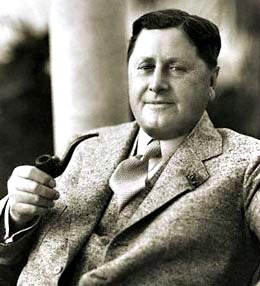 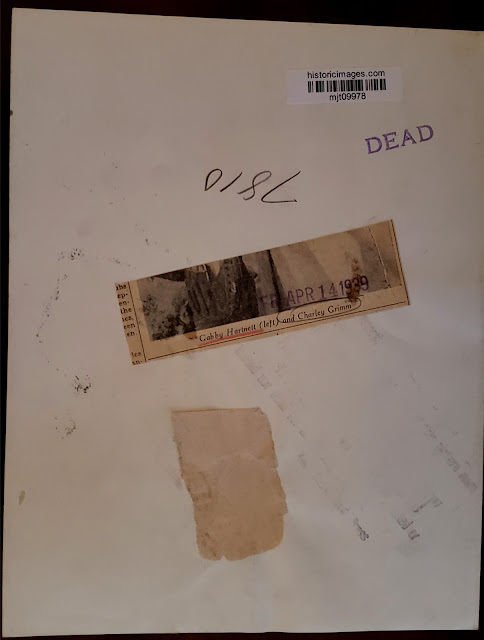 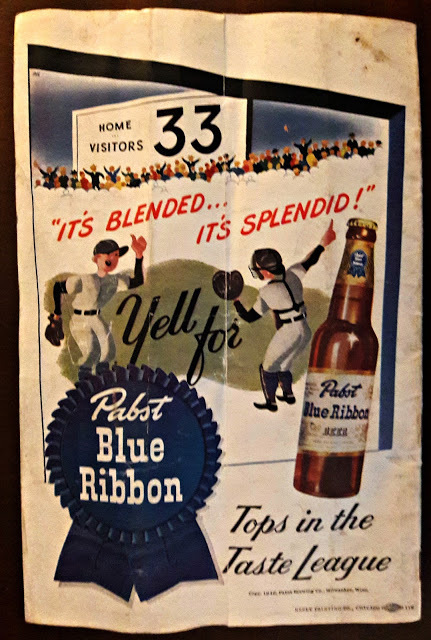 Read more about this relationship between Albert Lasker and William Wrigley, Jr. that involved promotion, friendship, and national politics. 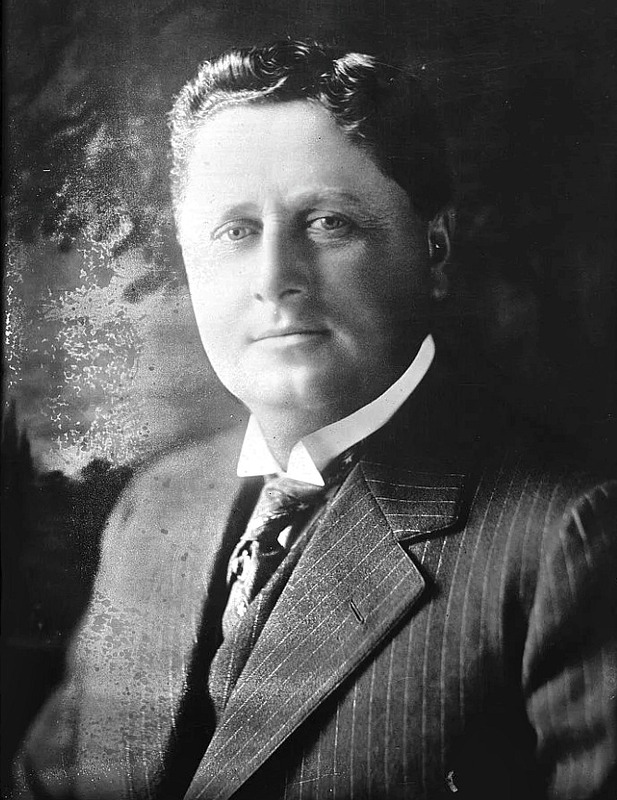 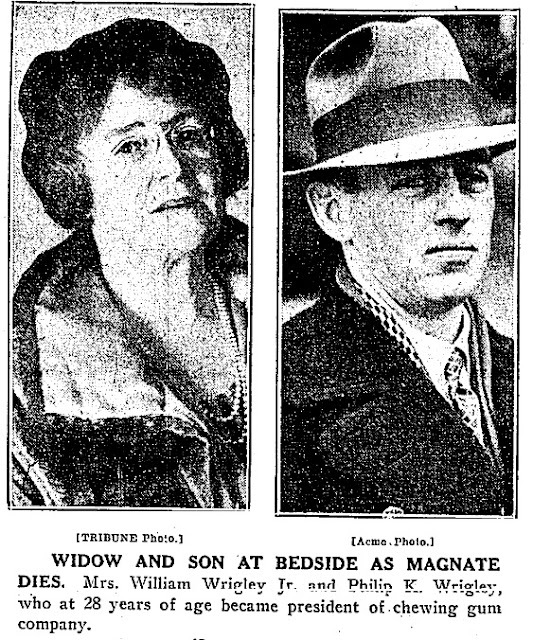 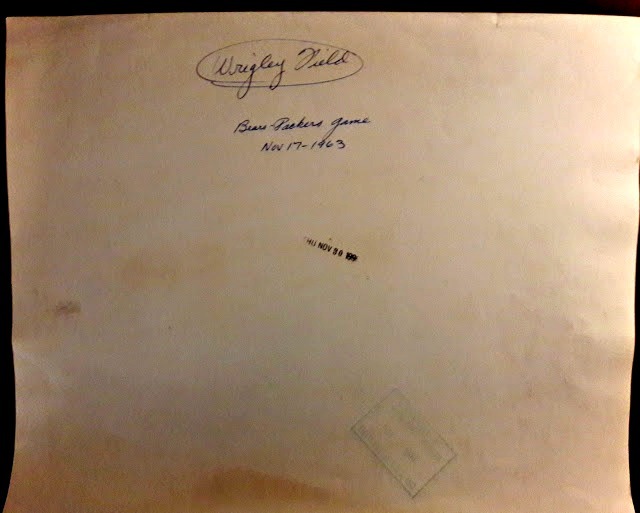 Albert Laster's partner William Wrigley,Jr. 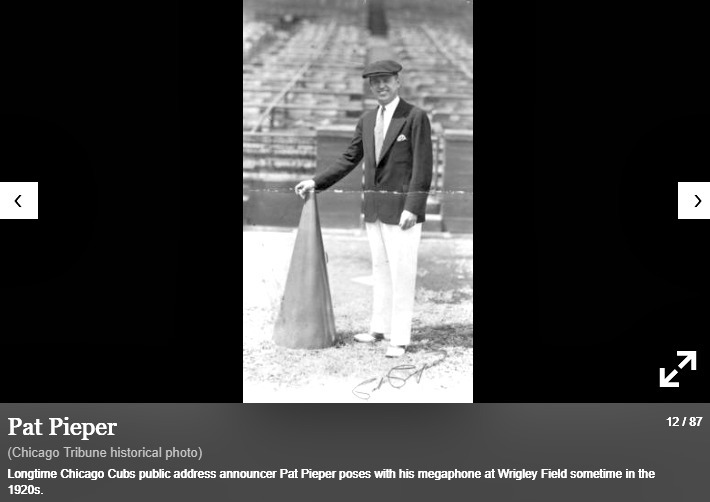 In the beginning a blow-horn was used. 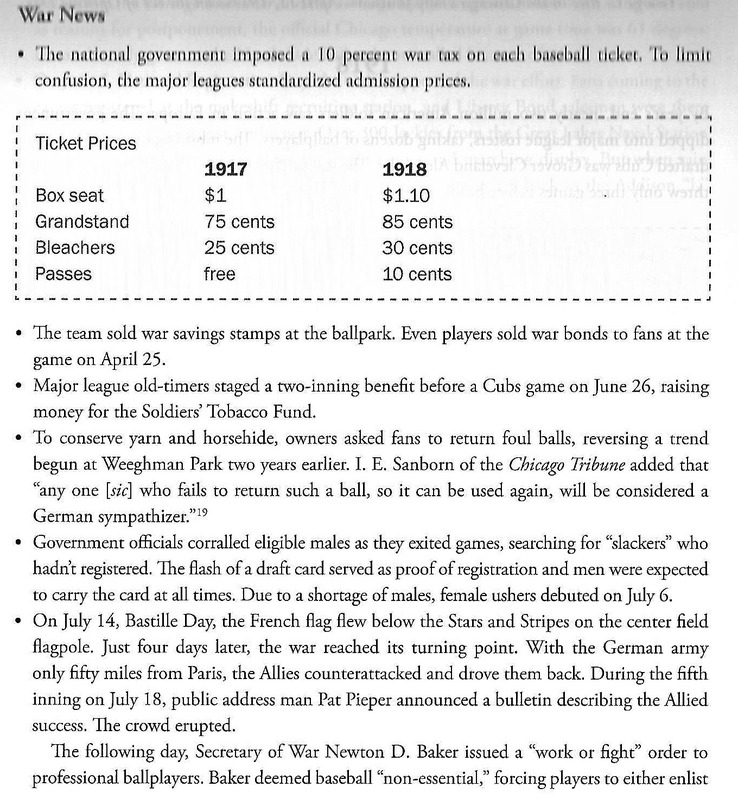 by declaring war on the then German Empire. 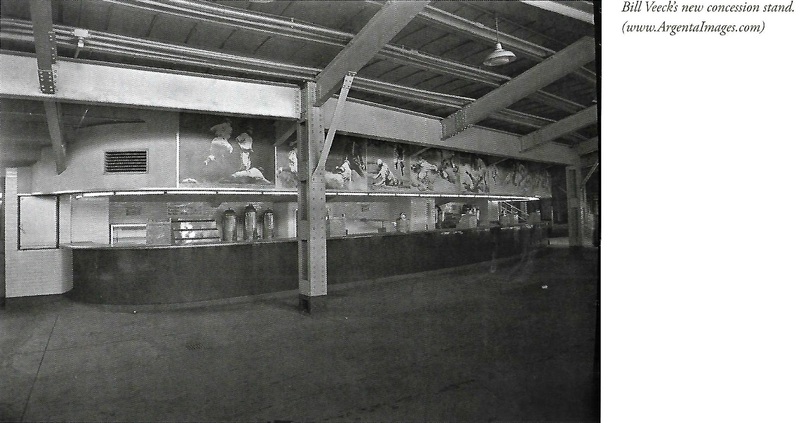 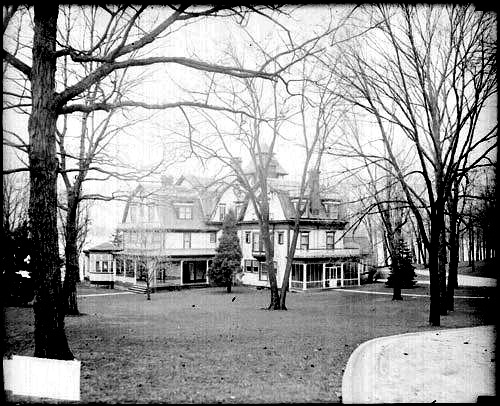 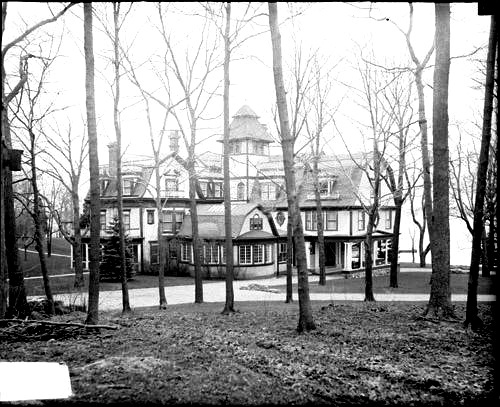 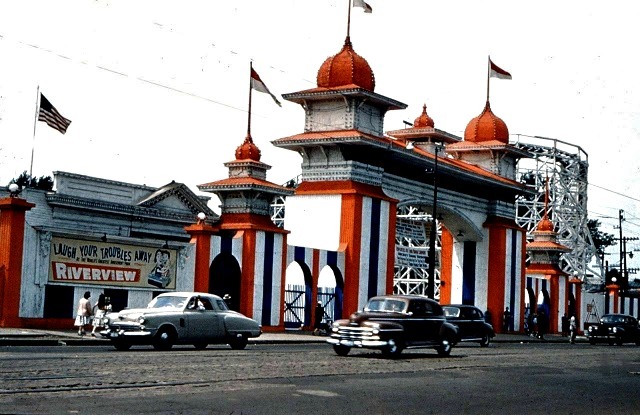 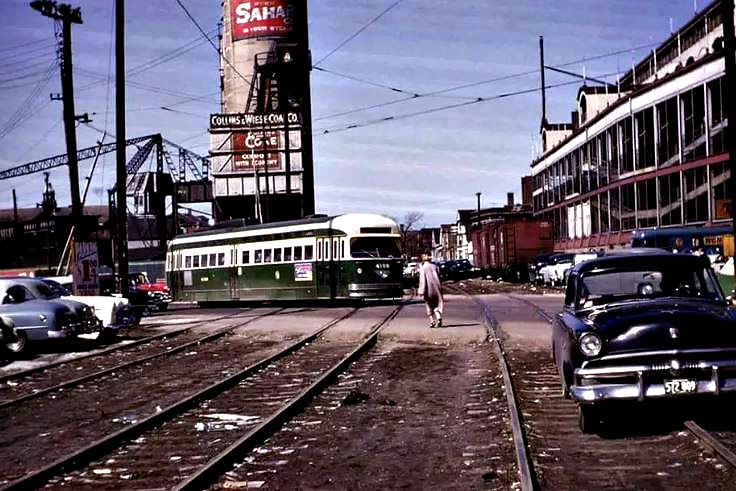 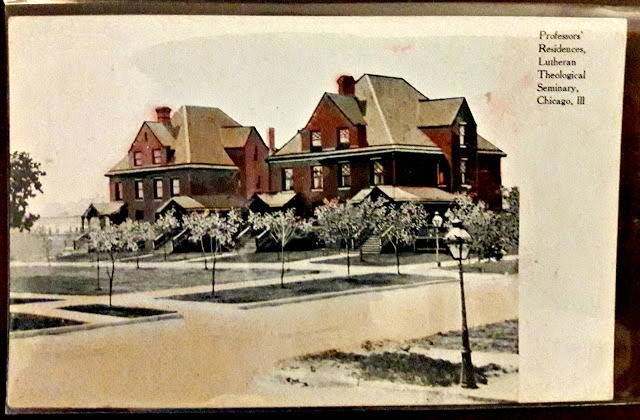 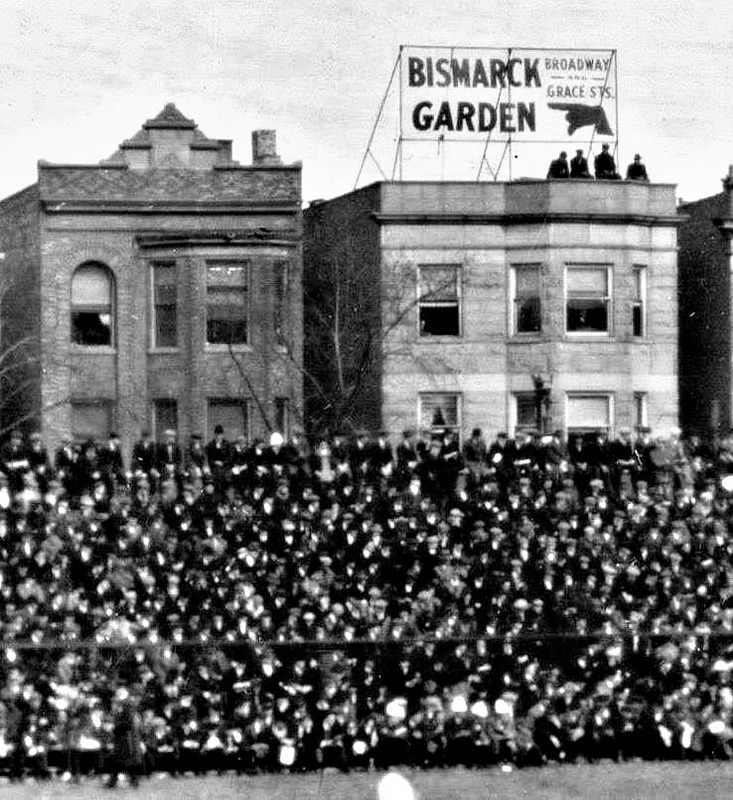 Bismarck Gardens was the most popular German-American owned and operated beer garden in the city at the time. 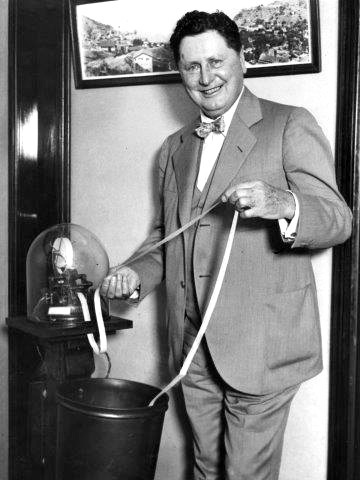 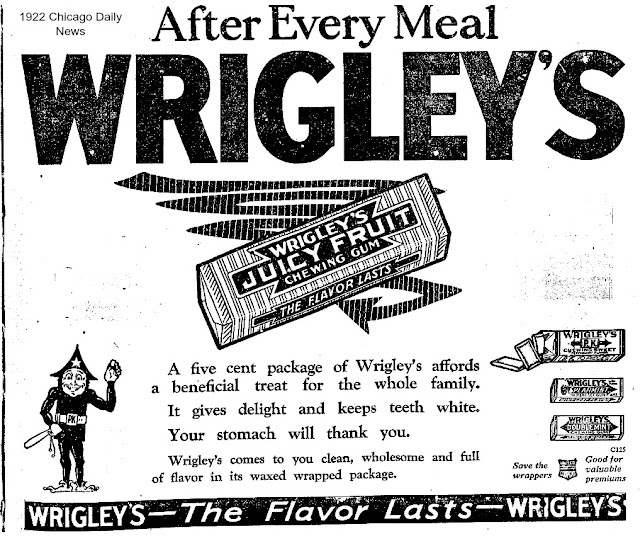 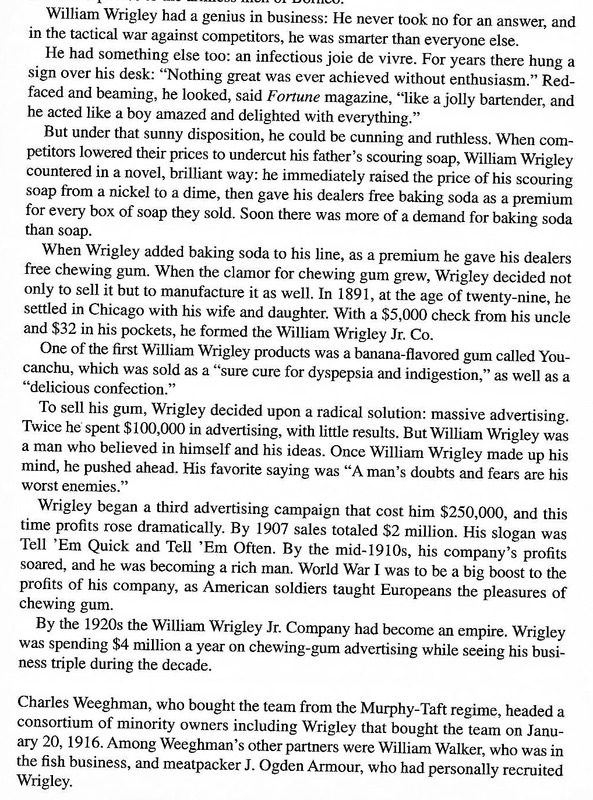 ‘Since the chewing gum business was highly competitive in the late 1800’s, William Wrigley Jr. spent more than a million dollars a year in advertising. 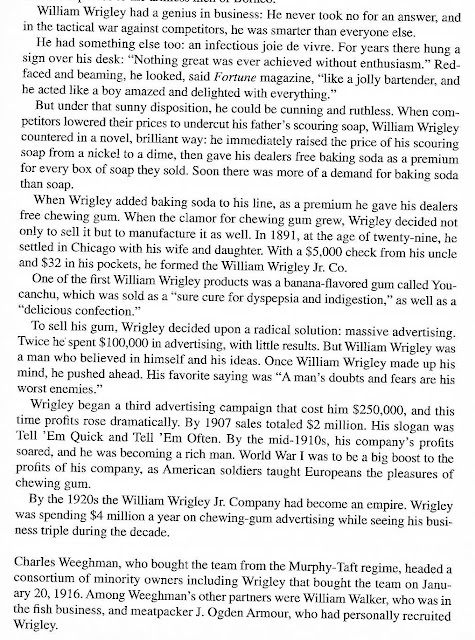 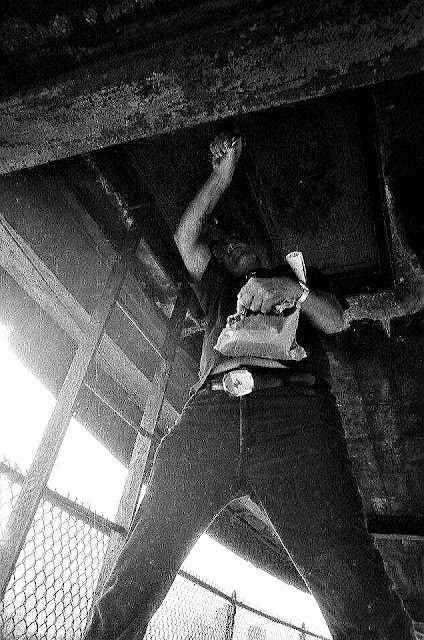 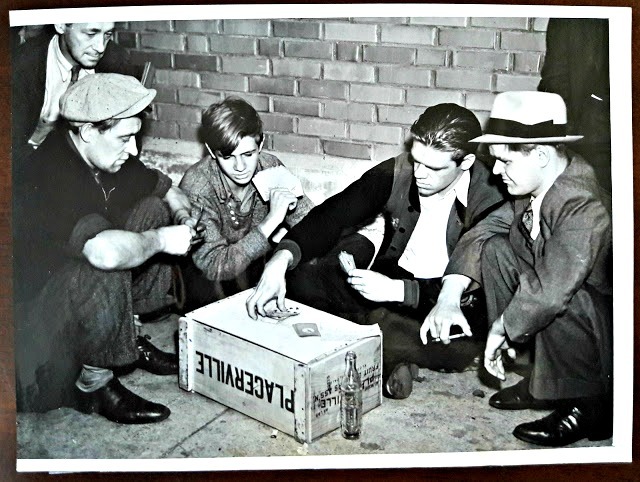 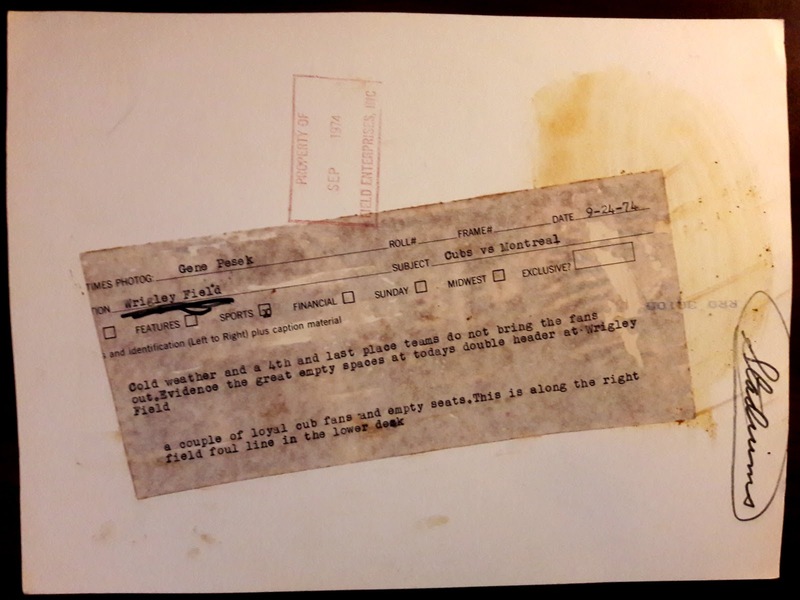 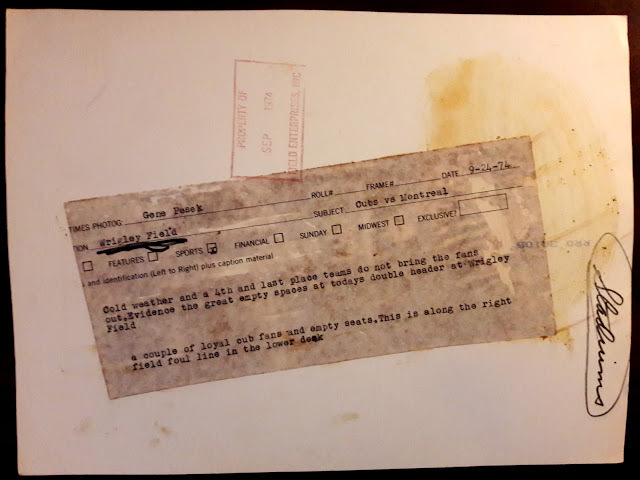 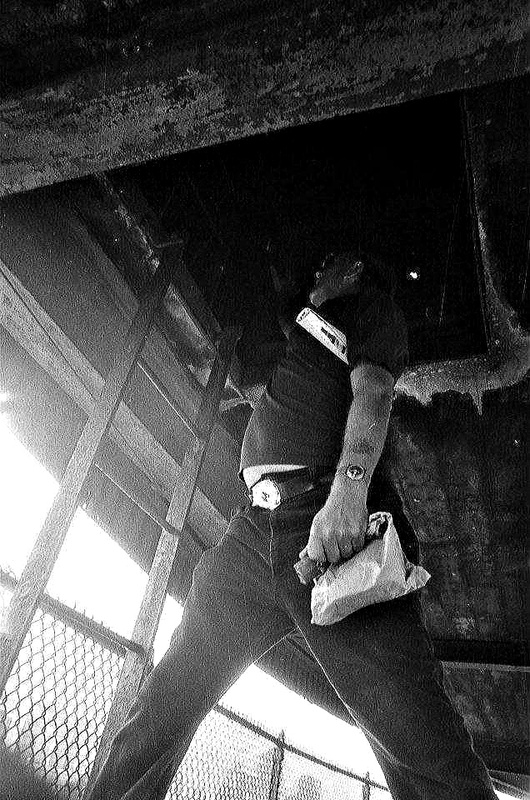 He combined gum with other items like lamps, pocket knives, cookbooks and fishing tackle’ – The Vintage News. 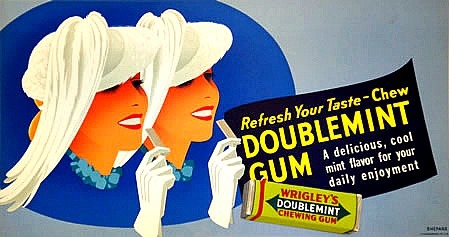 By the turn of the 20th century he would center is advertising to one very profitable product, his chewing gum. 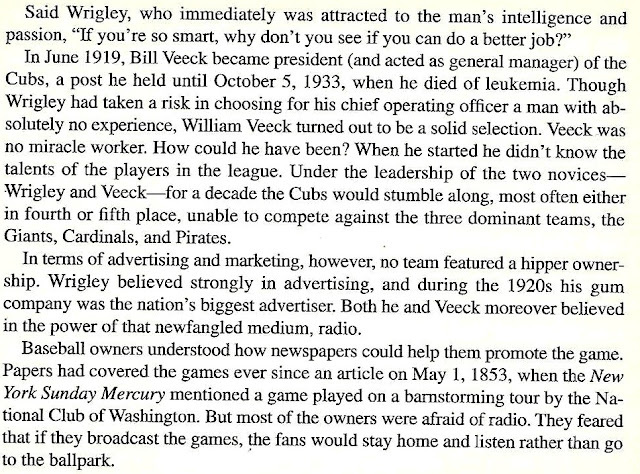 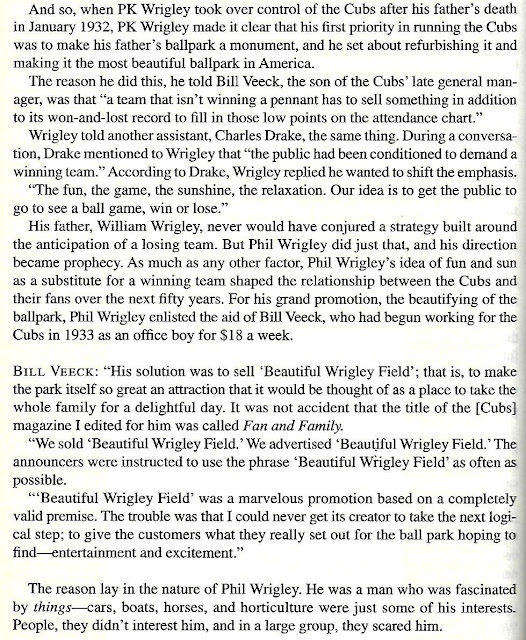 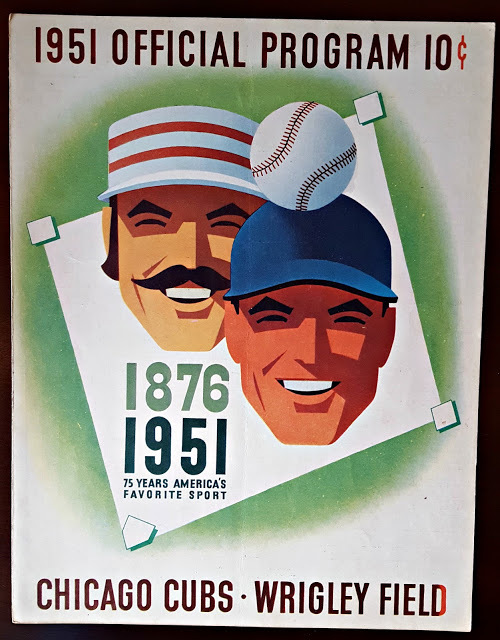 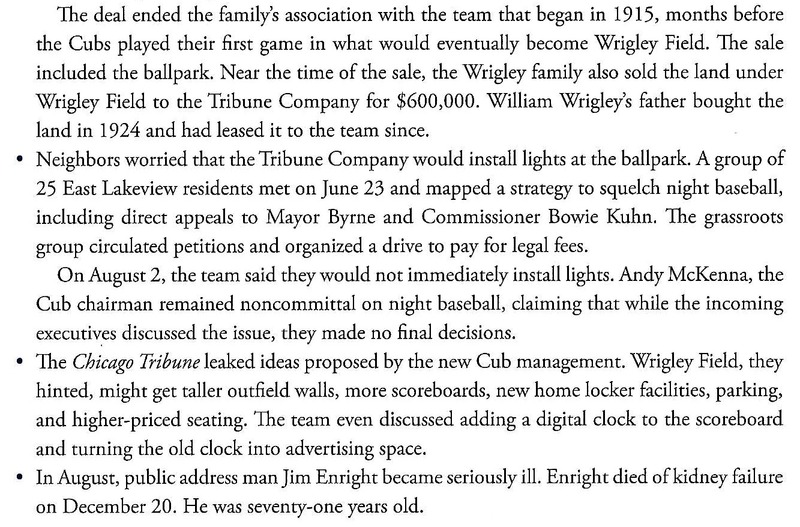 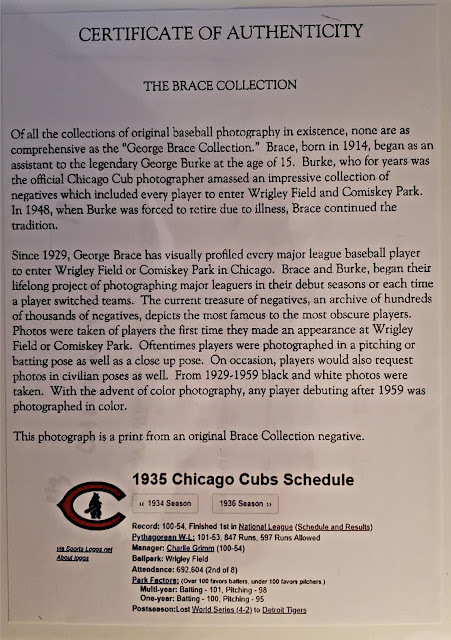 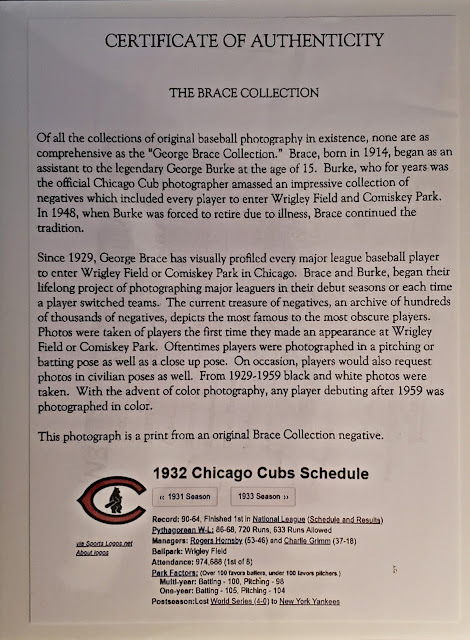 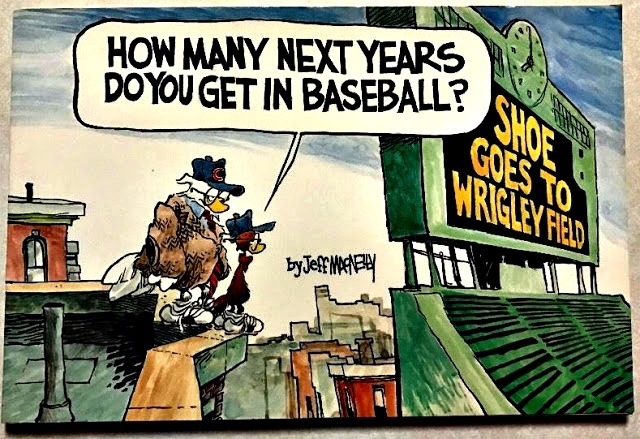 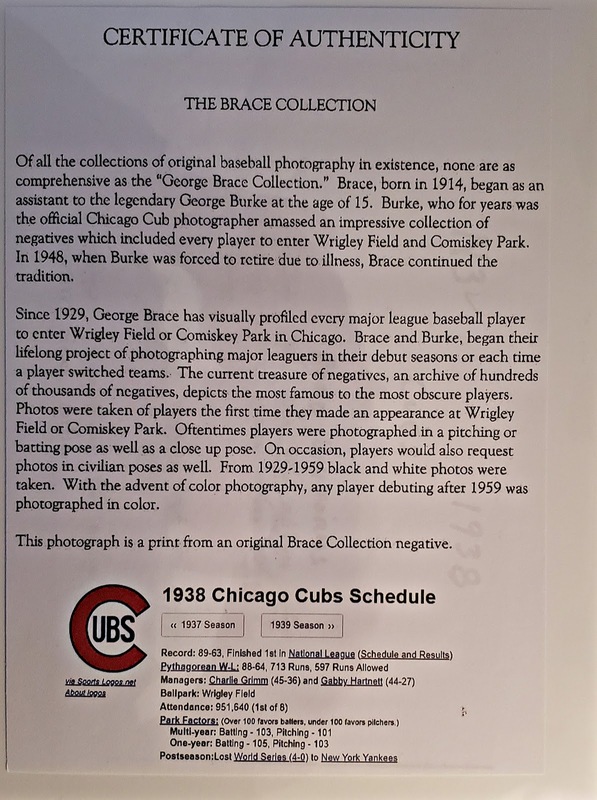 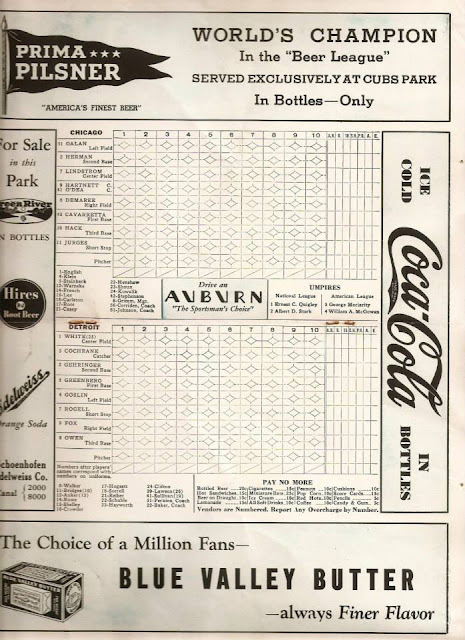 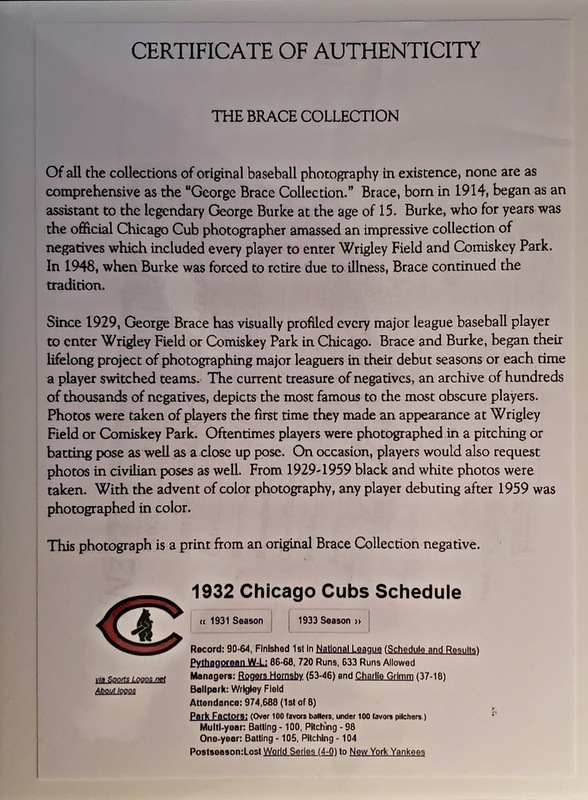 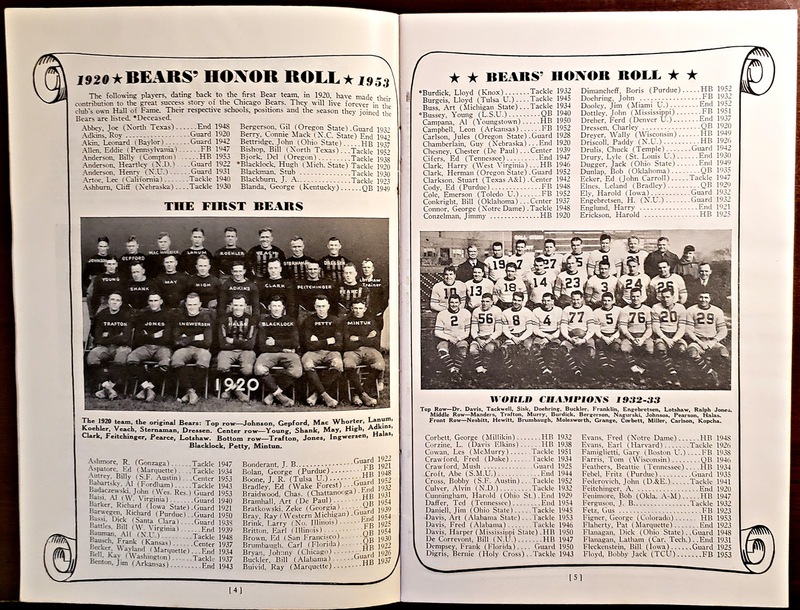 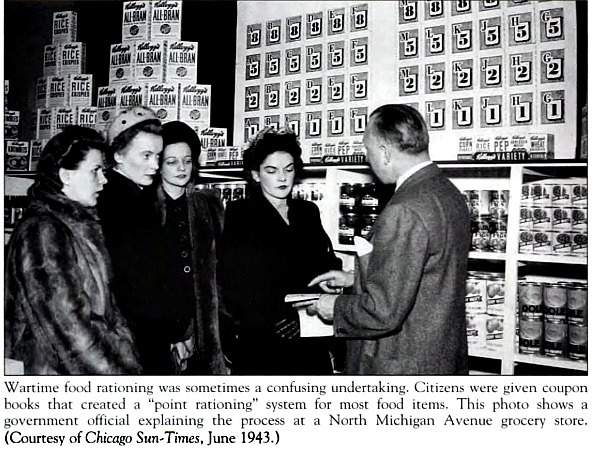 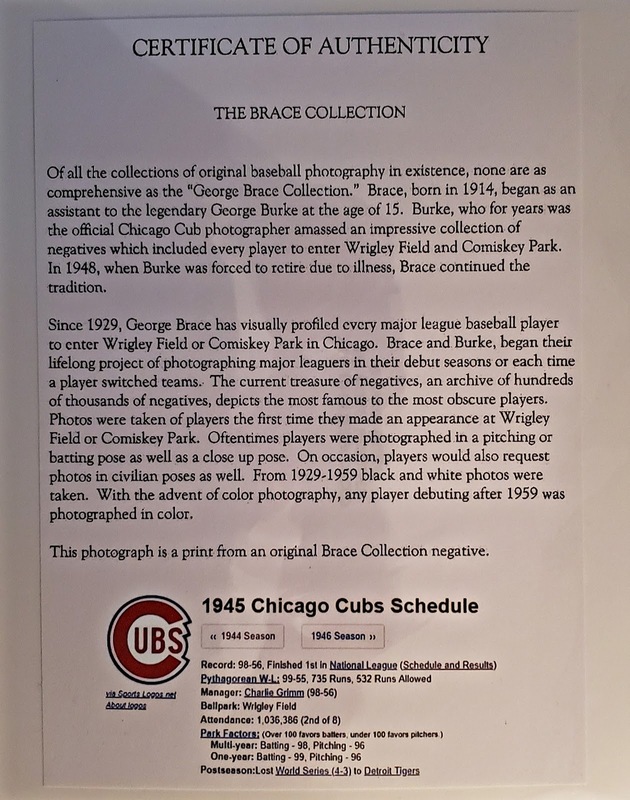 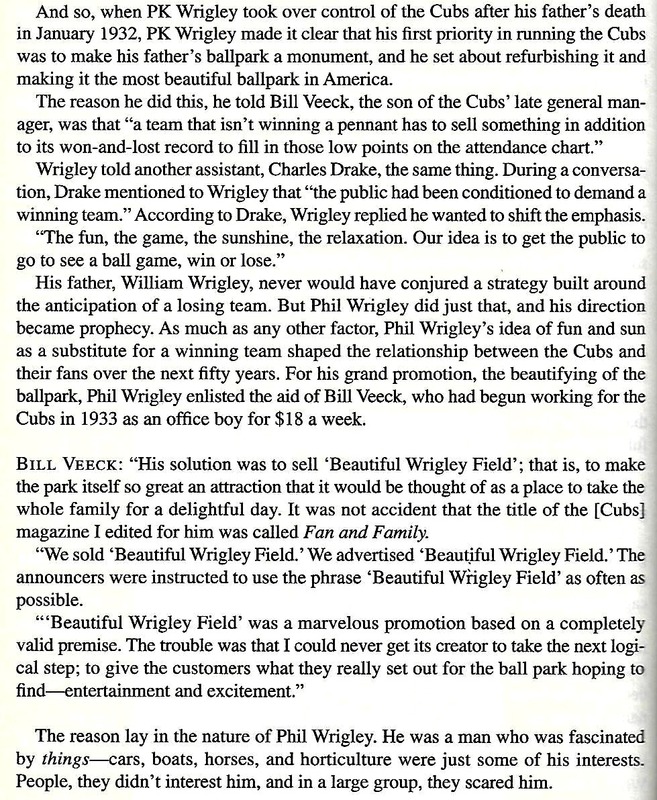 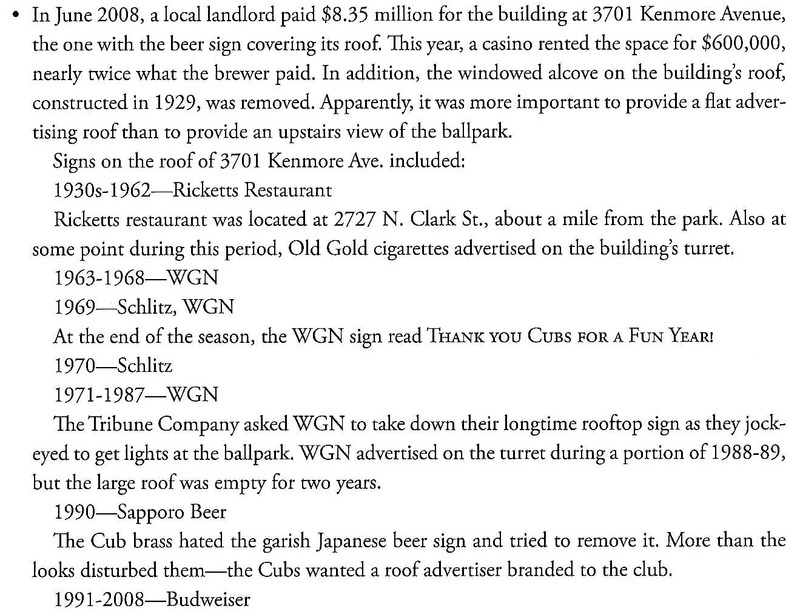 Interesting the similarity of the importance of advertising with the present owner of the Chicago Cubs and Wrigley Field, the Ricketts Family in selling a product. 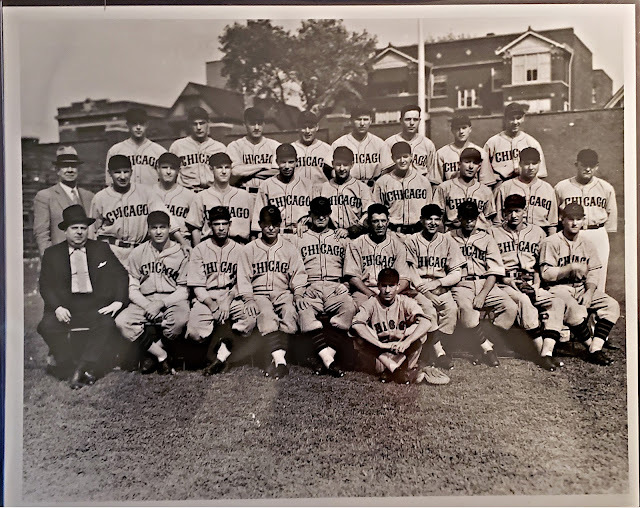 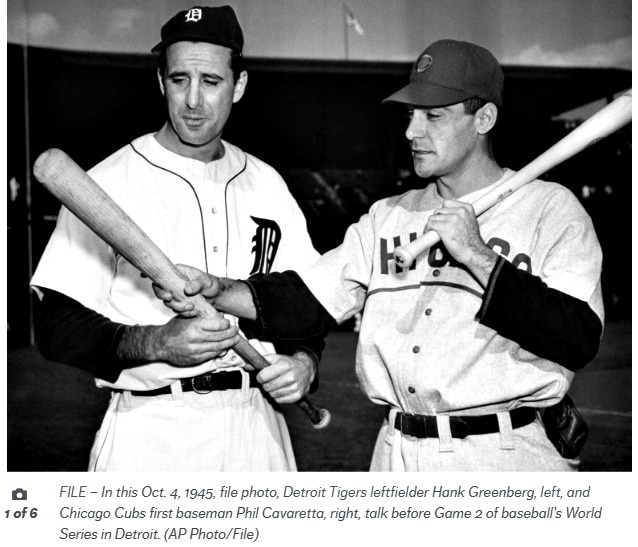 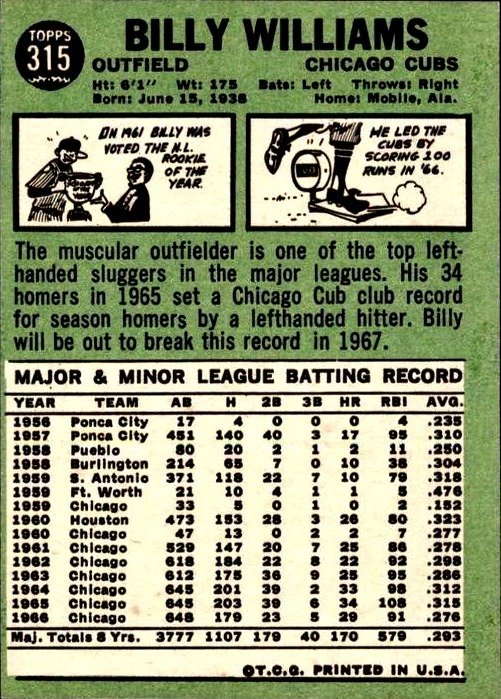 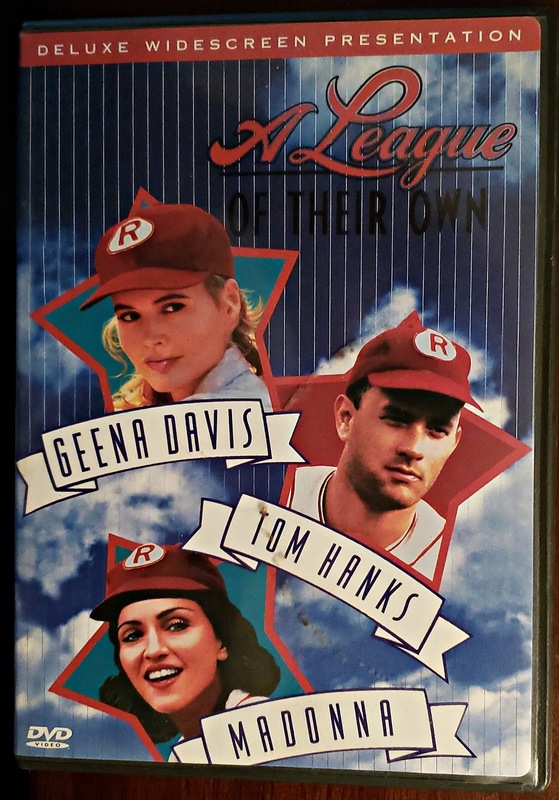 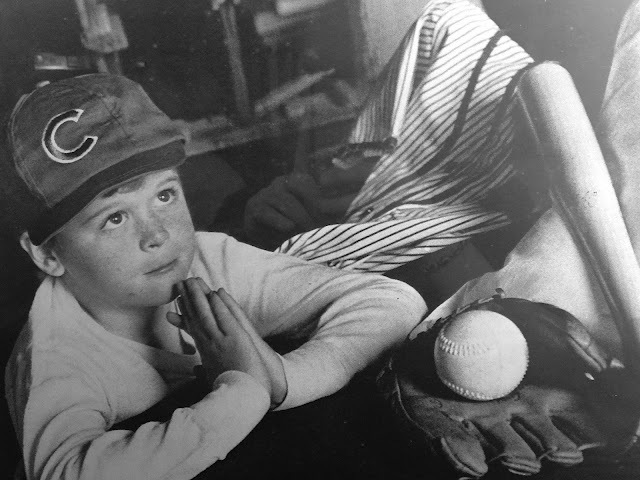 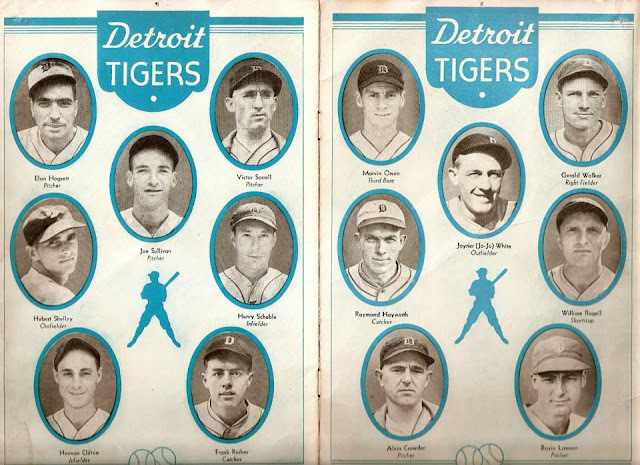 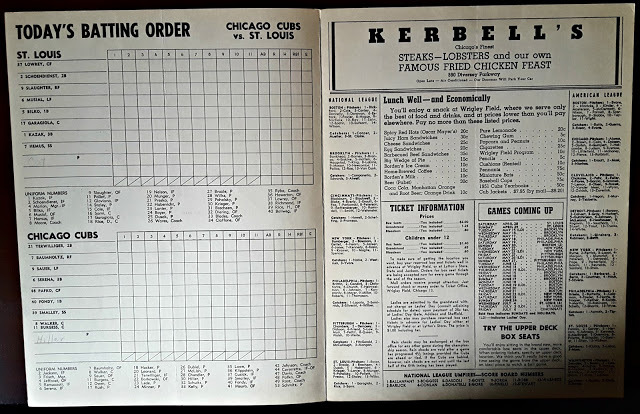 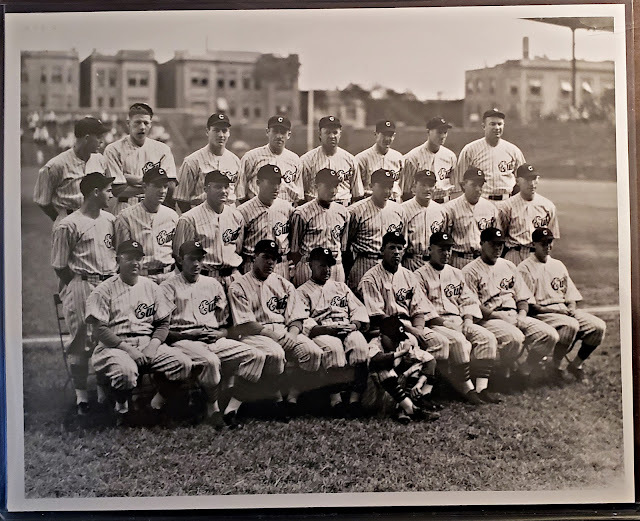 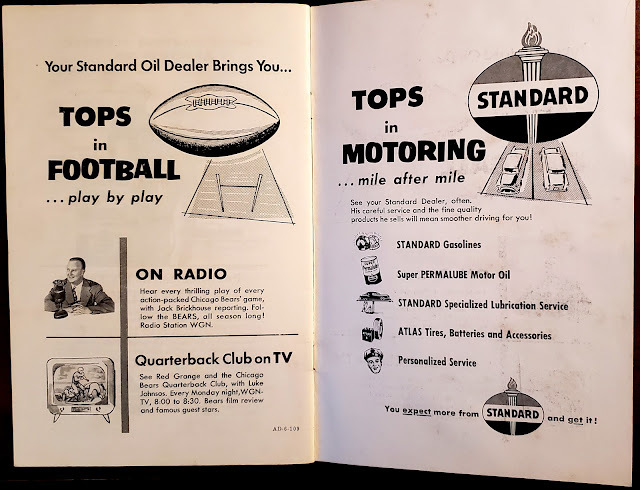 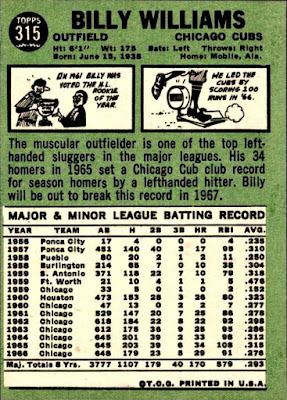 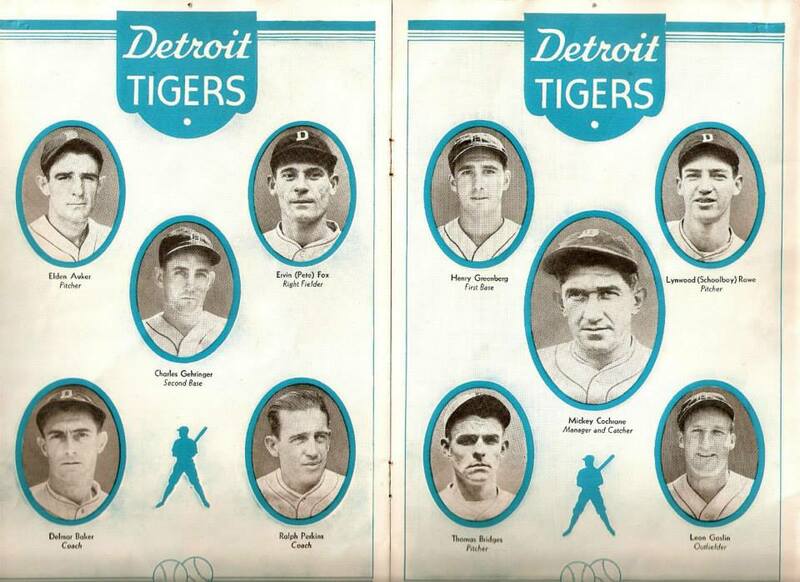 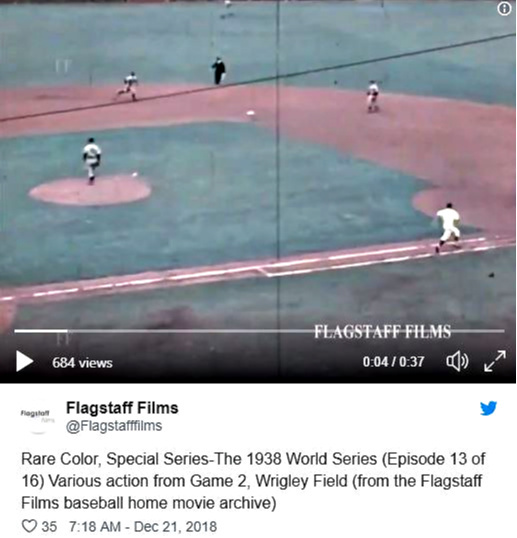 These were the days when employees could become baseball players if the opportunity arose and baseball players had part-time jobs off the field. 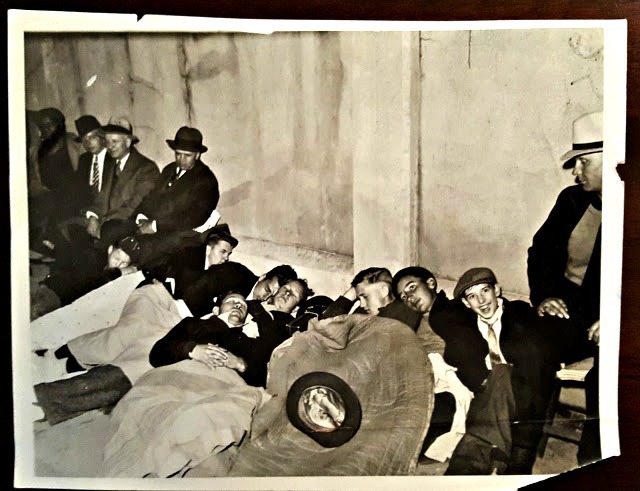 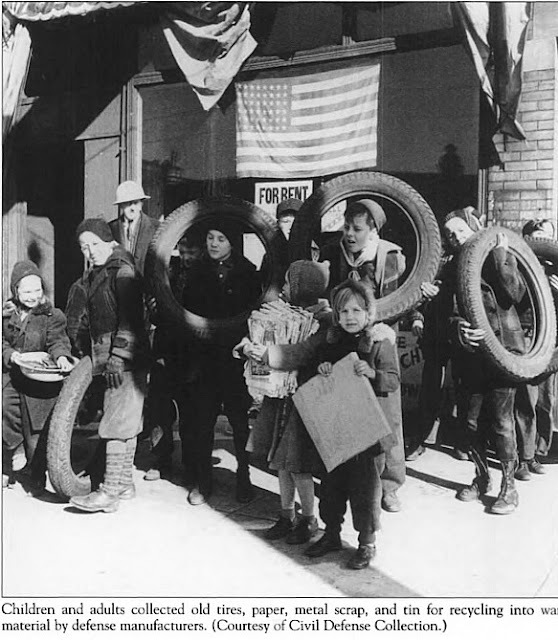 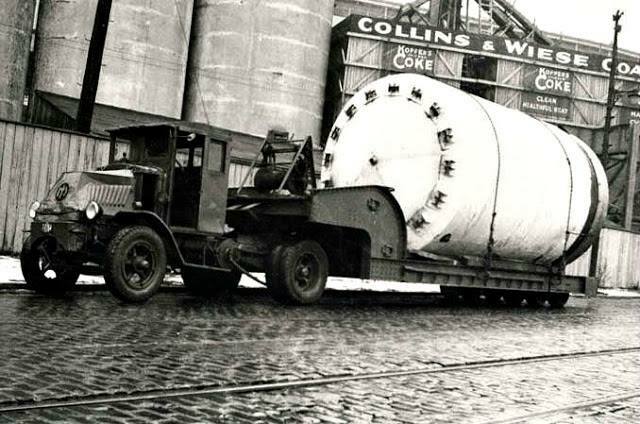 world-wide economic depression and a halt to development. 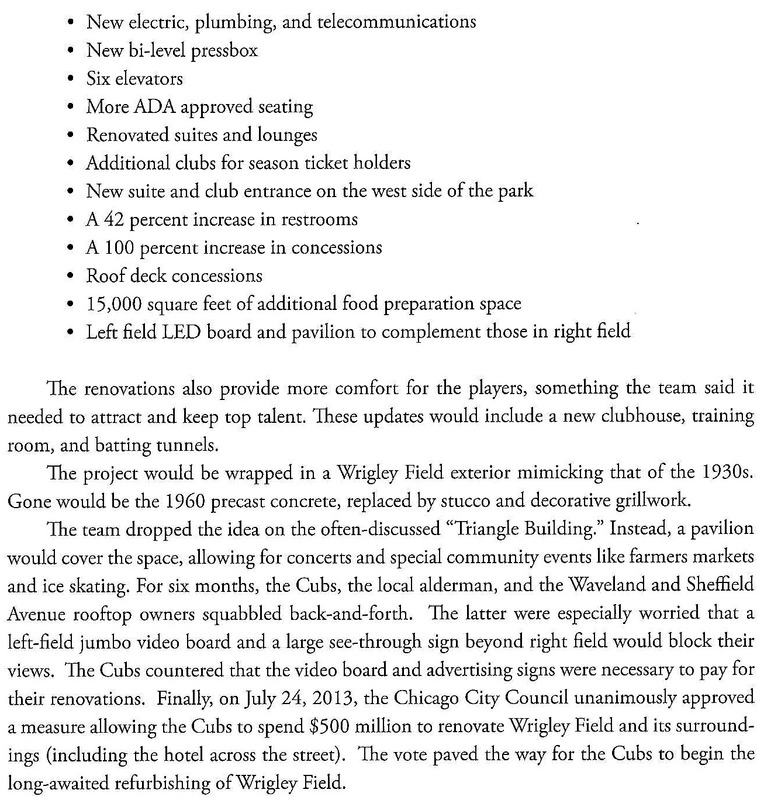 A Move to Riverview Park?? 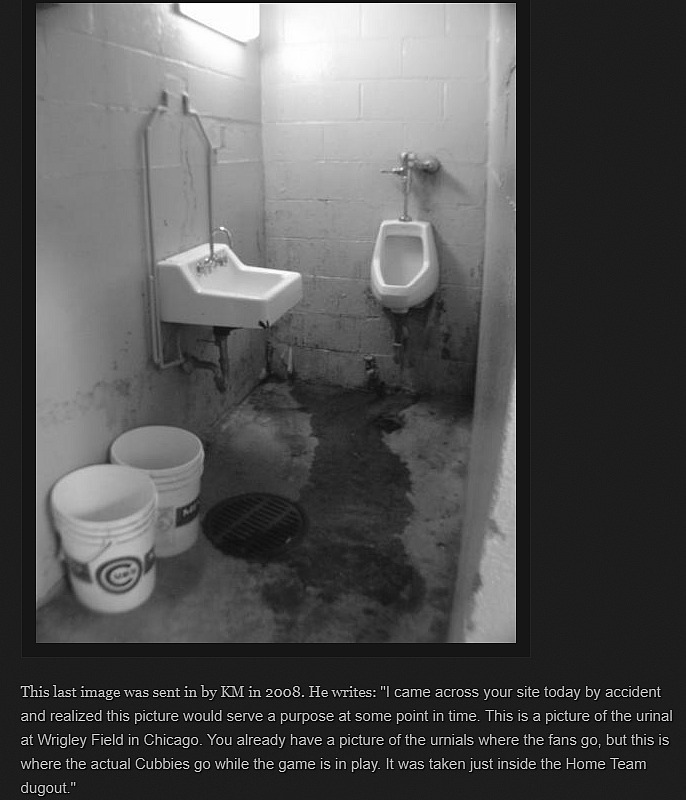 Read more from this blog article from the link above. 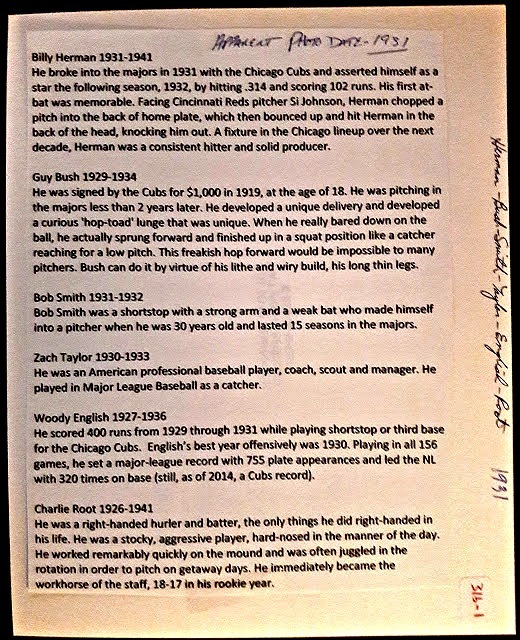 There is very little about him online other then what appears on Wikipedia. 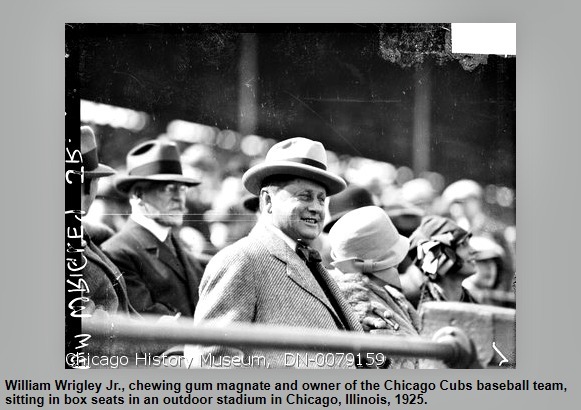 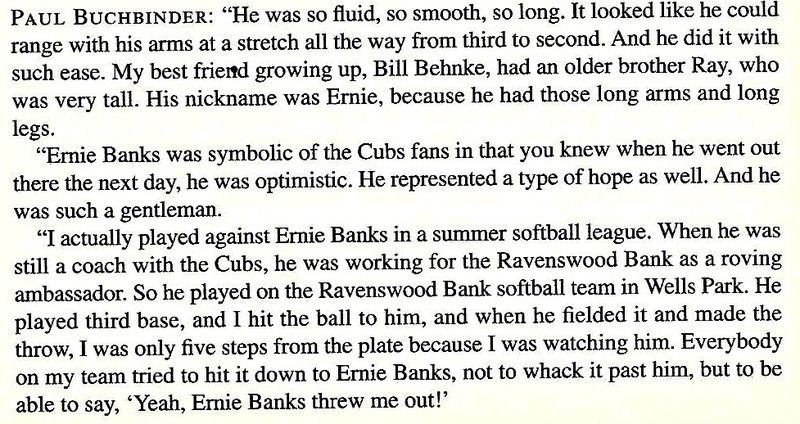 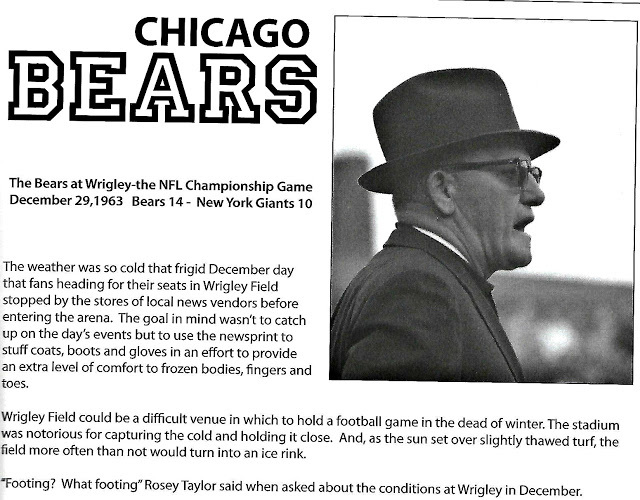 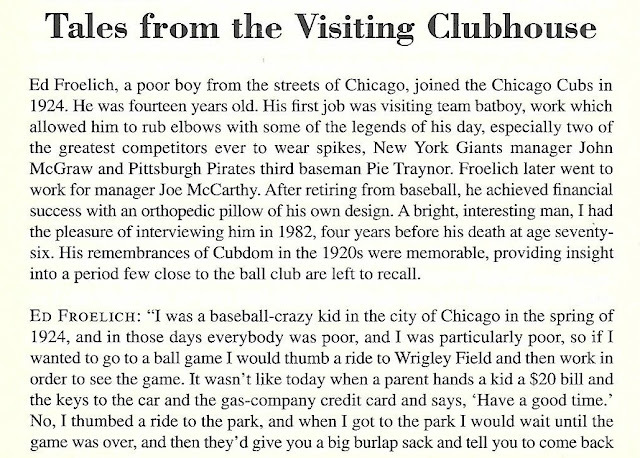 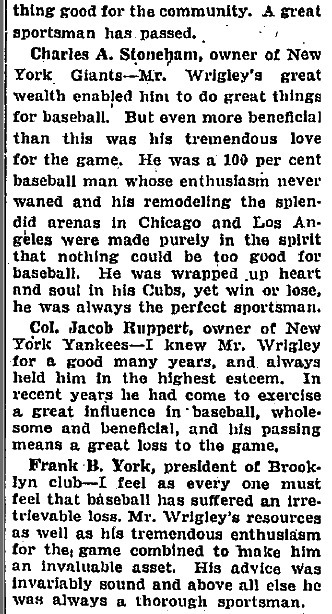 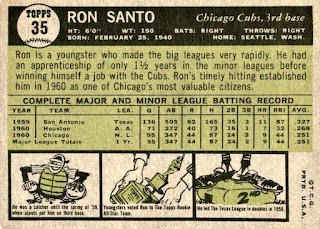 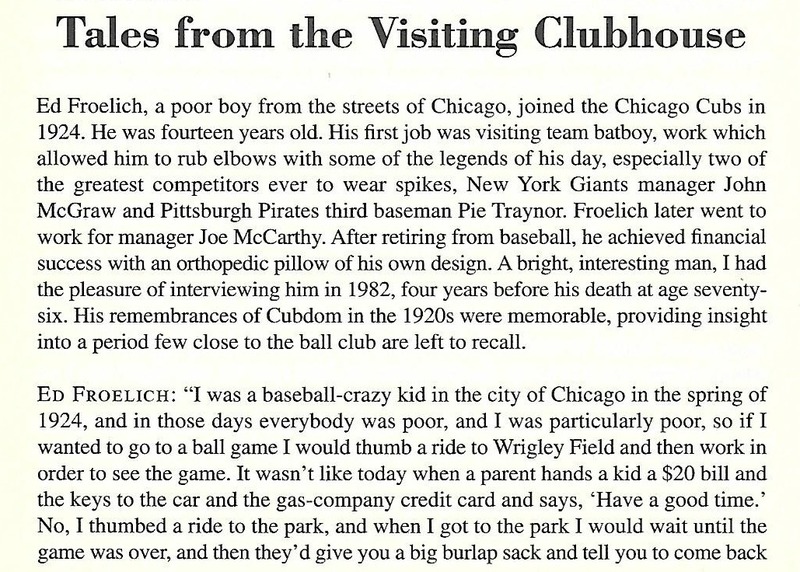 I am assuming his interest was more about his grandfathers company then Chicago Cubs and Wrigley Field. 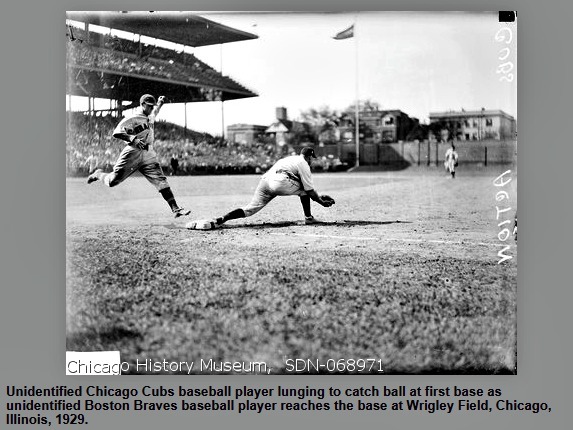 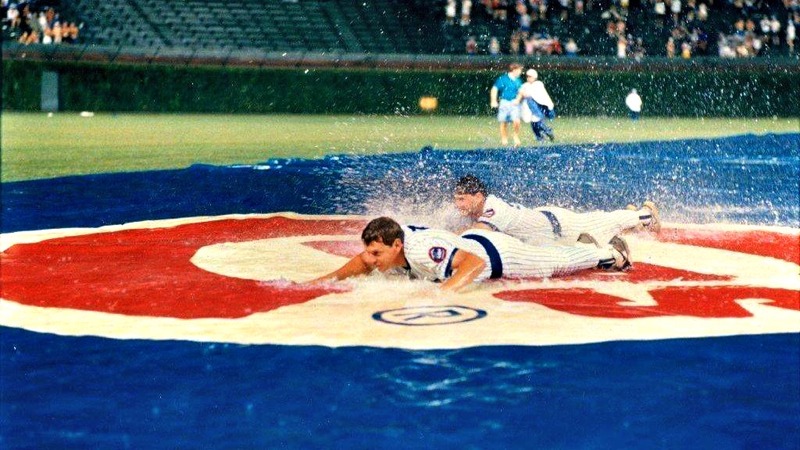 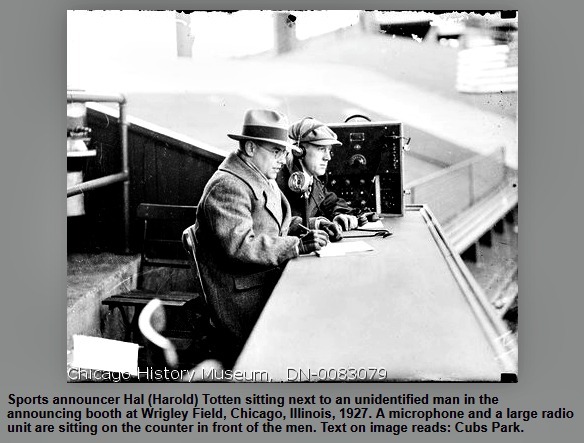 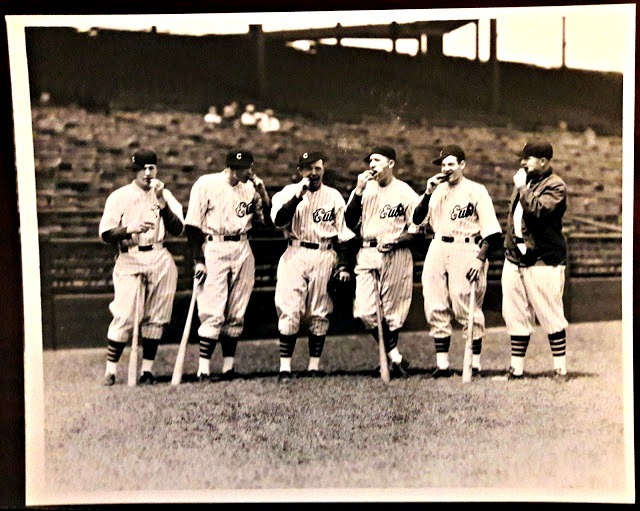 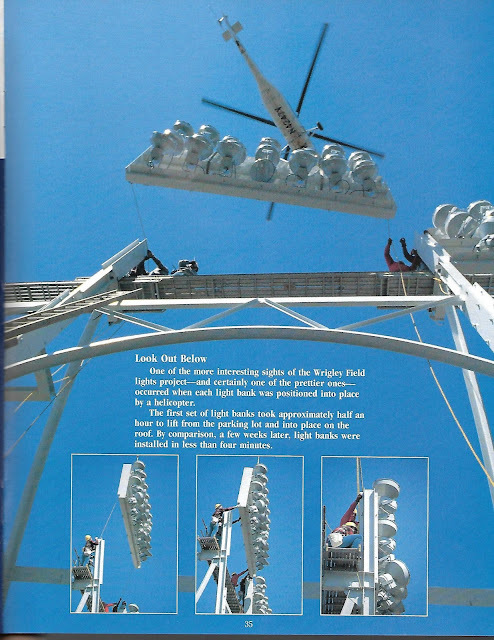 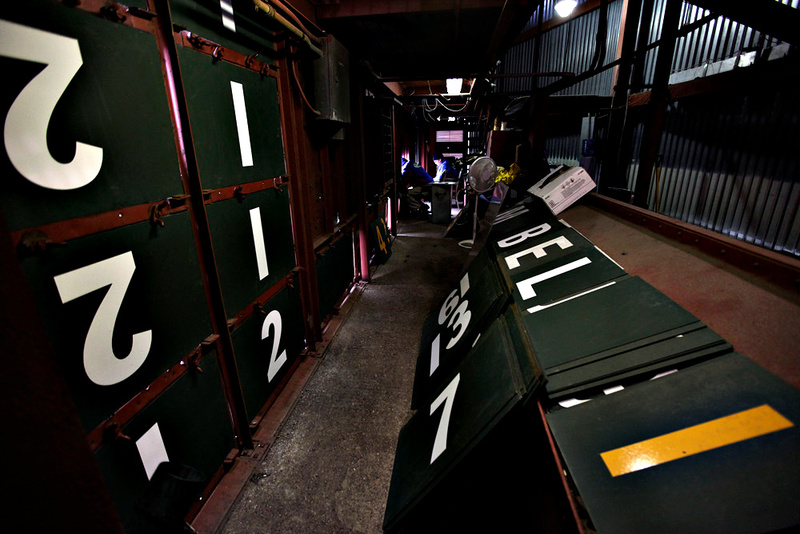 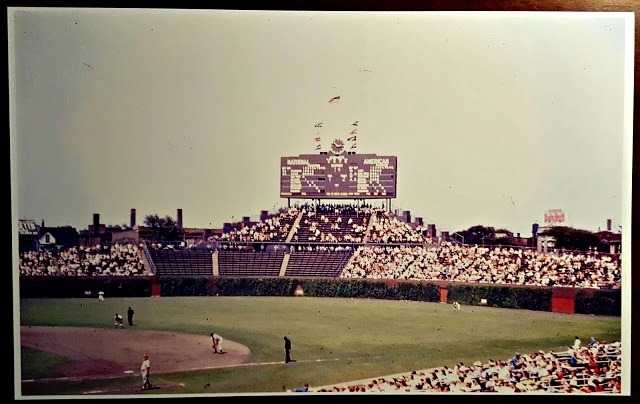 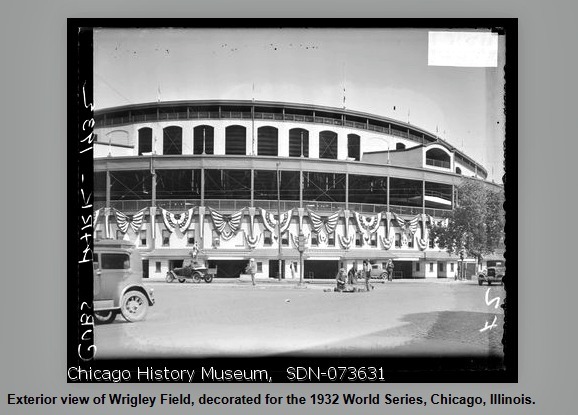 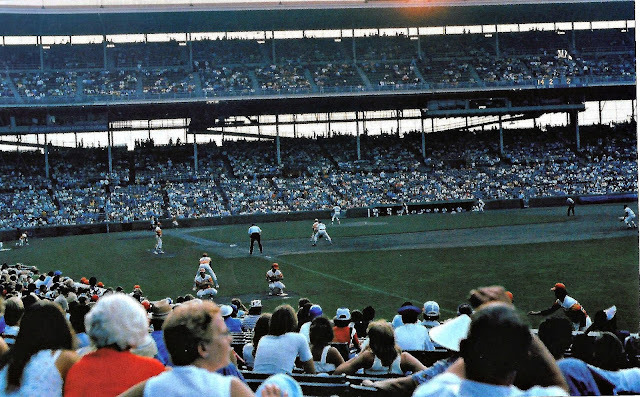 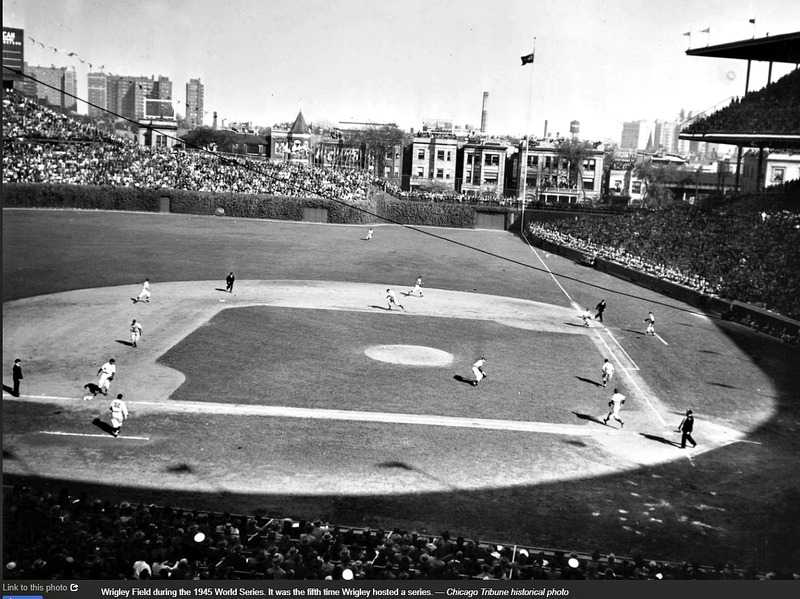 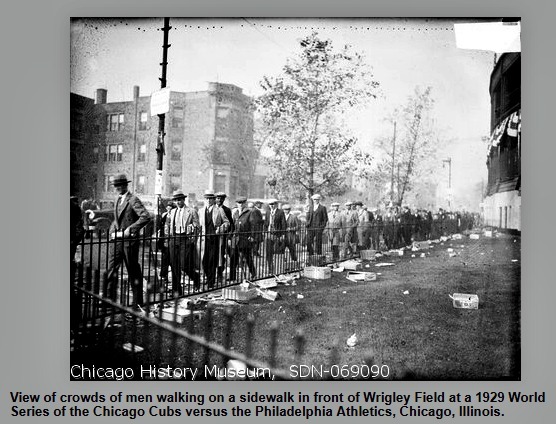 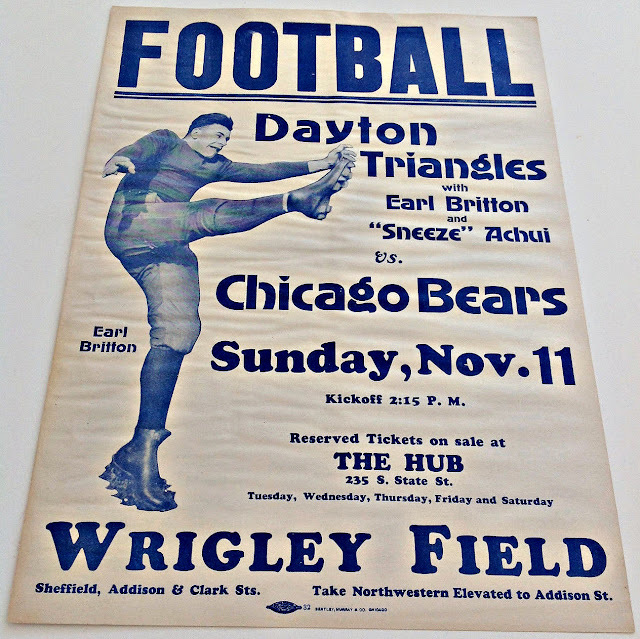 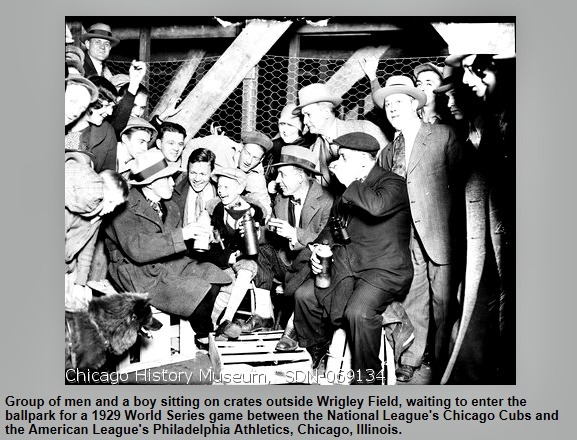 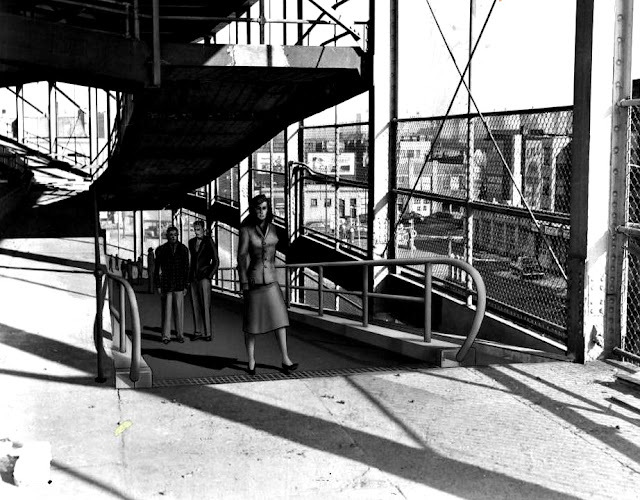 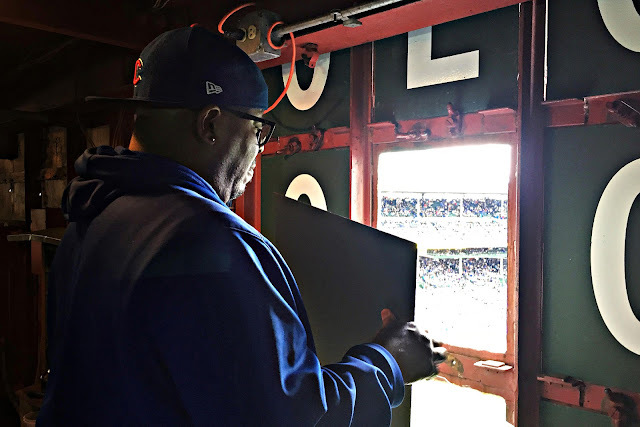 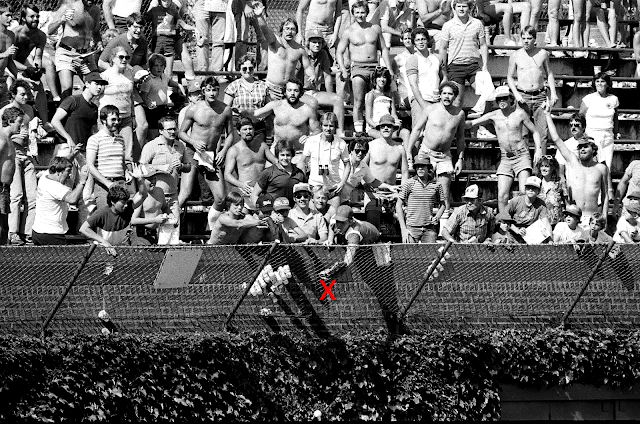 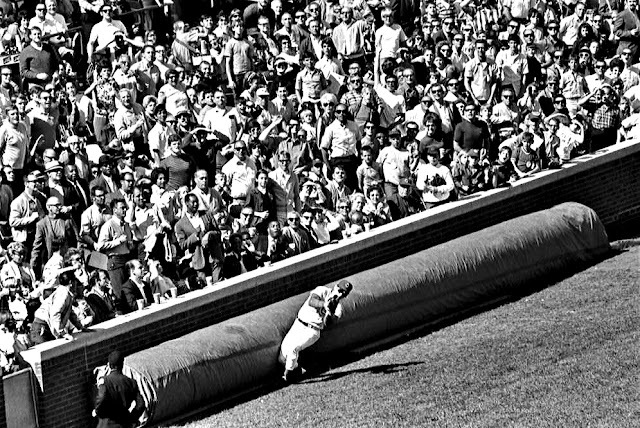 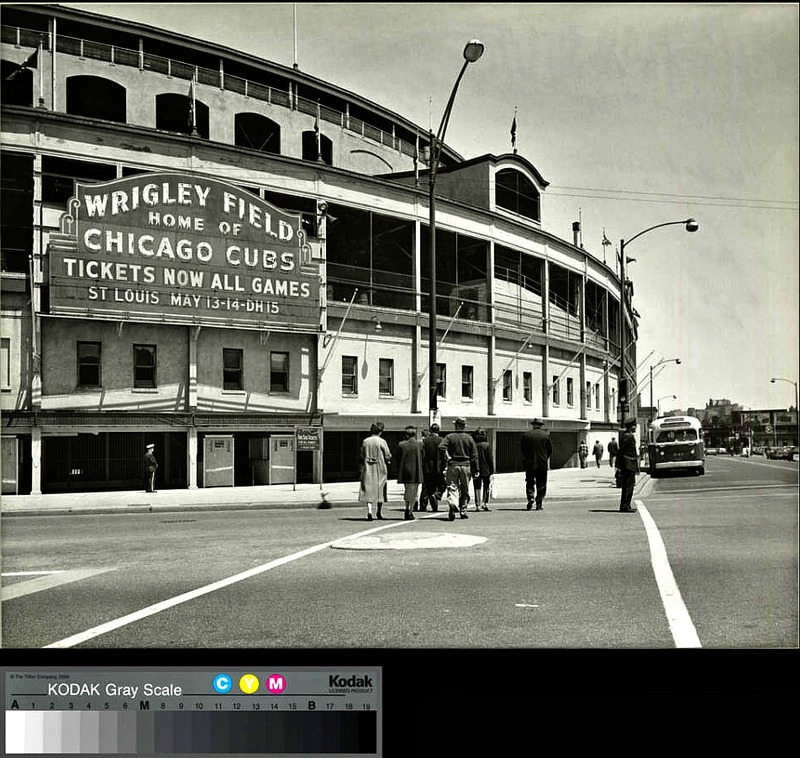 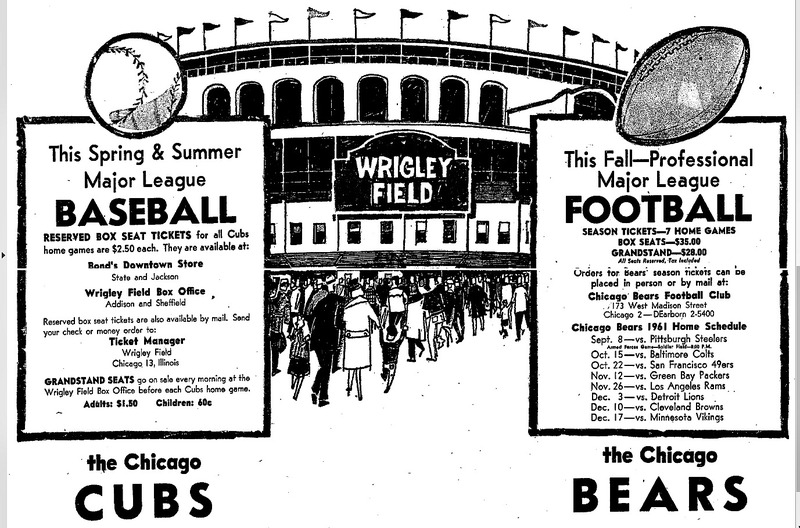 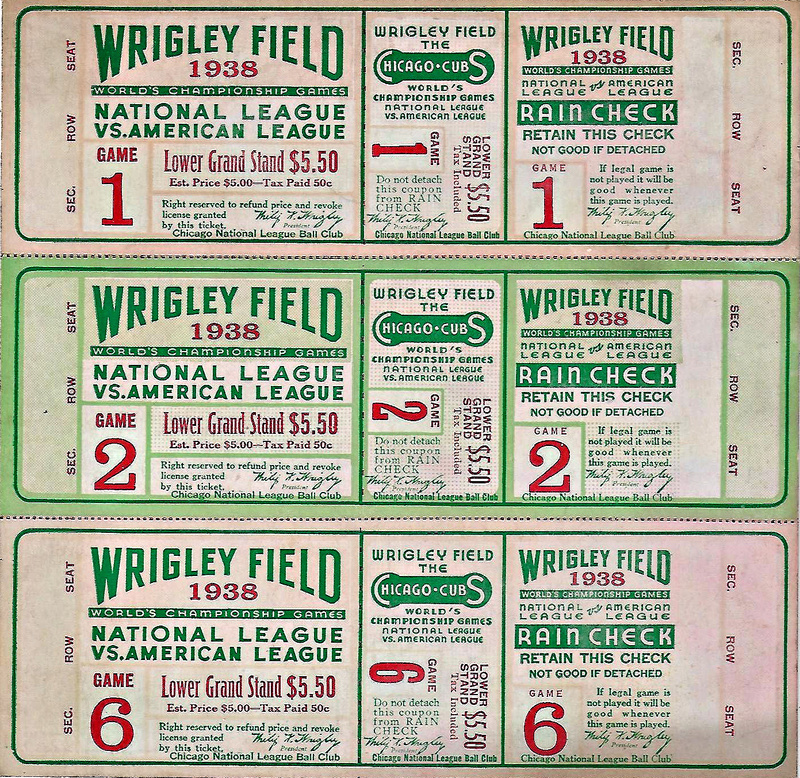 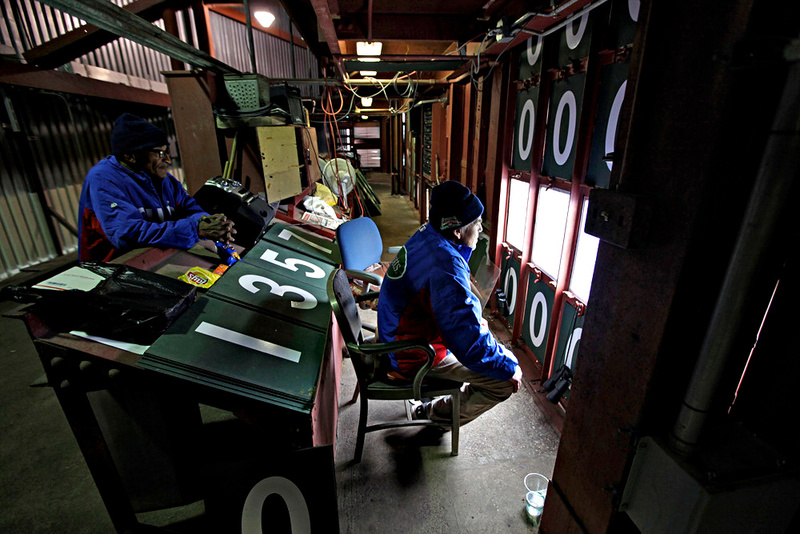 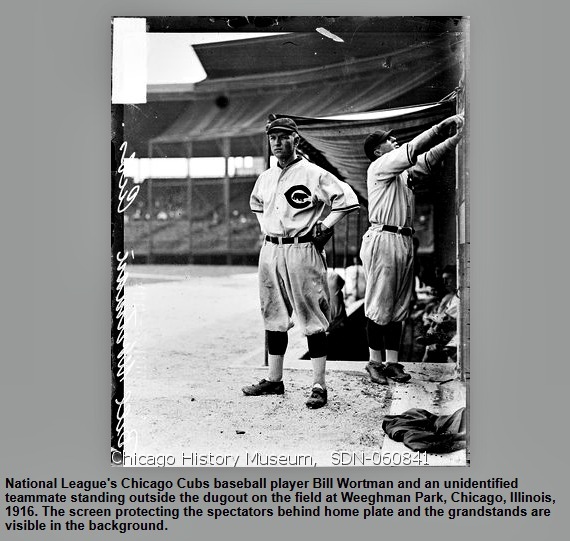 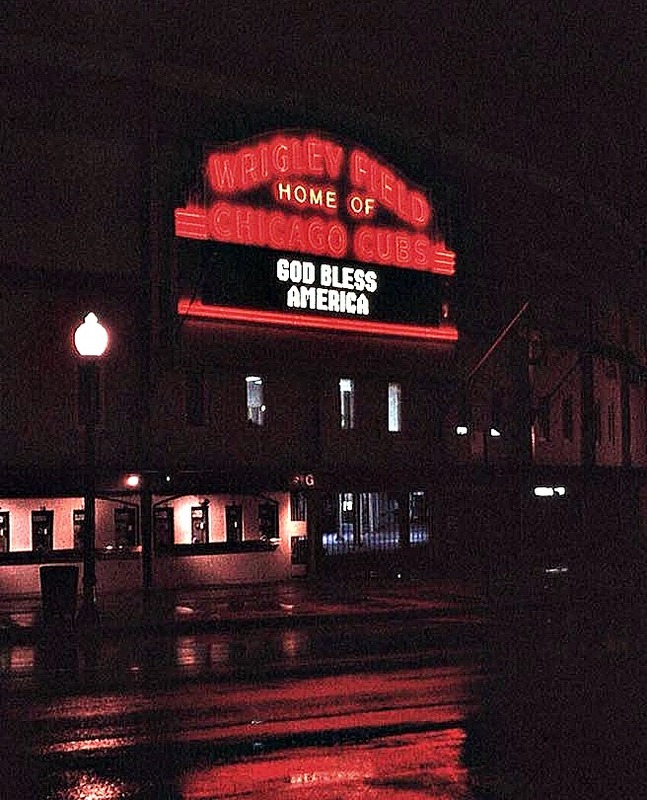 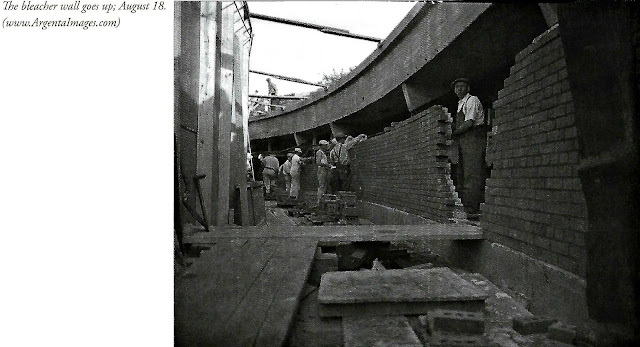 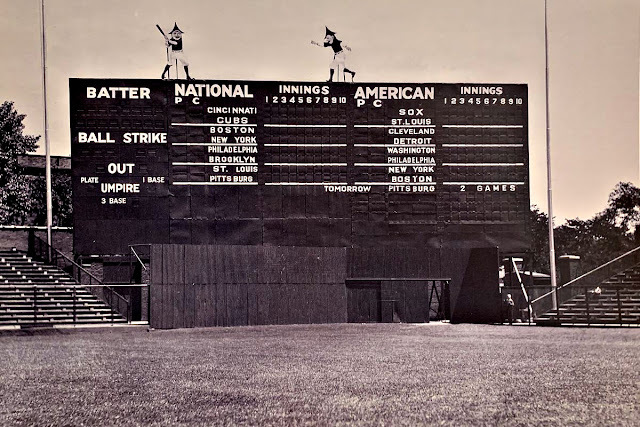 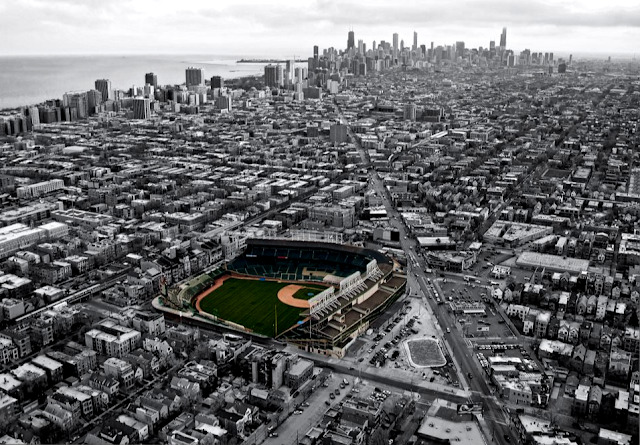 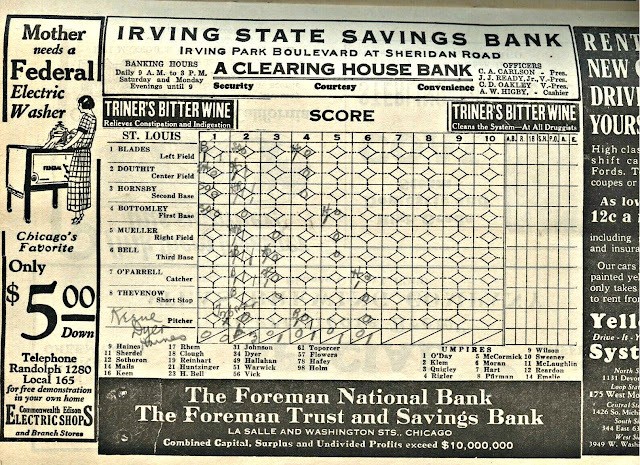 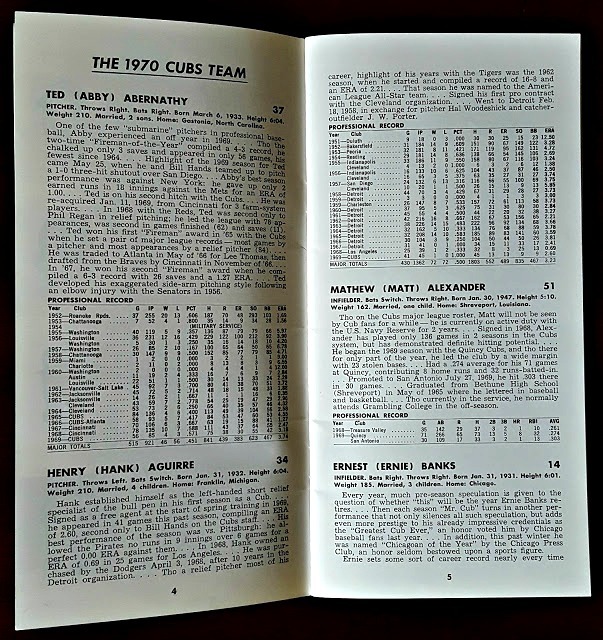 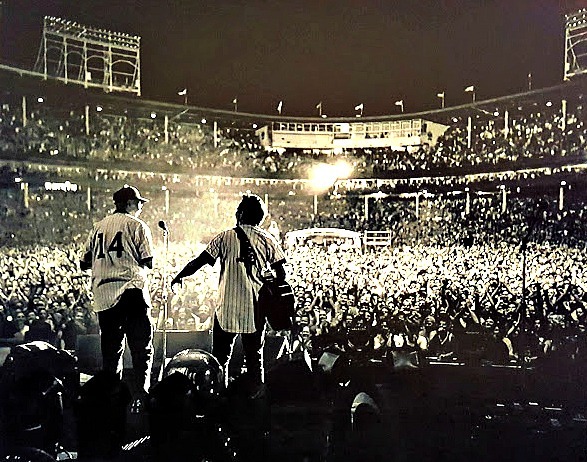 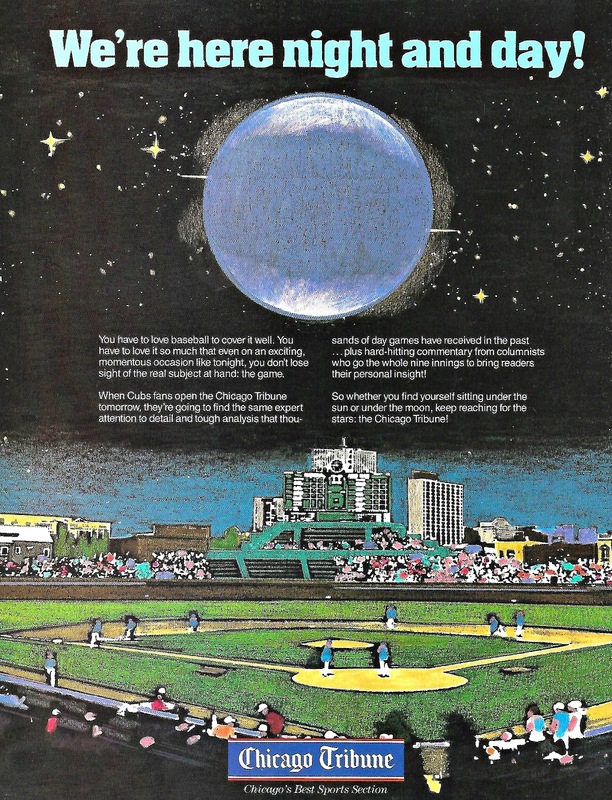 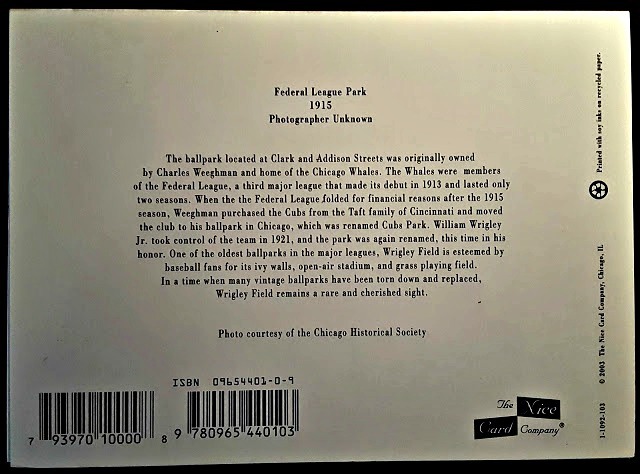 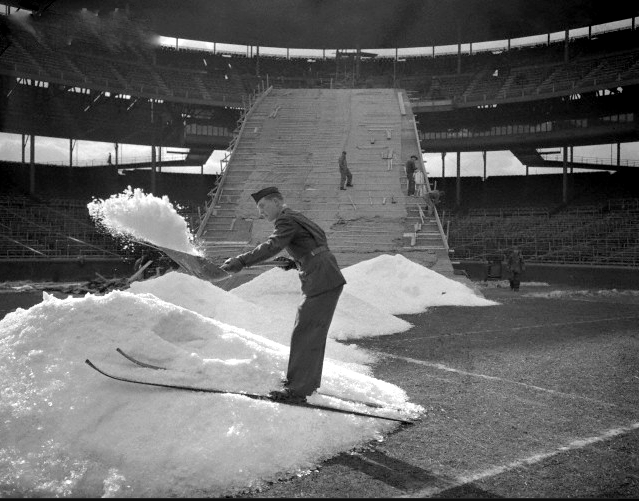 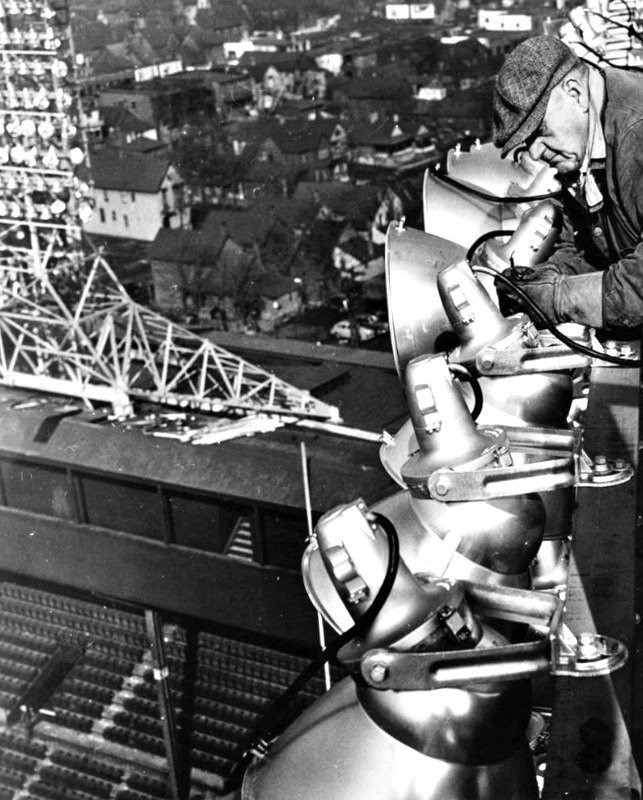 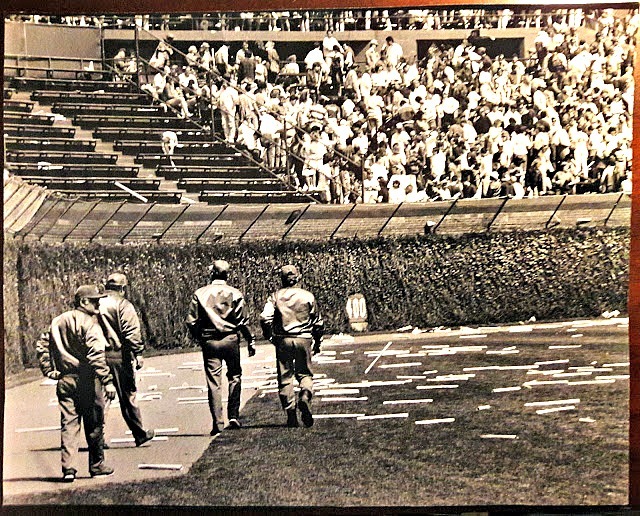 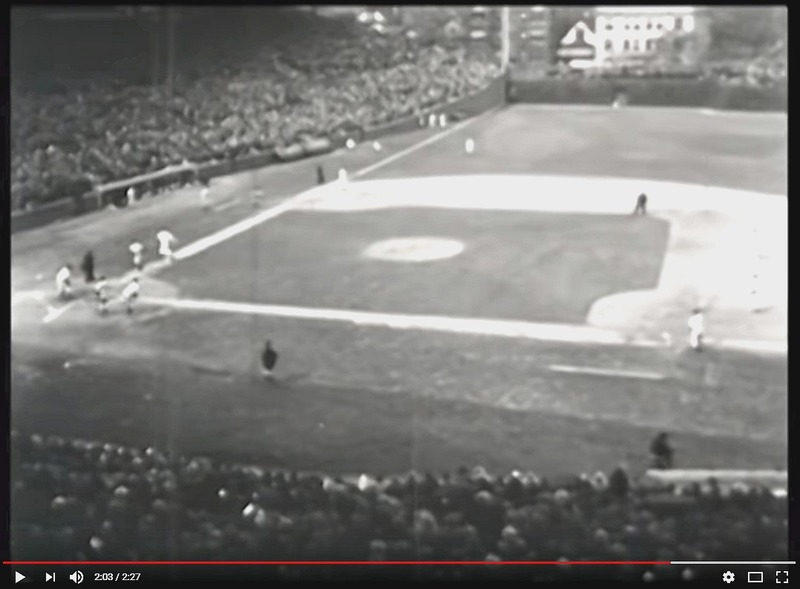 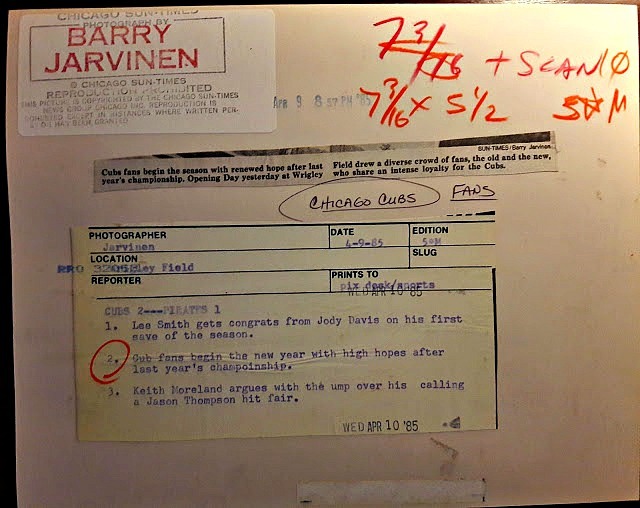 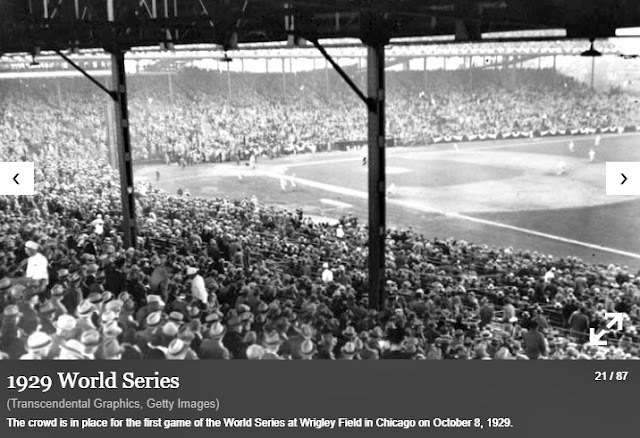 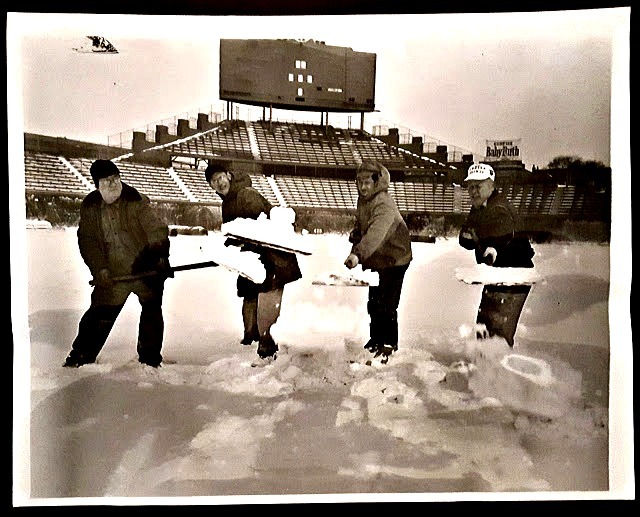 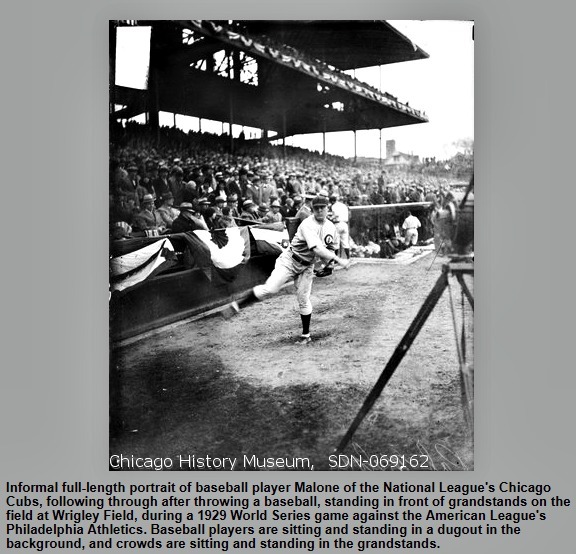 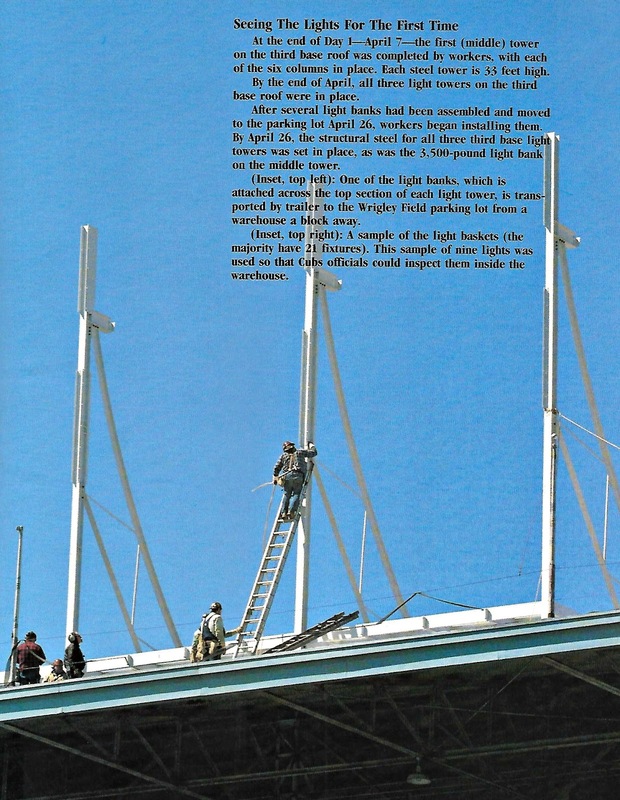 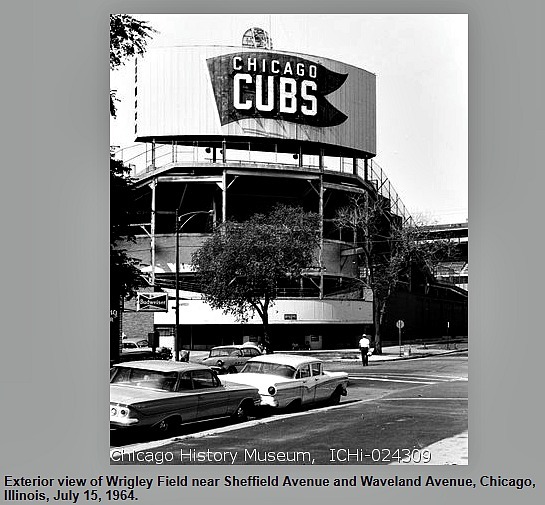 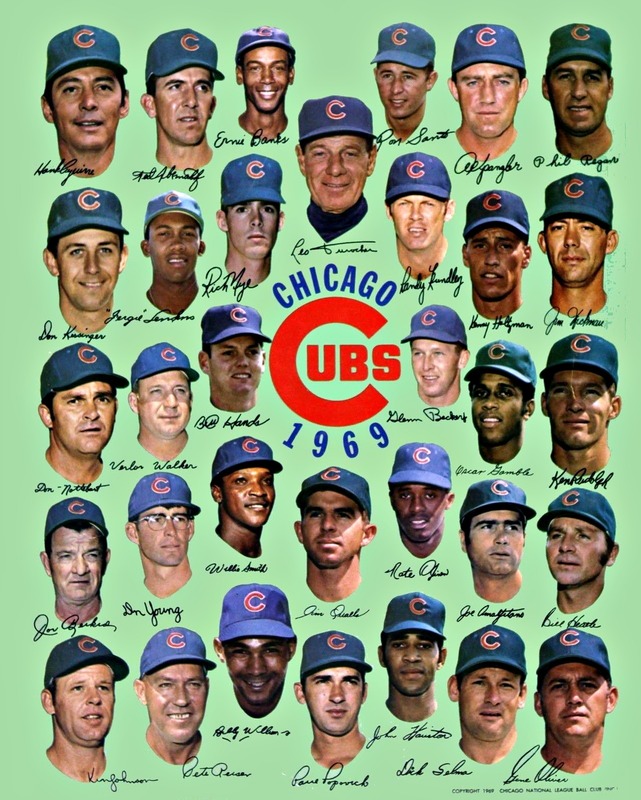 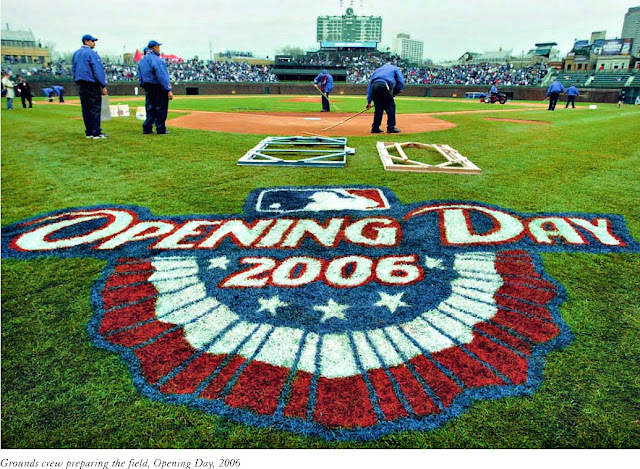 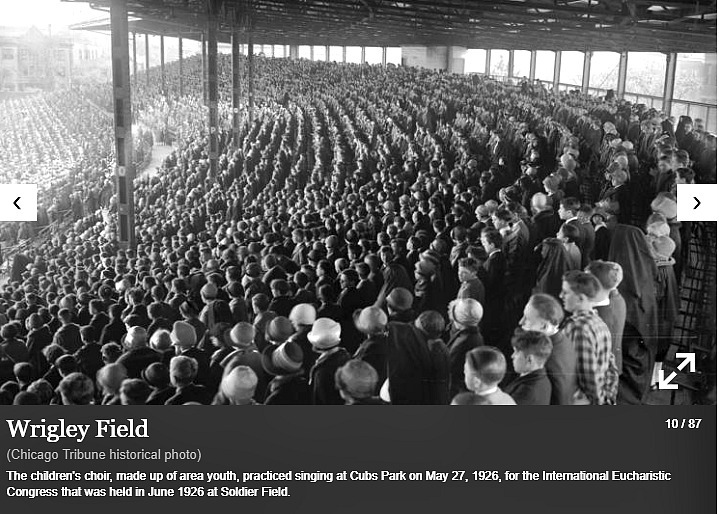 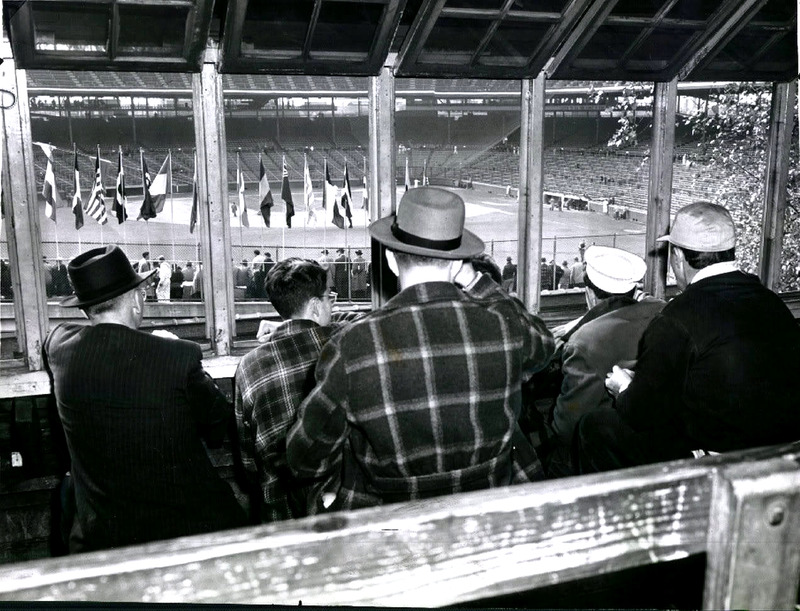 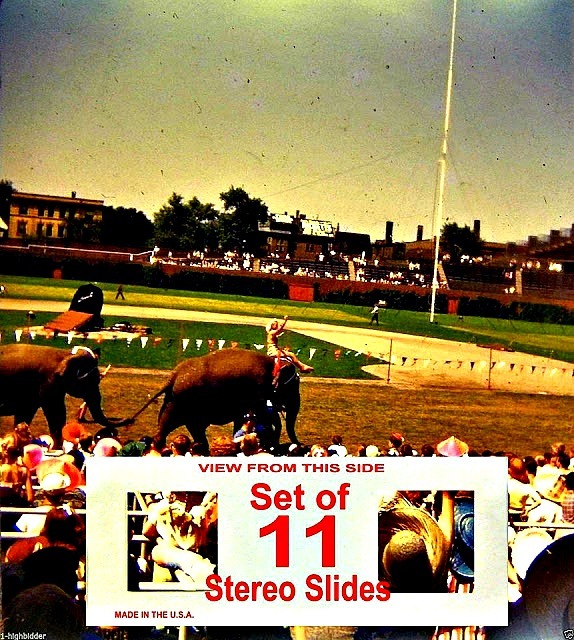 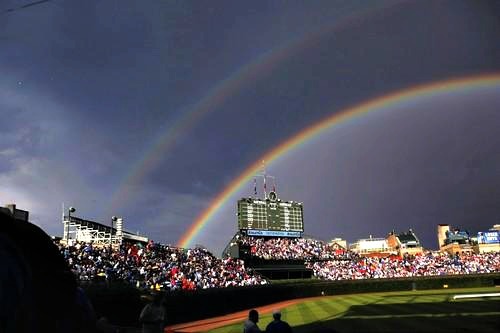 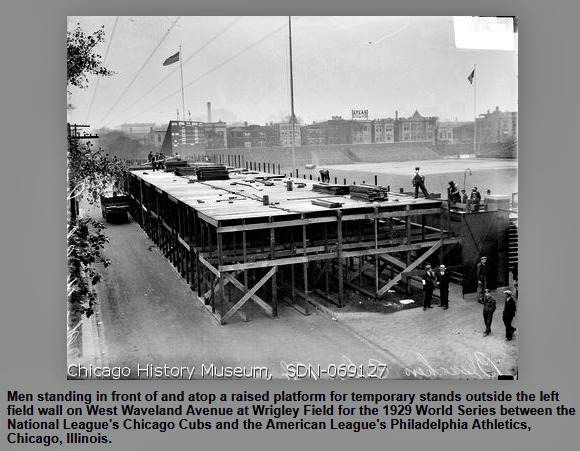 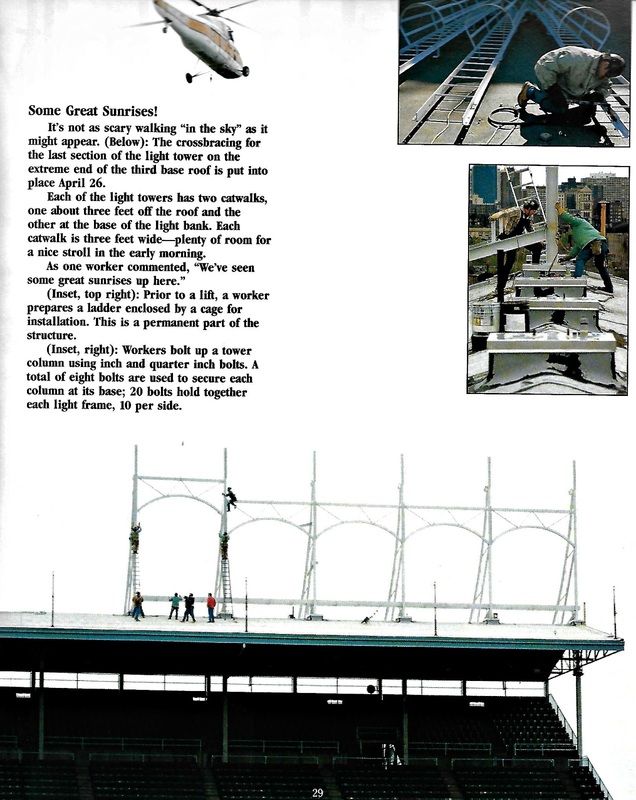 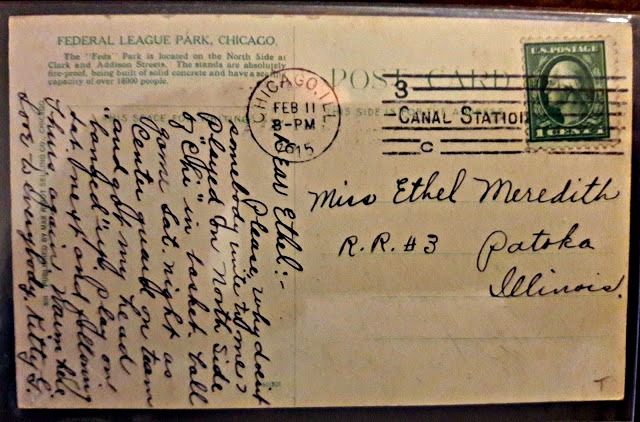 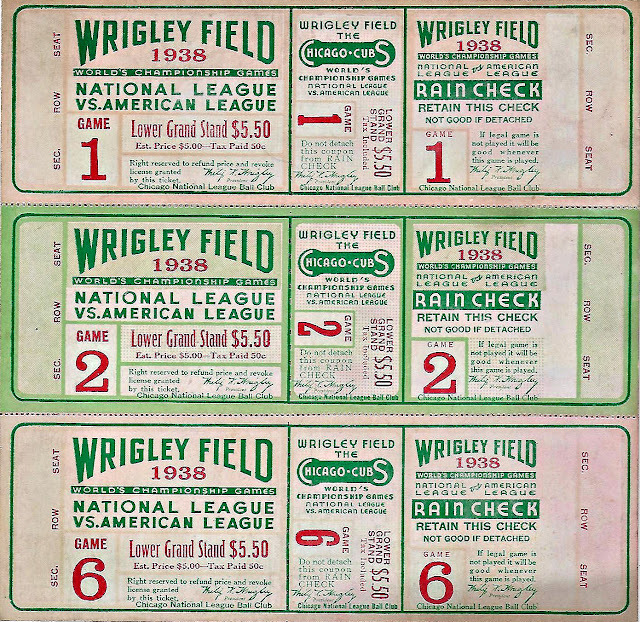 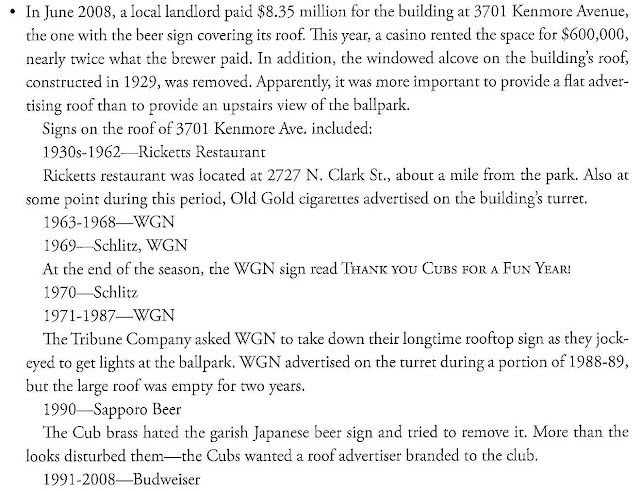 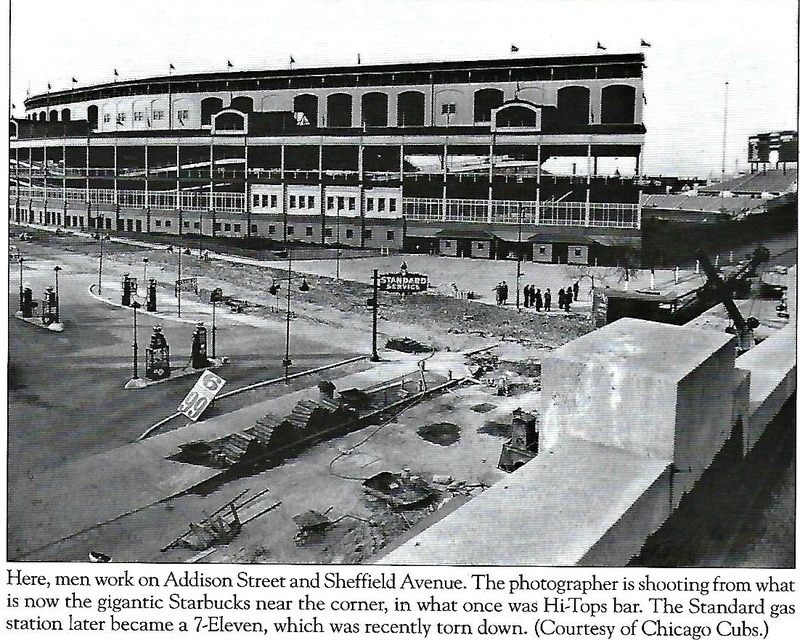 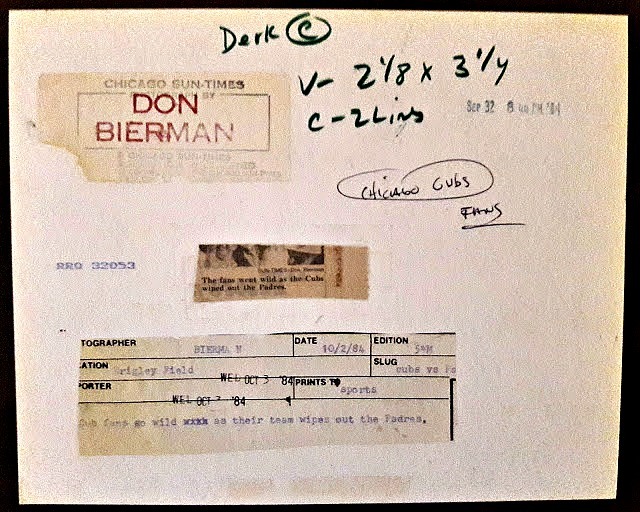 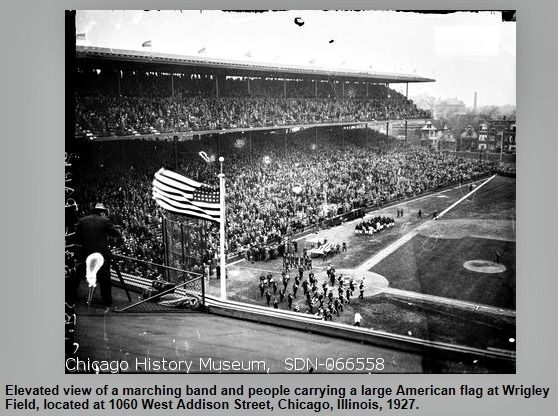 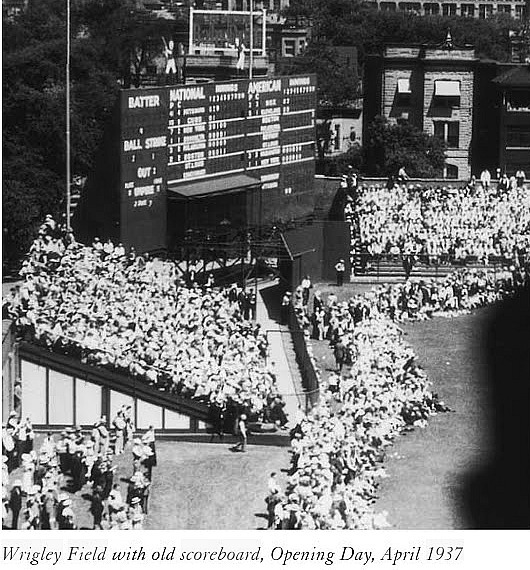 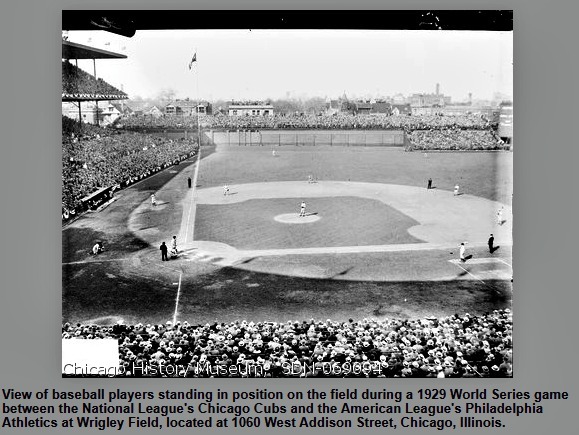 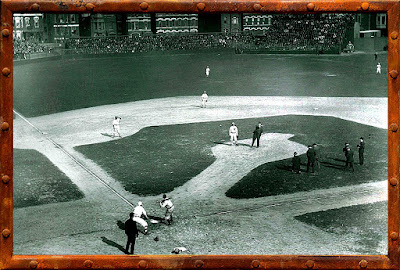 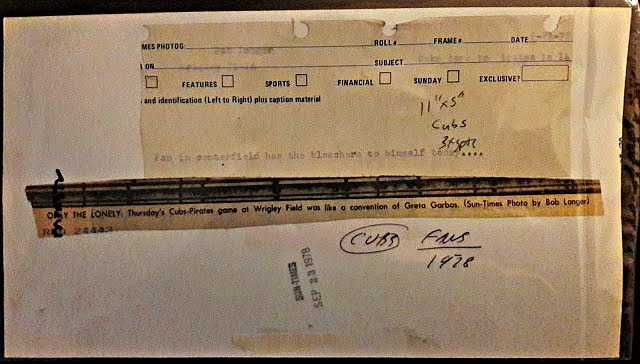 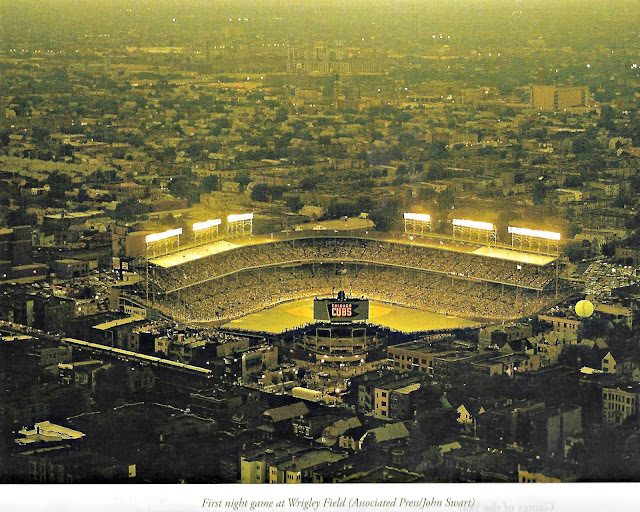 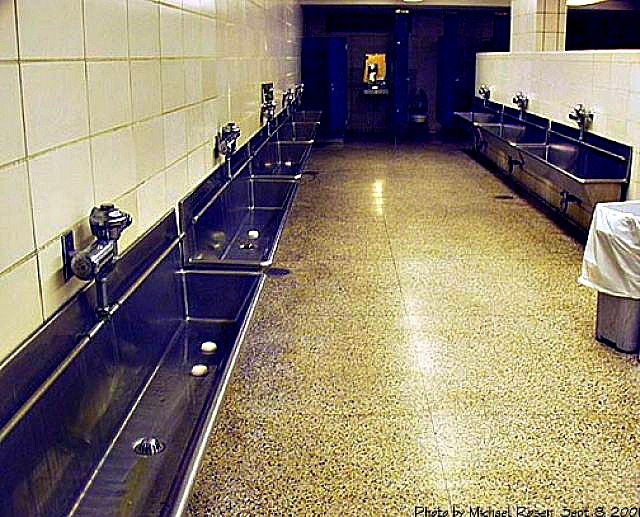 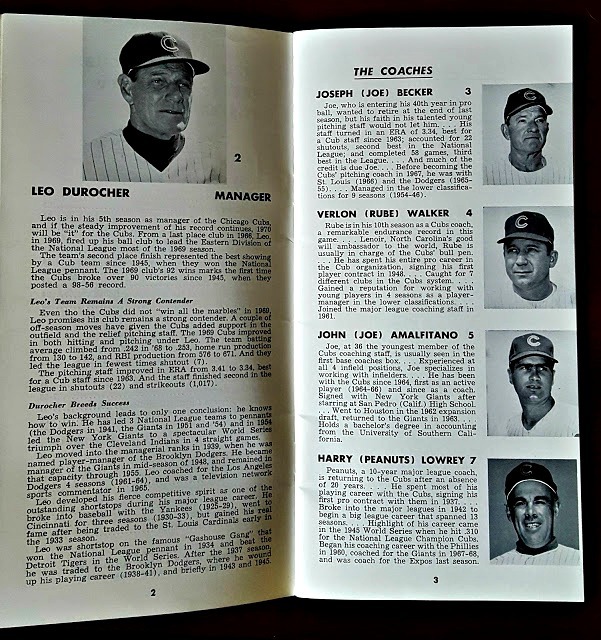 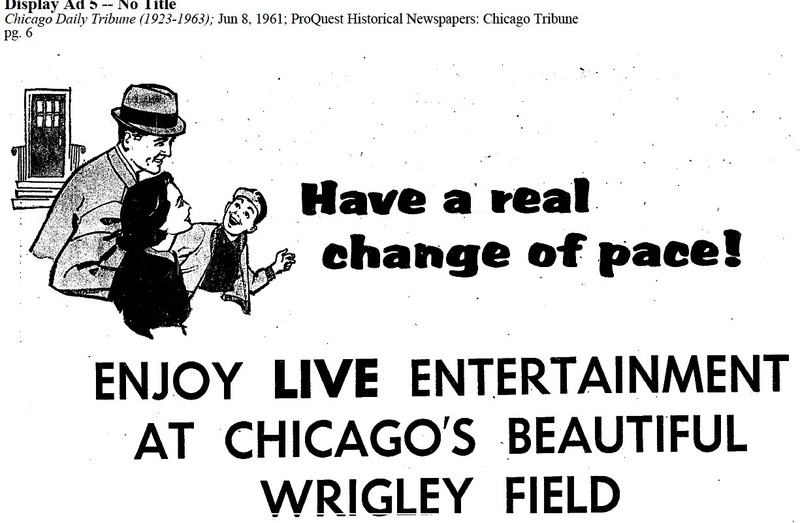 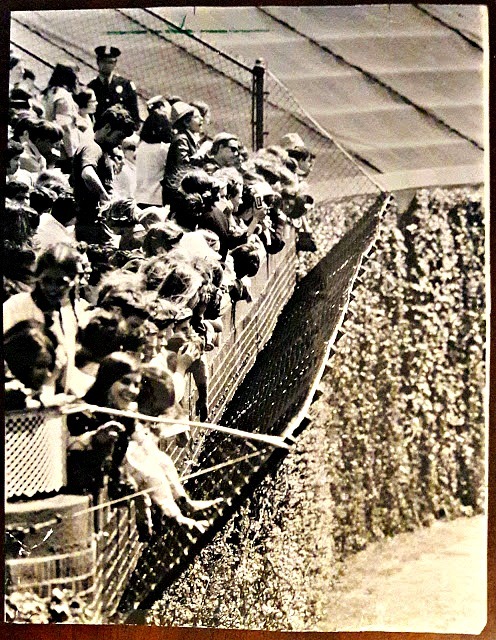 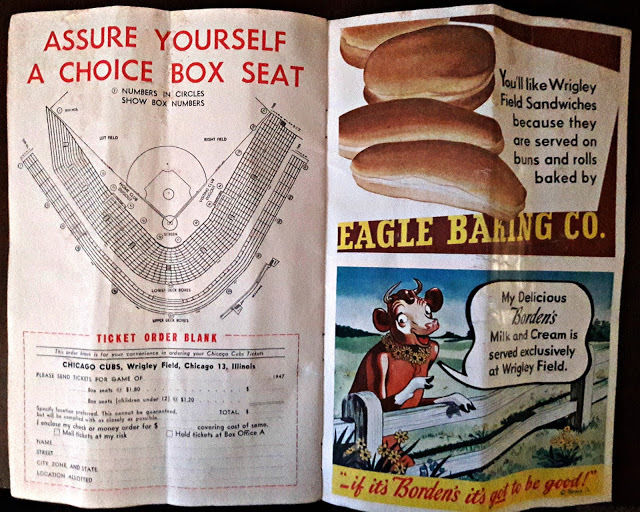 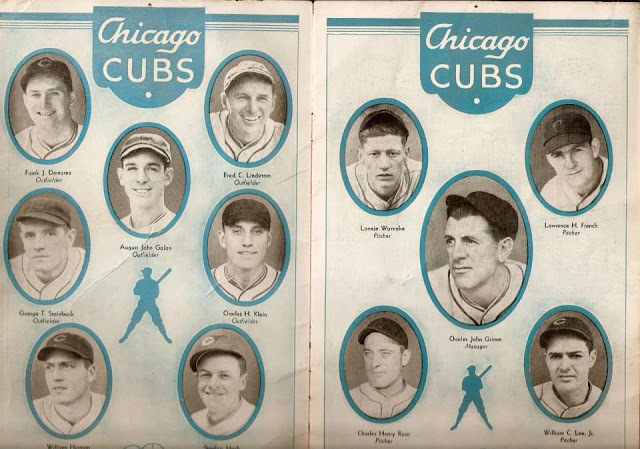 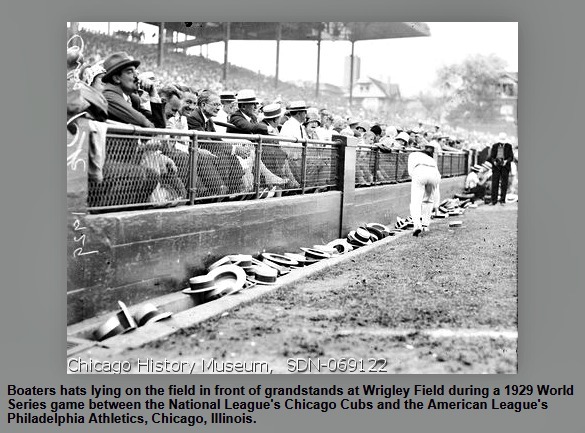 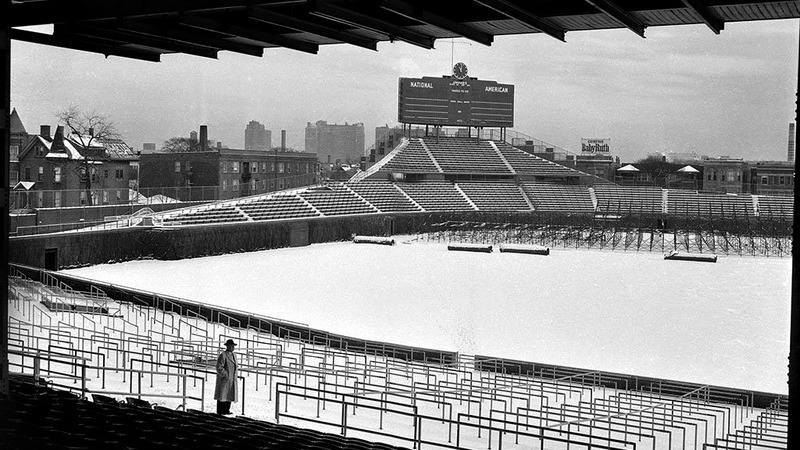 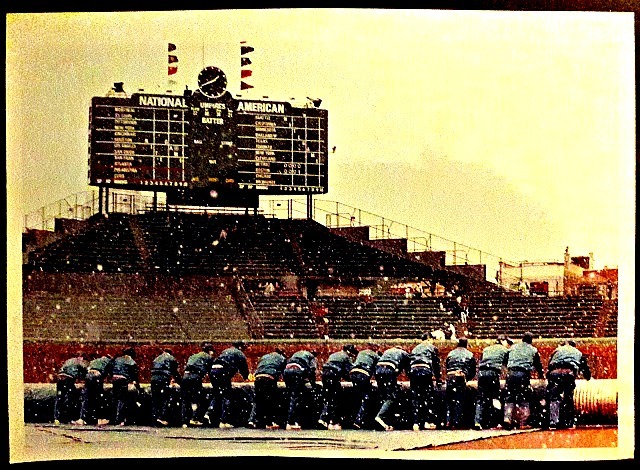 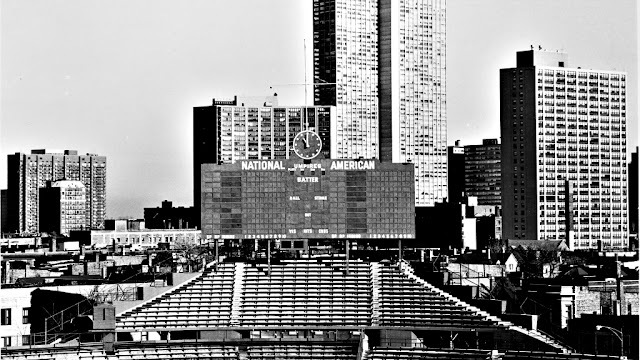 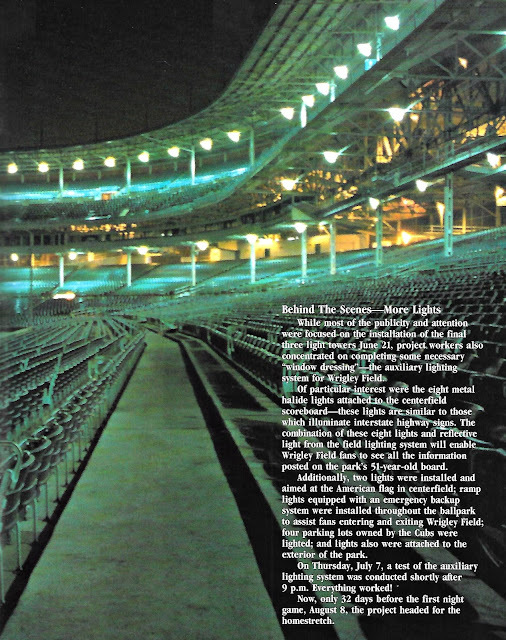 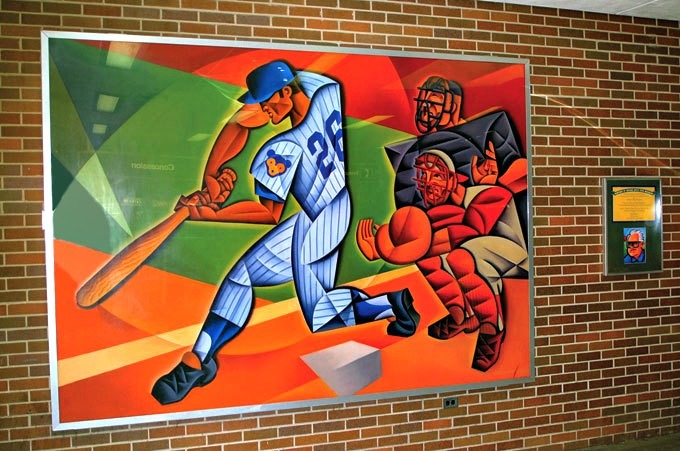 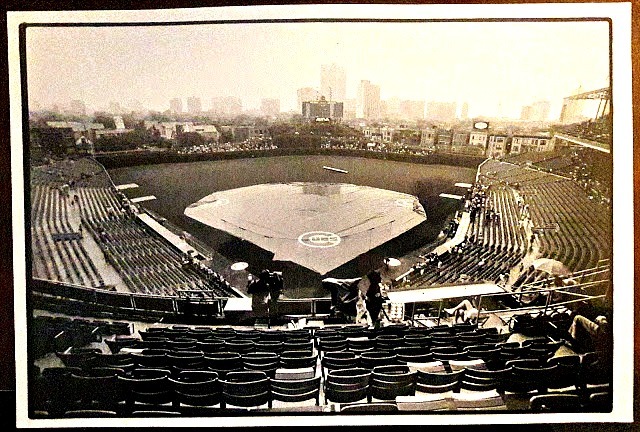 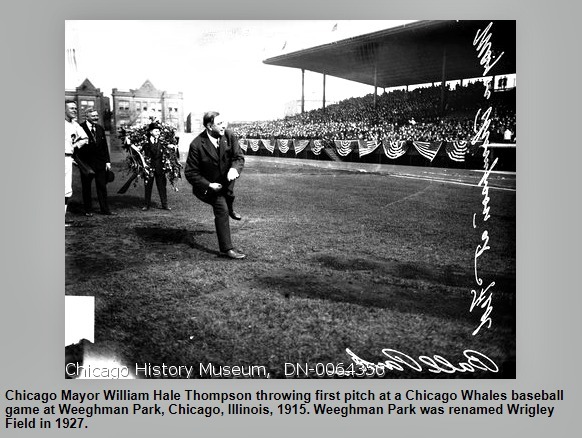 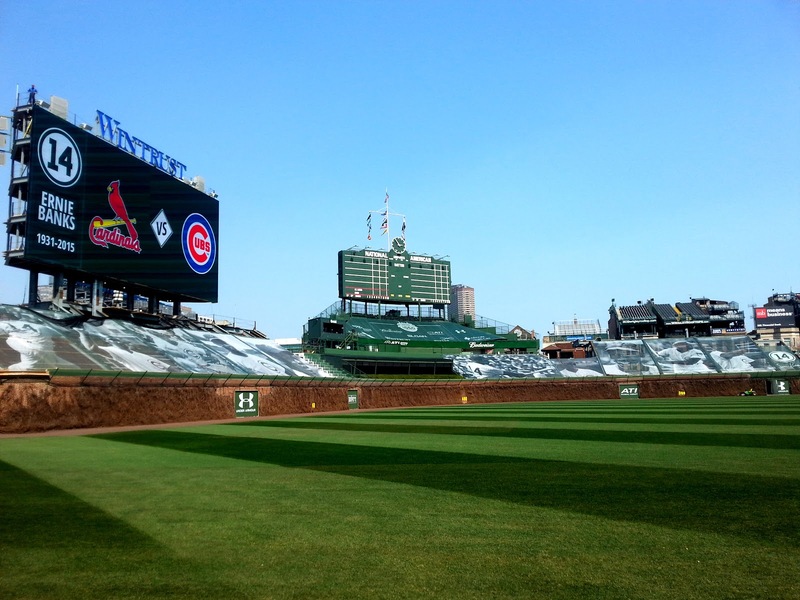 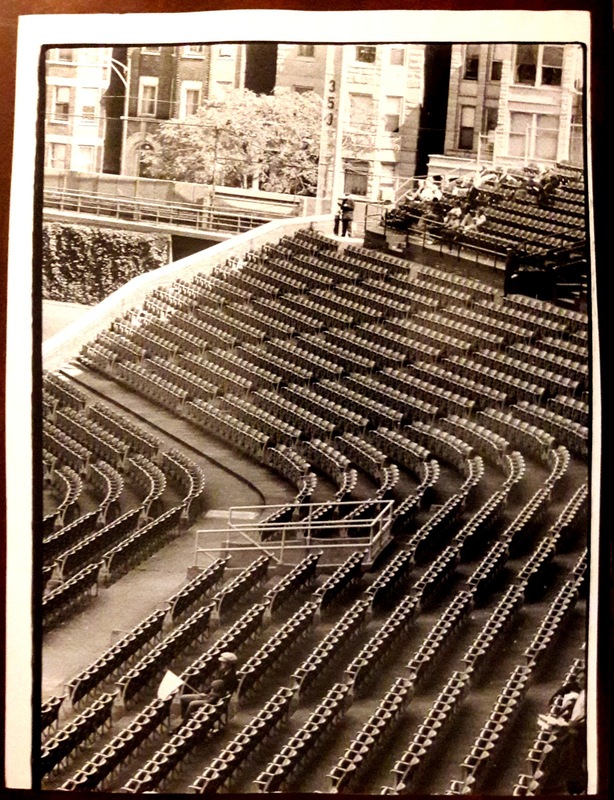 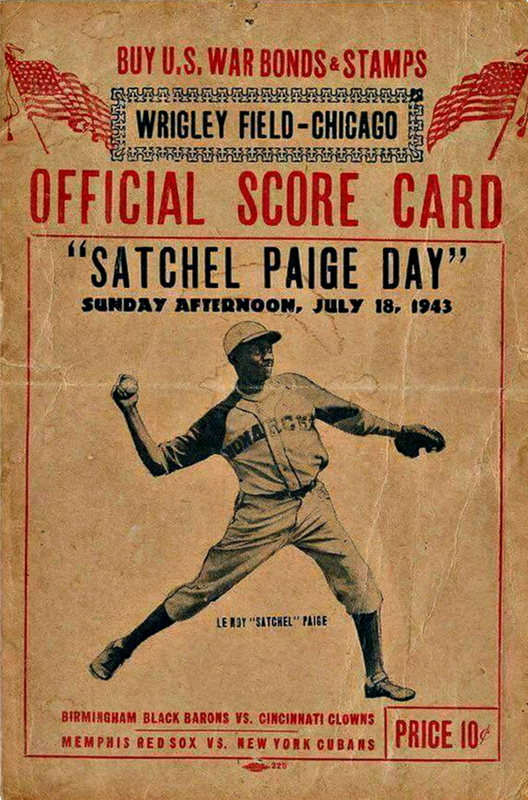 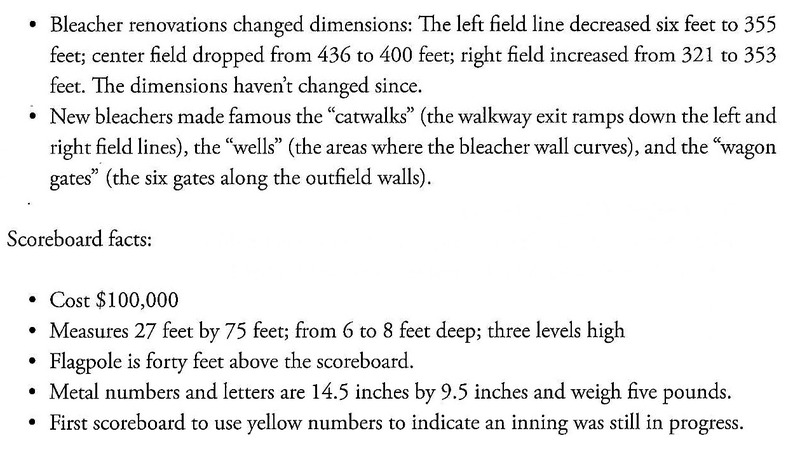 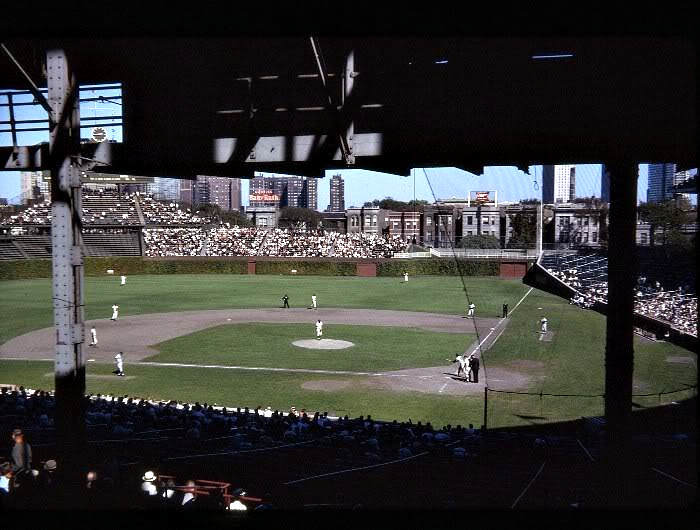 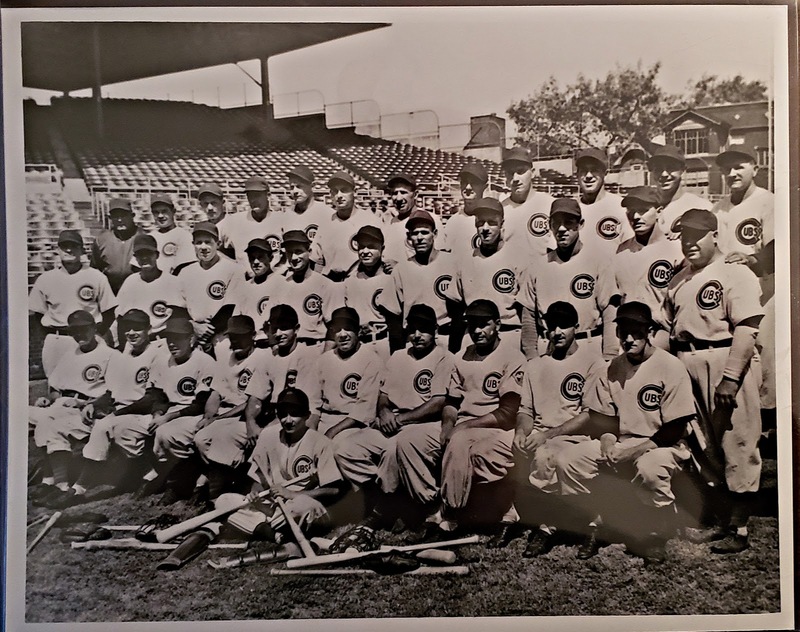 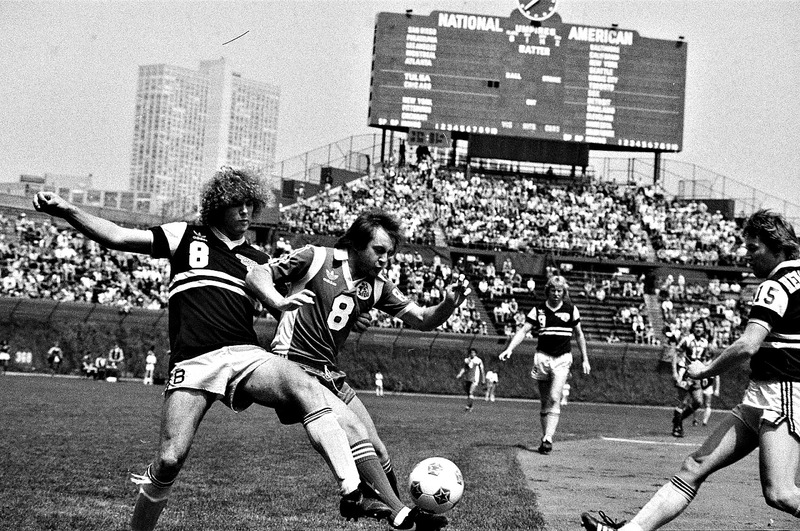 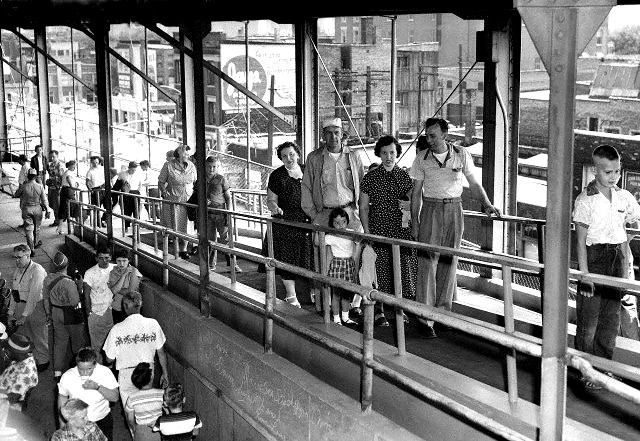 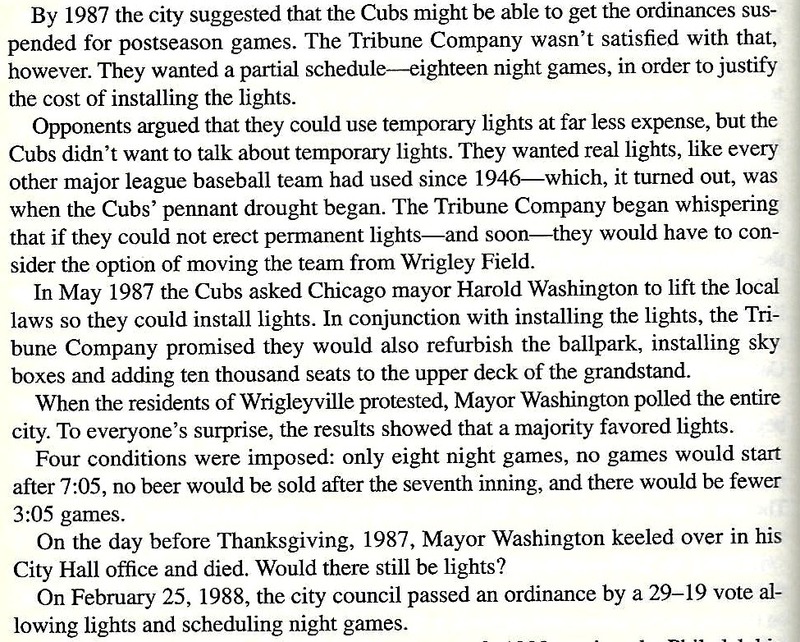 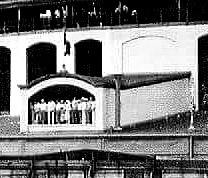 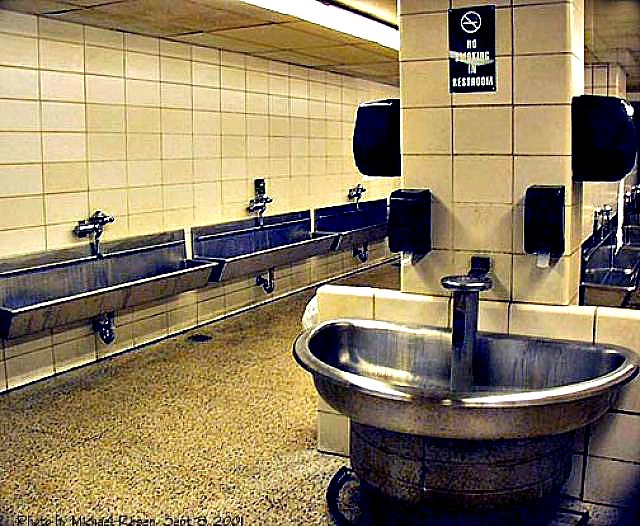 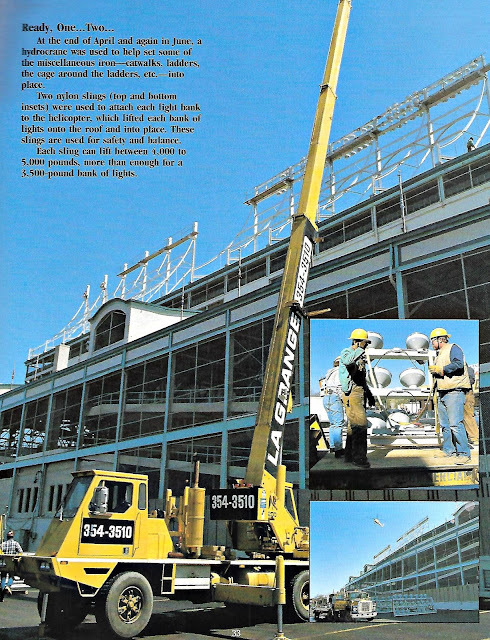 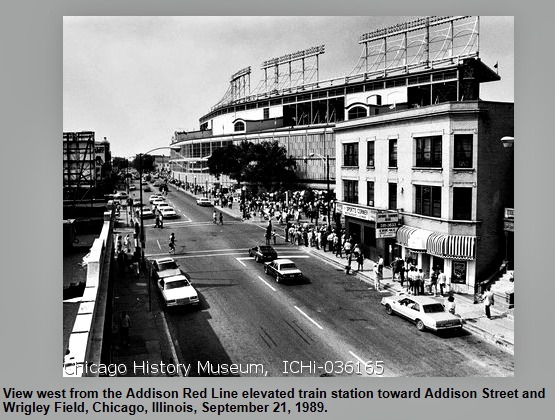 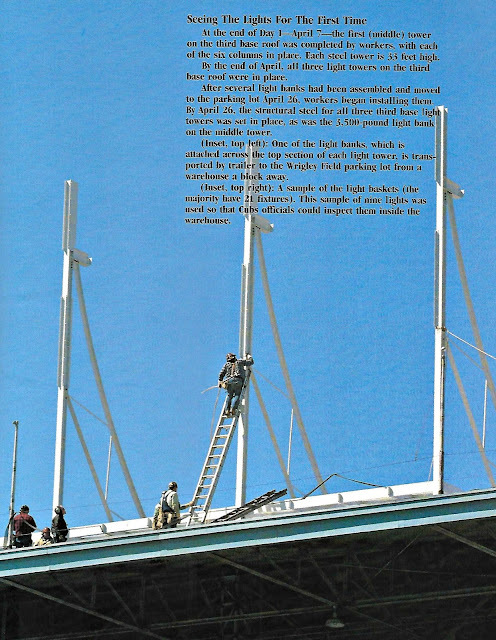 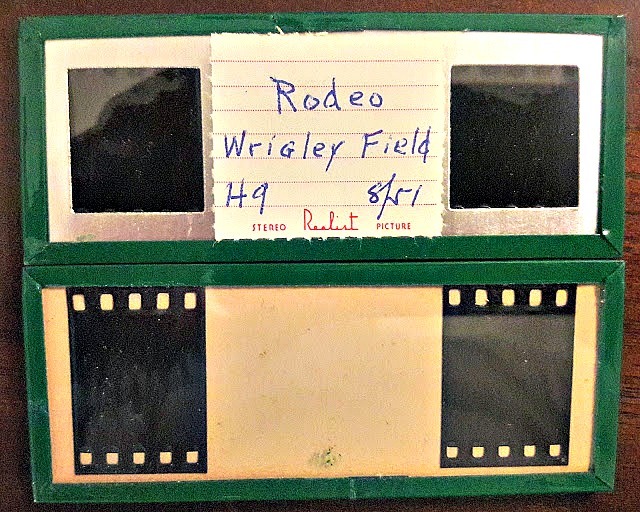 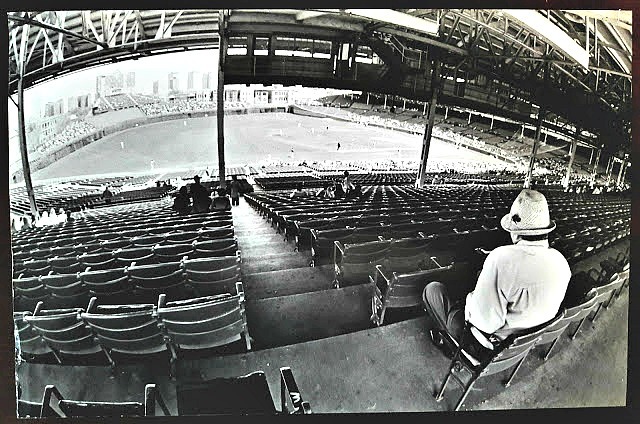 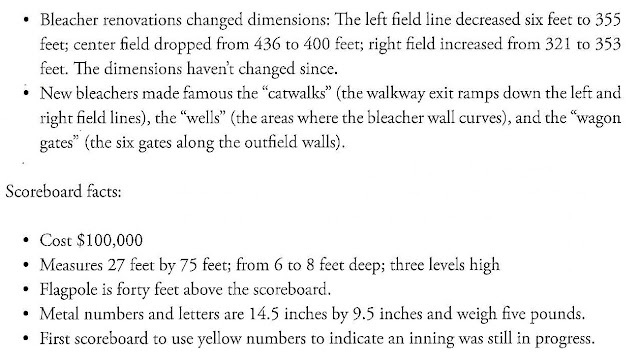 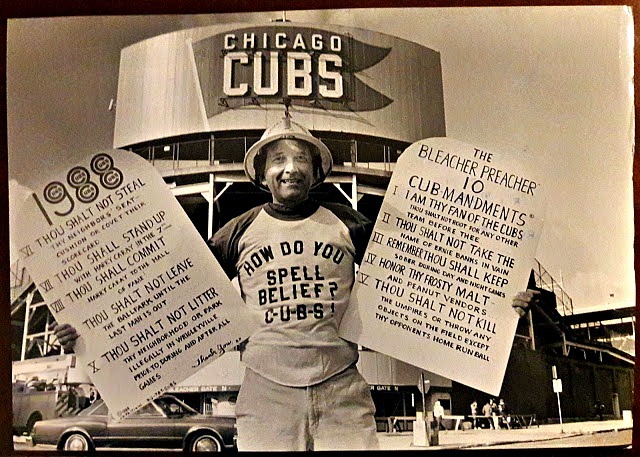 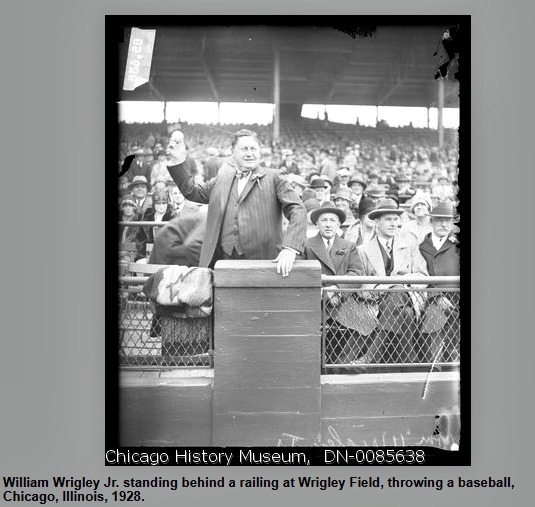 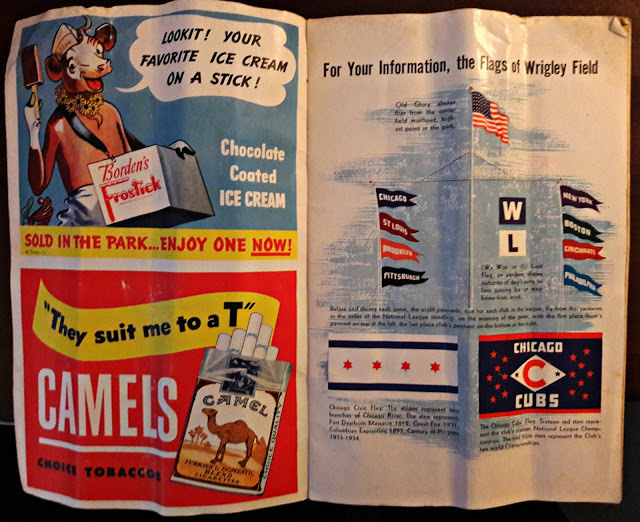 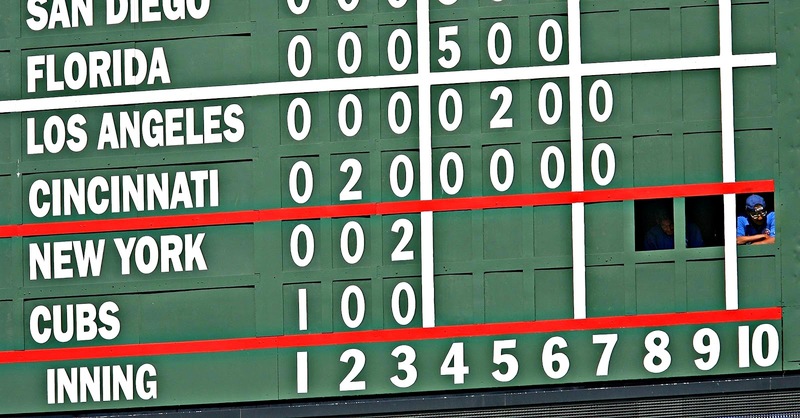 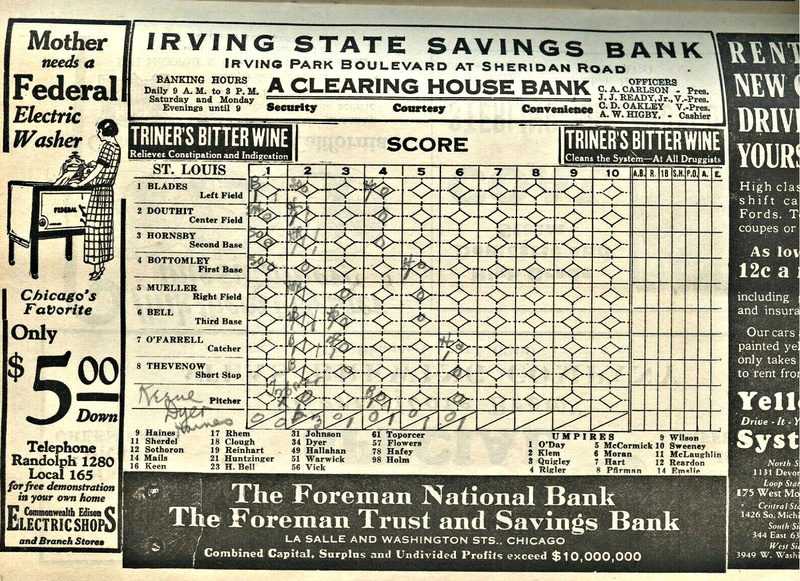 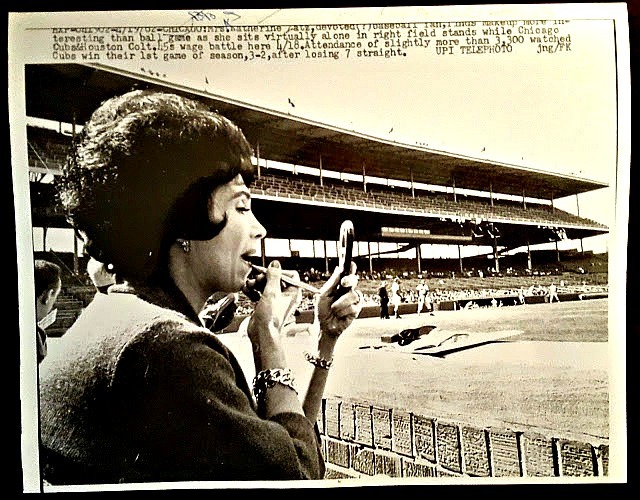 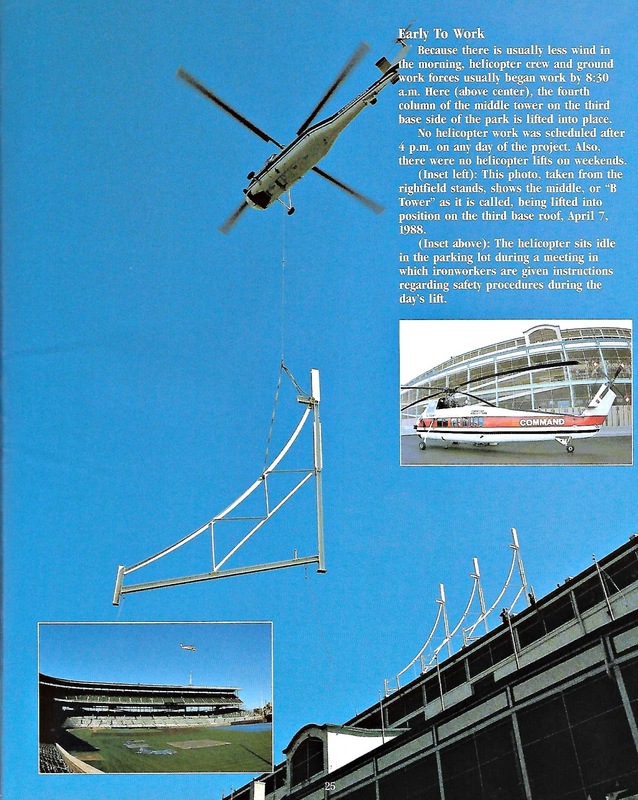 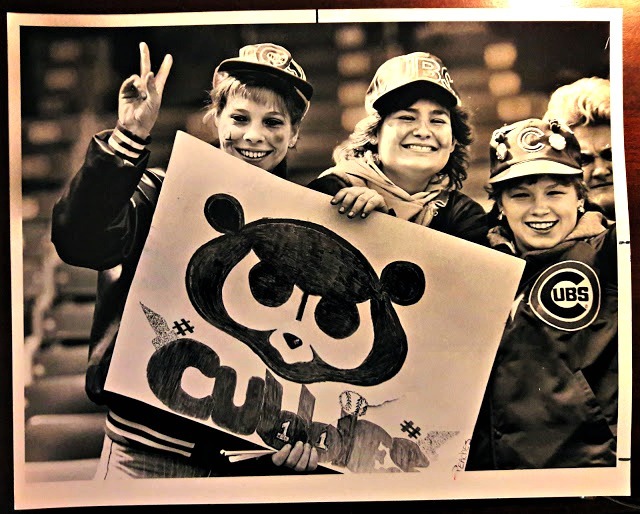 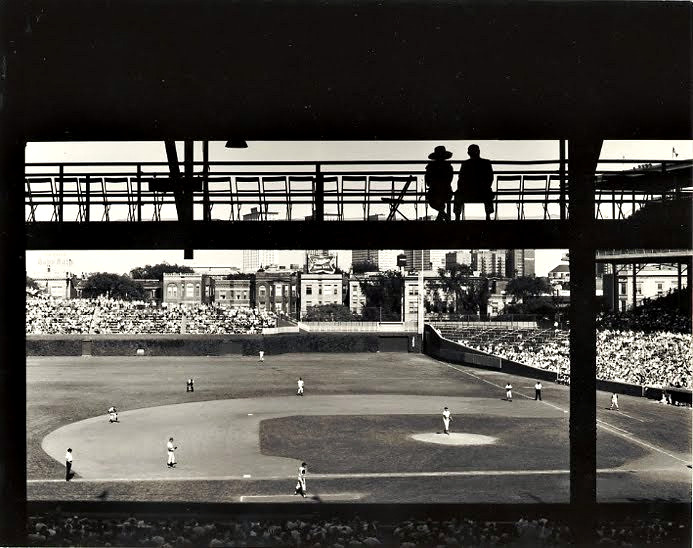 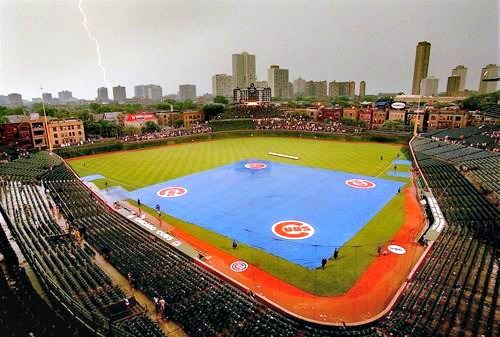 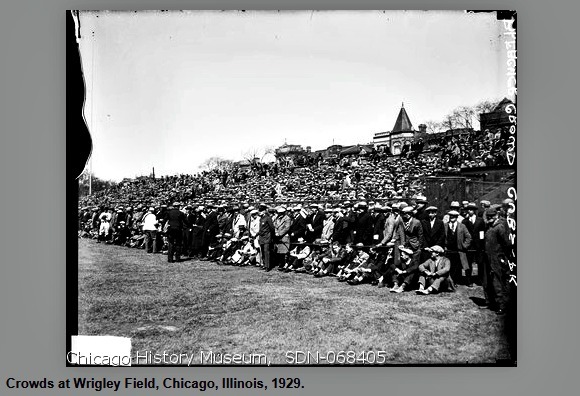 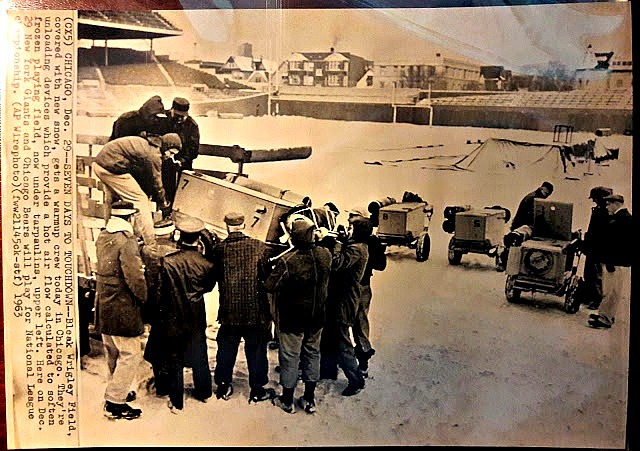 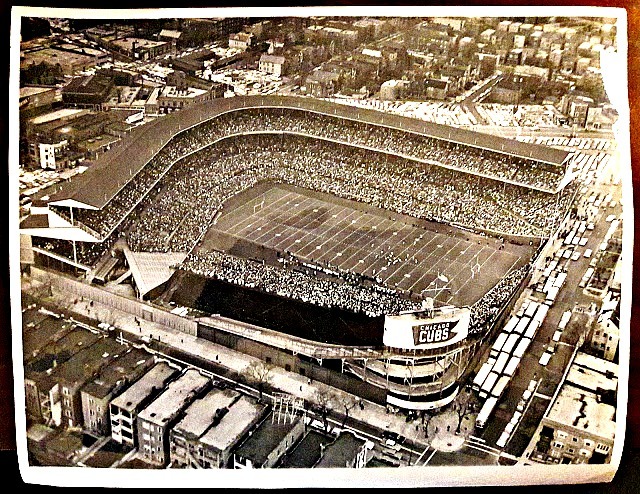 images below via Chicago National League Ball Park, Inc. 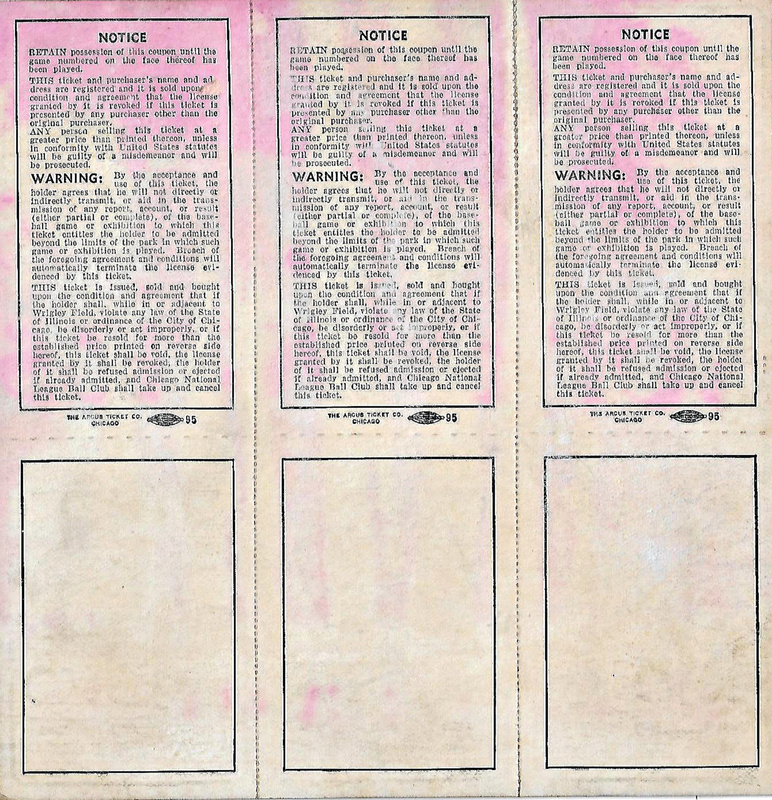 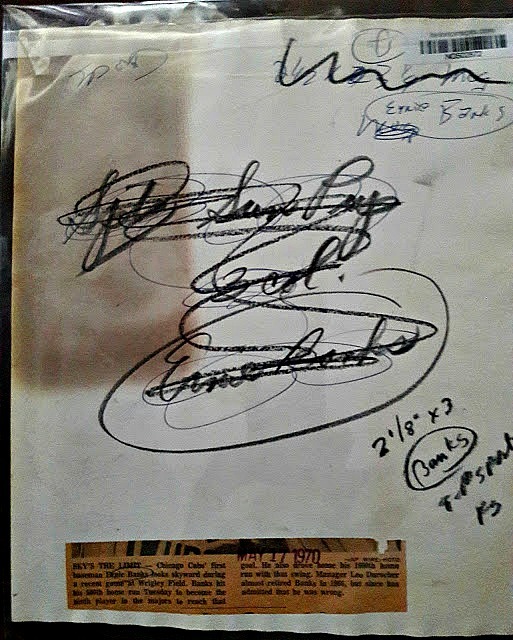 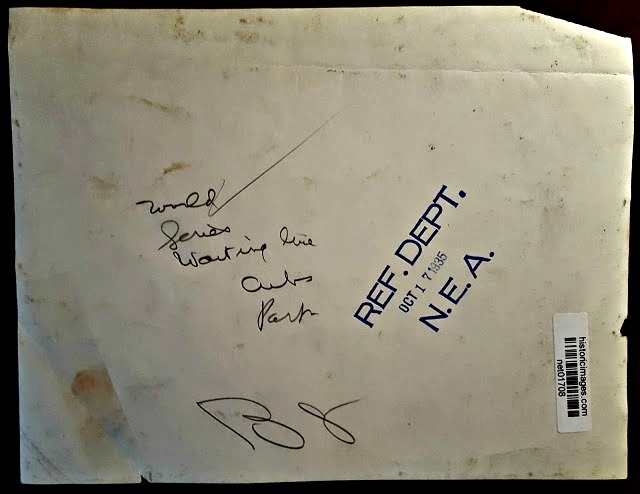 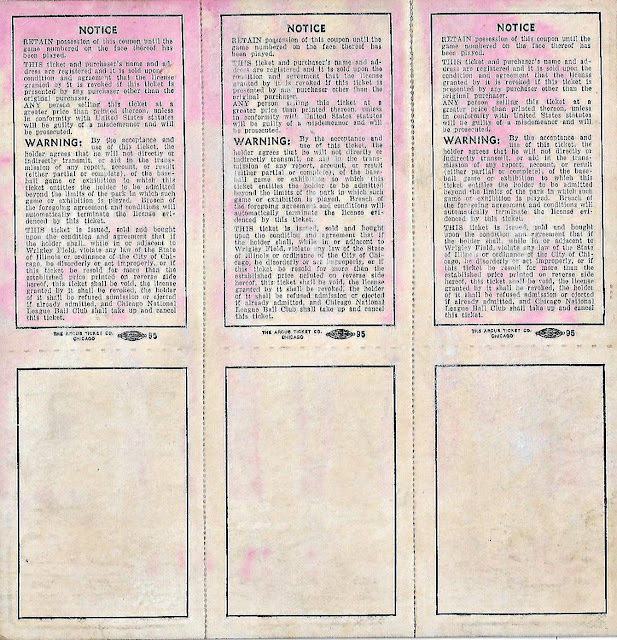 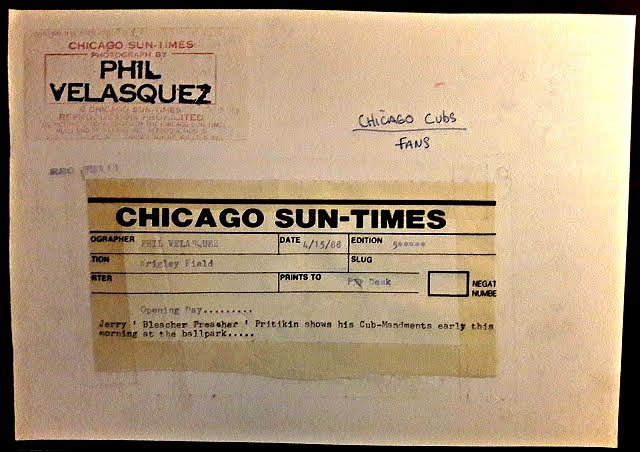 This document has been enforce since 1988 in its various forms. 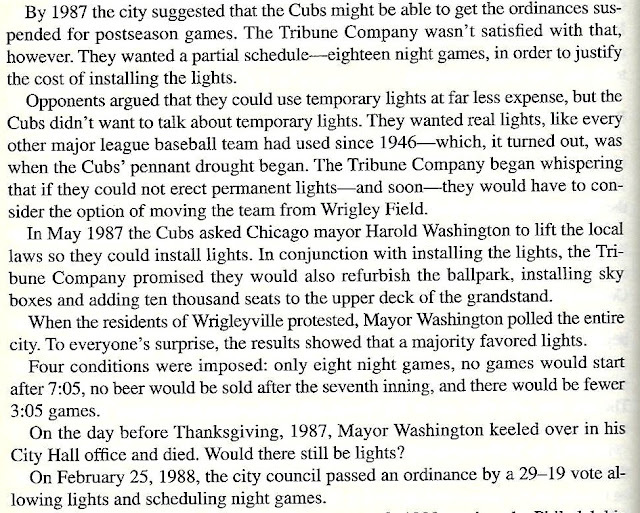 One constant in the agreement has been an annual meeting help during the months before the next season. 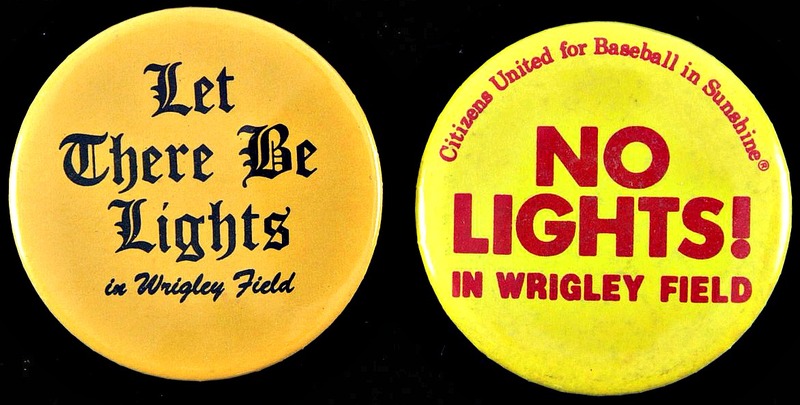 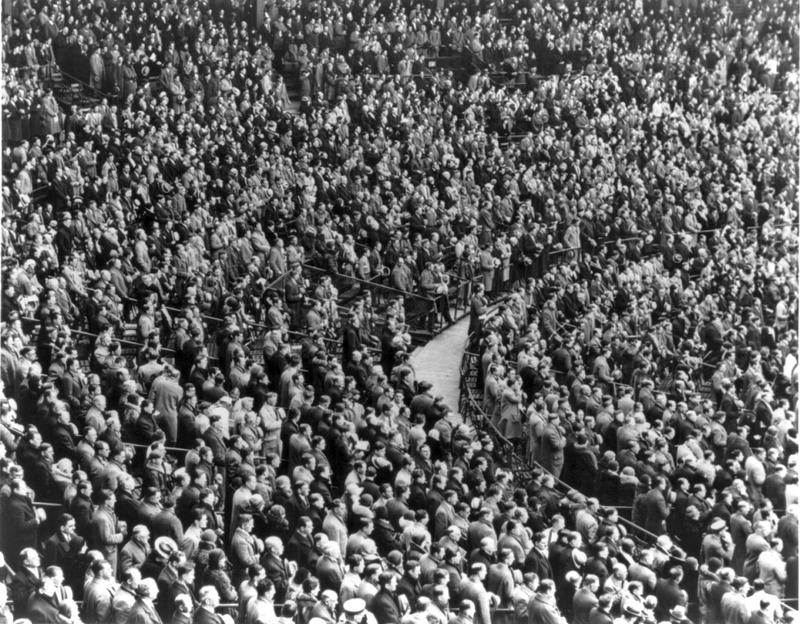 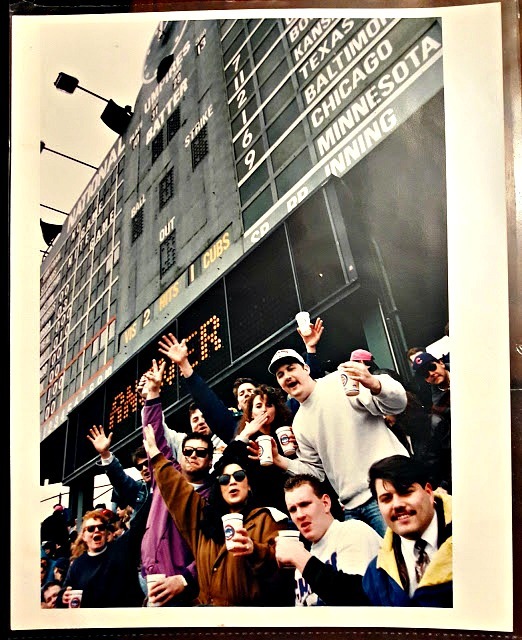 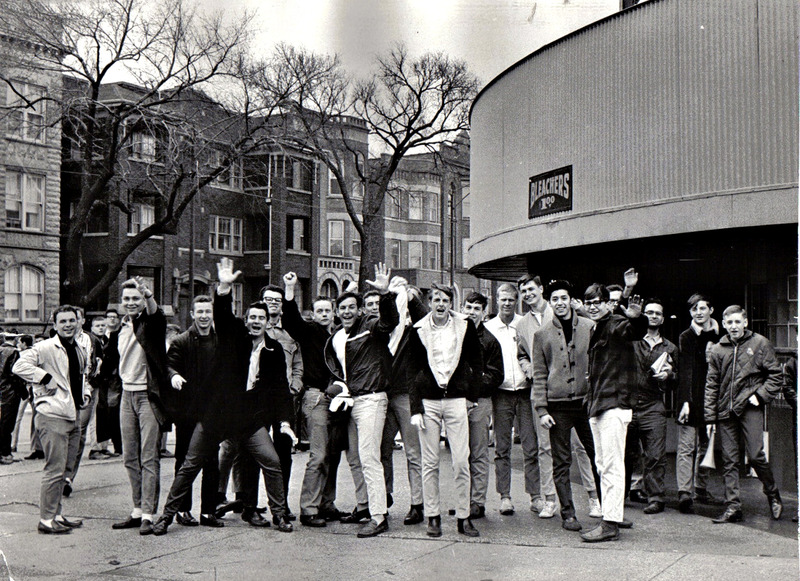 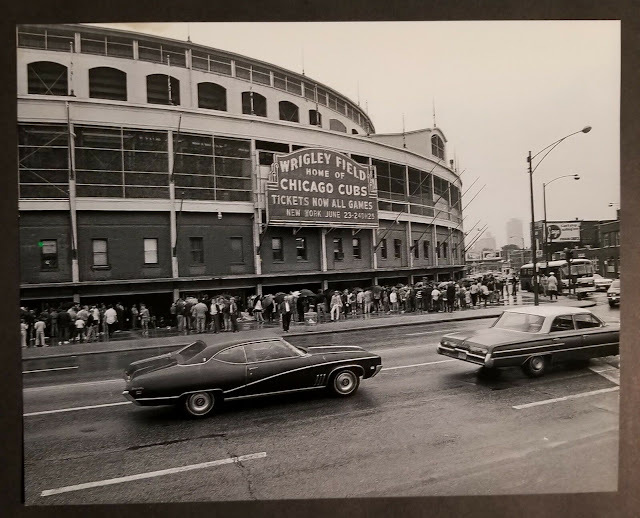 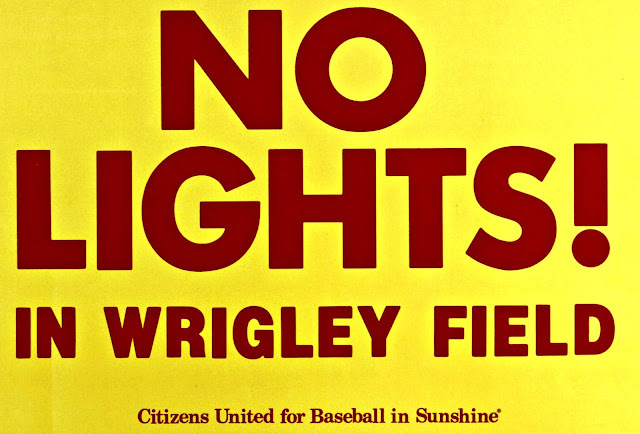 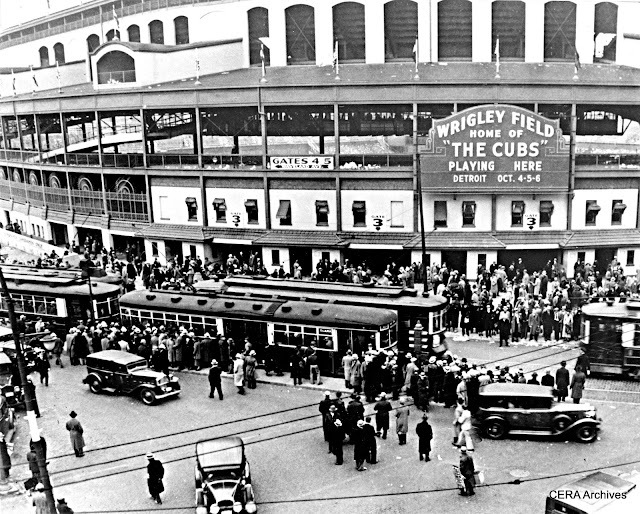 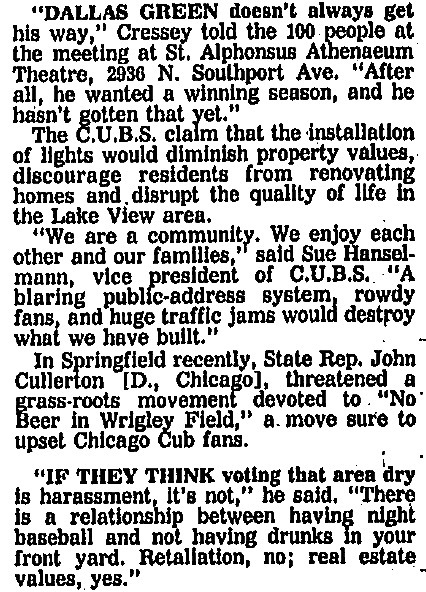 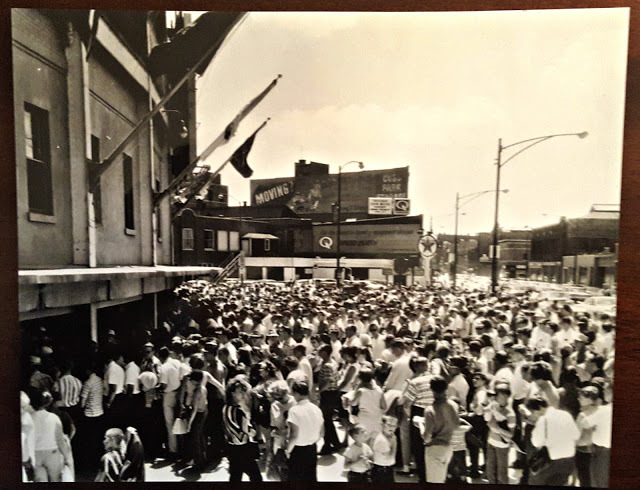 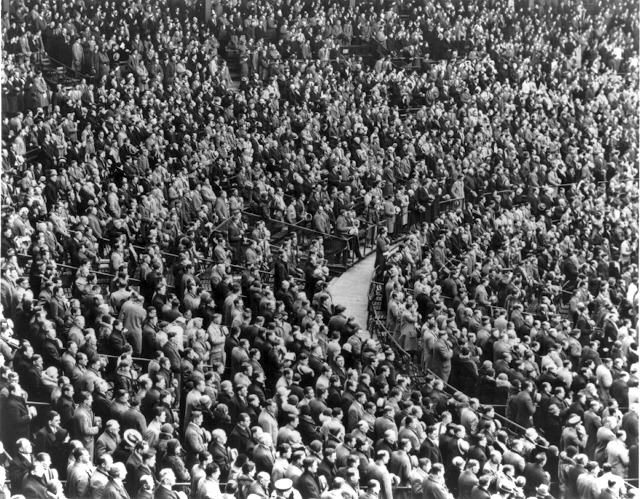 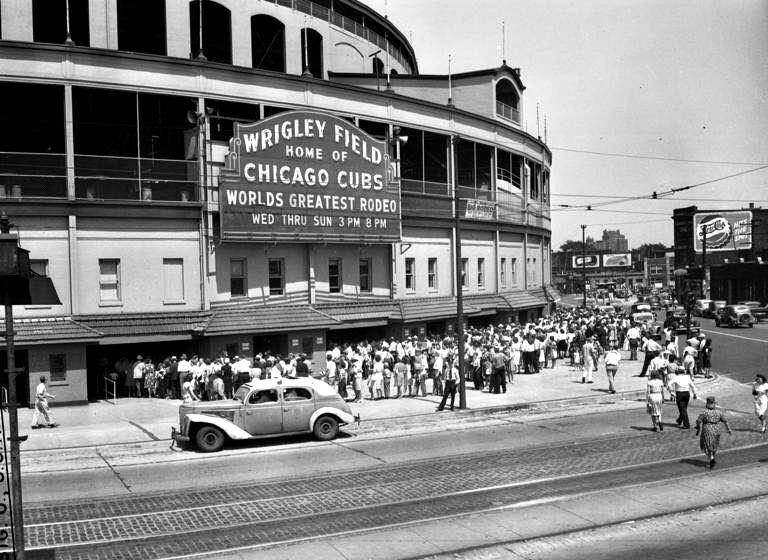 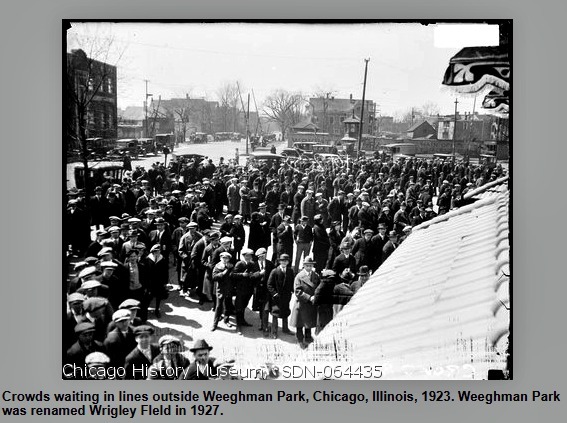 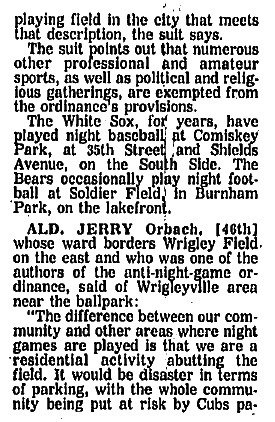 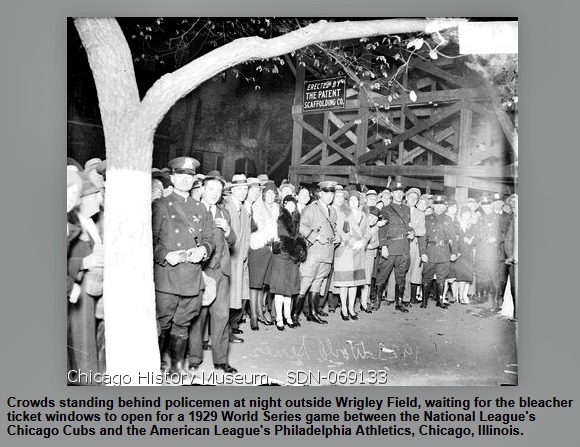 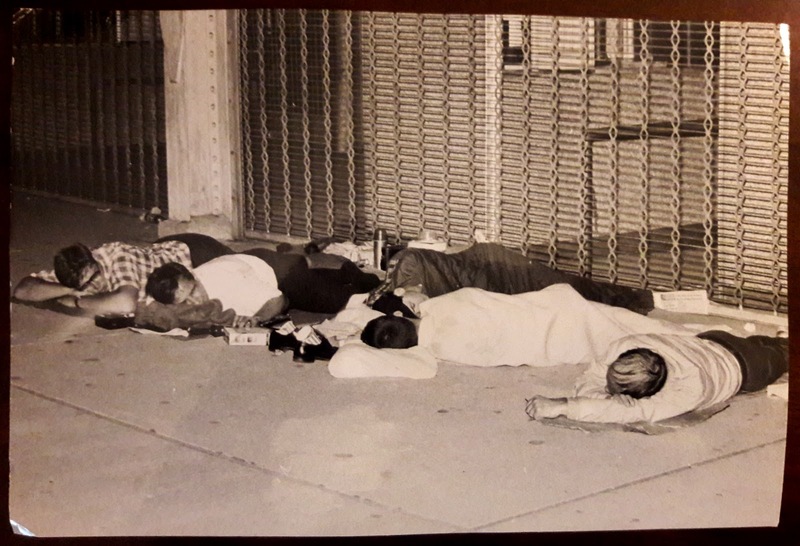 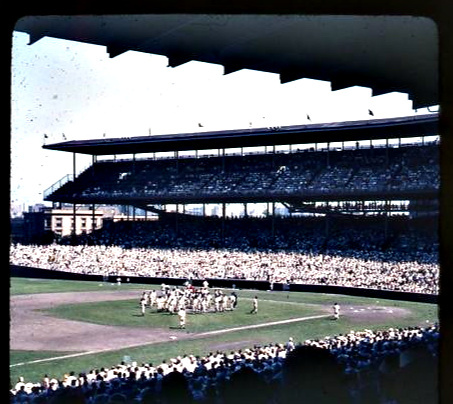 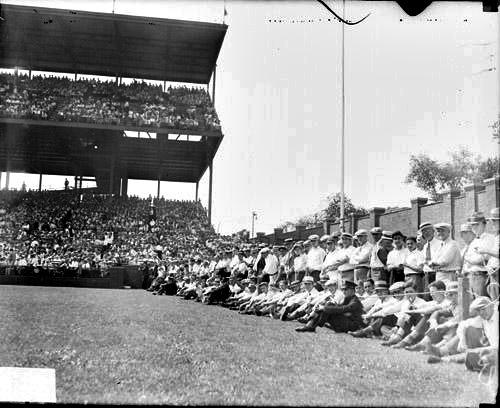 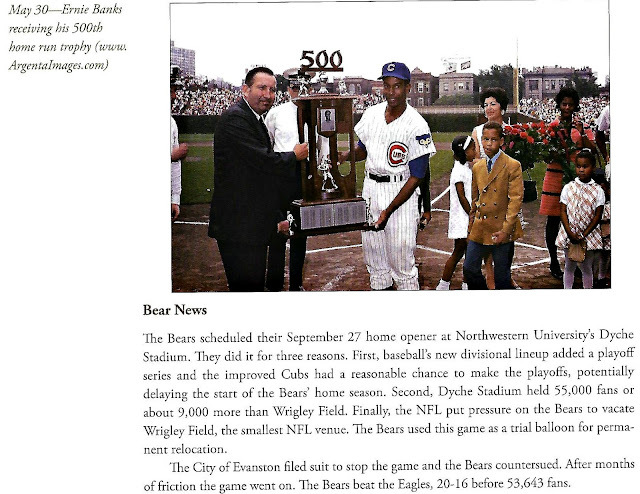 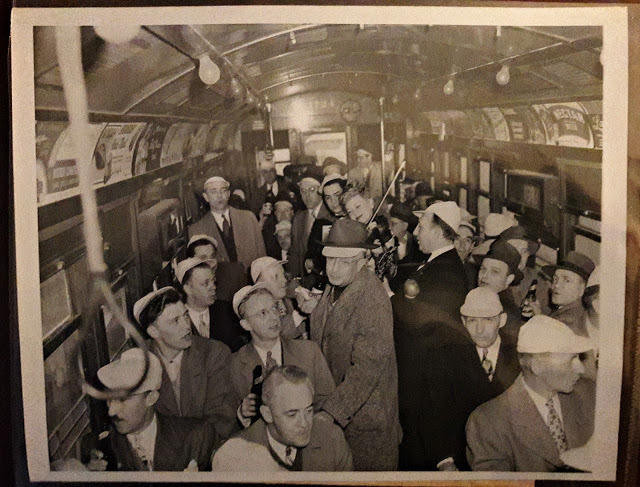 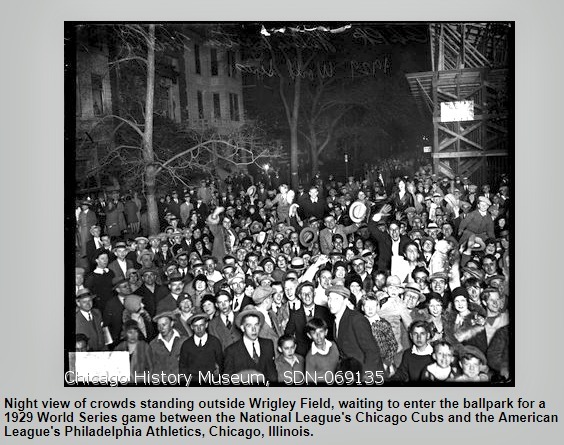 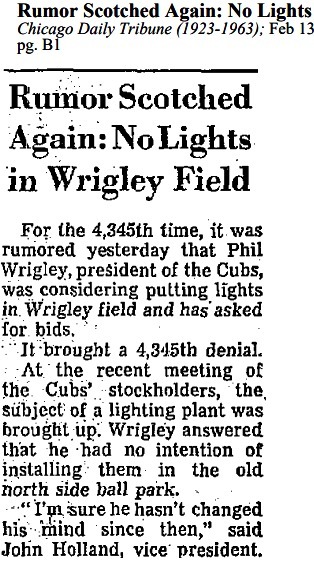 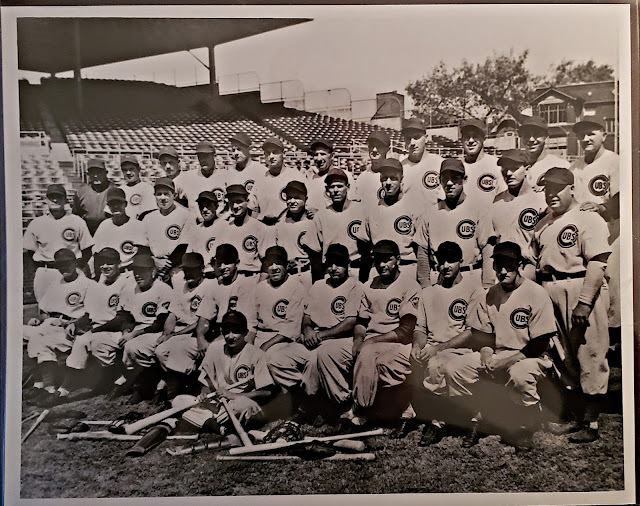 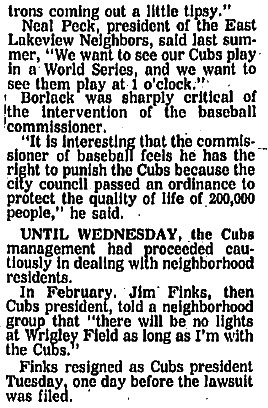 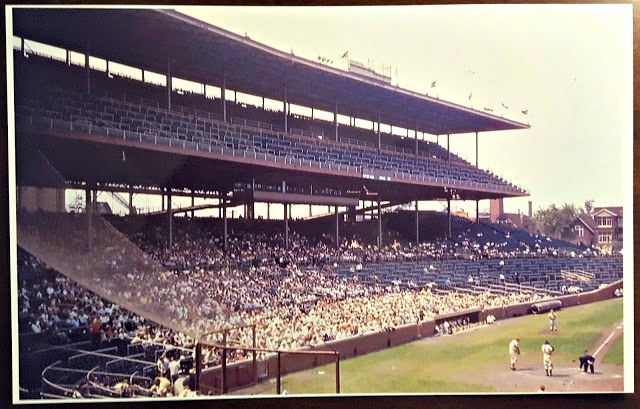 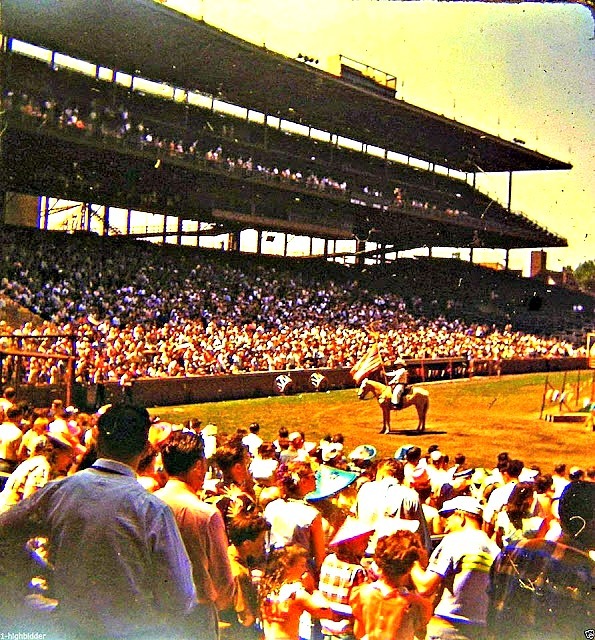 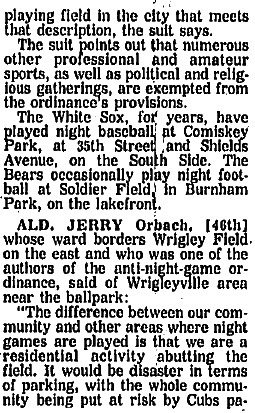 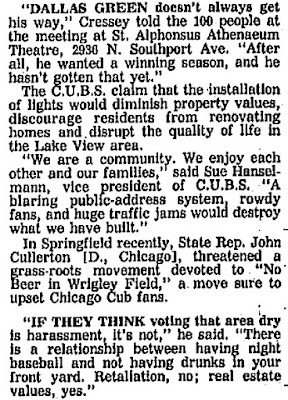 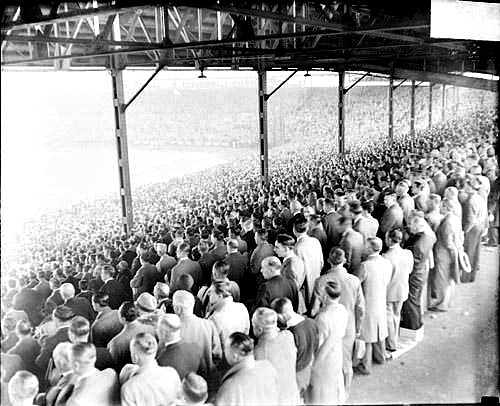 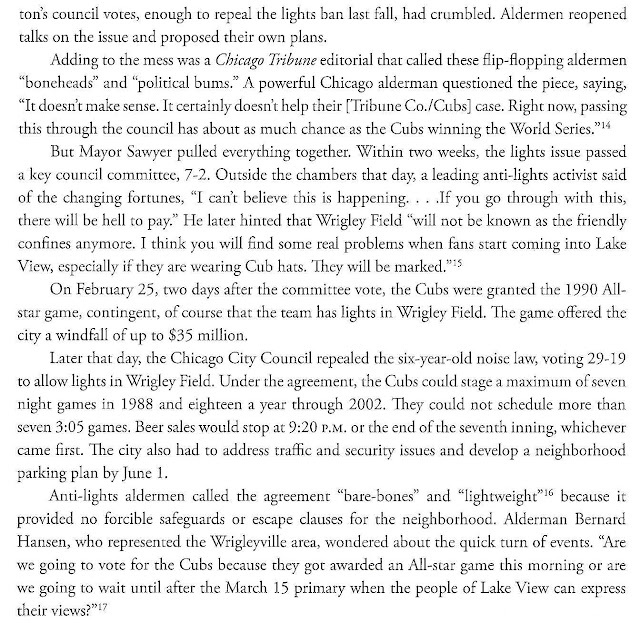 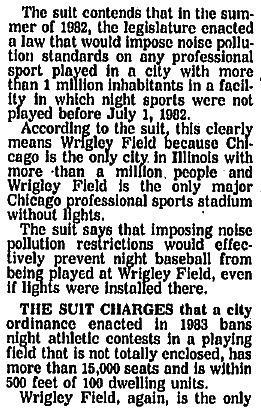 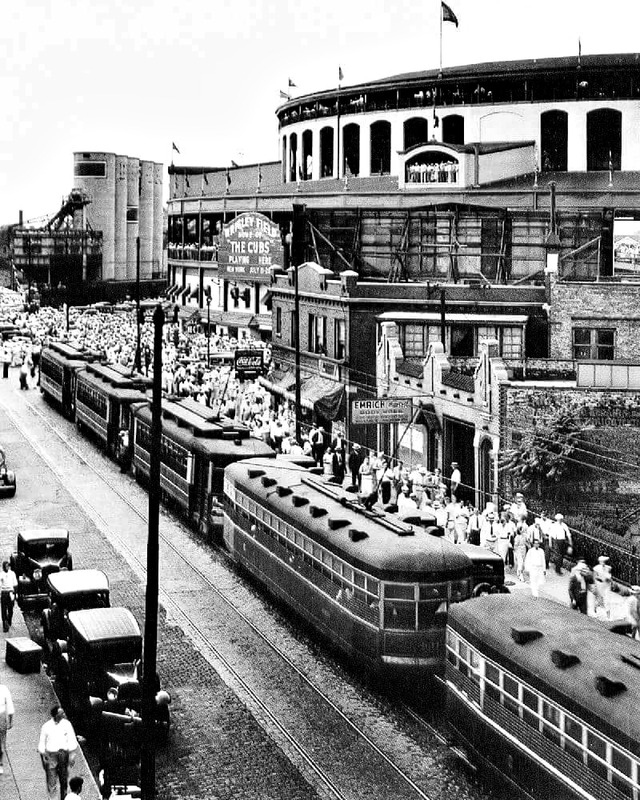 Residents of Wrigleyville, Alderman Hansen/Tunney along with the Cubs organization gather in a grand discussion to speak about the future of Wrigley Field and Chicago Cubs. 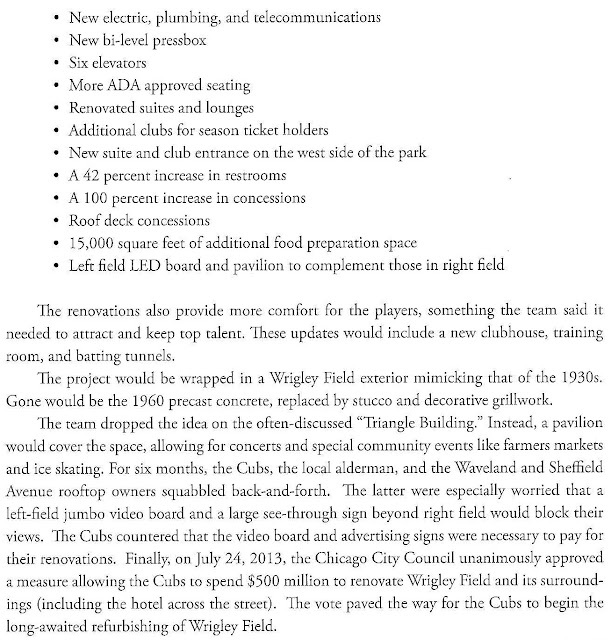 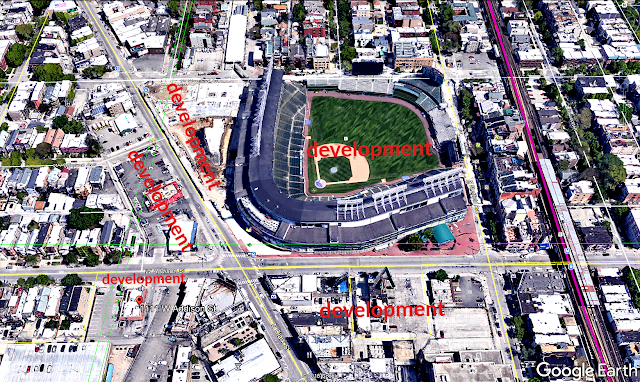 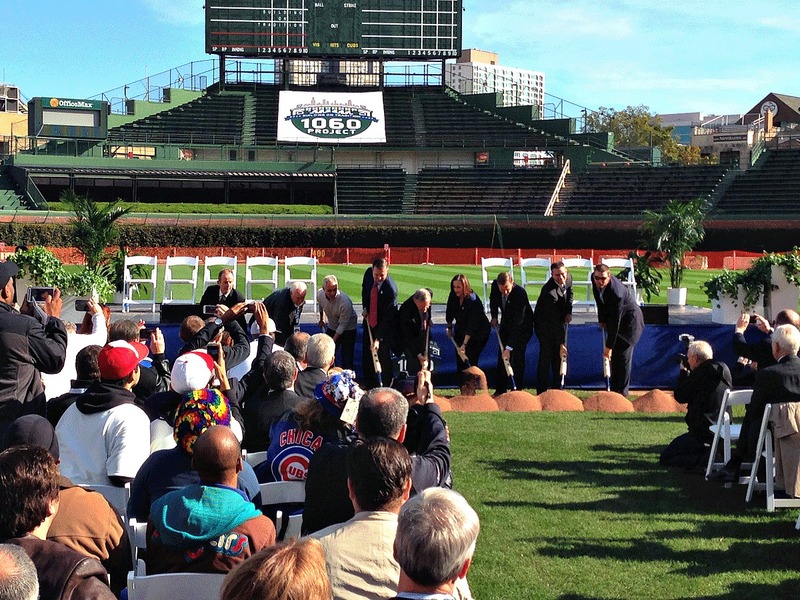 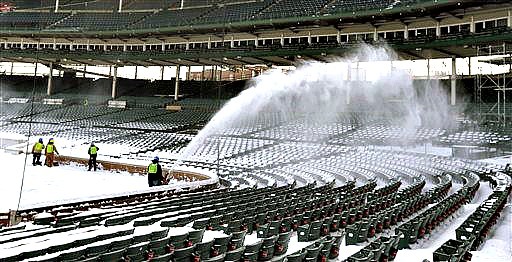 This annual gathering have been a lively one during the 2014-2019 Wrigley Field/Wrigleyville renovations. 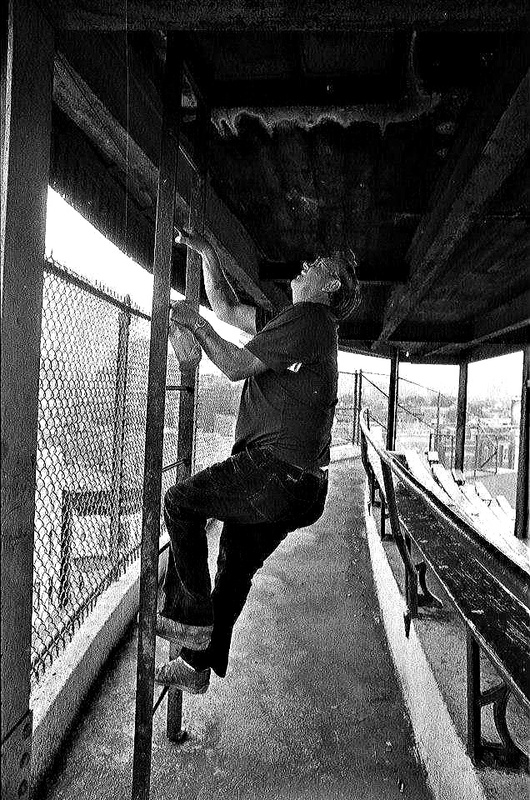 to be in the World Series"
It is so ready for renovations! 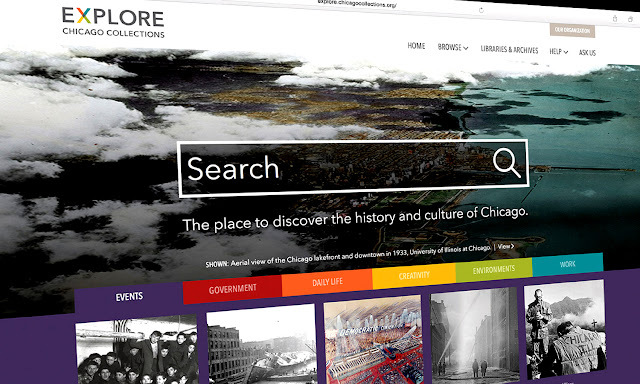 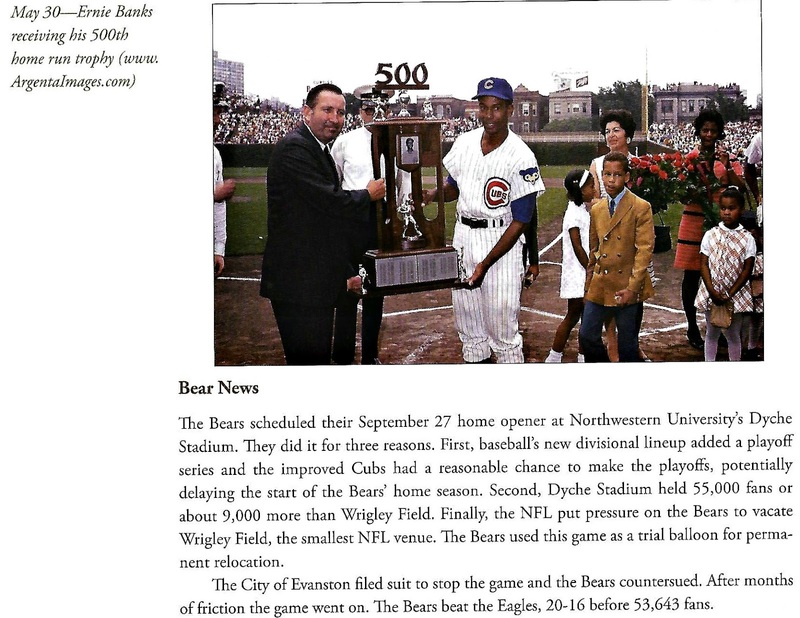 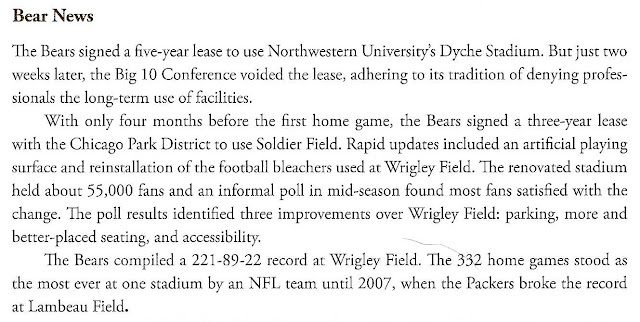 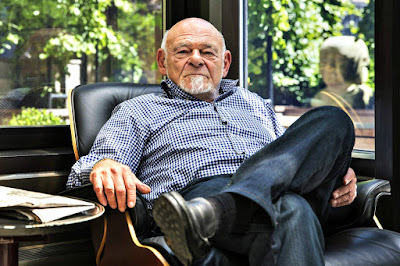 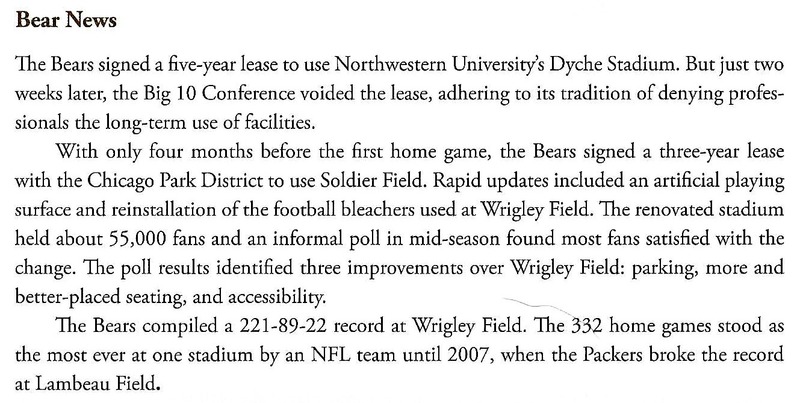 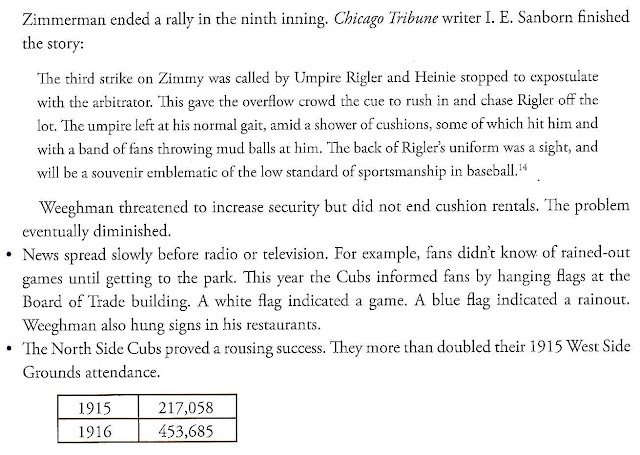 Sam Zell bought the Chicago Tribune hence the Chicago Cubs and Wrigley Field in 2007. 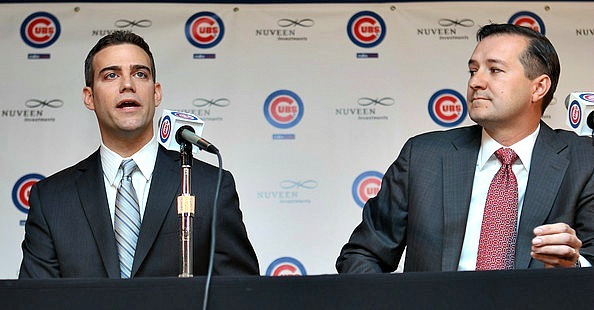 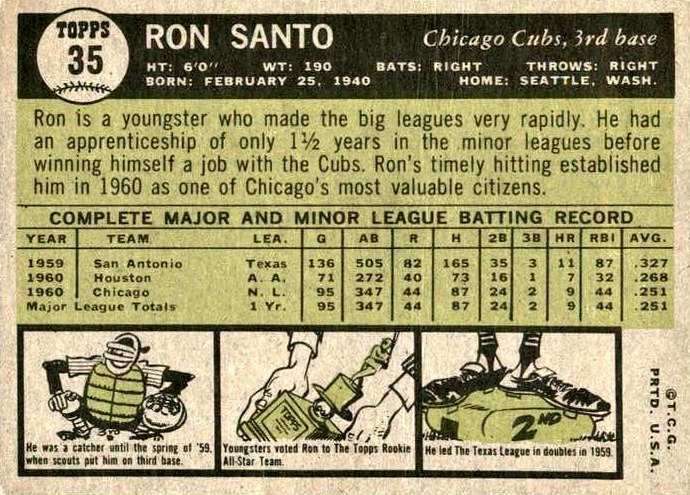 He tried to sell off the pieces to the highest bidder instead of selling both the Cubs and the baseball field as a package deal. 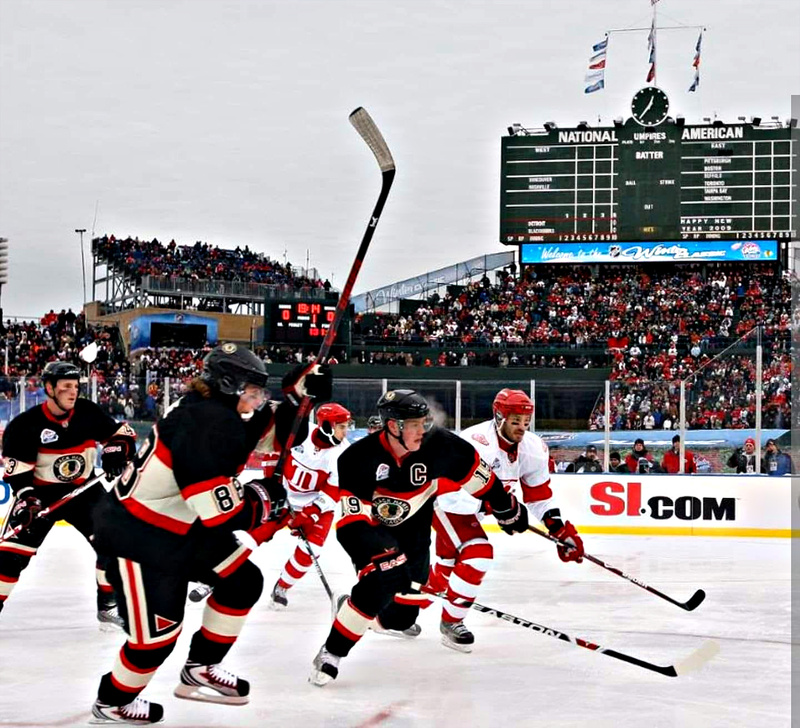 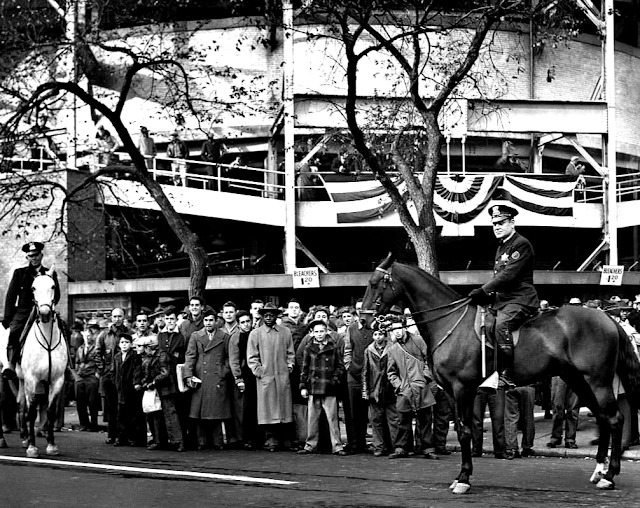 lead the charge for the Blackhawks"
The NEXT blog post will not only be about the five year long renovation of Wrigley Field but also the changes to Wrigleyville - for whatever happens to the baseball field happens to the neighborhood. 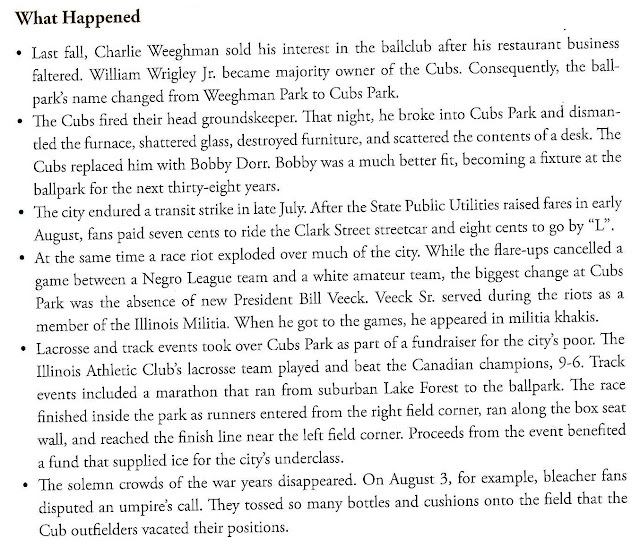 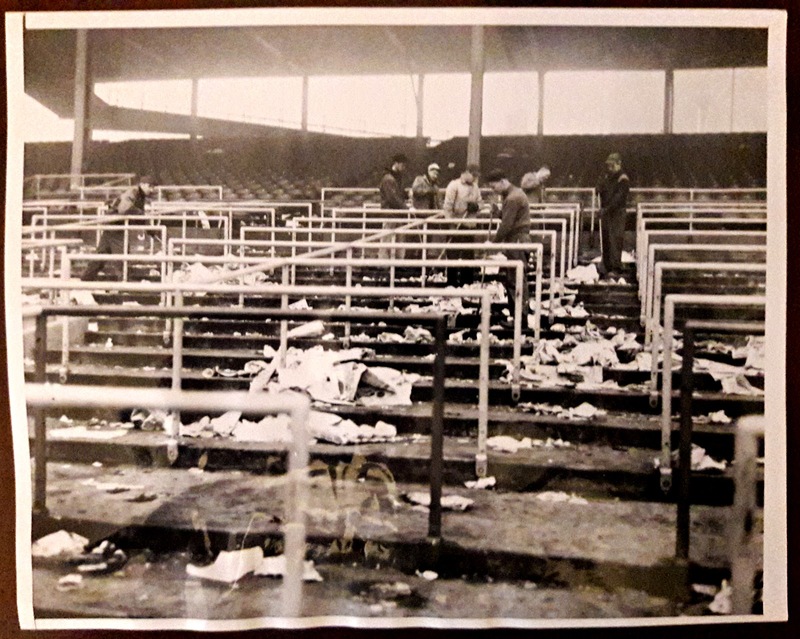 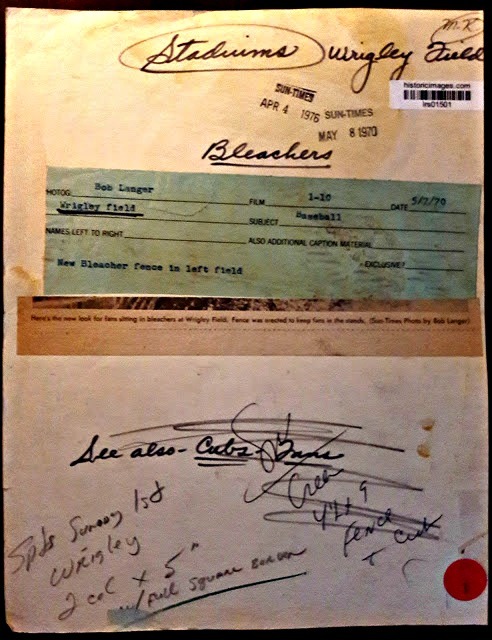 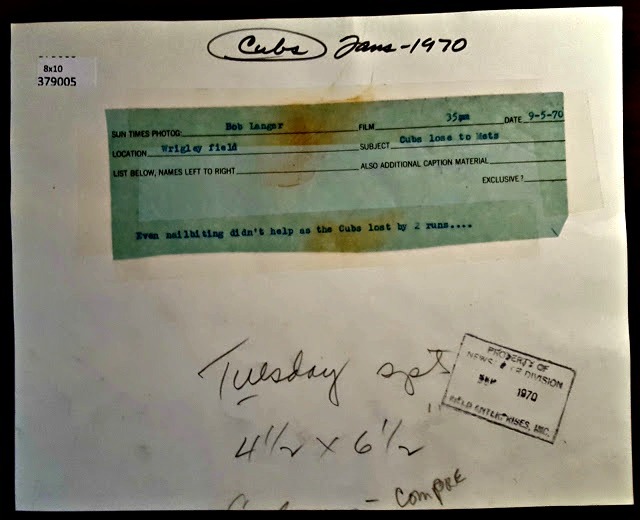 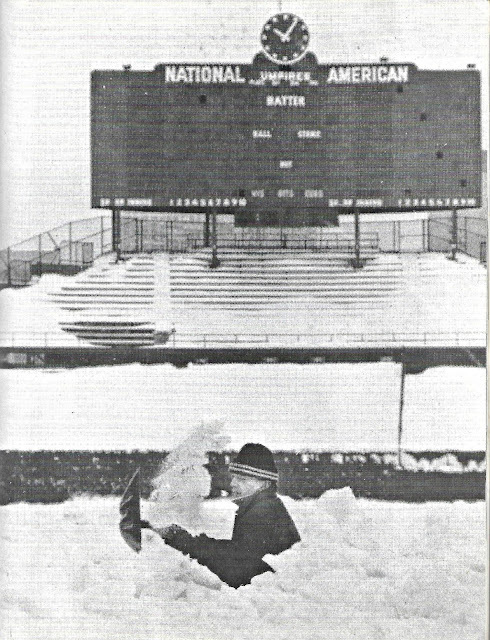 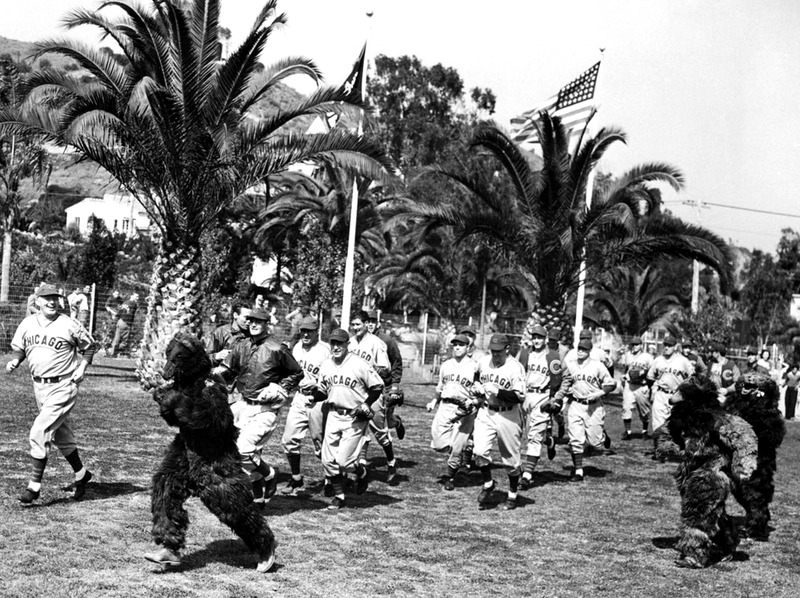 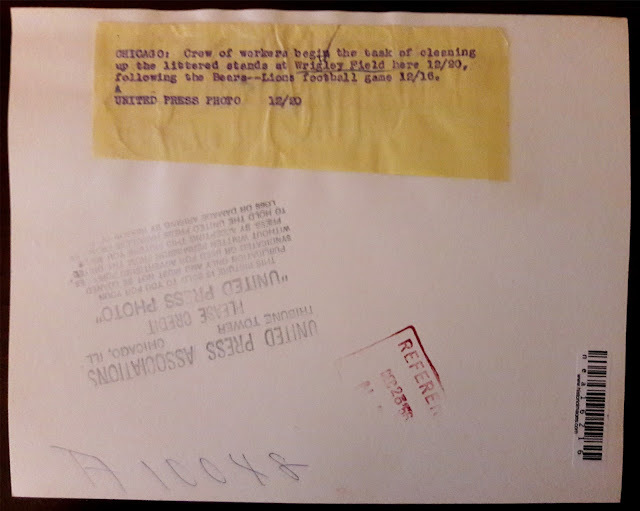 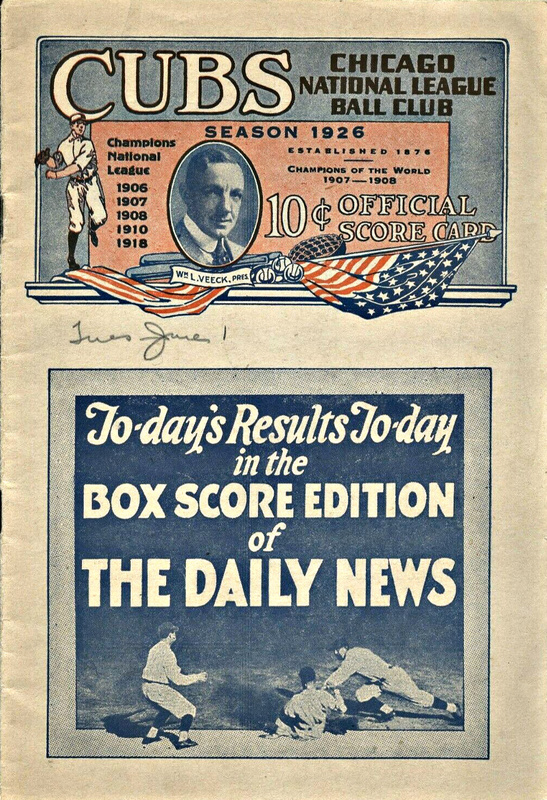 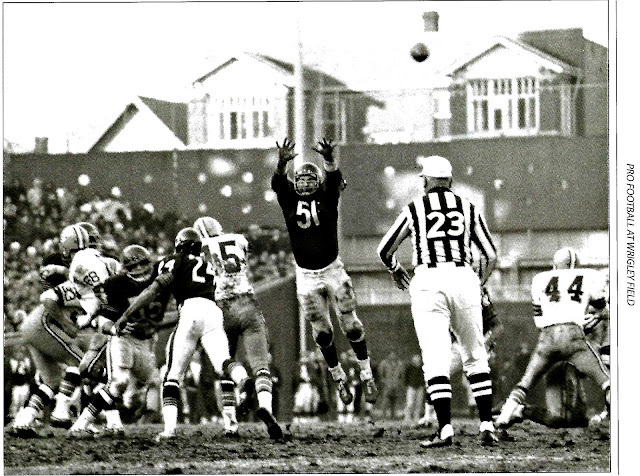 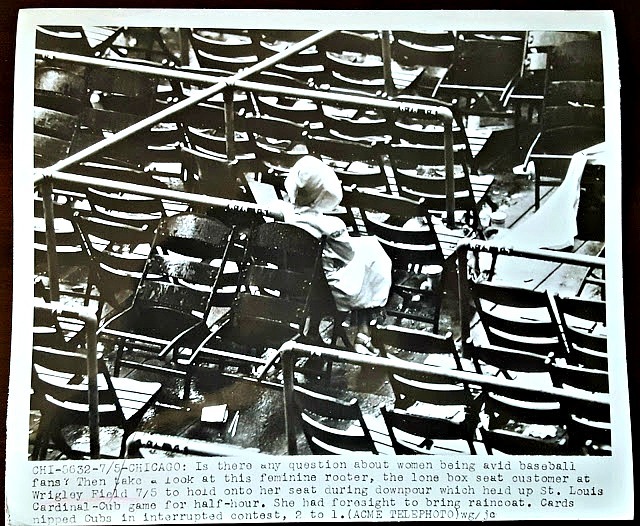 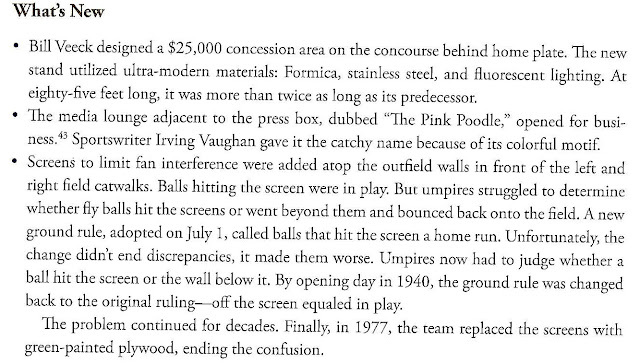 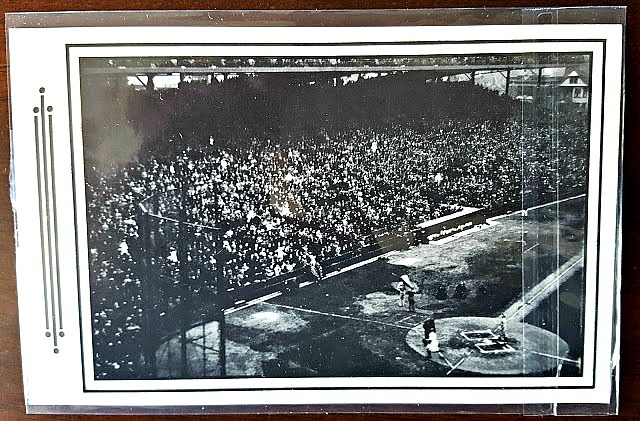 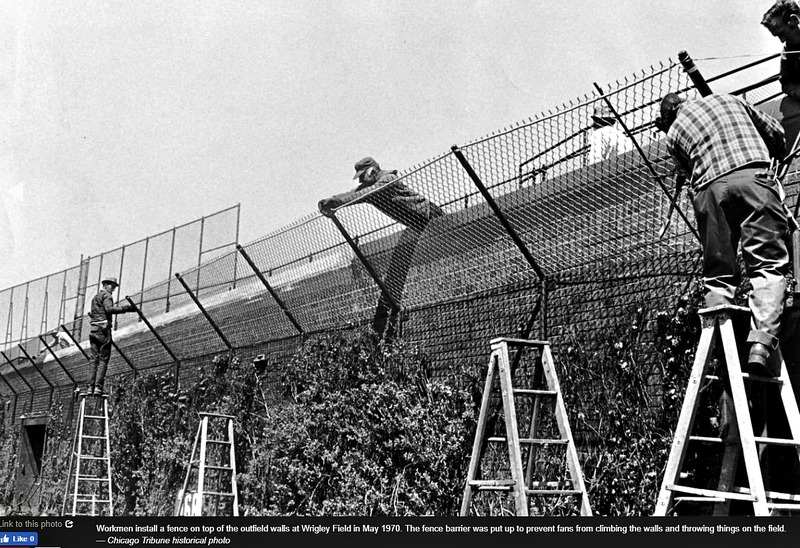 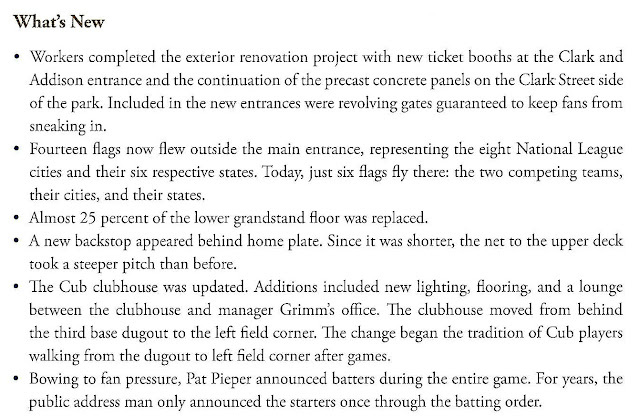 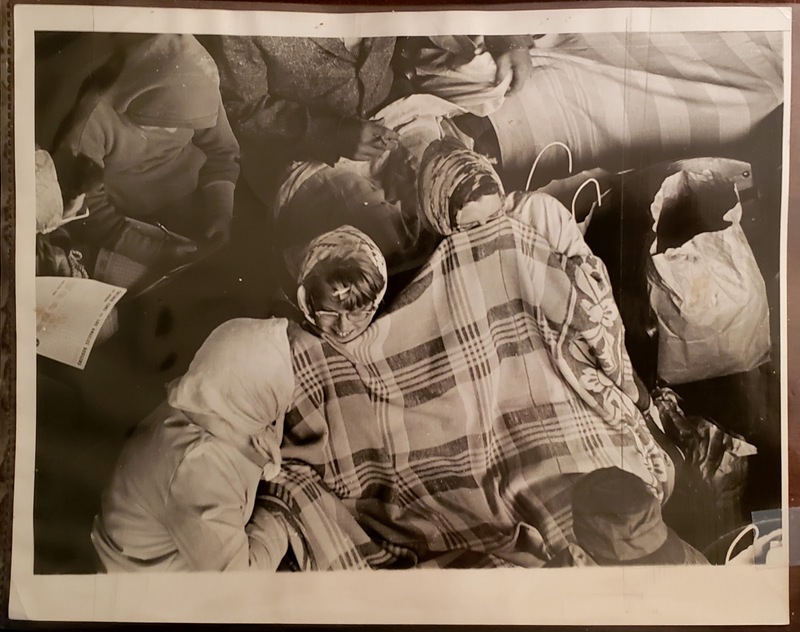 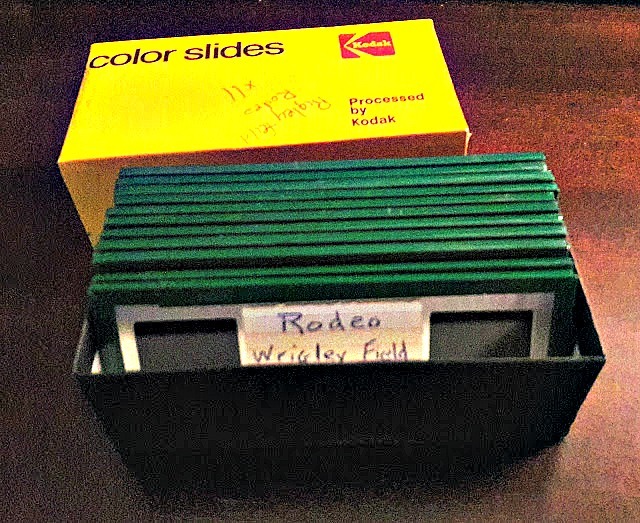 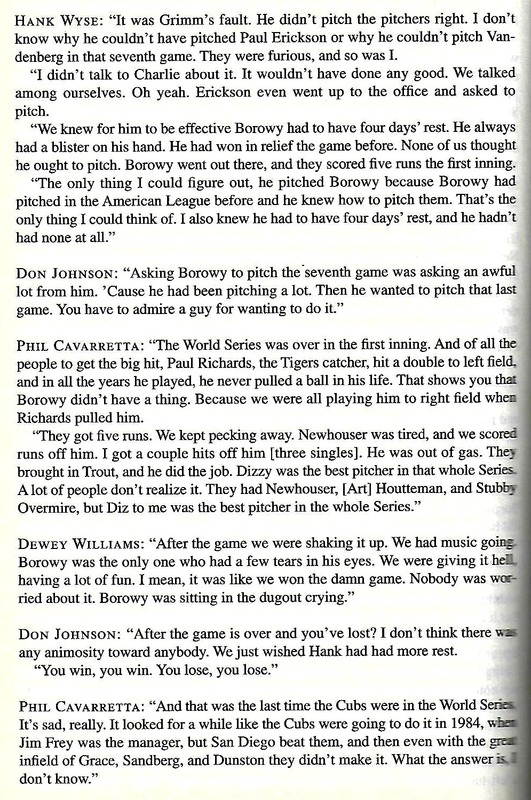 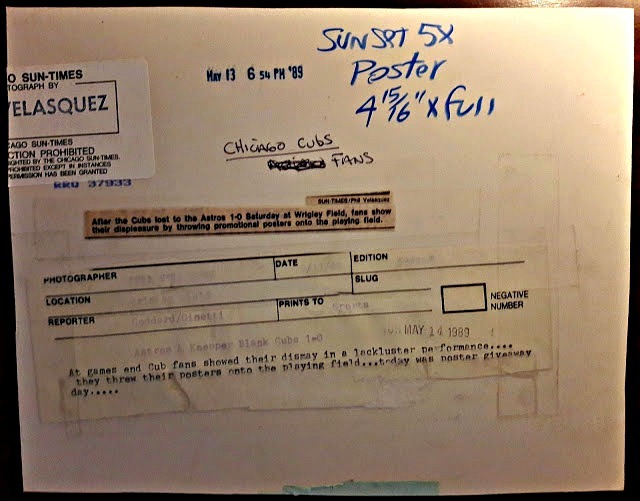 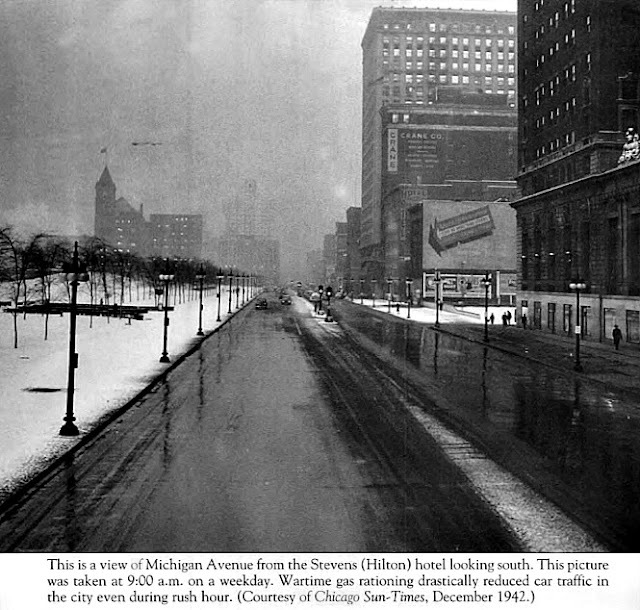 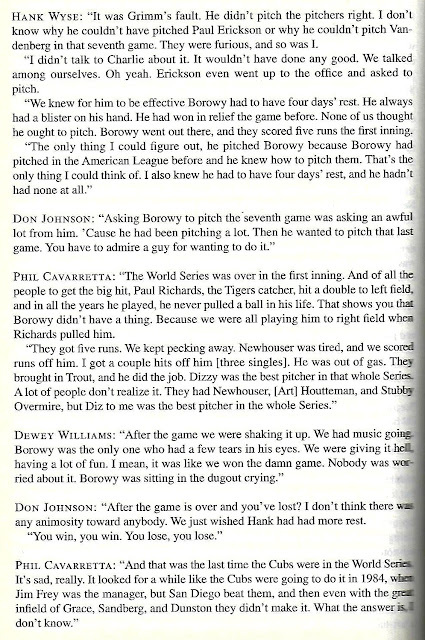 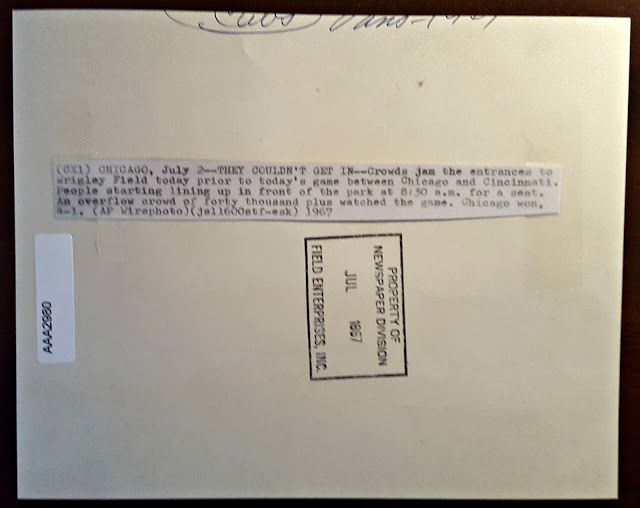 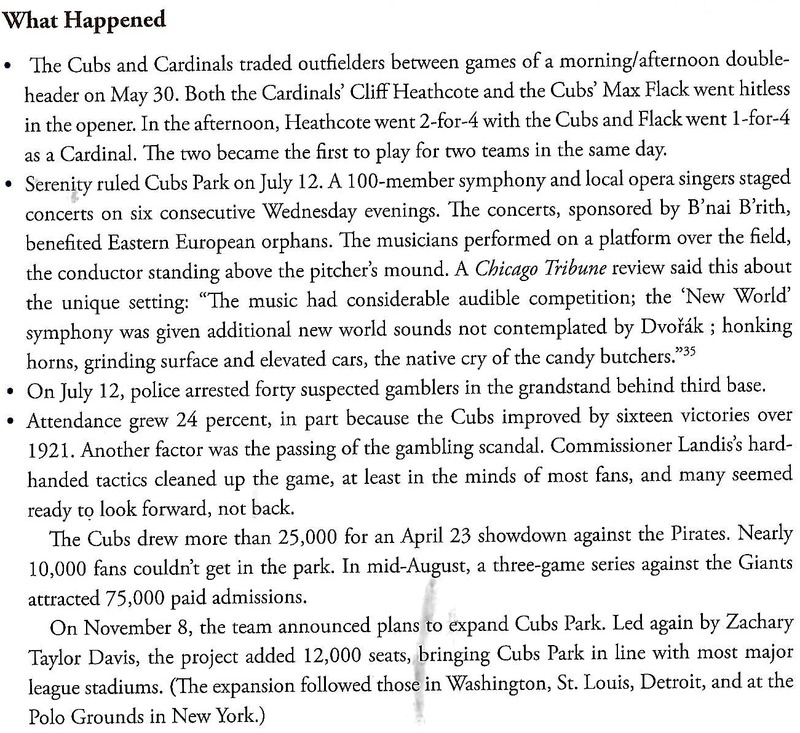 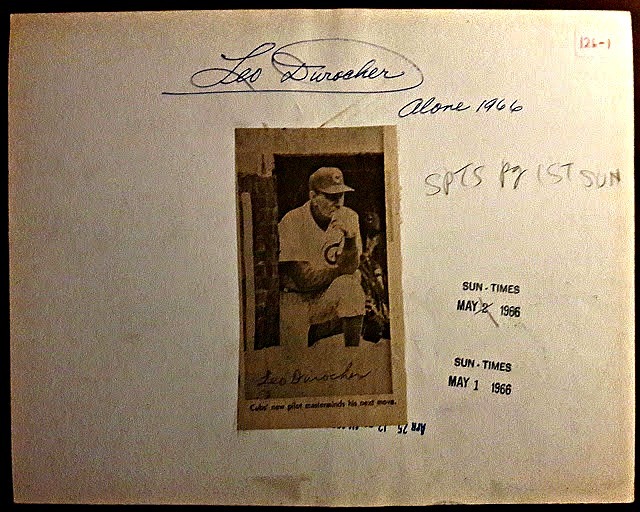 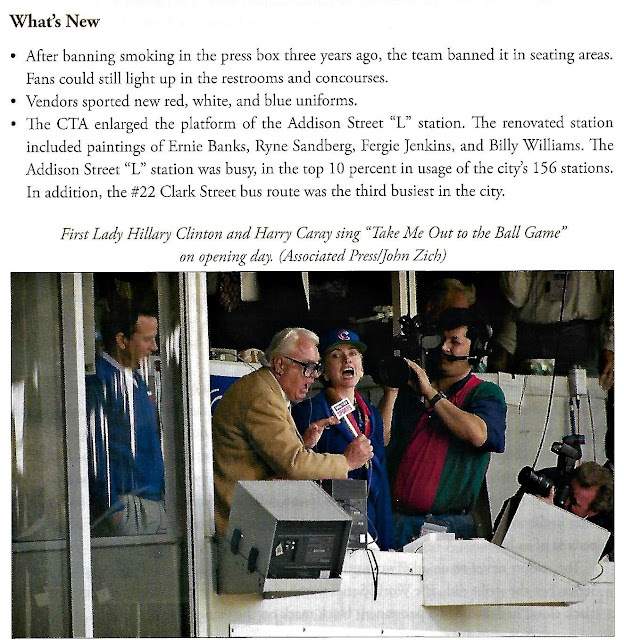 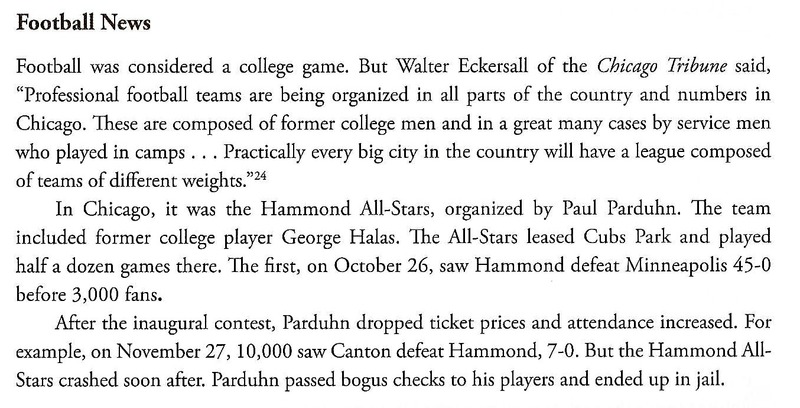 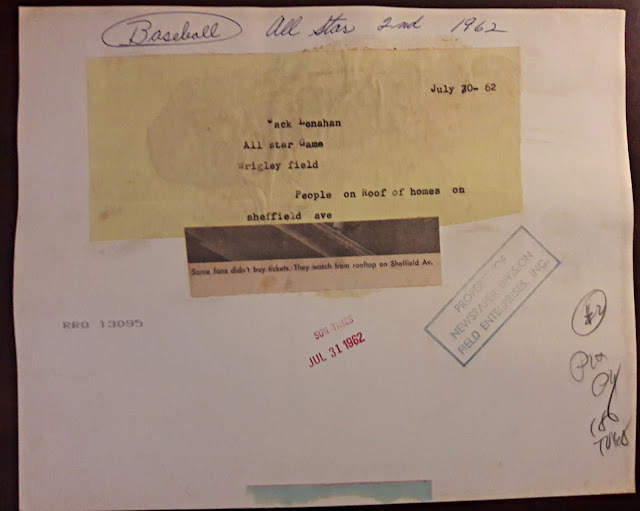 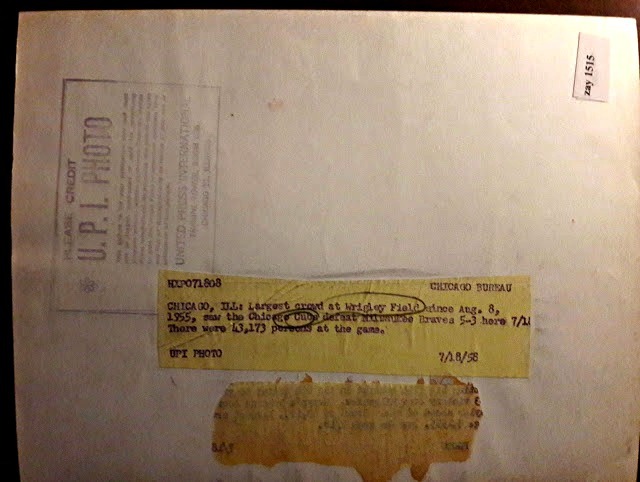 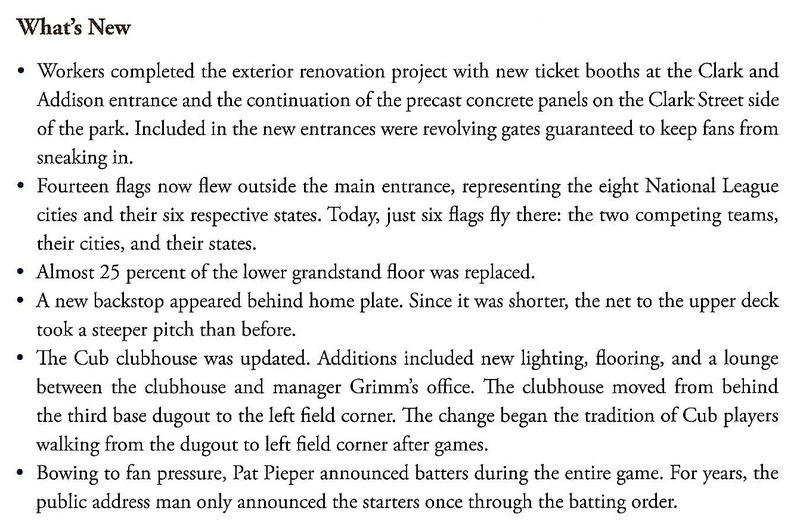 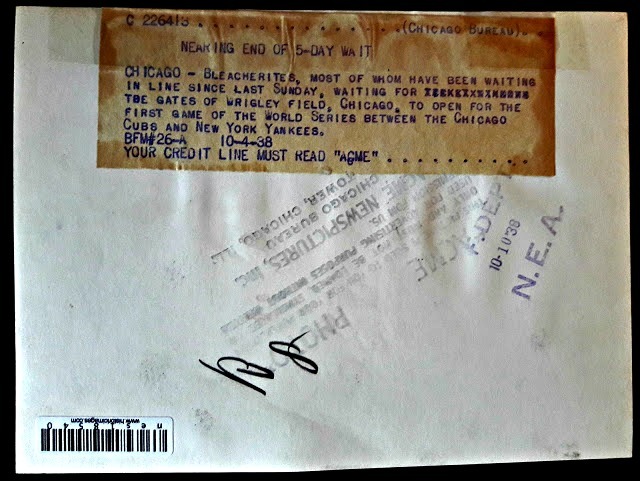 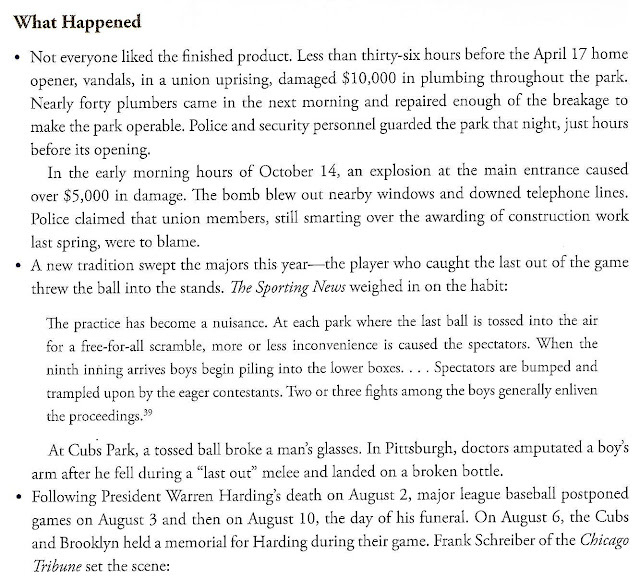 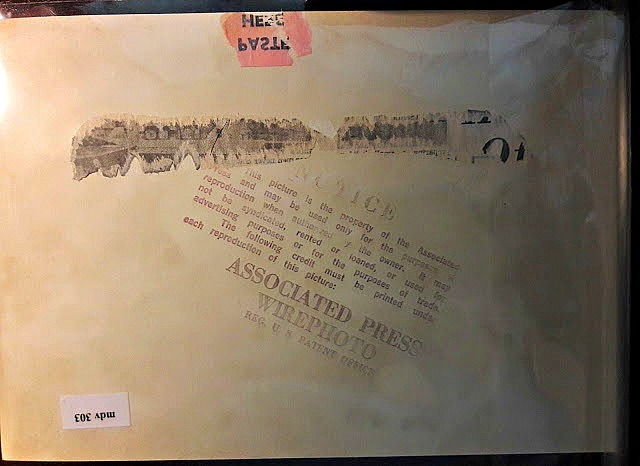 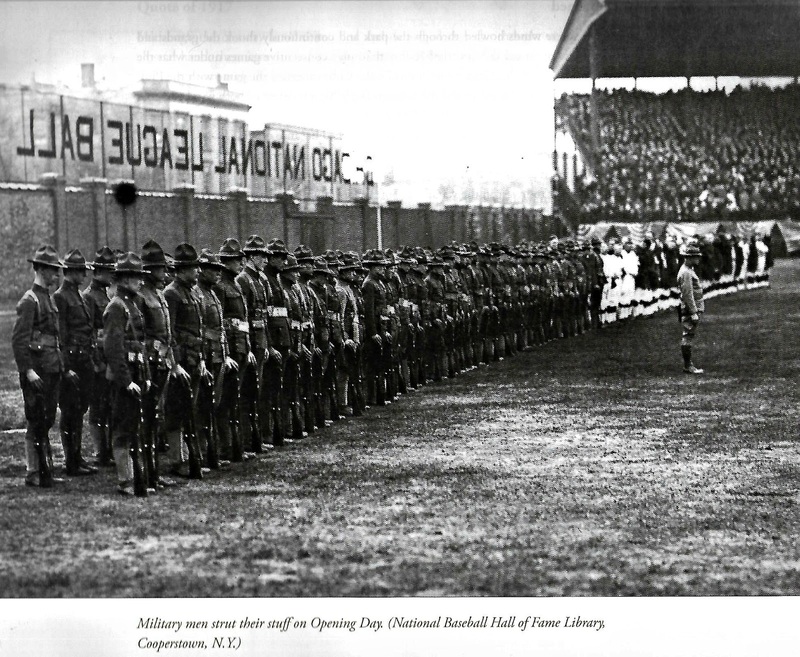 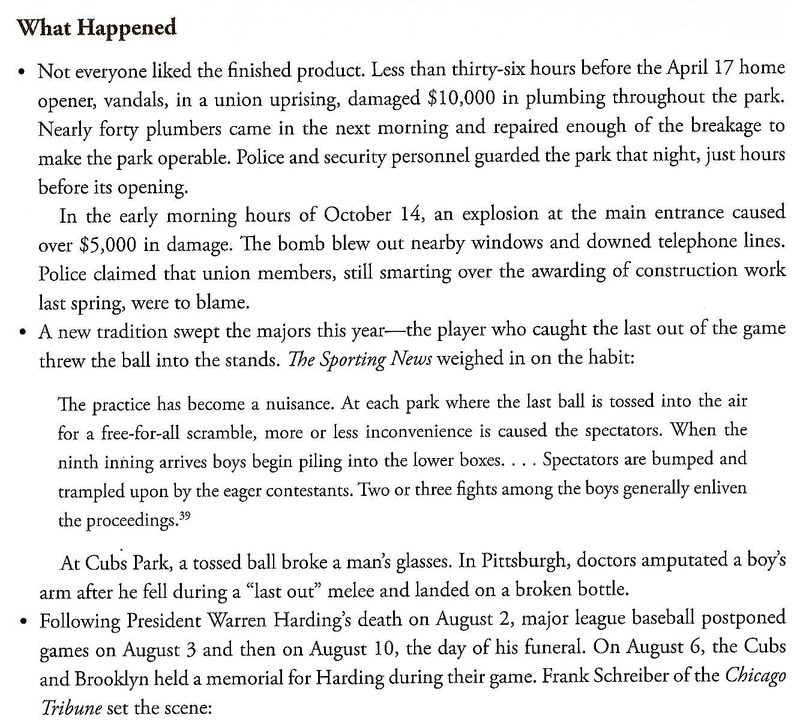 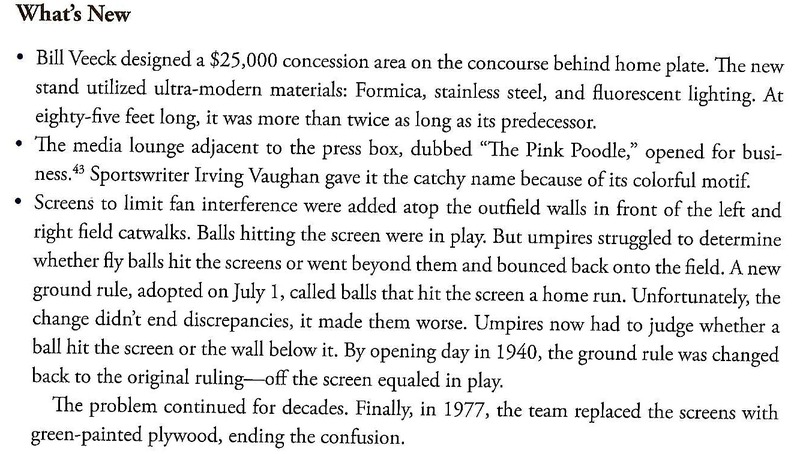 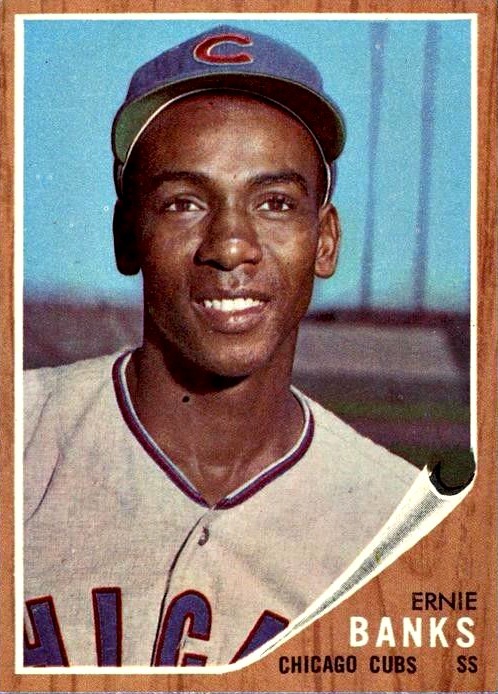 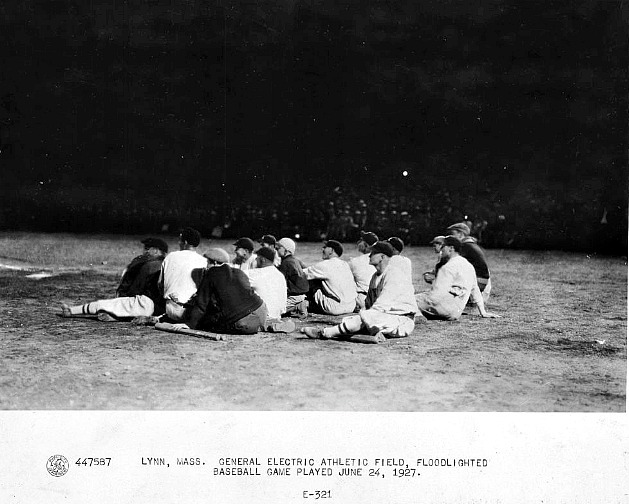 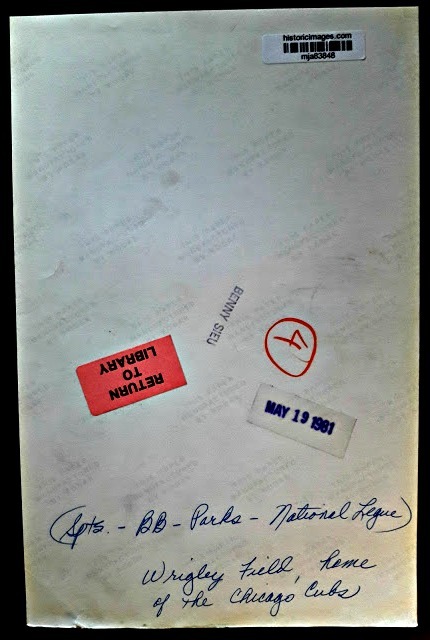 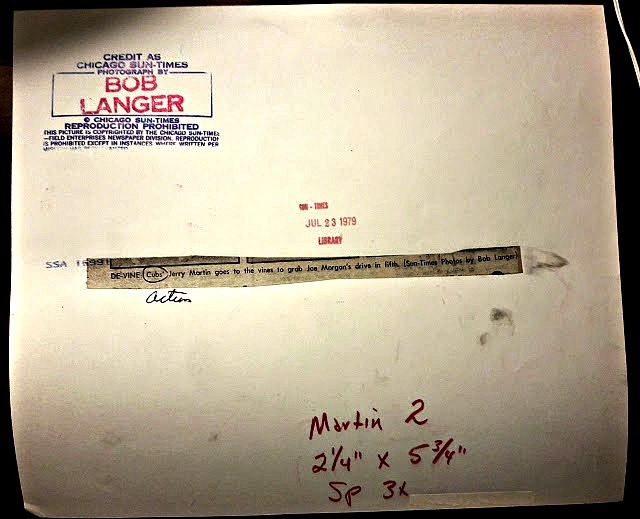 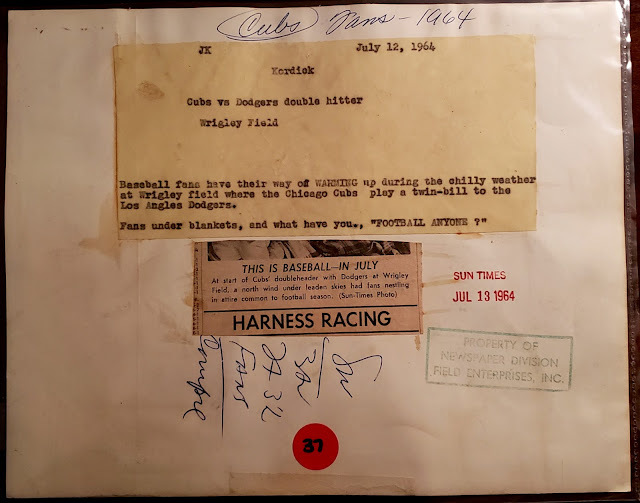 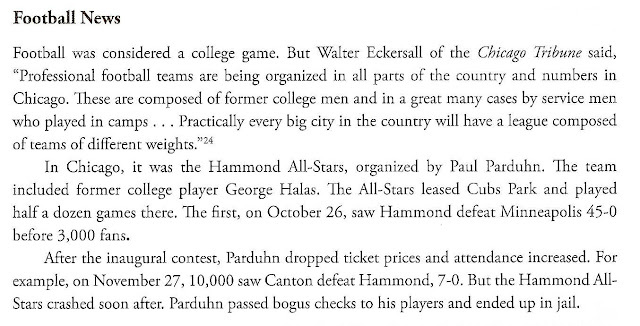 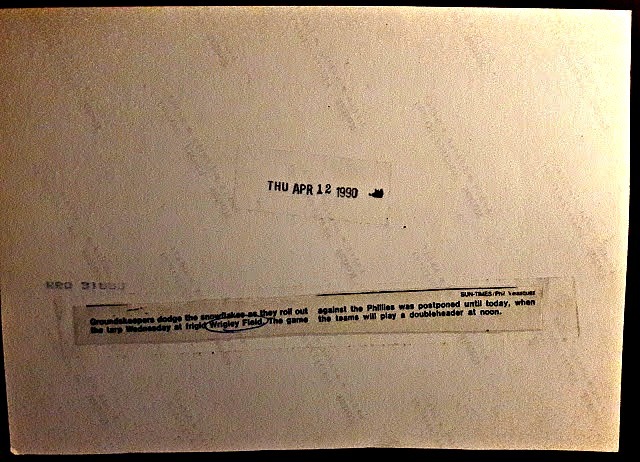 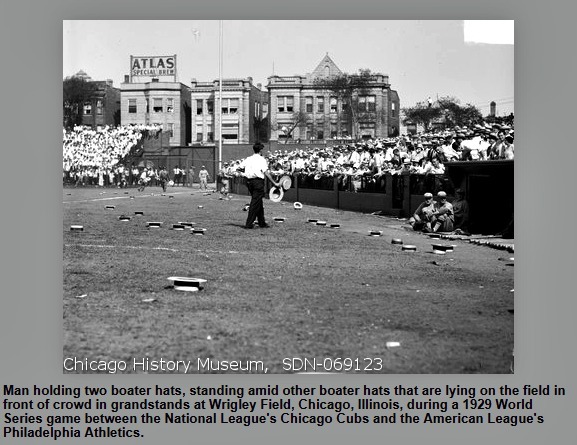 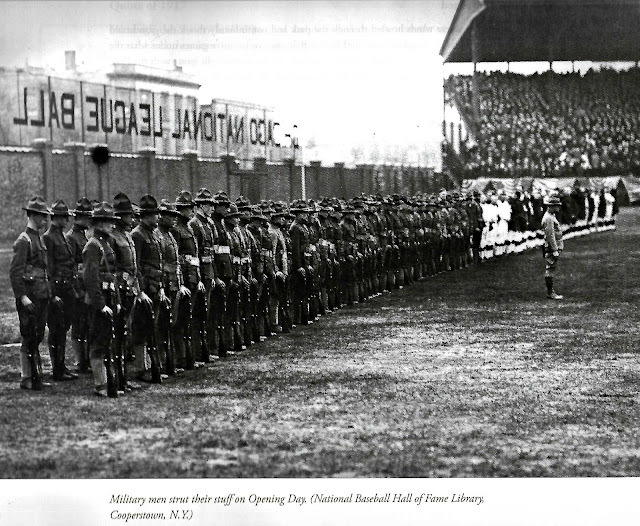 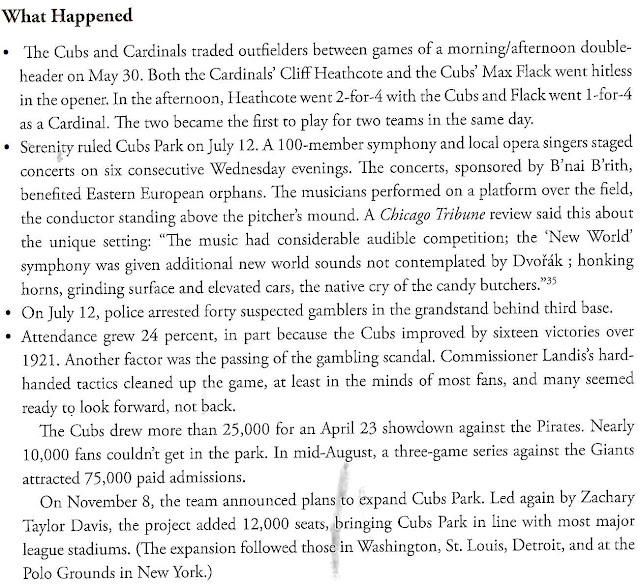 I have a third related blog post on the non-baseball events that occurred, as well.